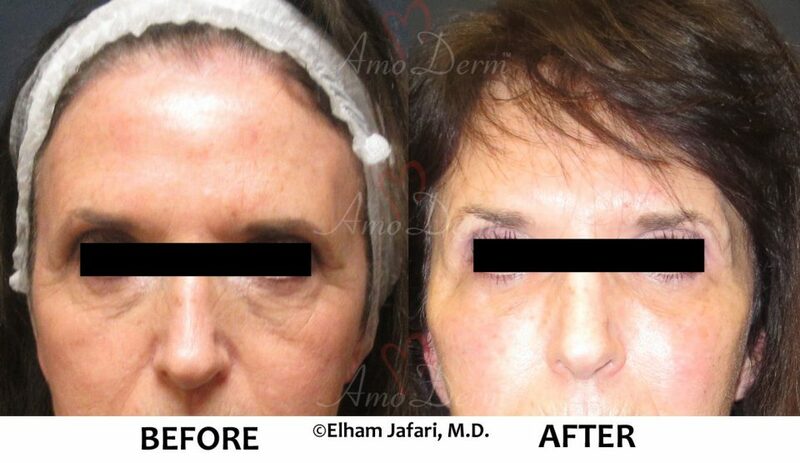 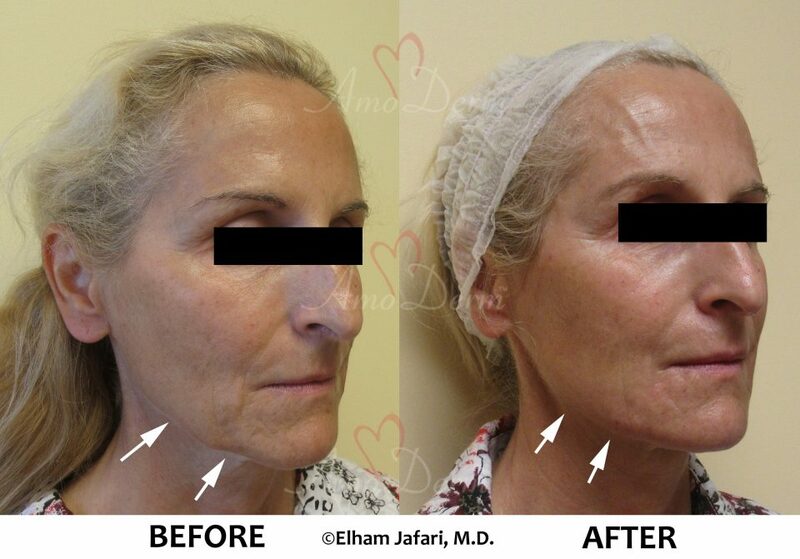 Facelift is a great rejuvenation and cosmetic surgery in the right hands and for the right patient. 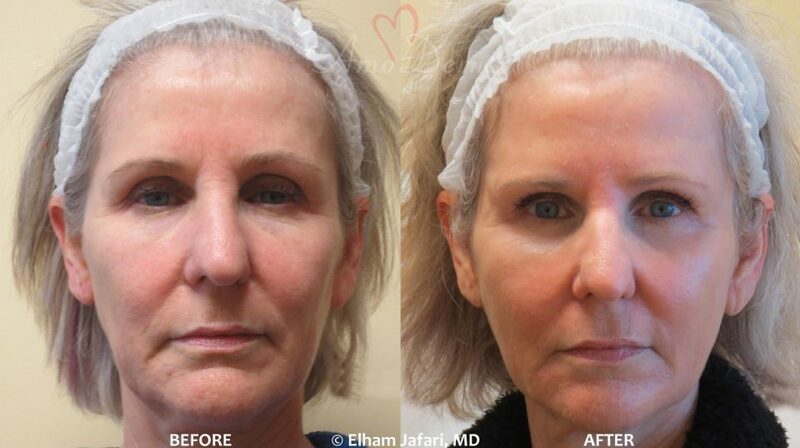 Surgical facelift (Rhytidectomy) has been performed for over a hundred years, with many refinements and advancements in techniques, but the key strategy has remained the same: To pull the skin (and sometimes the underlying tissues) in carefully-selected directions to smooth out the wrinkles and folds and eliminate saggy skin, followed by excising and removing the excessive skin tissue at sites that can be concealed for best cosmetic appearance. 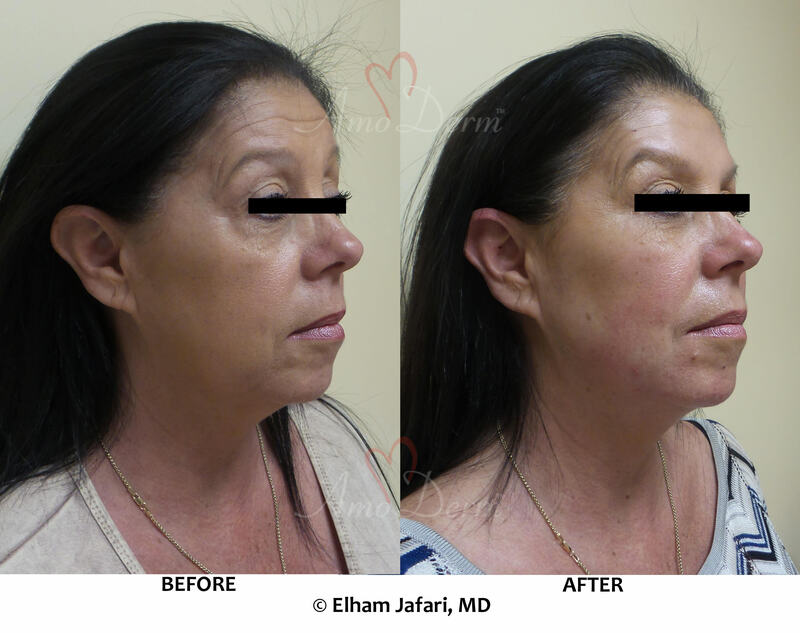 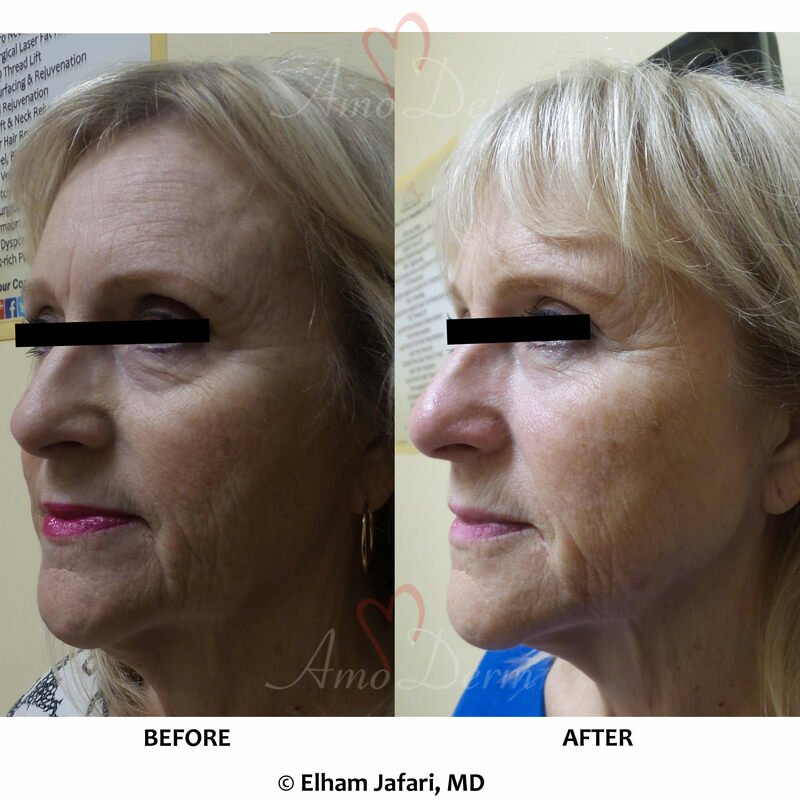 Recently, the important role of volume loss in aging process has been increasingly recognized, and cosmetic surgeons have been revising and refining facelift procedures to focus more on volume restoration. 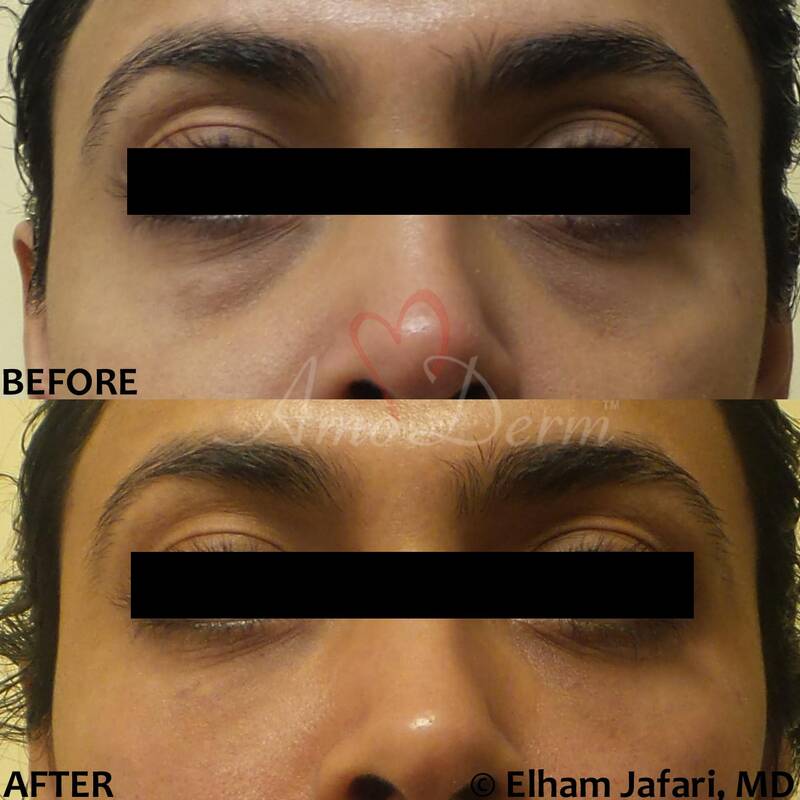 Nonetheless, we believe there are things that simply cannot be done by the surgical blade alone! These are the defining changes of aging and many of them are resulted from progressive volume lost. 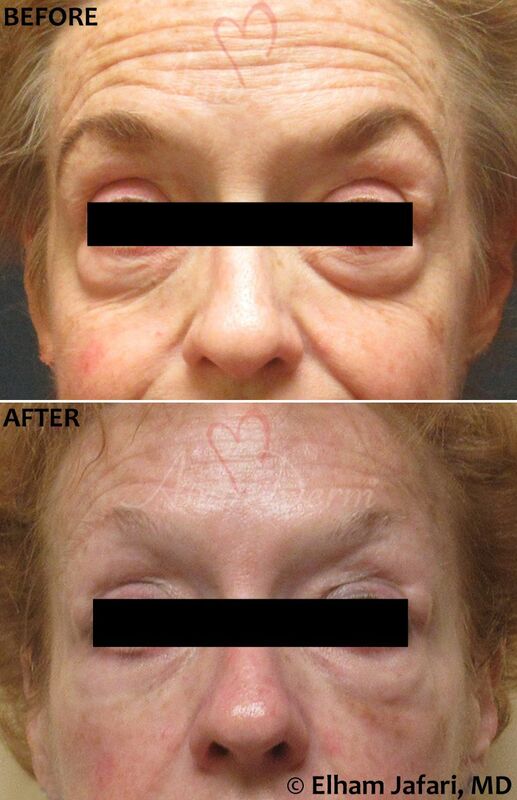 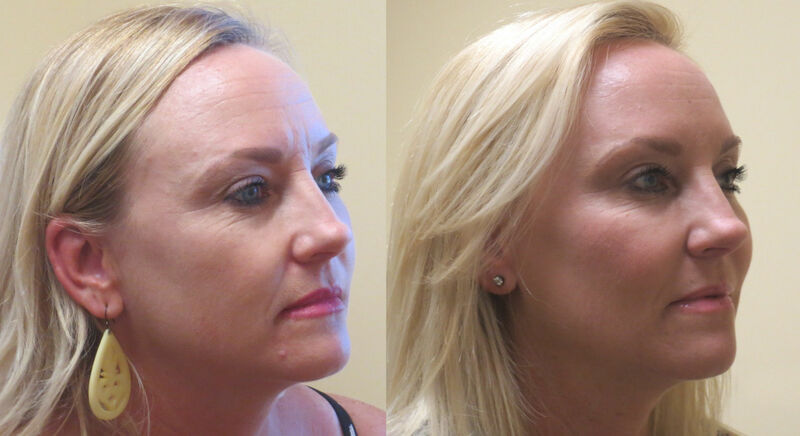 Simply put, even the most skillfully-done facelift surgery cannot address many of these issues. 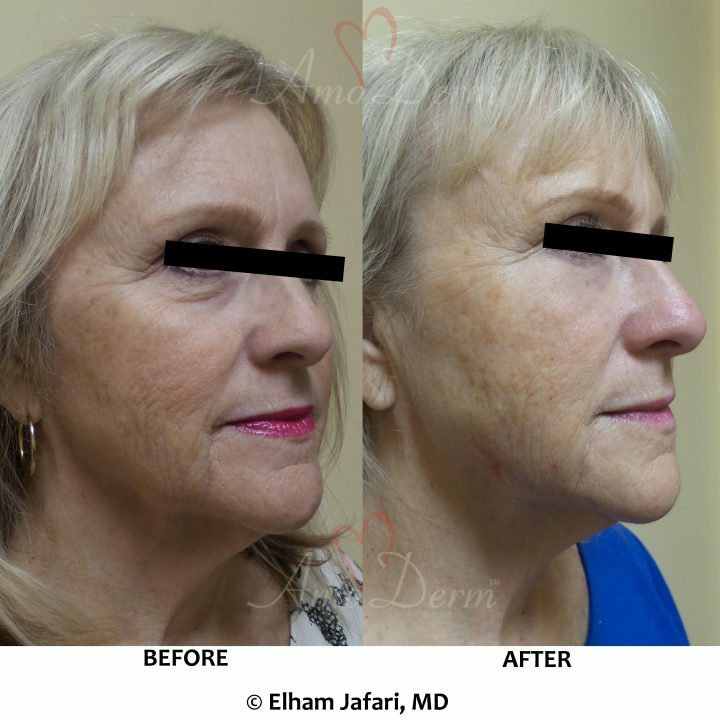 The effective treatment is volume restoration, which can be done best with dermal fillers, as part of a “liquid facelift” (also known as a non-surgical facelift, injection facelift, whole-face rejuvenation or “lunch-time facelift” as it can be done within an hour with no downtime). The key is to use a combination of these treatments as they each address one or some aspect of aging. 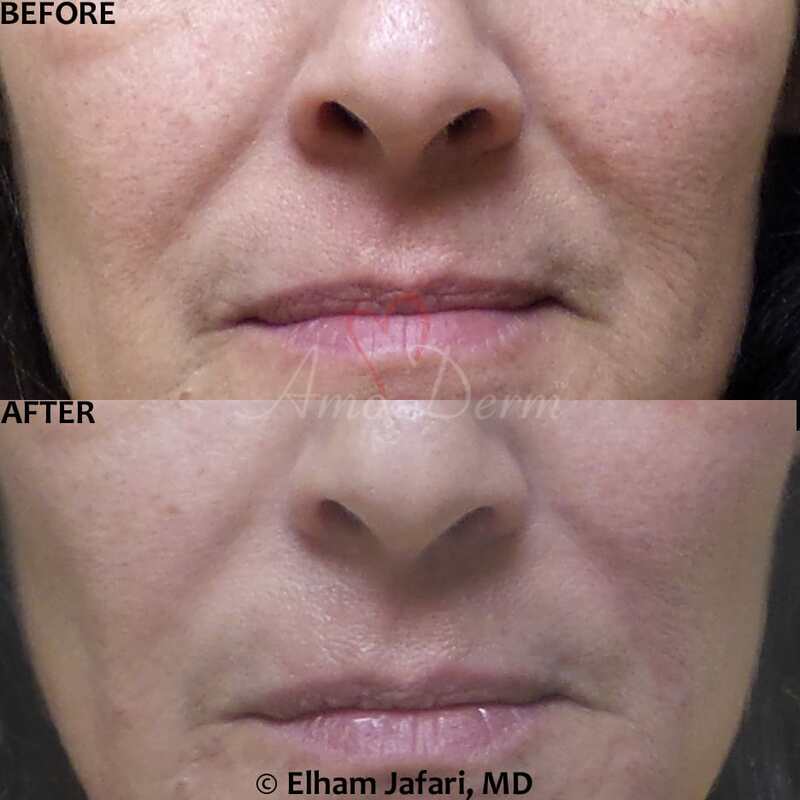 Dermal fillers are among the most effective treatments as they directly address the key underlying cause of aging and aged look – volume loss. 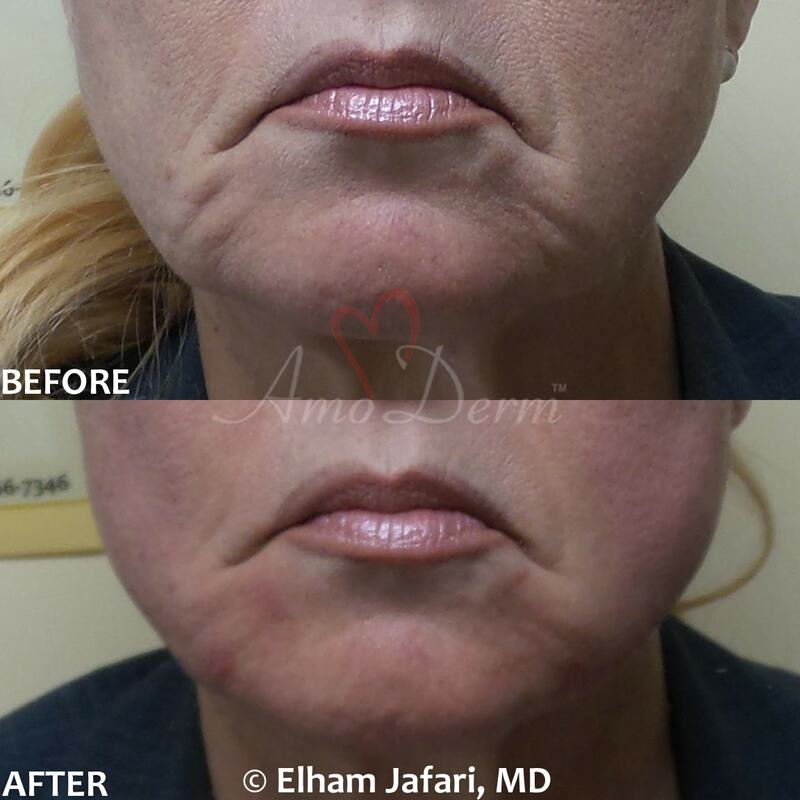 Your doctor can use dermal fillers to locally restore the lost volume and generate a pull on the skin on other areas (akin to a lift generated during a surgical facelift). 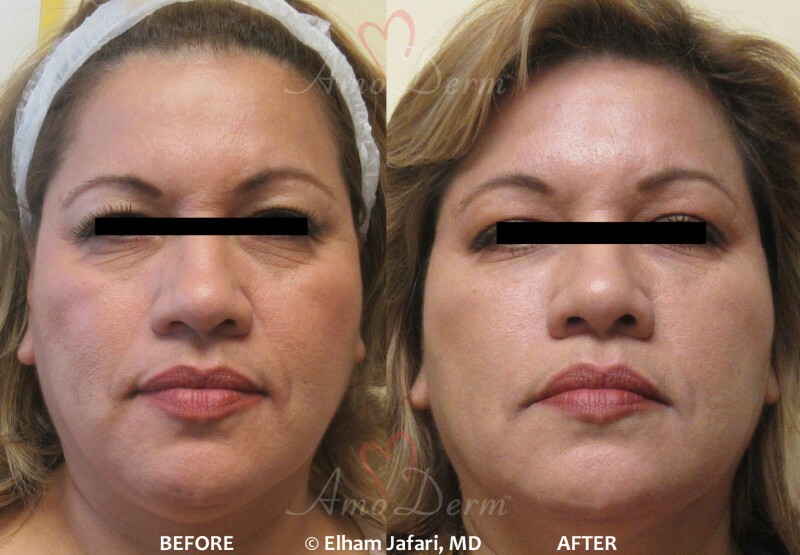 Areas most commonly treated include cheeks, jowls, temples, under the eyes and nasolabial folds. 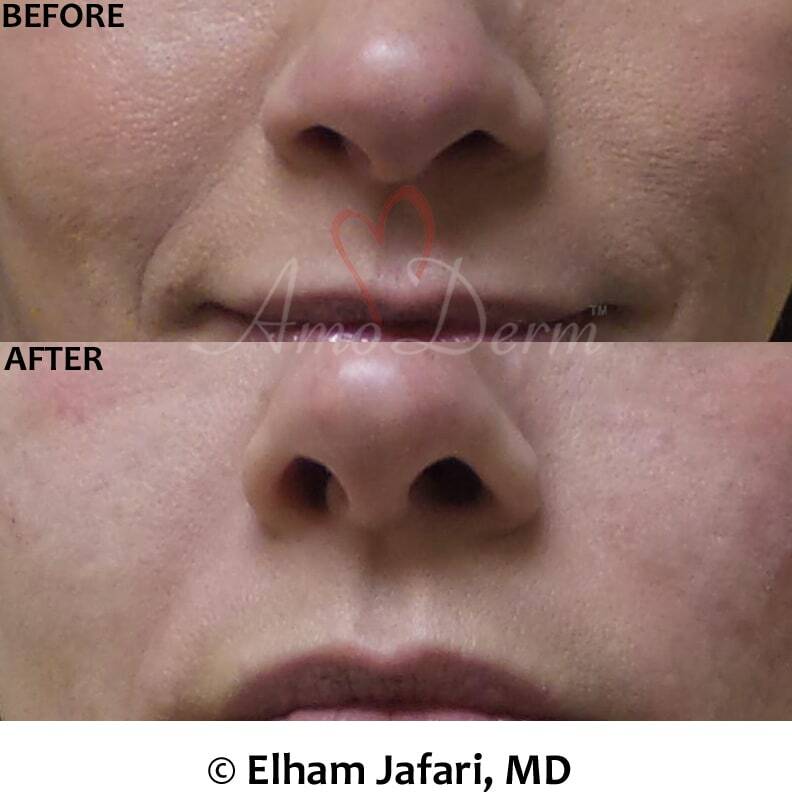 It is important to remember that many sensitive and critical structures such as nerves and blood vessels pass through many of these areas and these injections should be done by the most-experienced physicians with great skills and deep understanding of the anatomical features of the face. Your doctor can choose the right type of filler for the area being treated and the results that are expected. Many of the fillers are based on hyaluronic acid – a naturally-occurring gel in the skin that is responsible for keeping water in the skin, thereby keeping is hydrated, plump, fresh and rejuvenated. 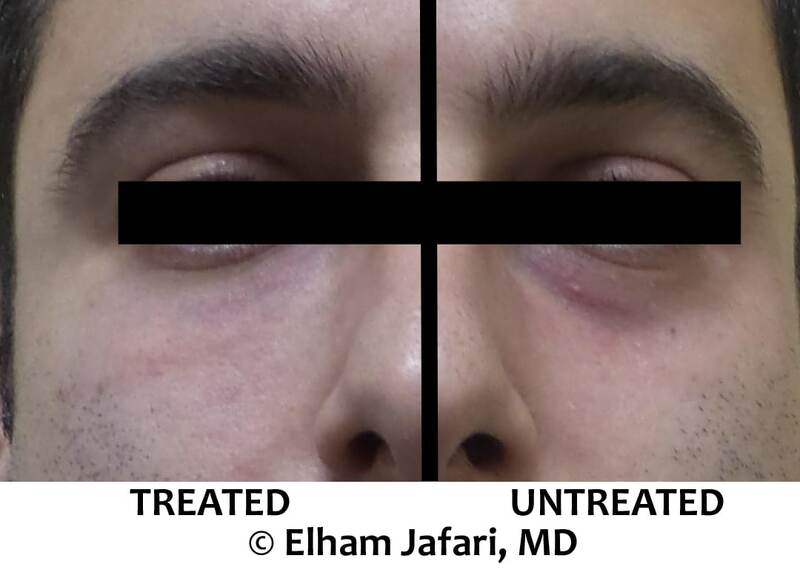 You might have noticed the sunken eyes of severely dehydrated people. 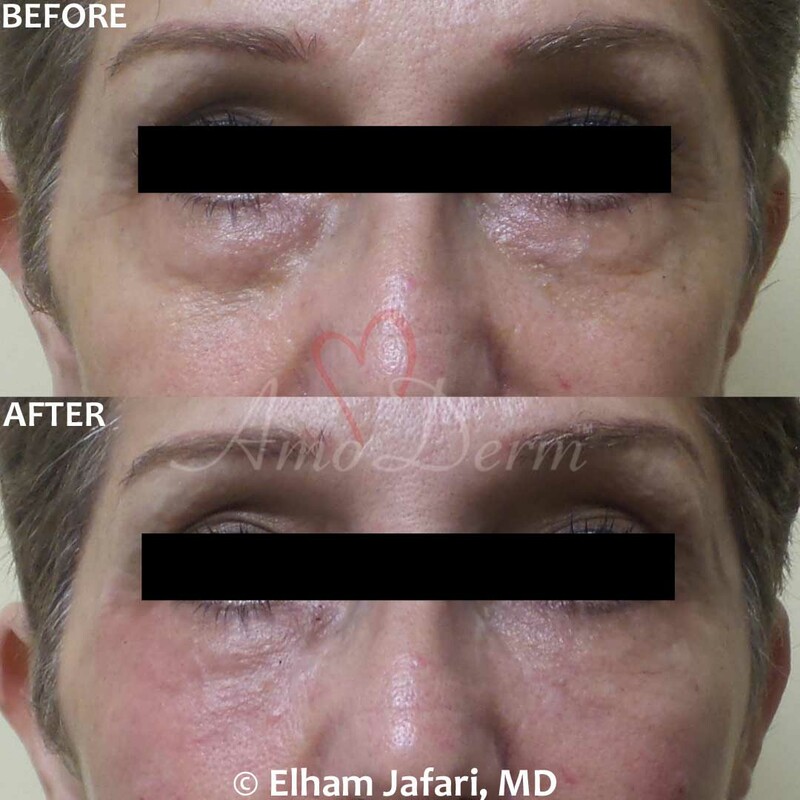 As we age, we lose hyaluronic acid in our skin – including the skin around the eyes – and a similar appearance of sunken eye (dark circles around the eyes) emerges. 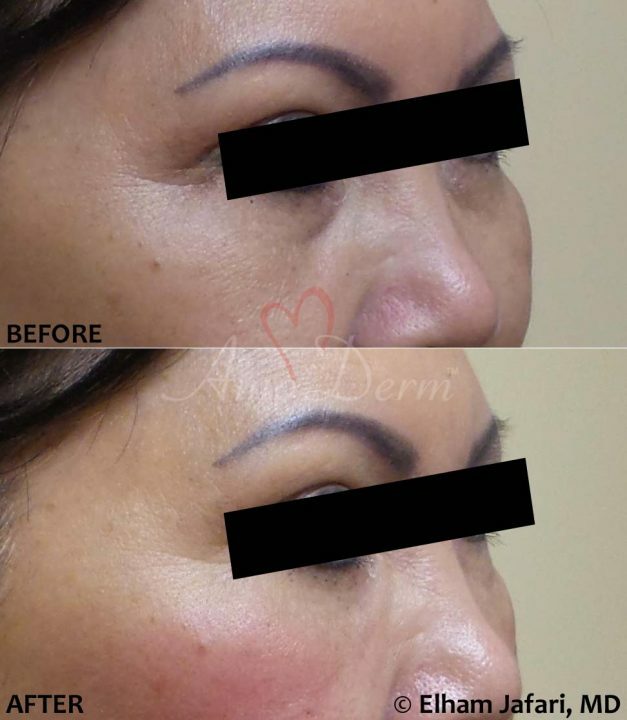 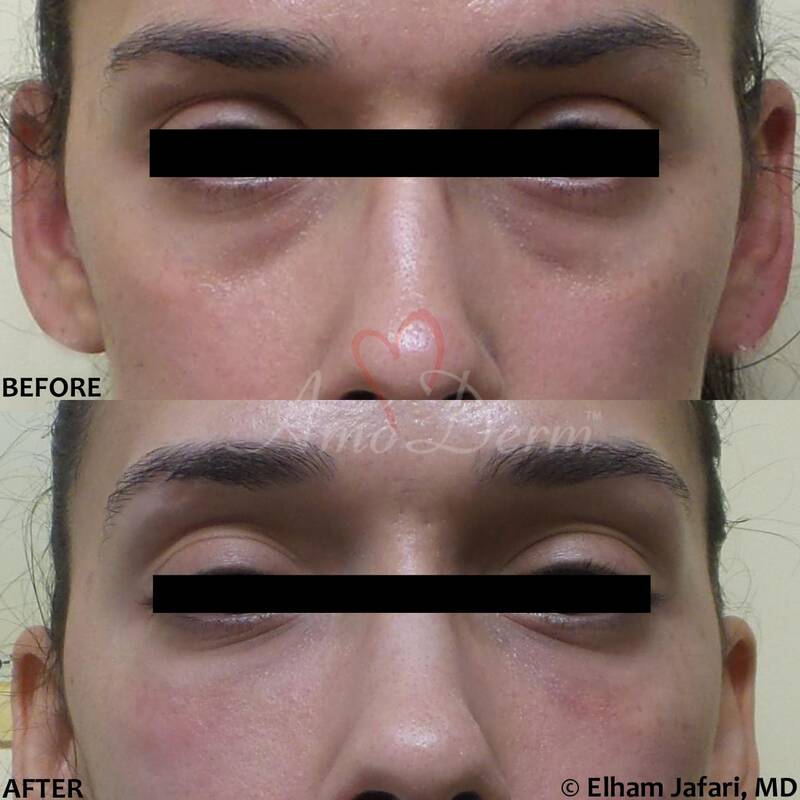 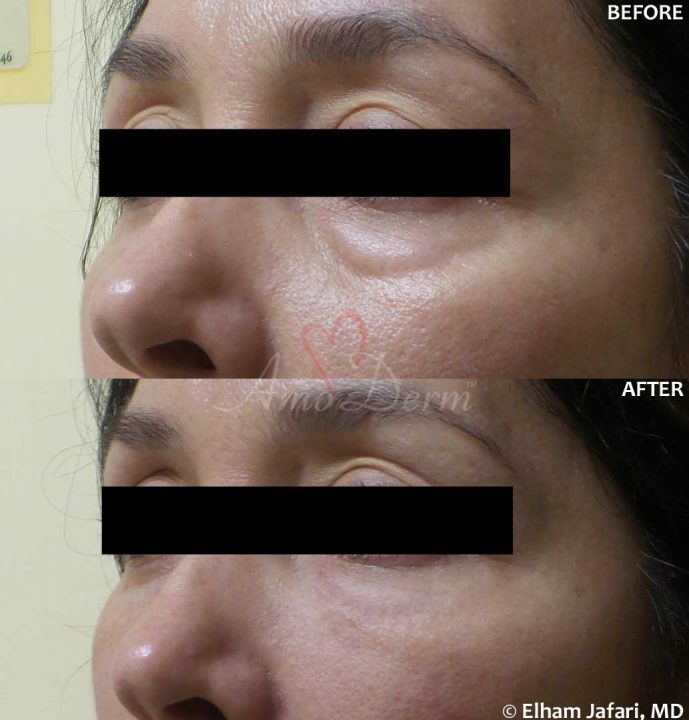 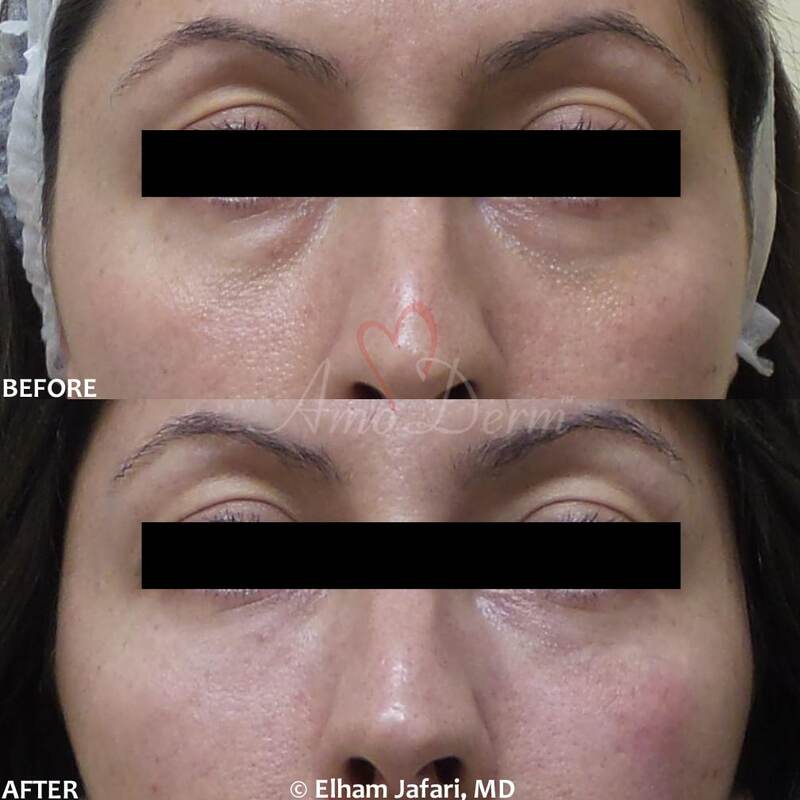 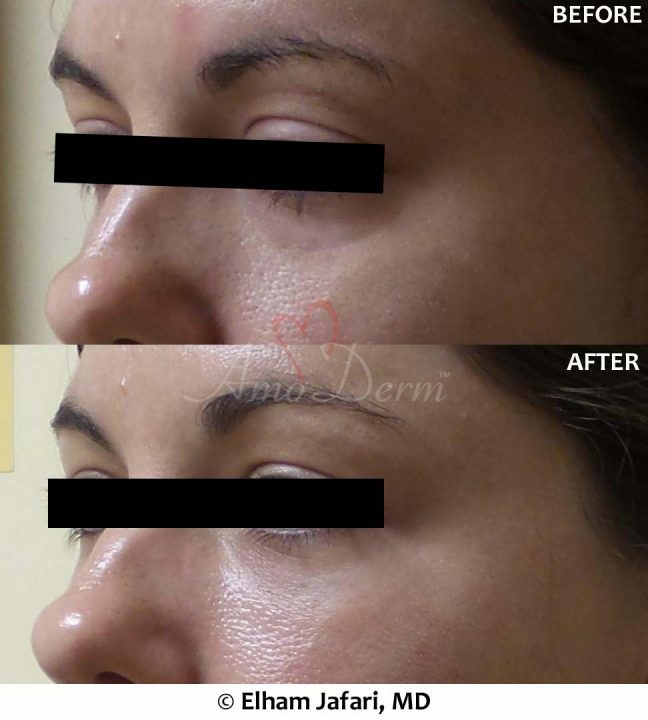 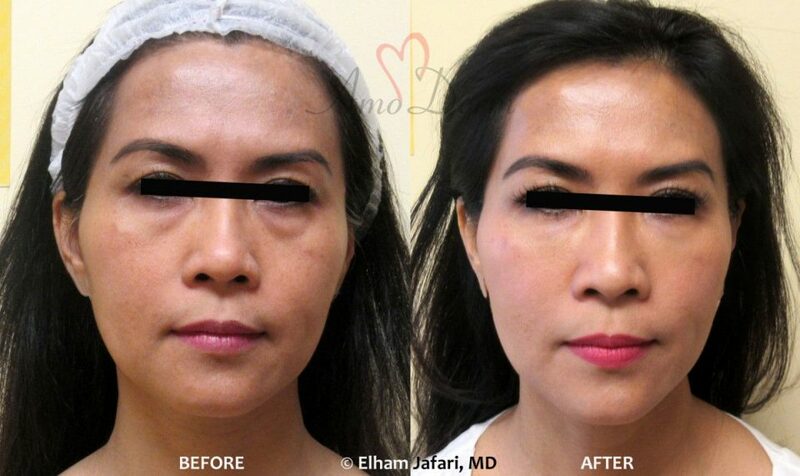 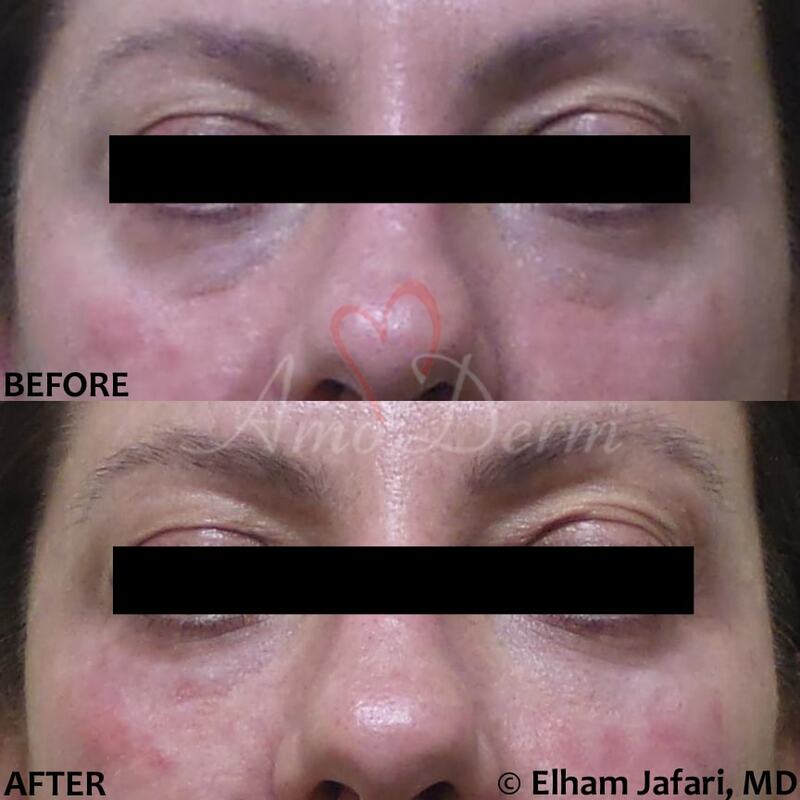 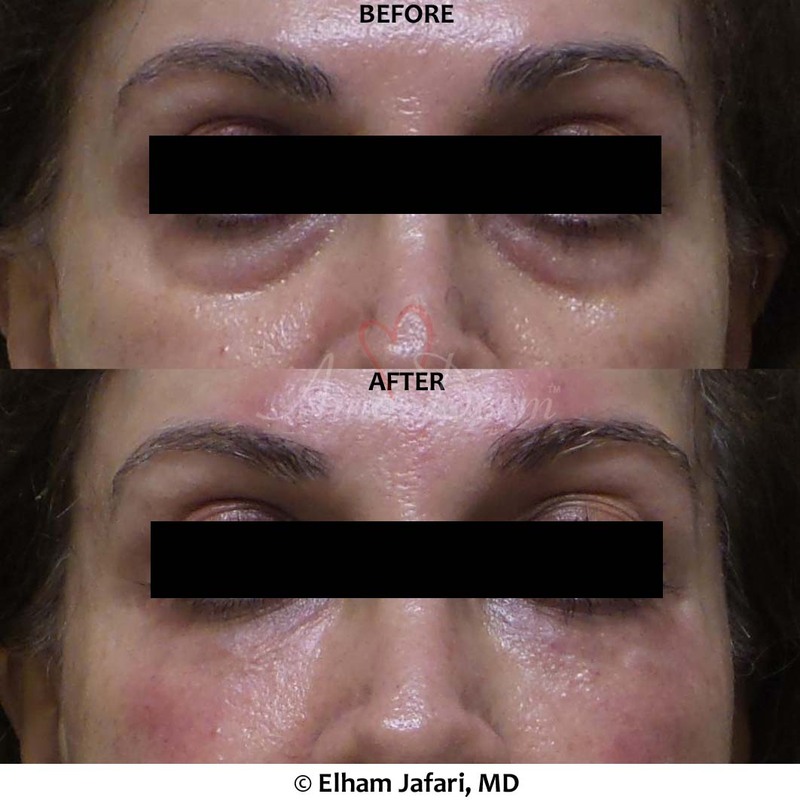 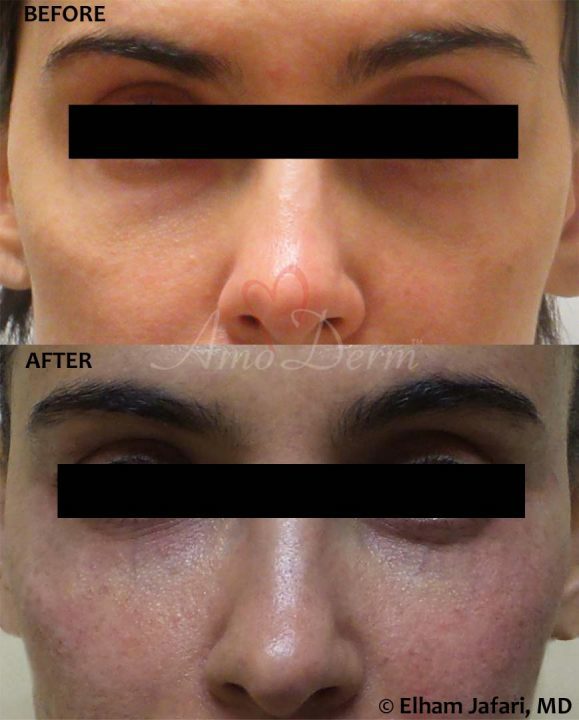 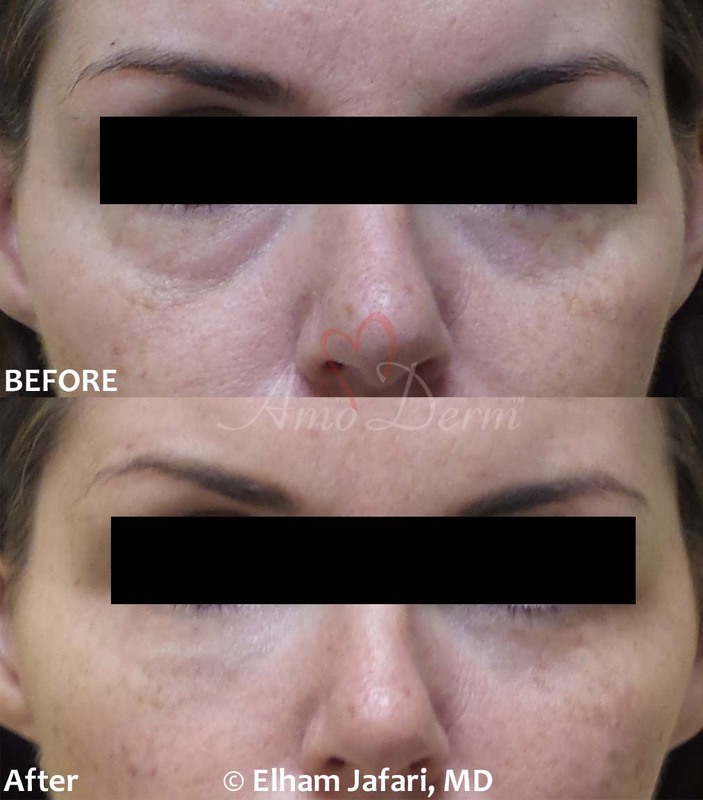 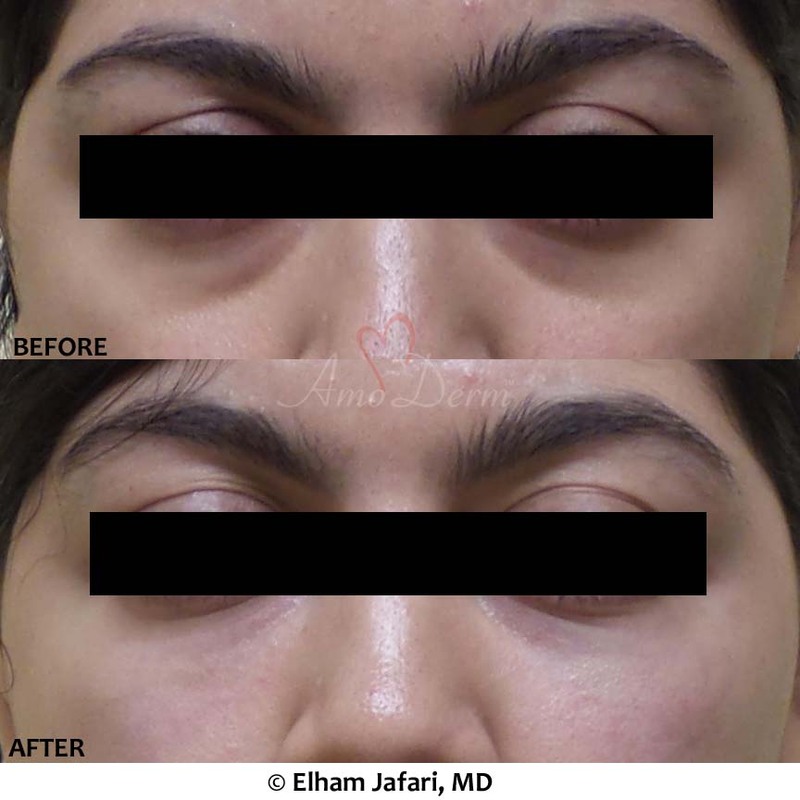 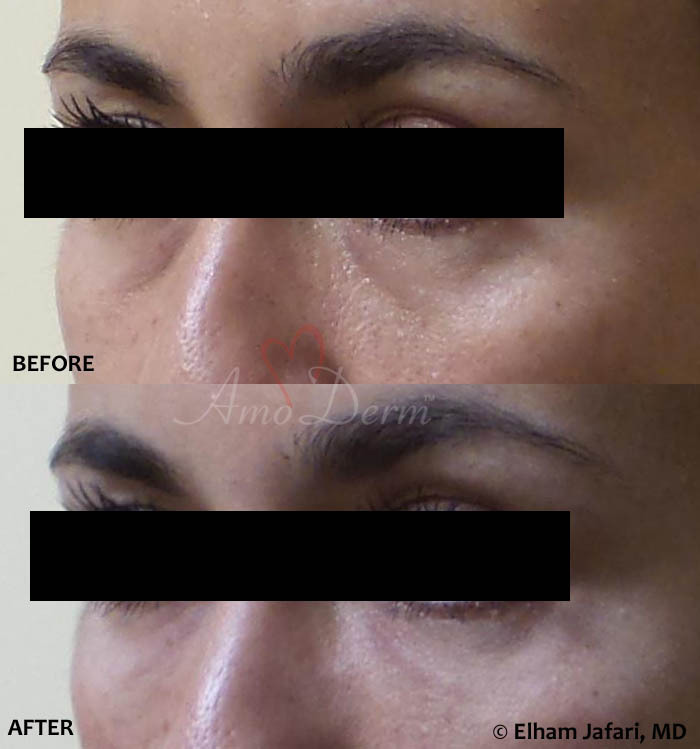 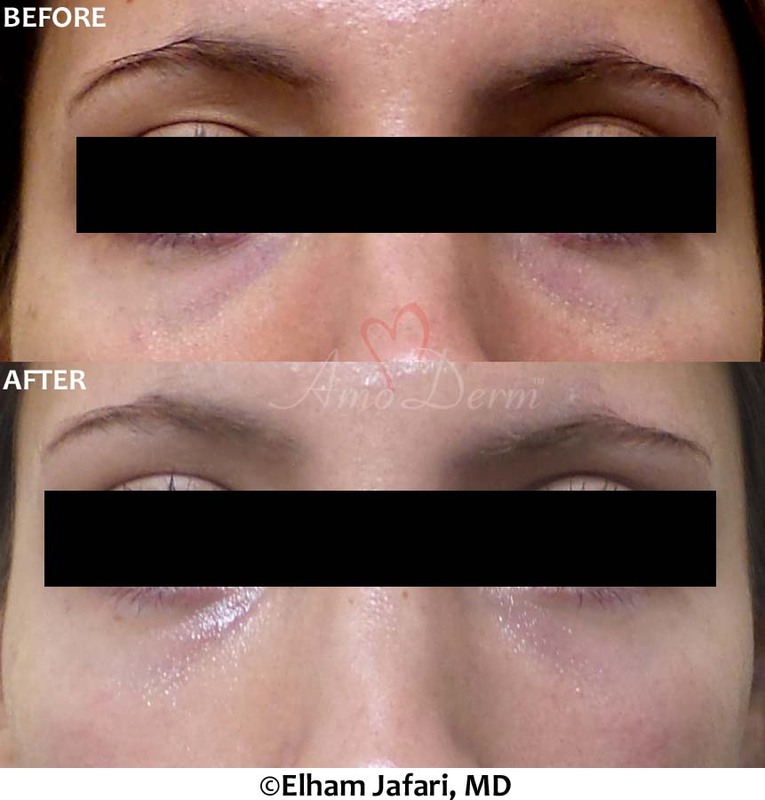 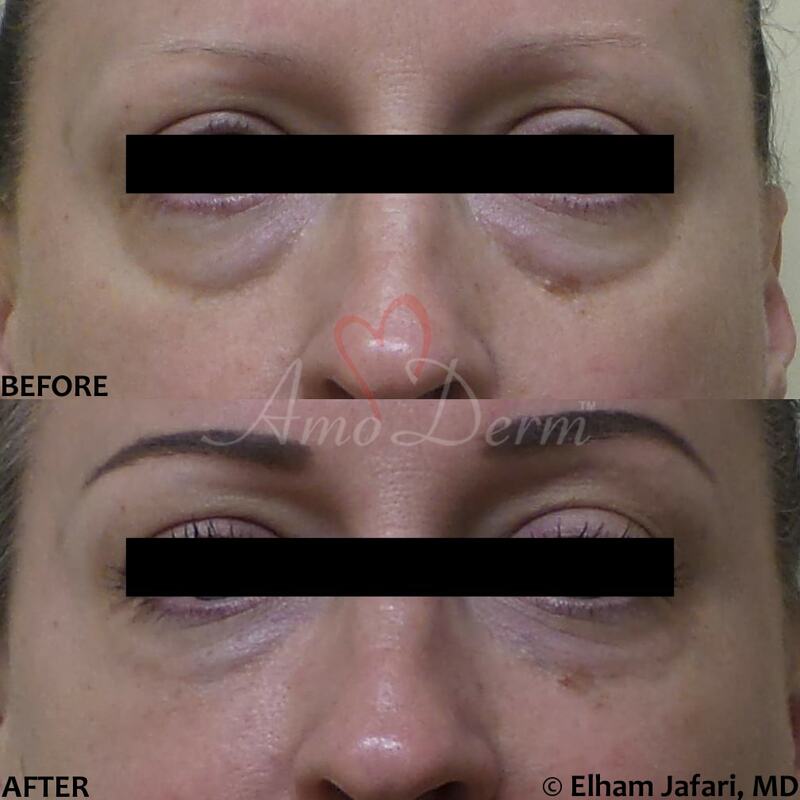 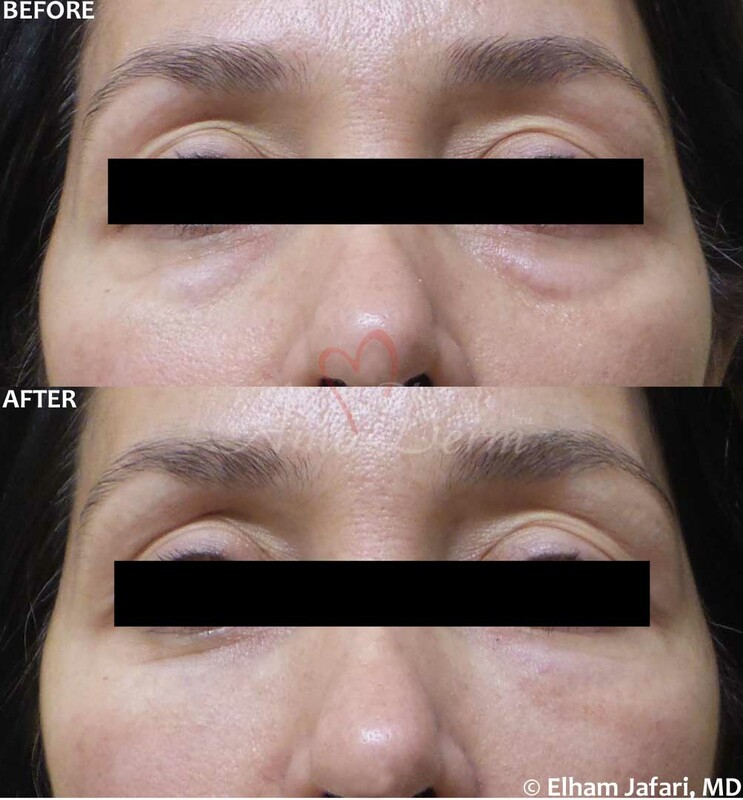 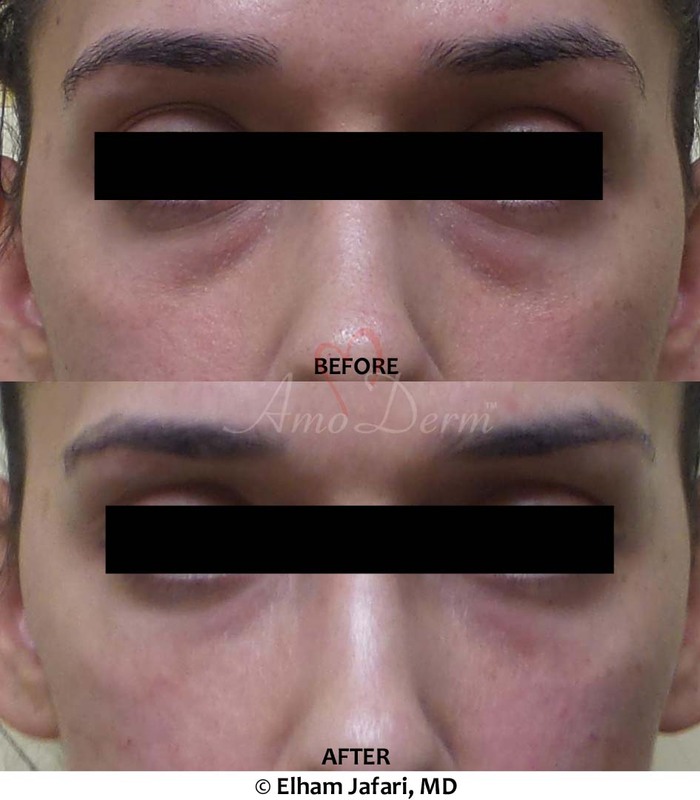 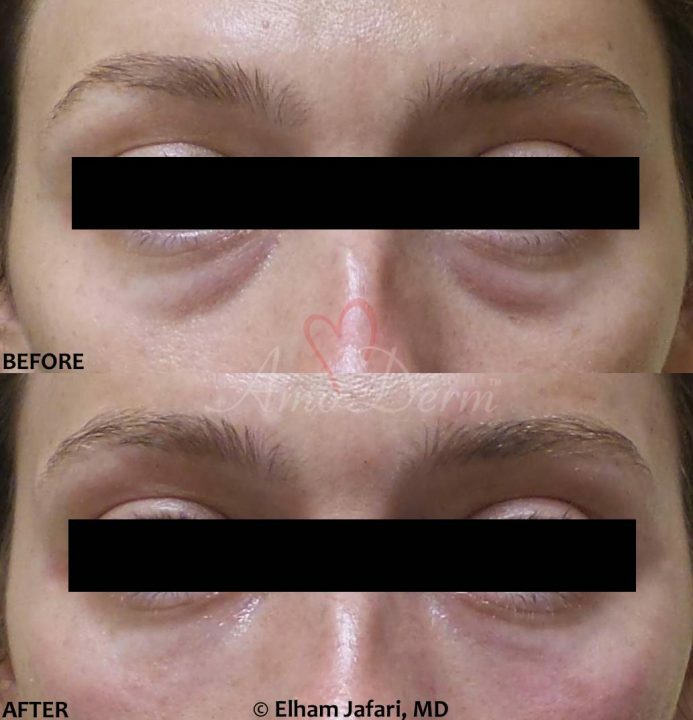 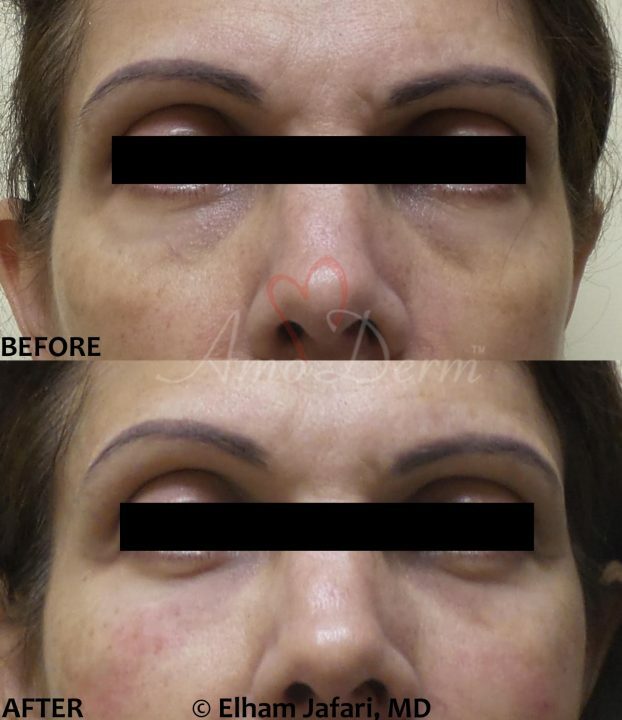 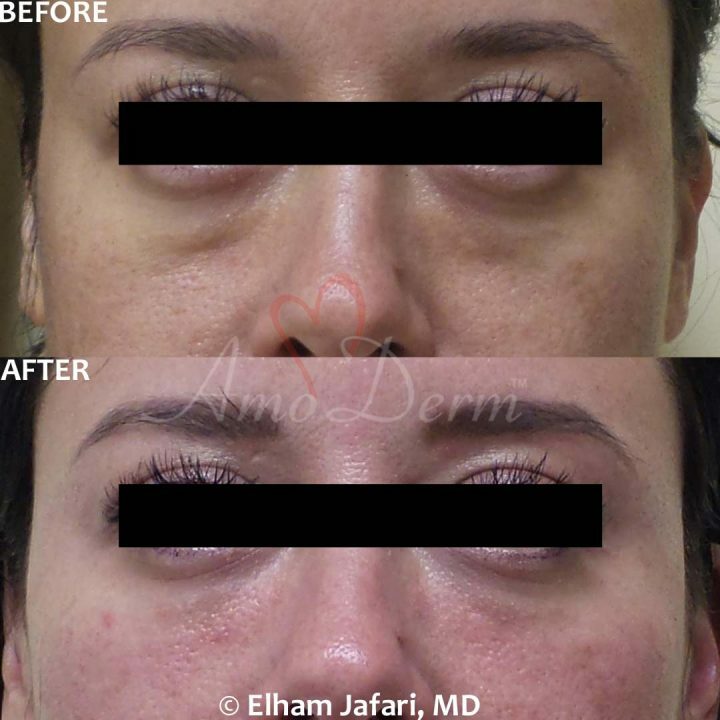 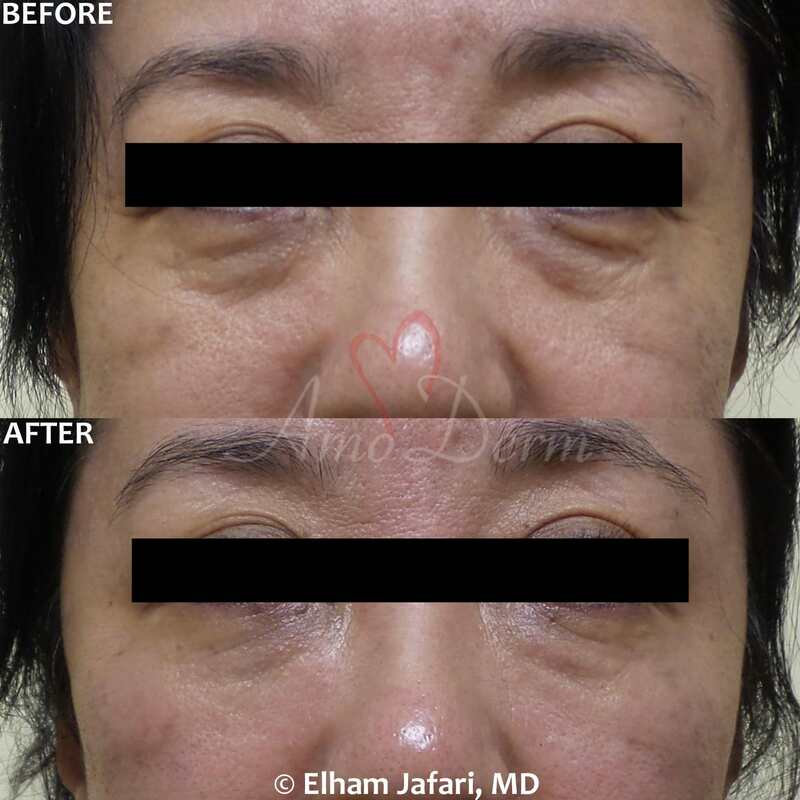 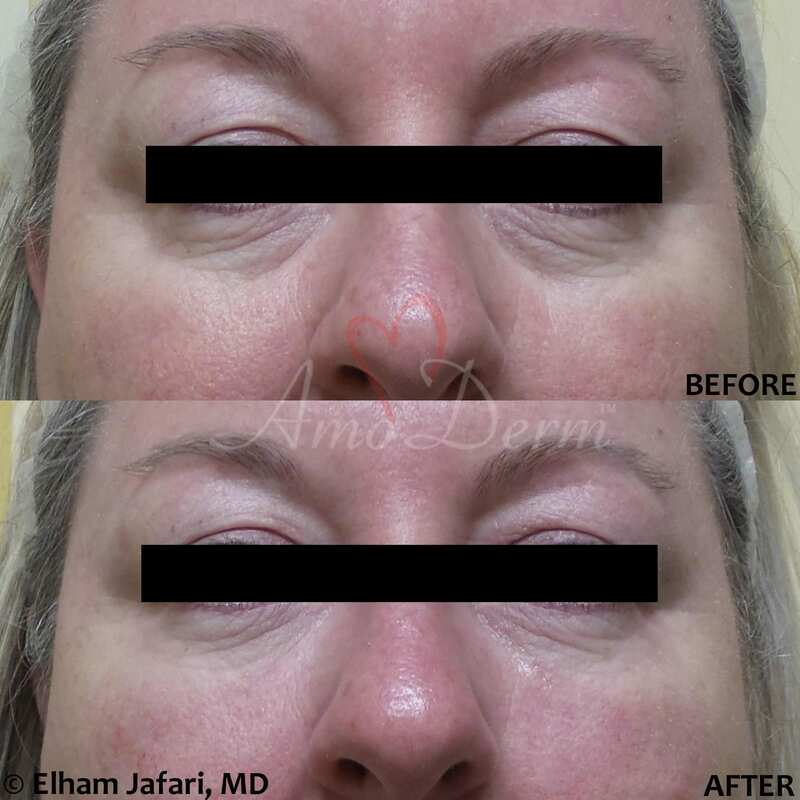 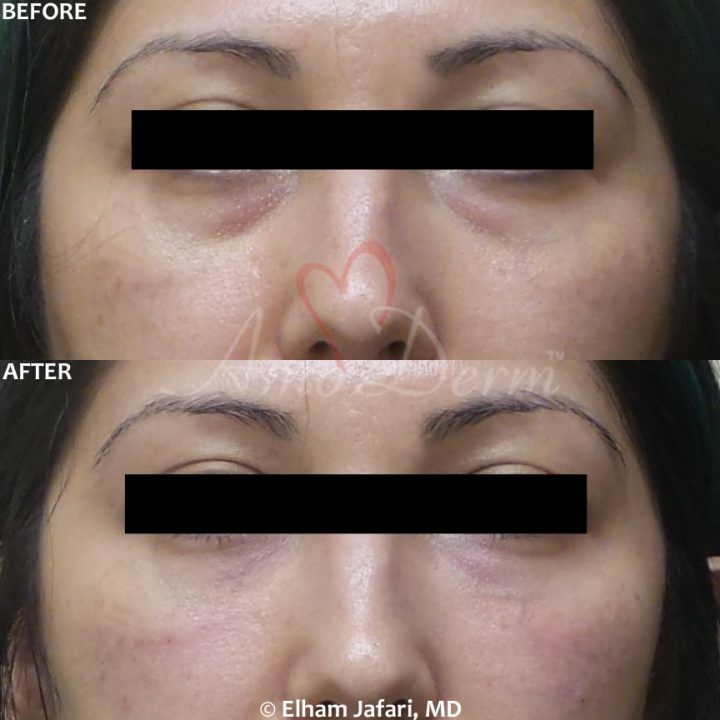 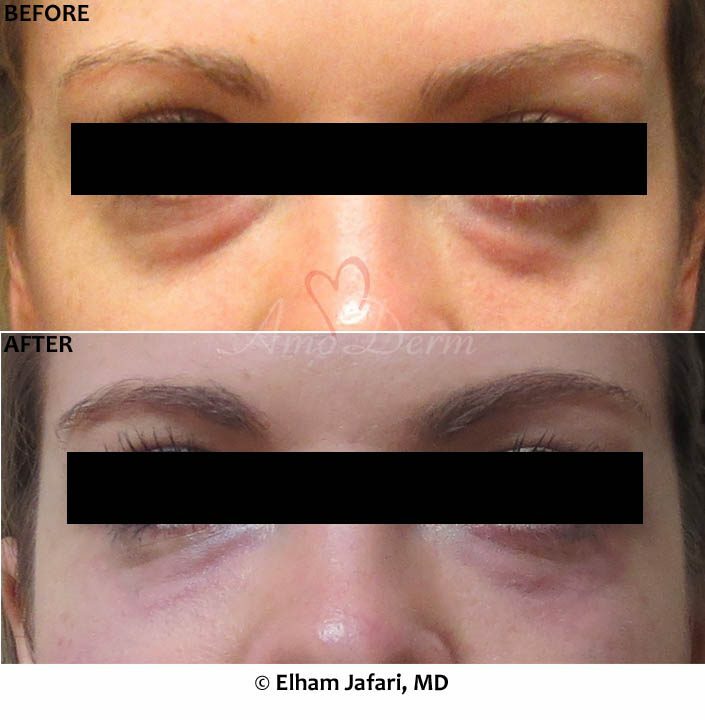 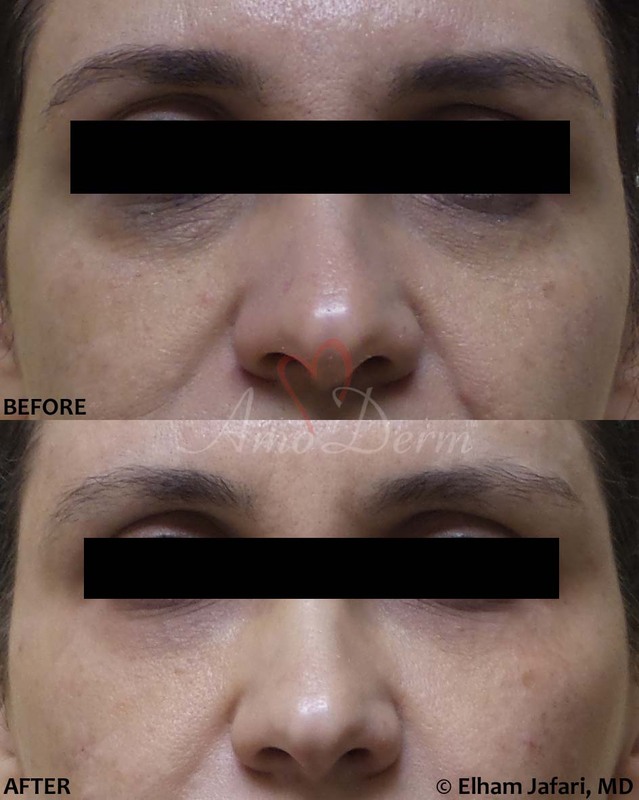 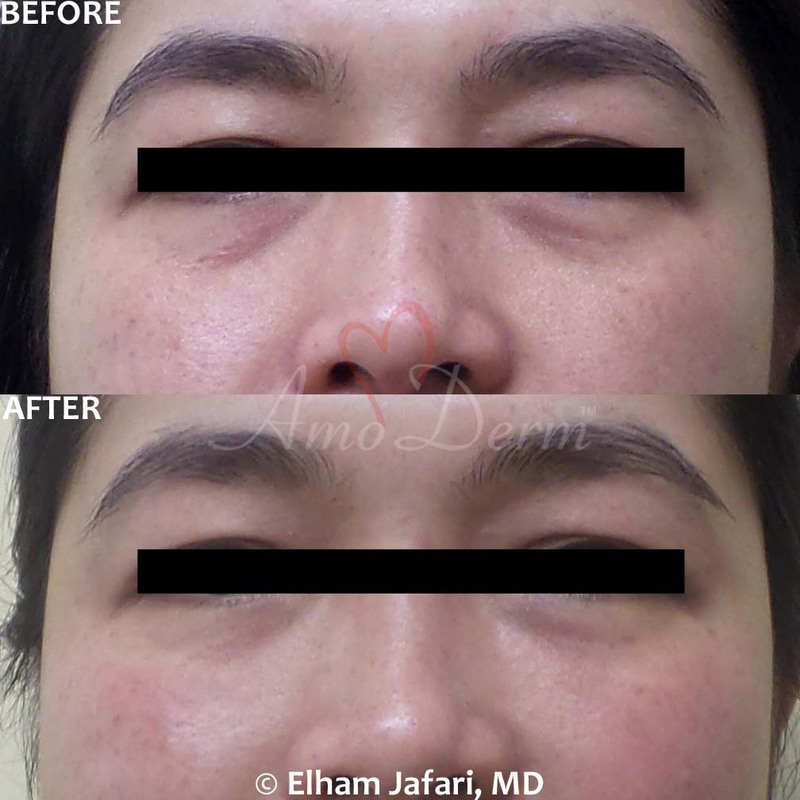 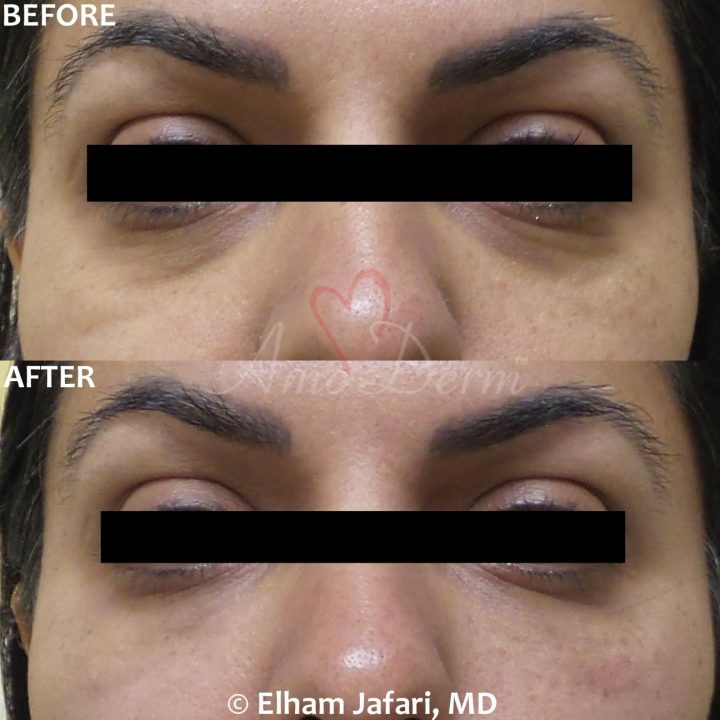 For some other people, this change appears primarily as bags under the eyes, since volume loss under the eyes disrupts the smooth and seamless transition from under the eyes to the cheeks and lost volume in one area make the adjacent area look like a bulging bag. 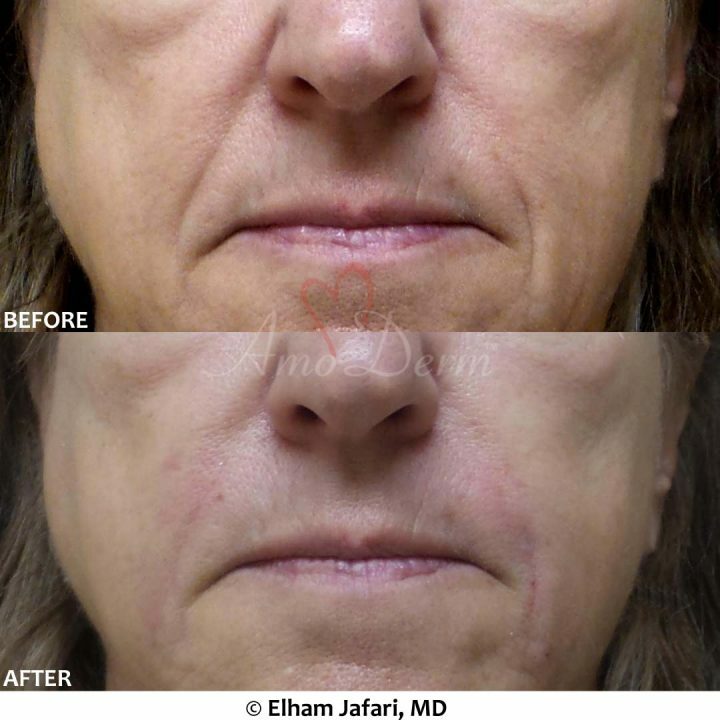 Your doctor can effectively treat this condition with a skillful injection of fillers in the area. Some fillers such as Juvederm, Belotero and Restylane last up to one year, while others such as Voluma, Bellafill, Radiesse and Restylane last much longer. 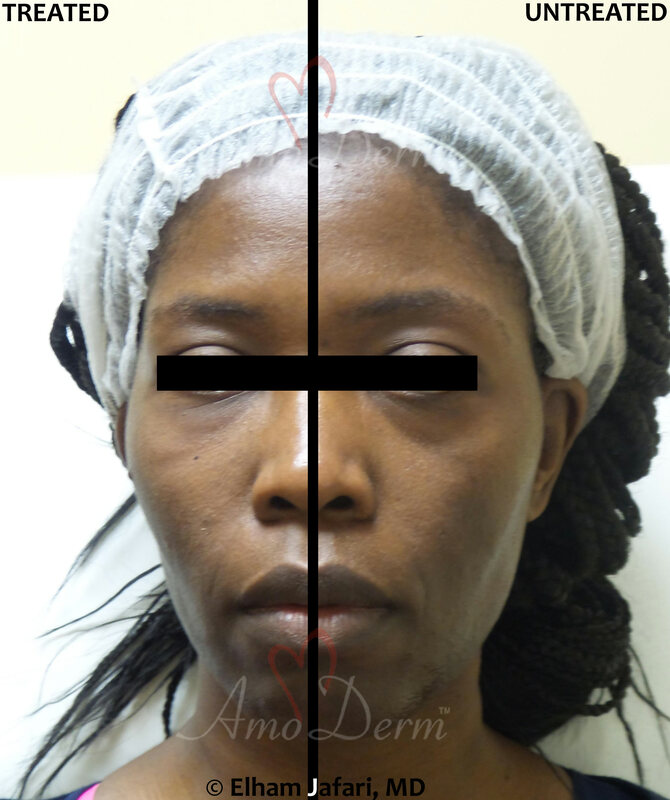 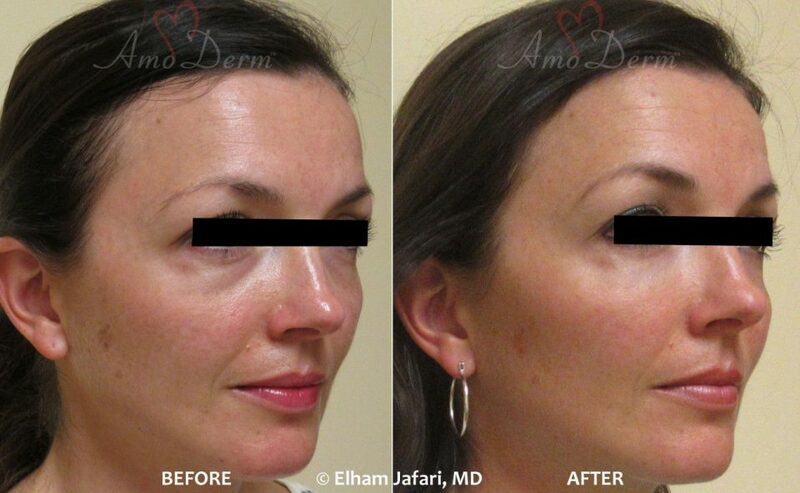 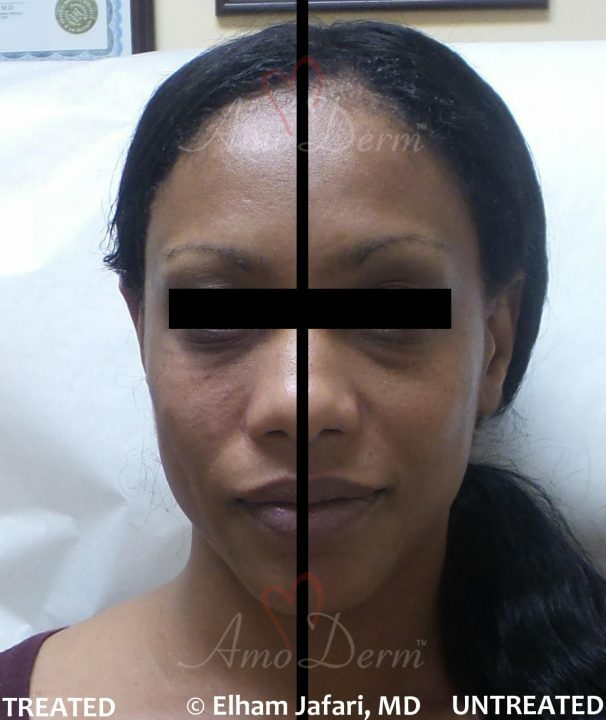 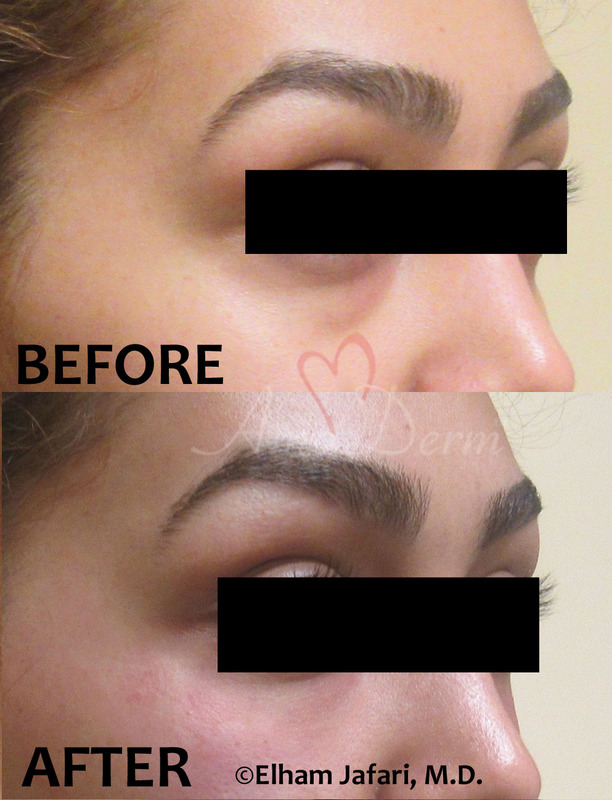 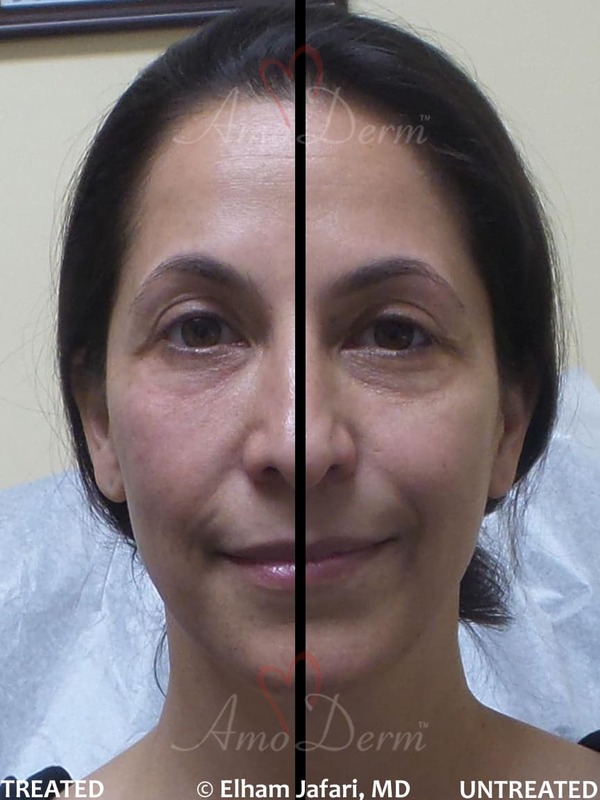 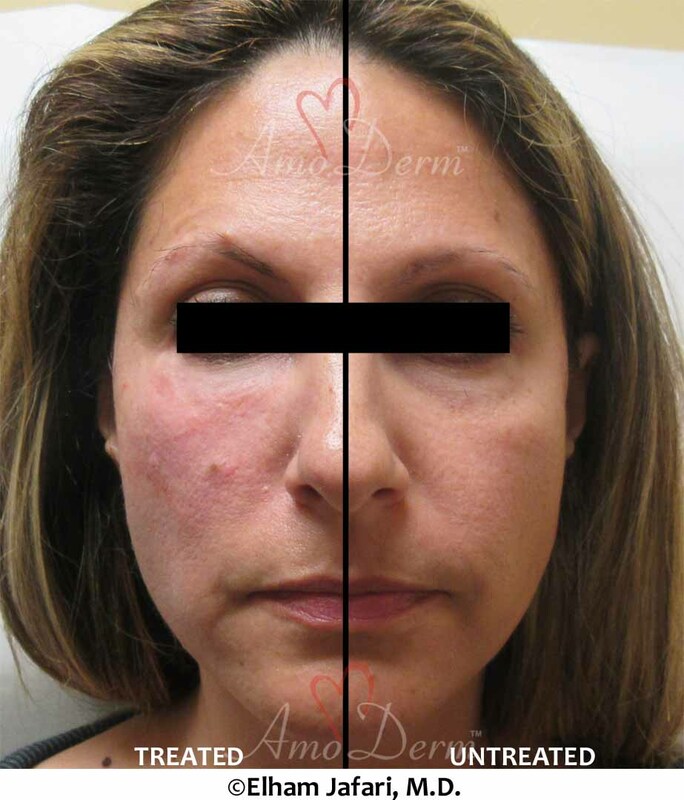 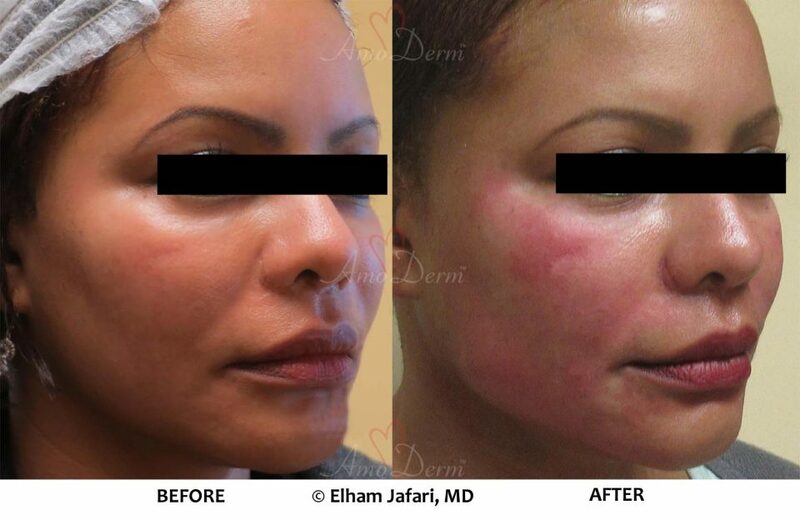 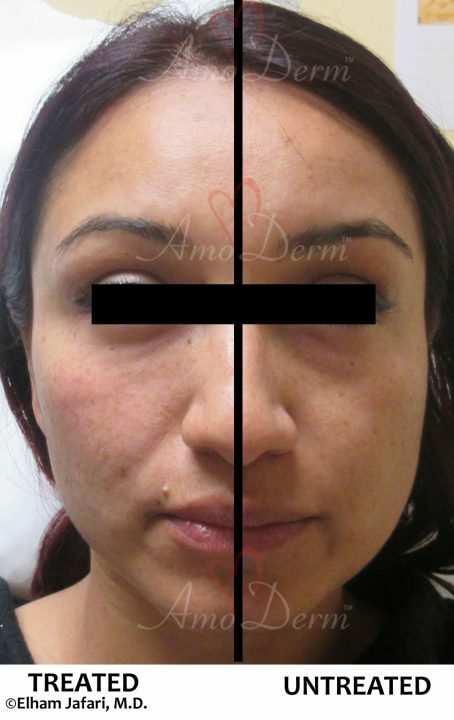 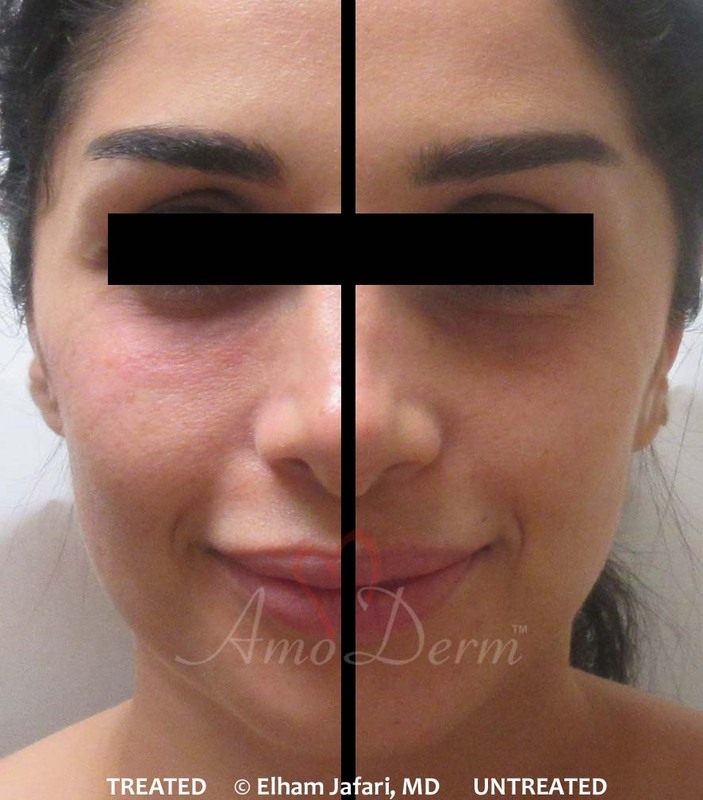 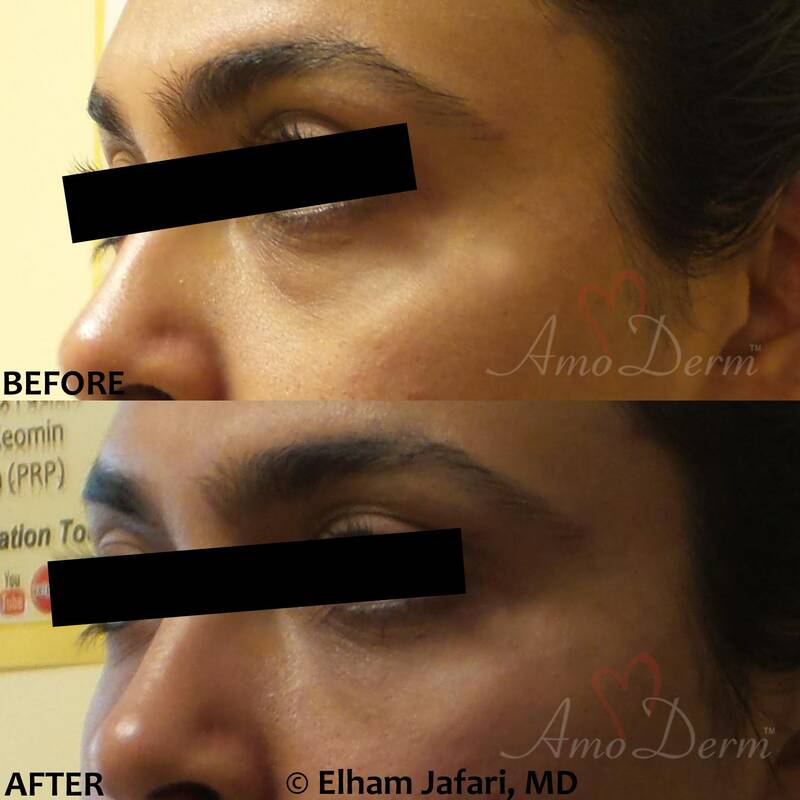 Botox, Dysport and Xeomin can be used to relax muscles and relieve the pull and contraction from the adjacent skin. 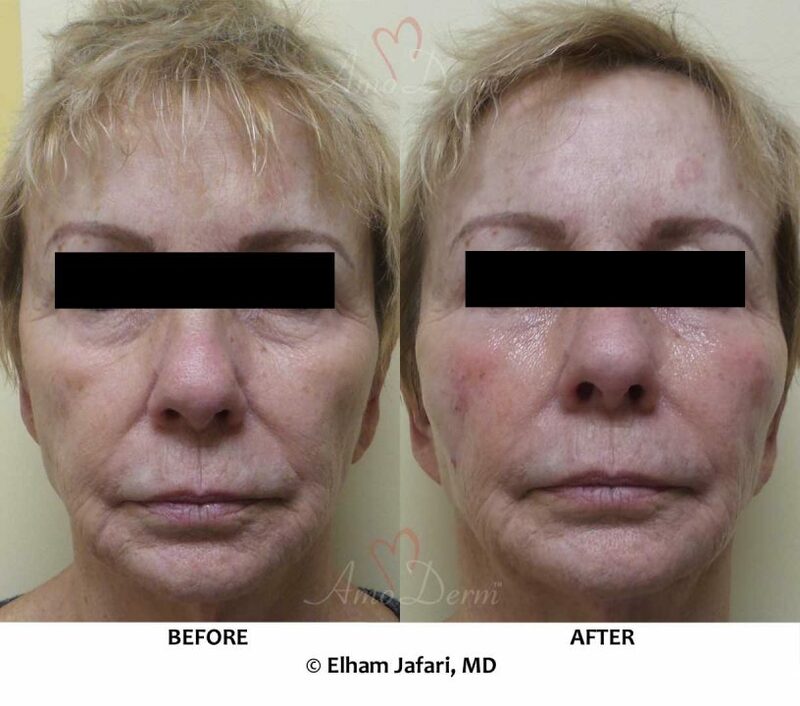 This will help reduce the appearance of fine lines and wrinkles, and more importantly, slow or stop the progression from finer and dynamic lines into deeper and static (permanent) lines and folds in many areas such as forehead, between eyebrows, around the eyes (crows feet), around the mouth and on the neck (platysmal bands). 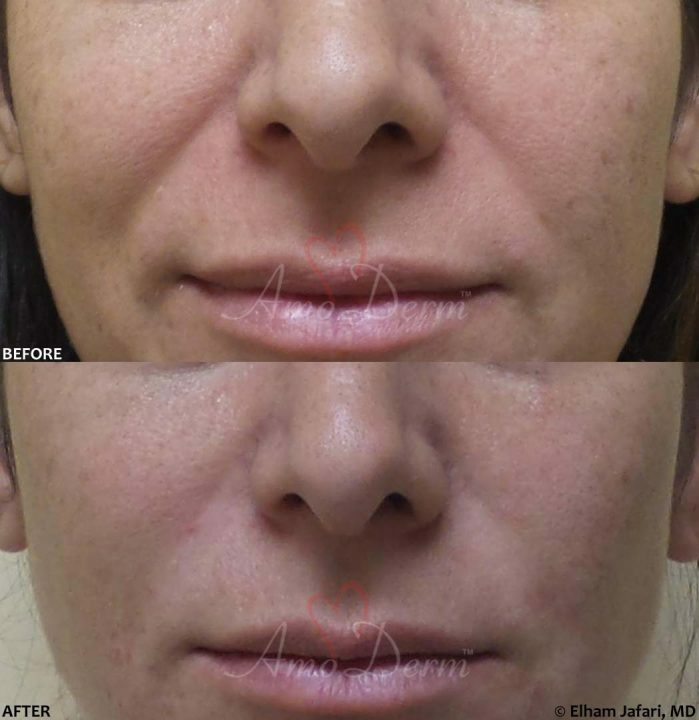 PDO threads are absorbable threads similar to stitches used in surgical sutures. 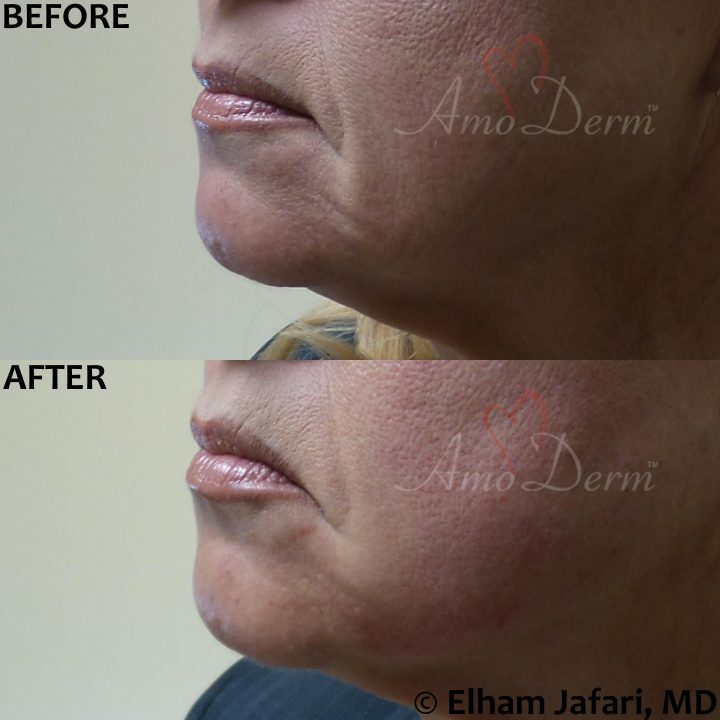 Your doctor can place them under your skin to generate pull and lift the skin in desired directions (Tread lift). 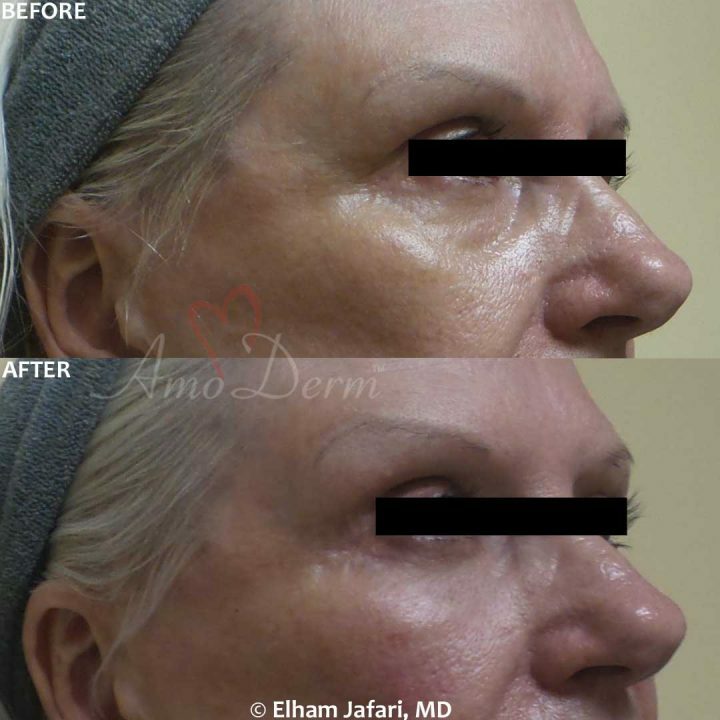 The threads themselves are gradually absorbed by the body and in the process, activates new collagen production for additional rejuvenating effects. 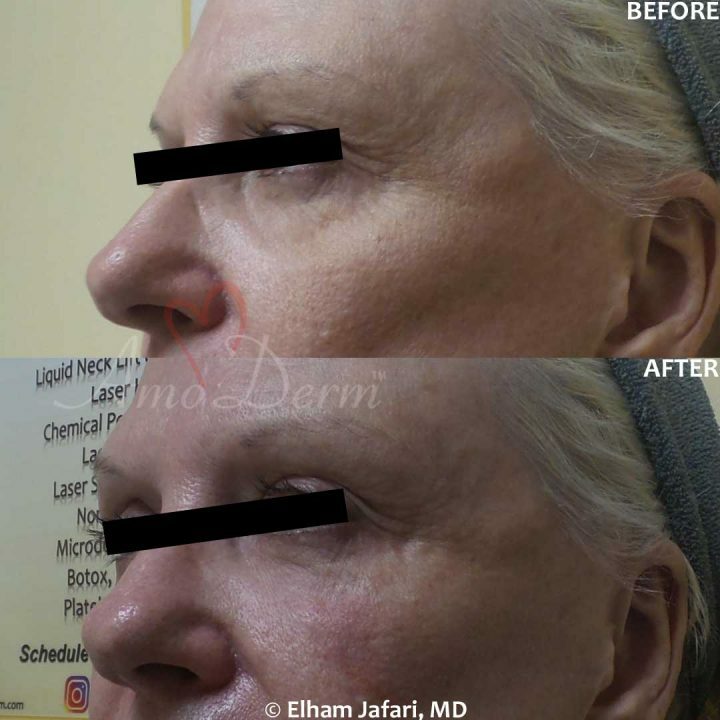 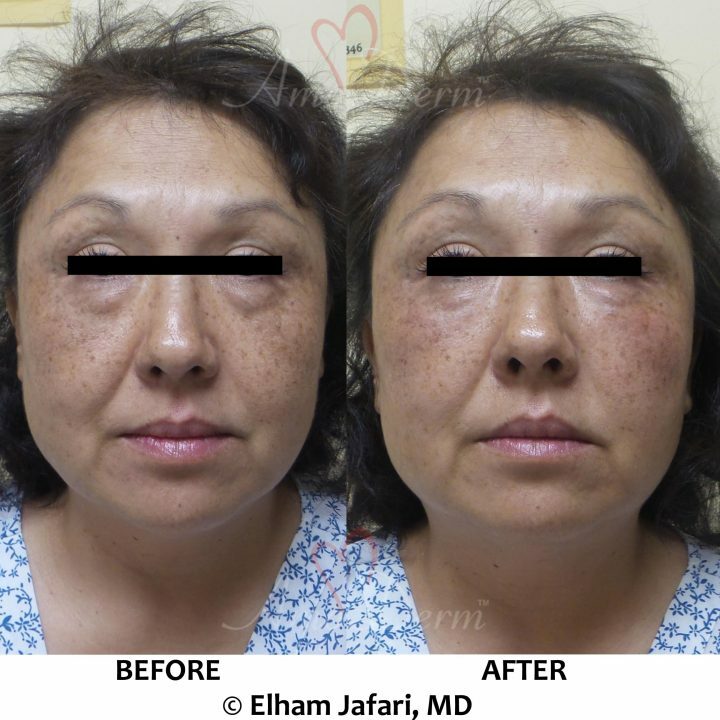 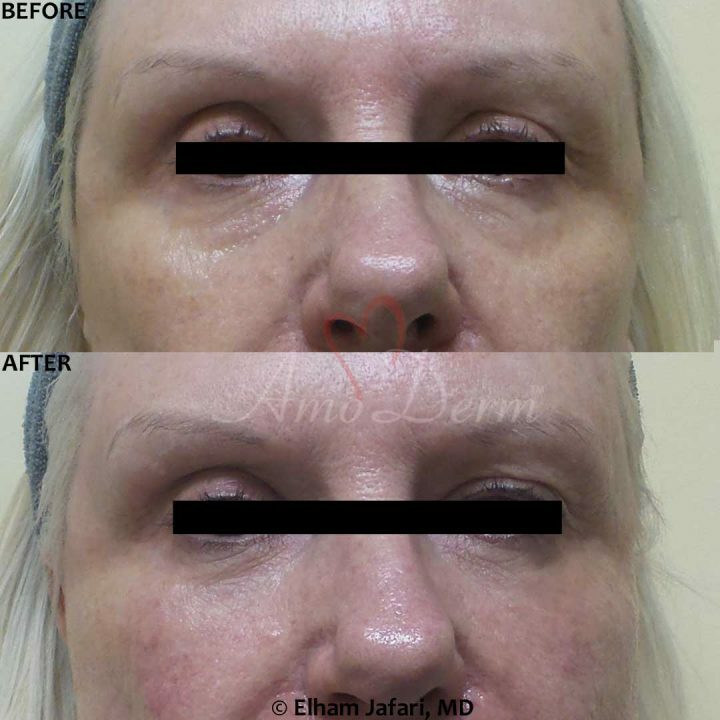 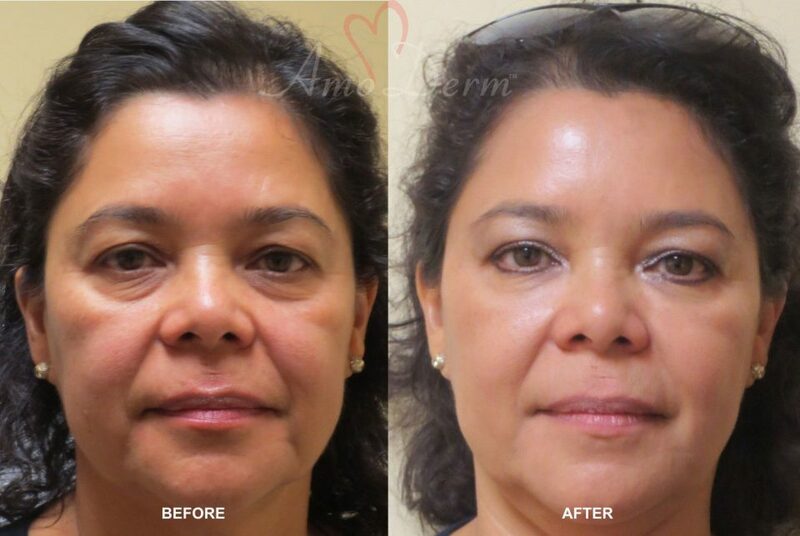 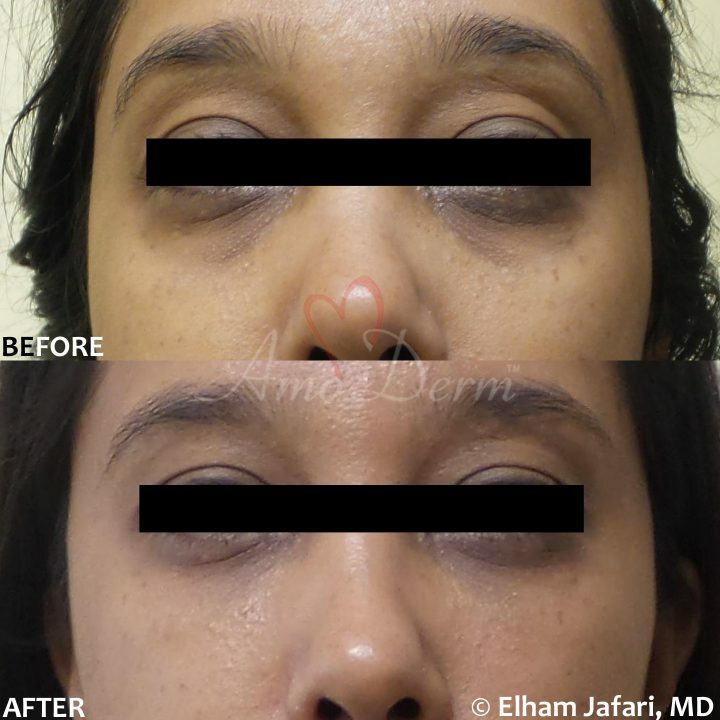 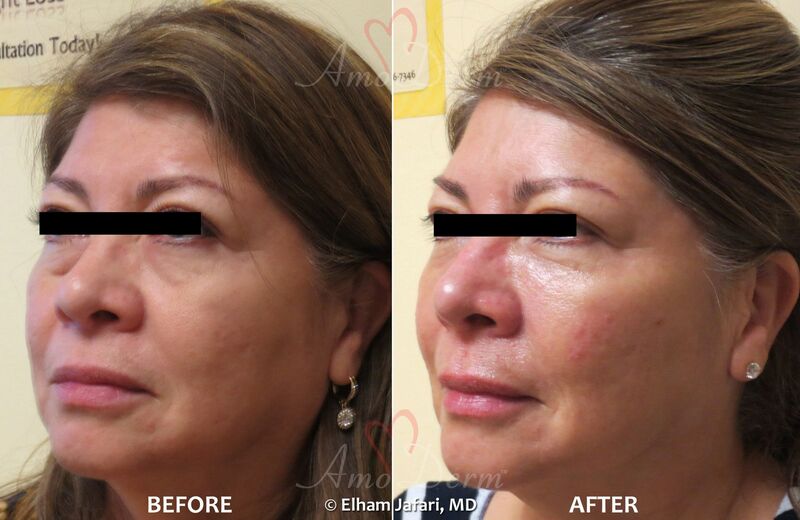 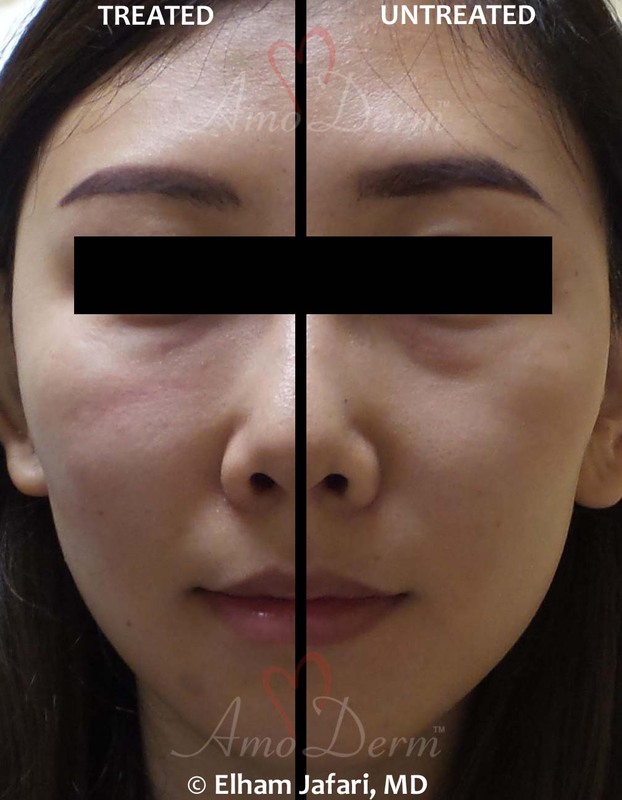 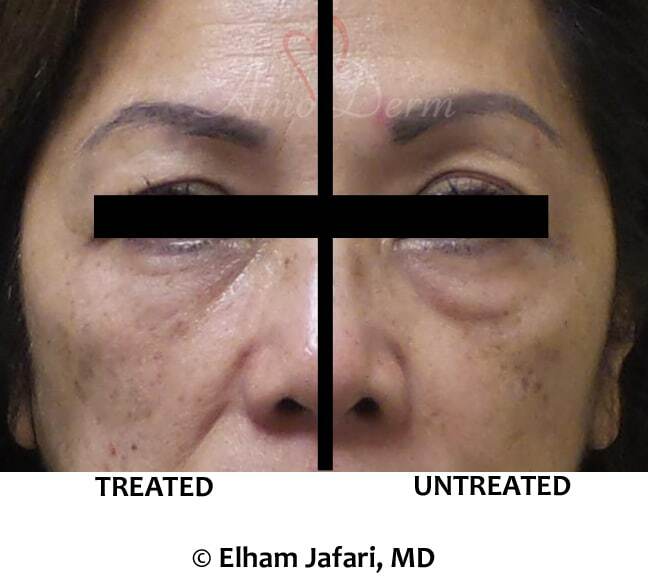 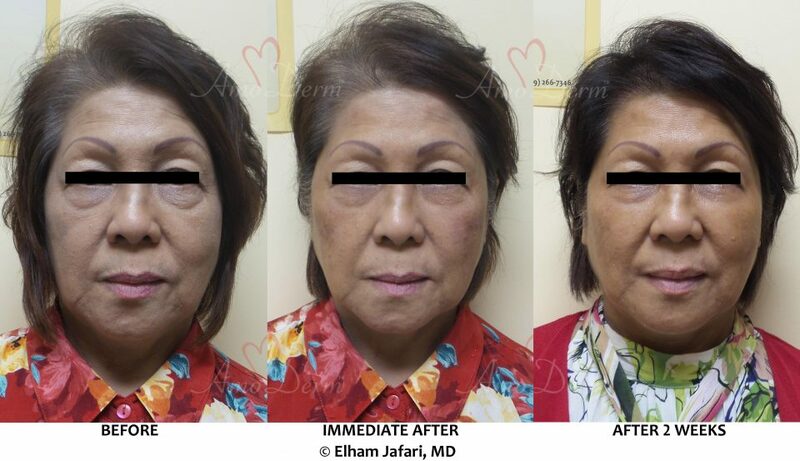 While the primary focus in Liquid Facelift is on use of cosmetic injections, your doctor can use a combination of various lasers such as Erbium and Fractional CO2 lasers to resurface the skin, remove fine lines, and further tighten the skin. 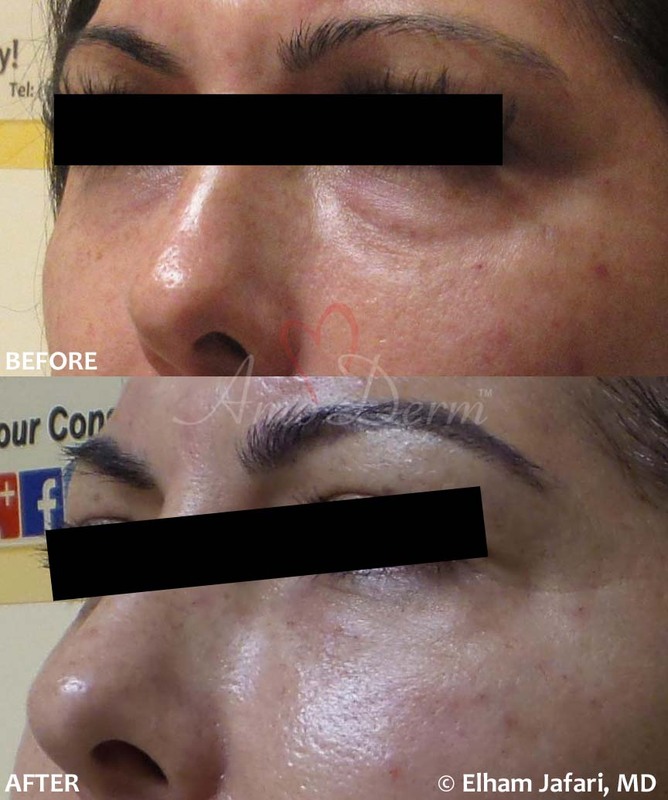 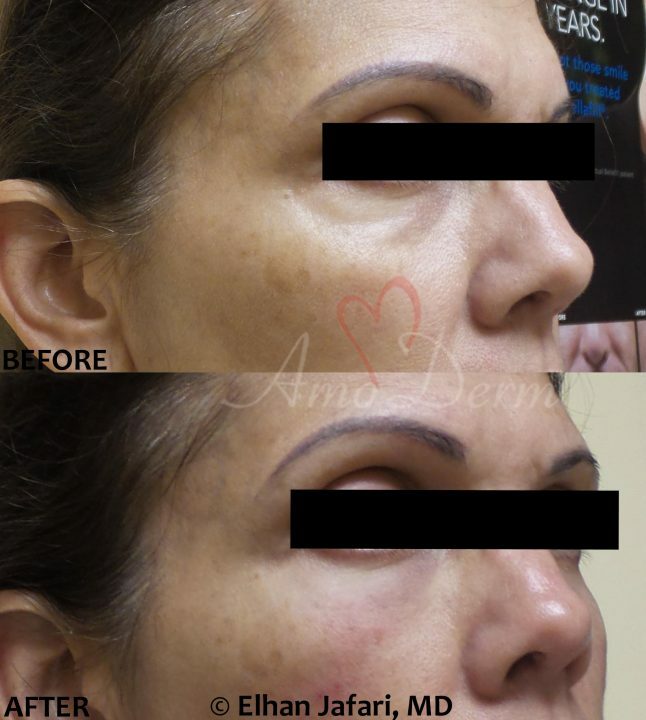 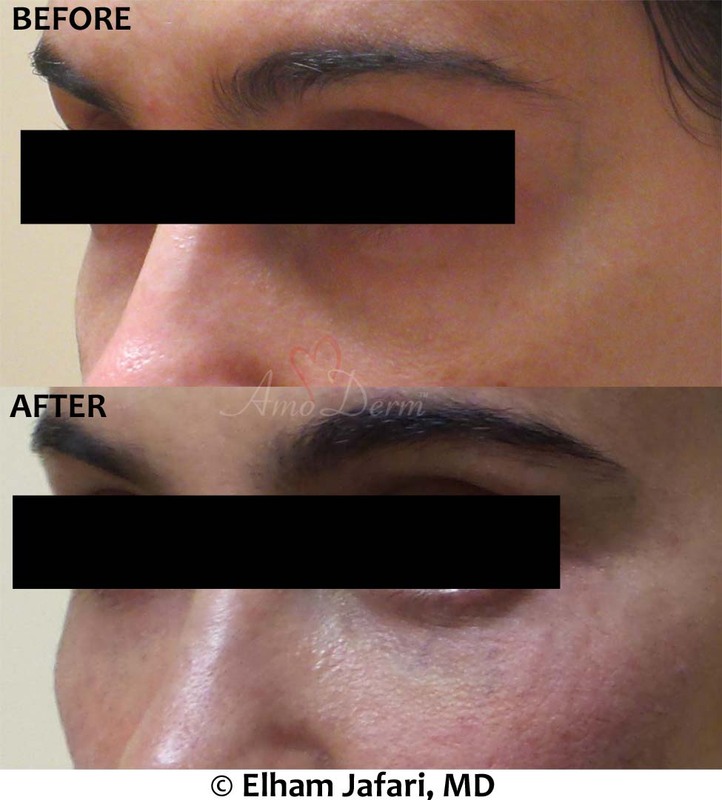 Radiofrequency treatments such as Venus Freeze are also great FDA-approved treatments for further tightening the skin and stimulating new collagen production in the skin. Which One Is Better – Surgical Facelift or Liquid Facelift? 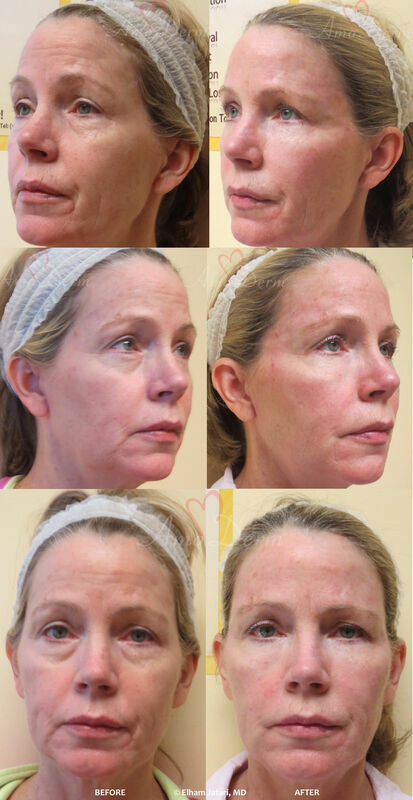 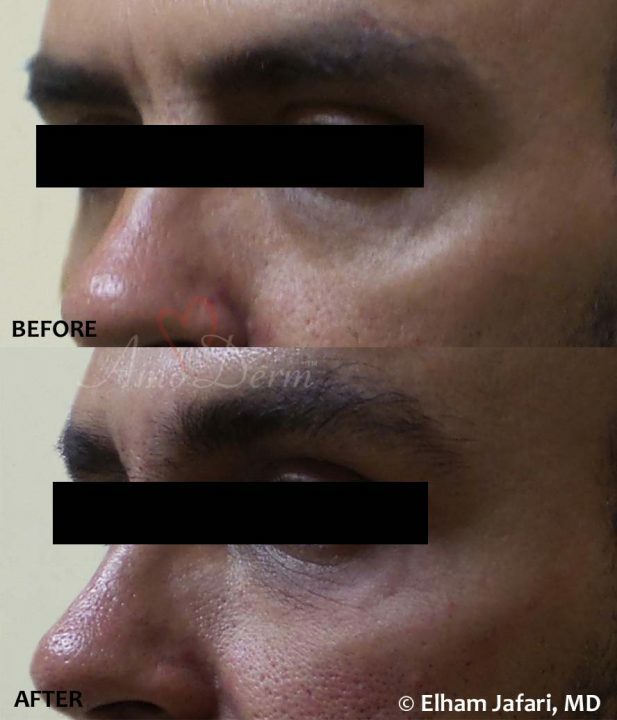 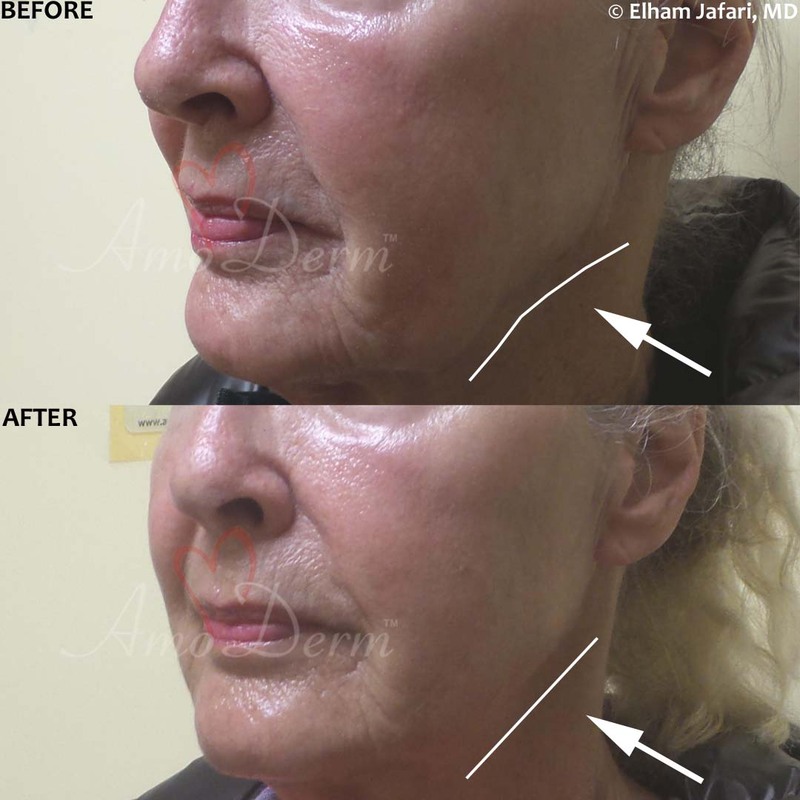 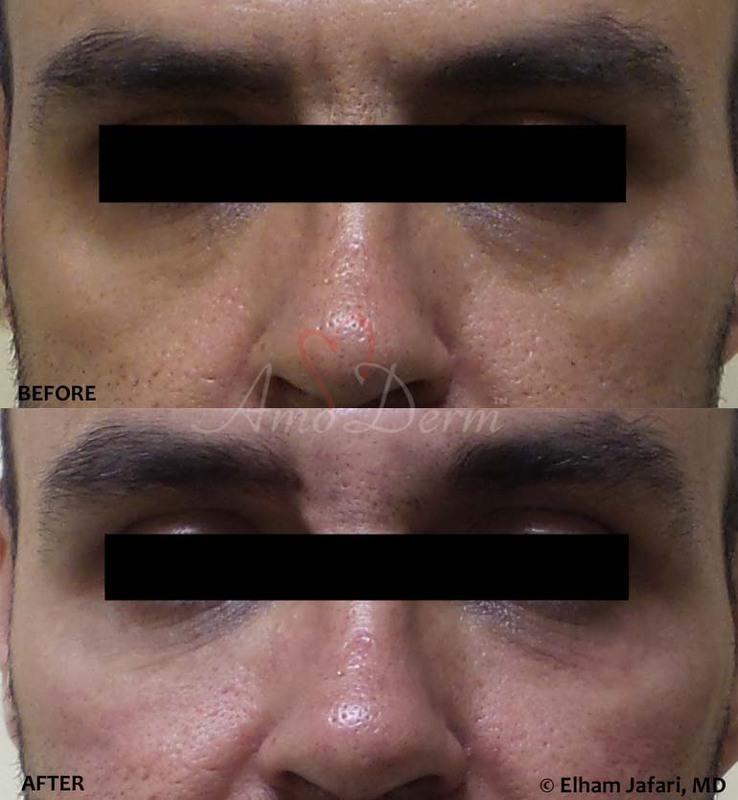 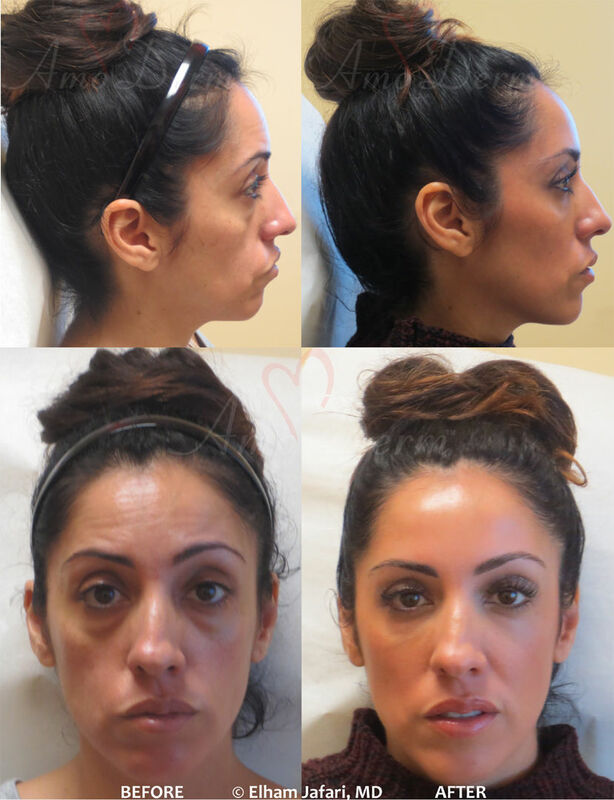 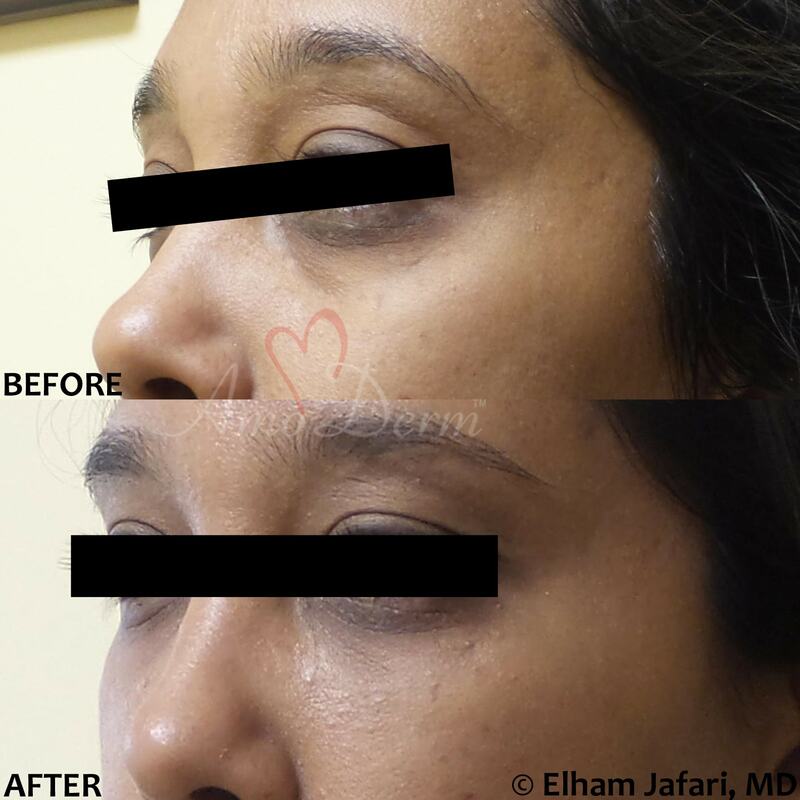 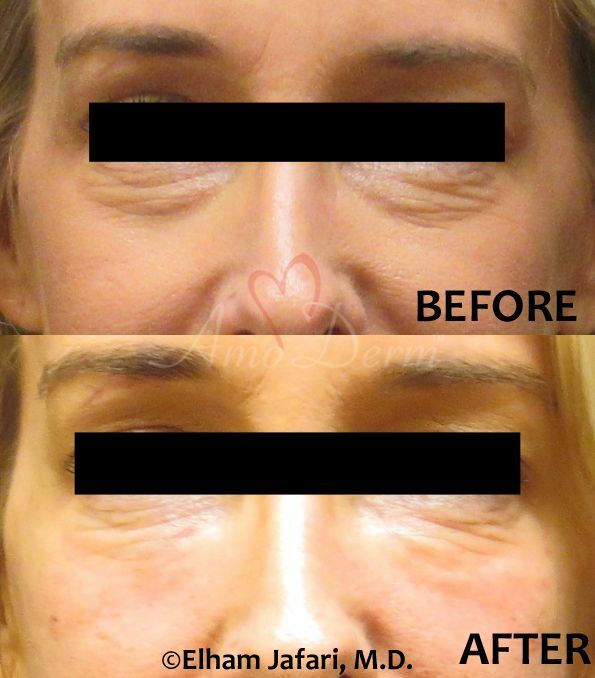 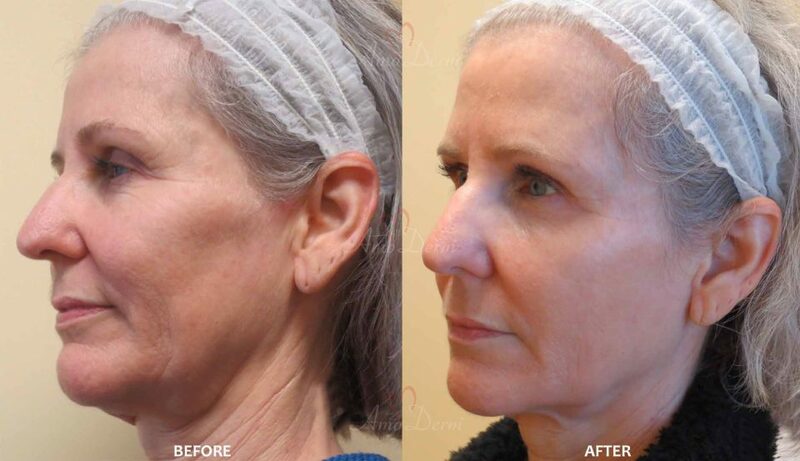 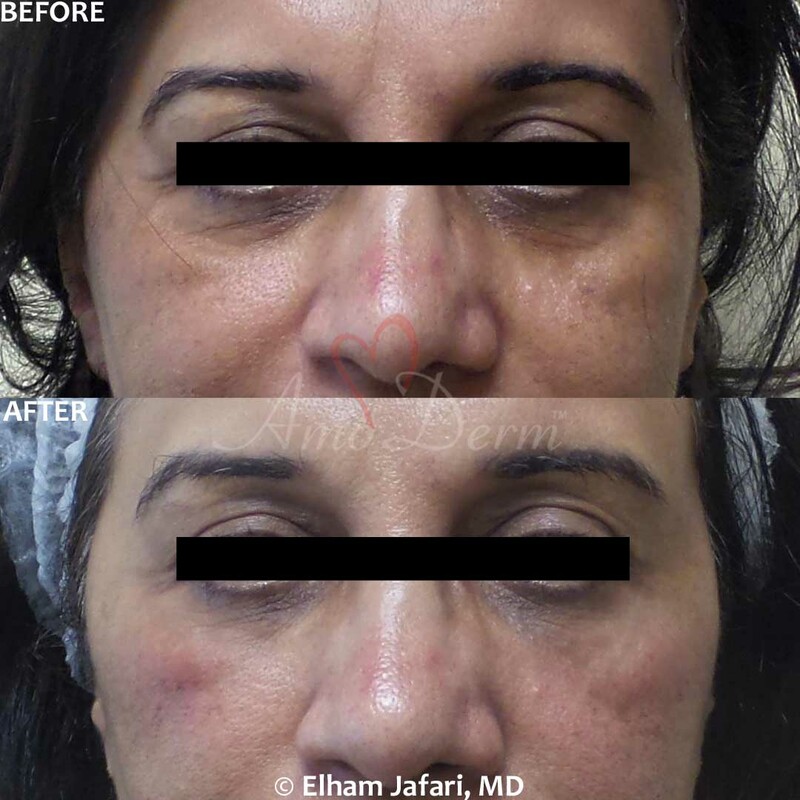 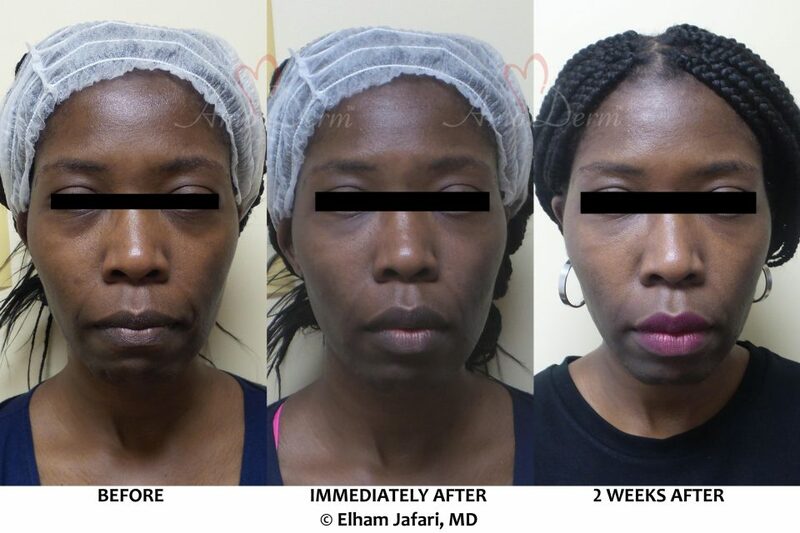 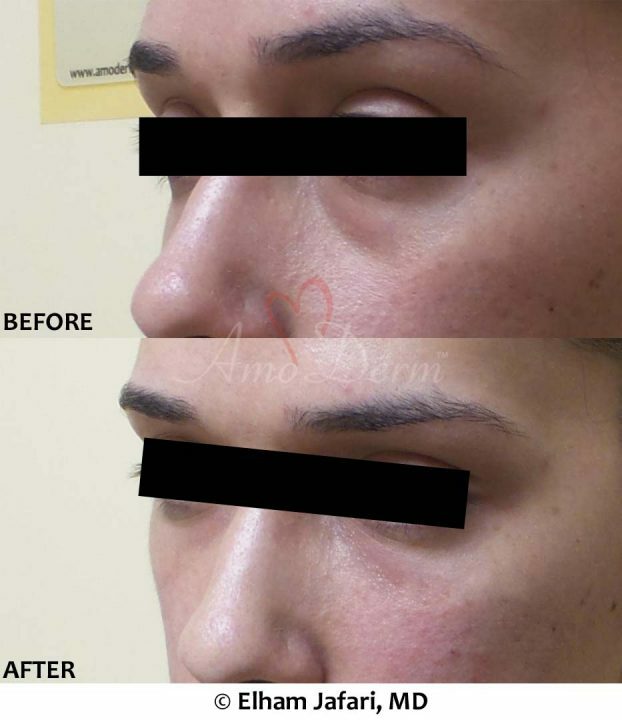 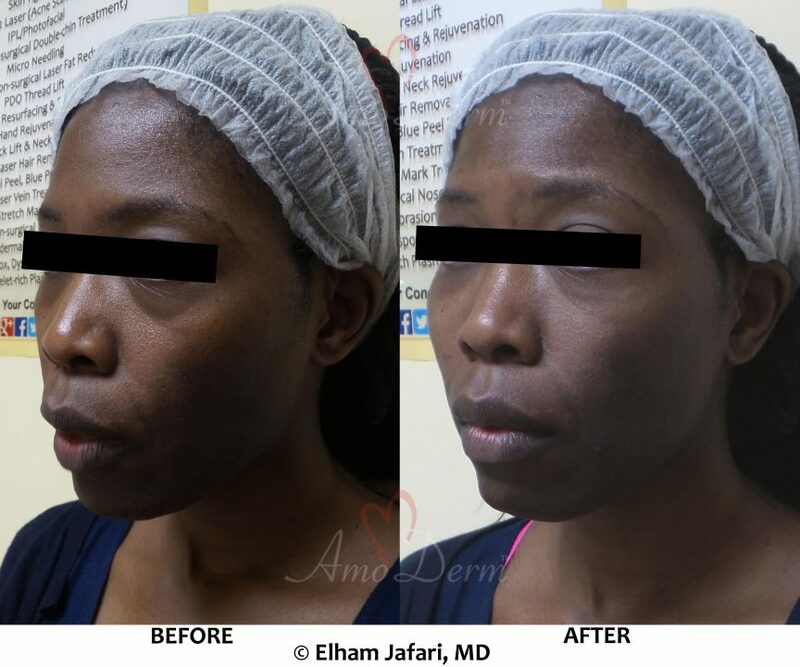 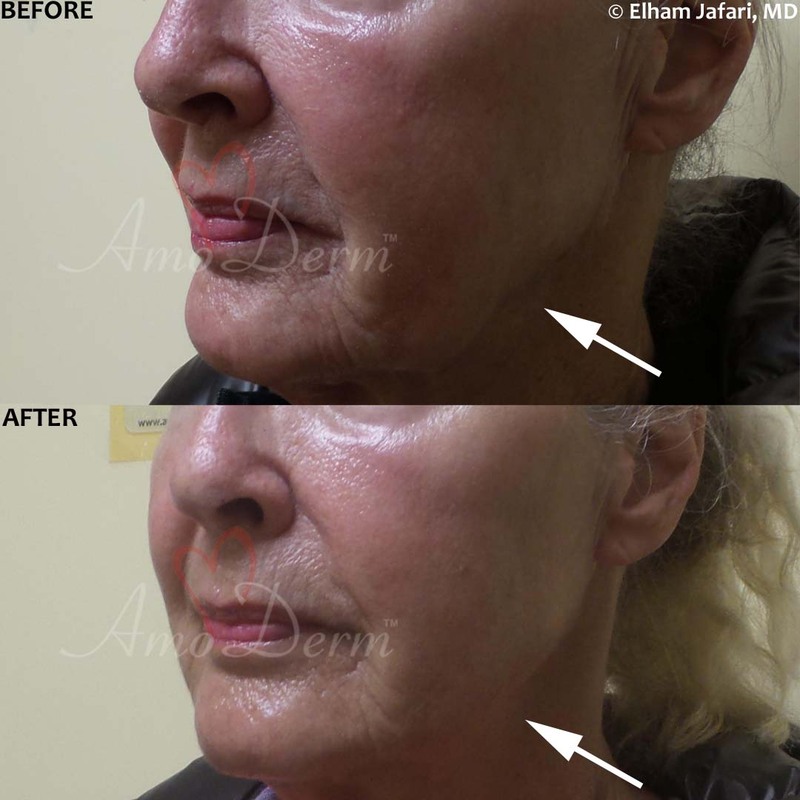 As can be seen here, many treatments offered as part of a liquid facelift procedure address problems that cannot be fully treated by a surgical facelift. 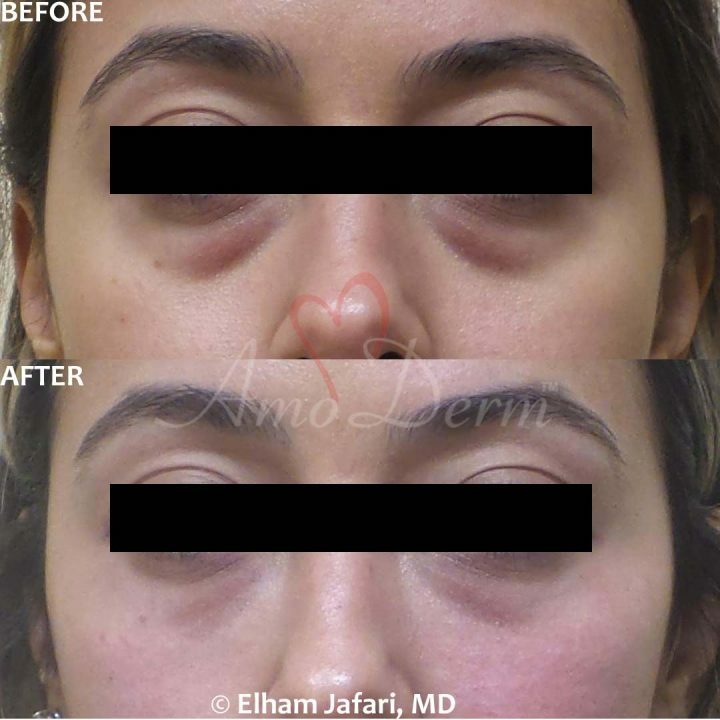 On the other hand, excessively sagging and loose skin in the face (especially areas like eyelids) is best treated with surgery. 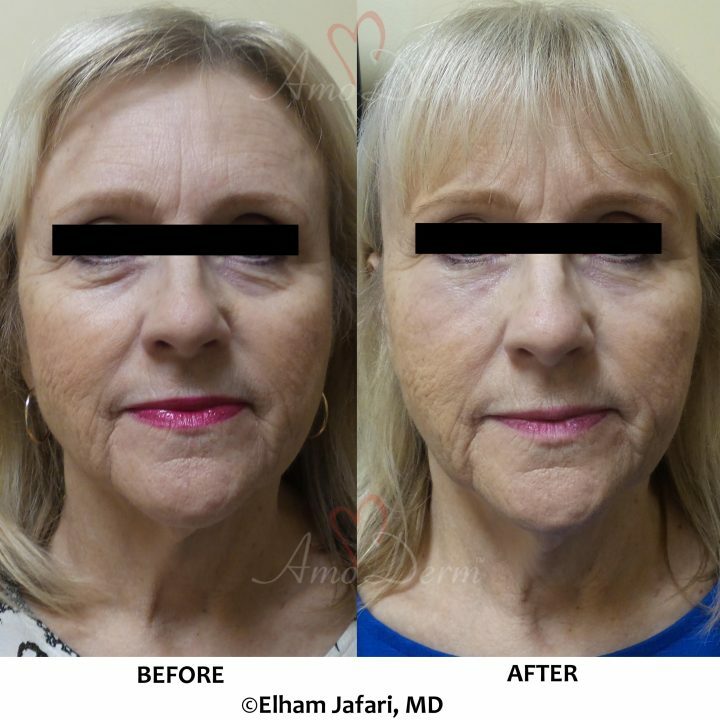 Unlike the popular belief, surgical facelift is not an alternative to a liquid facelift, and these procedures each can address certain aspects of aging. It is important to consult an experienced cosmetic doctor to determine if a patient is a candidate for one or other procedure (or maybe even both procedures). 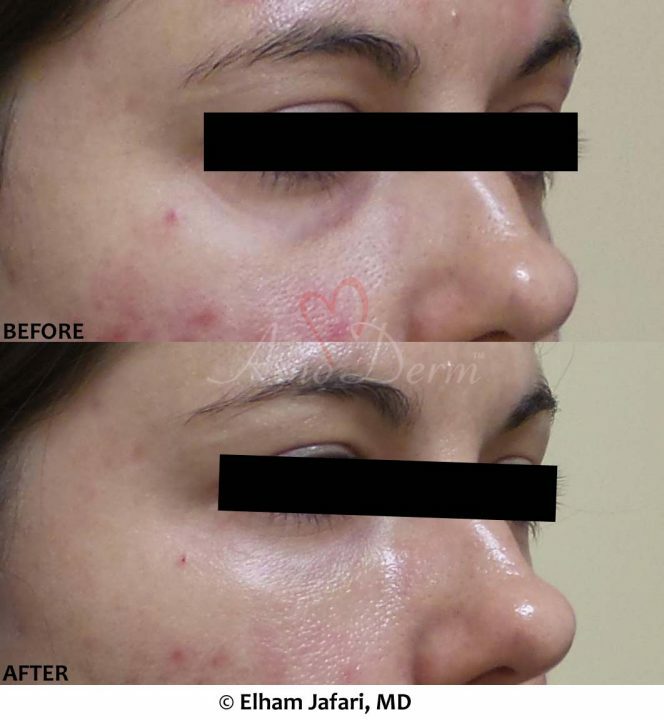 Unfortunately, these and similar statements are often incorrect. 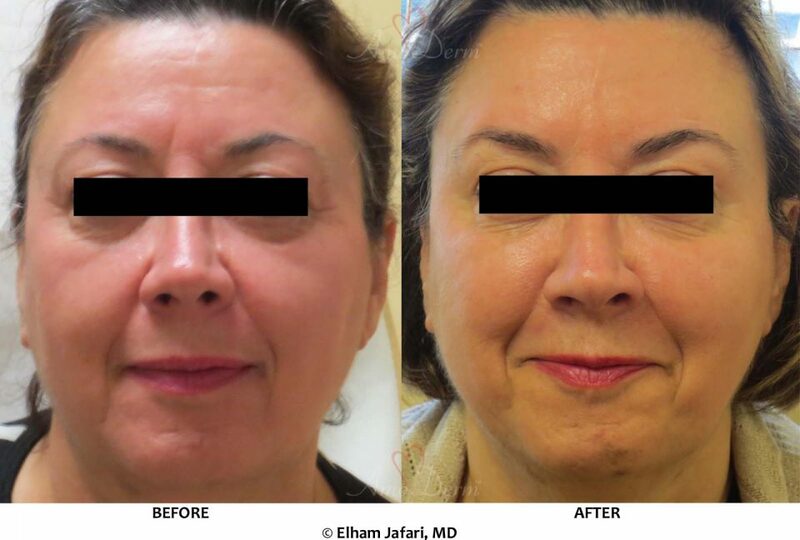 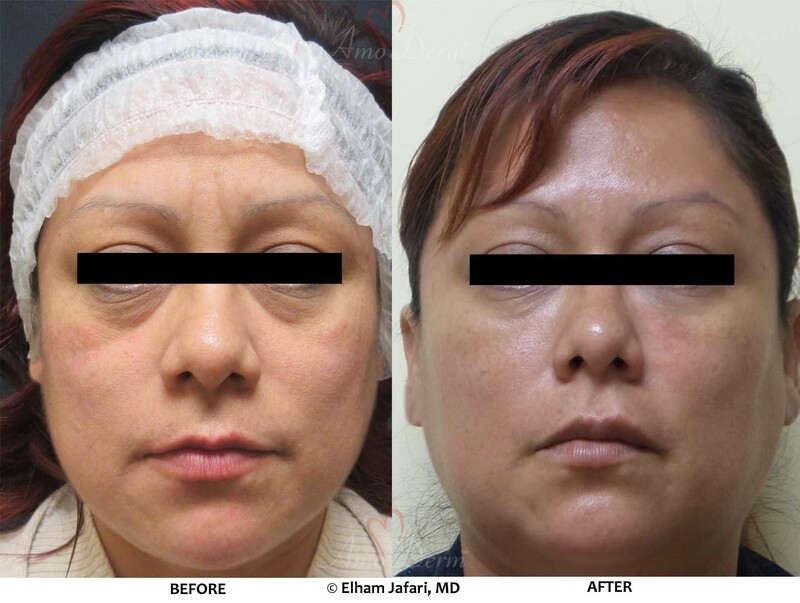 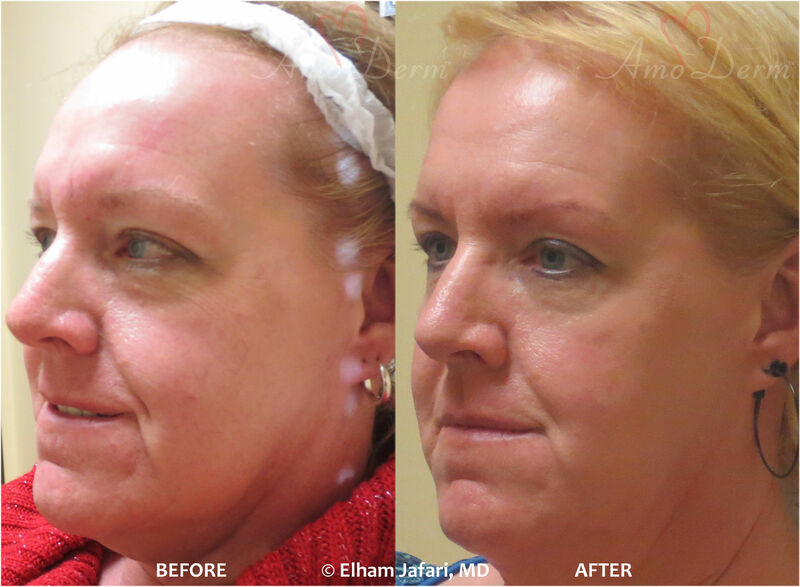 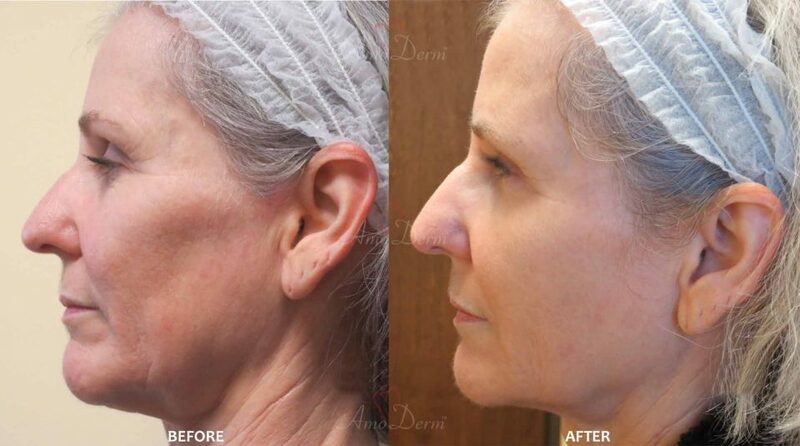 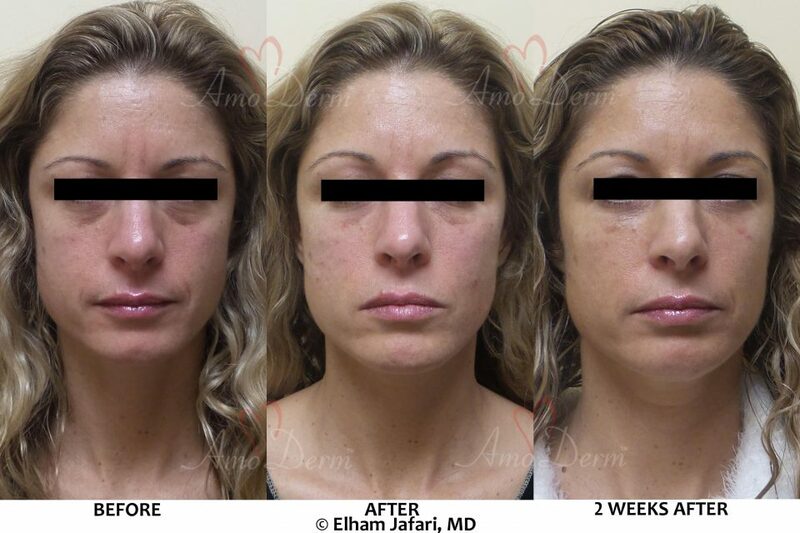 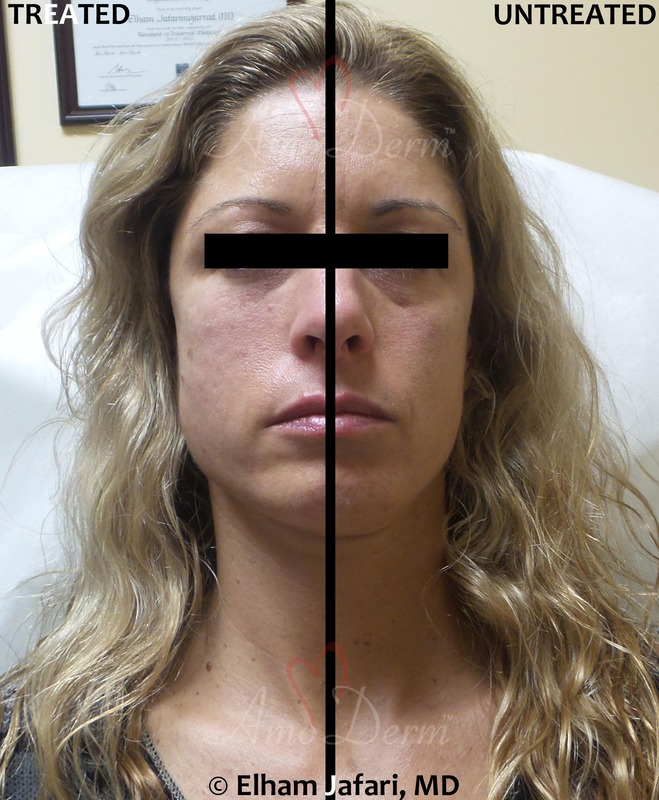 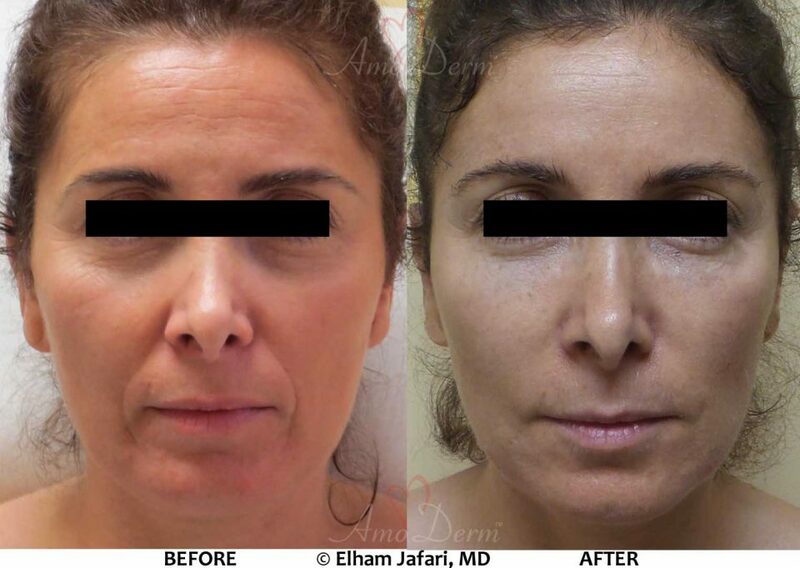 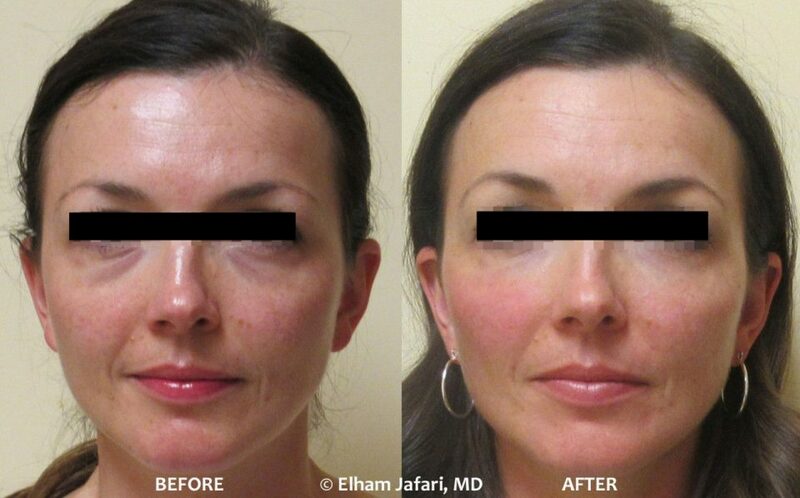 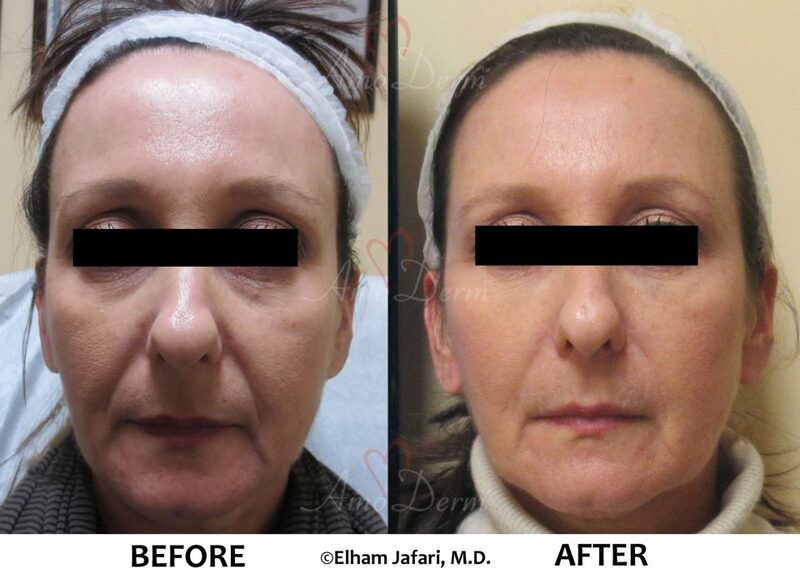 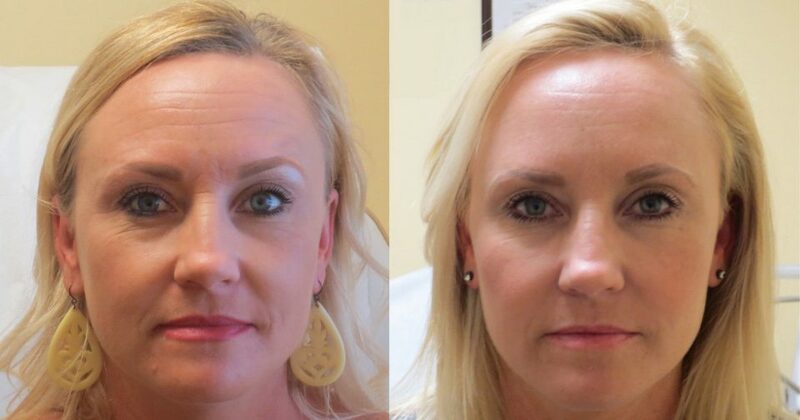 A surgical facelift is not a fix-it-all magic bullet that will take care of everything. 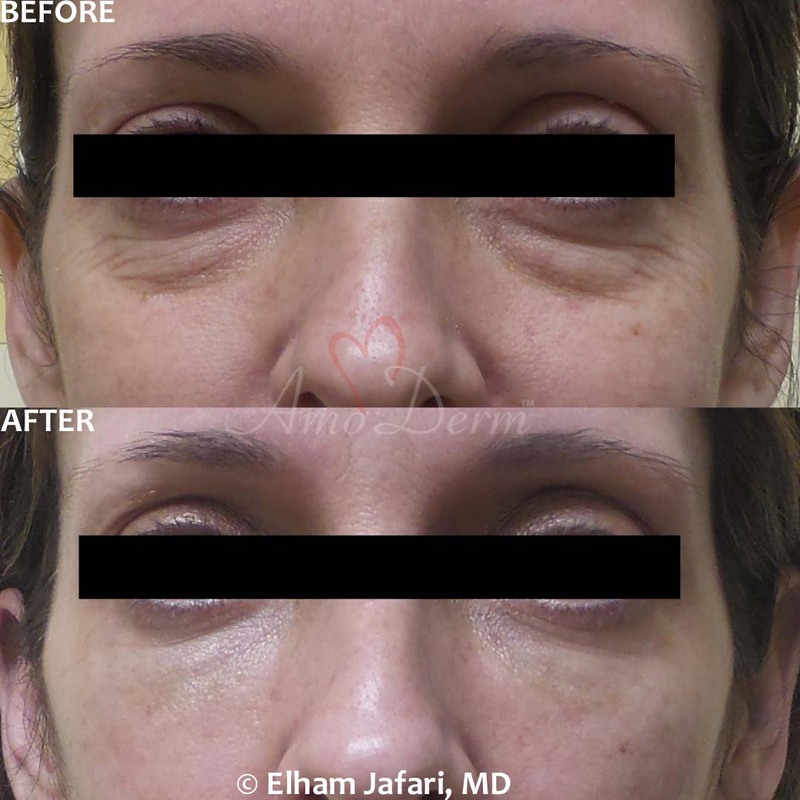 Most importantly, it does little to address the key underlying issue of aging, which is the volume loss. 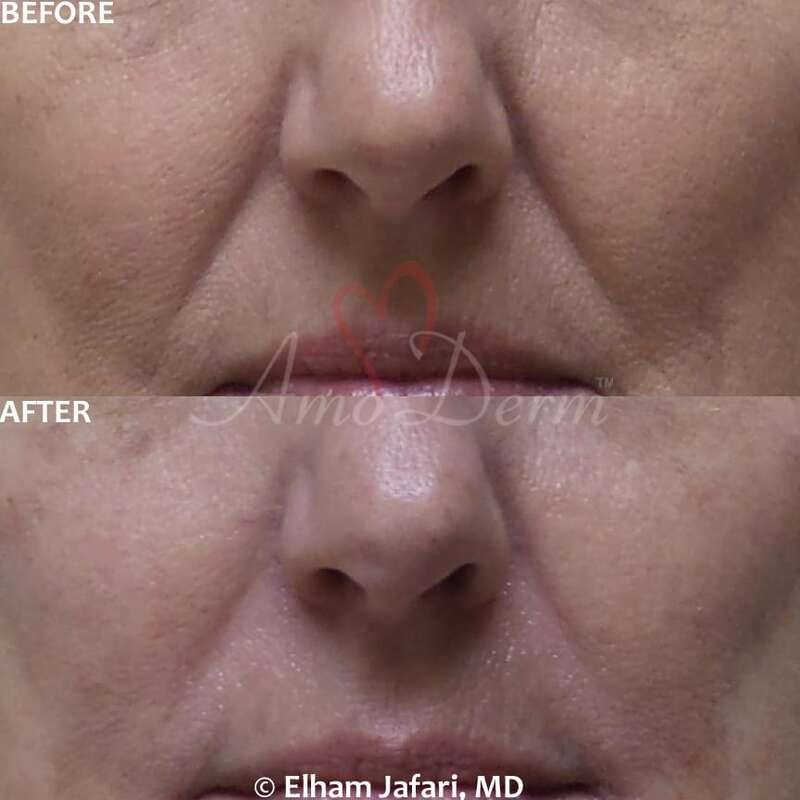 To restore volume and treat common conditions such as hollow and dark circles under the eyes, collapsed temples and sagging cheeks and jowls, nothing comes close to dermal fillers and no amount of surgical pulling of the skin can fix the problems. 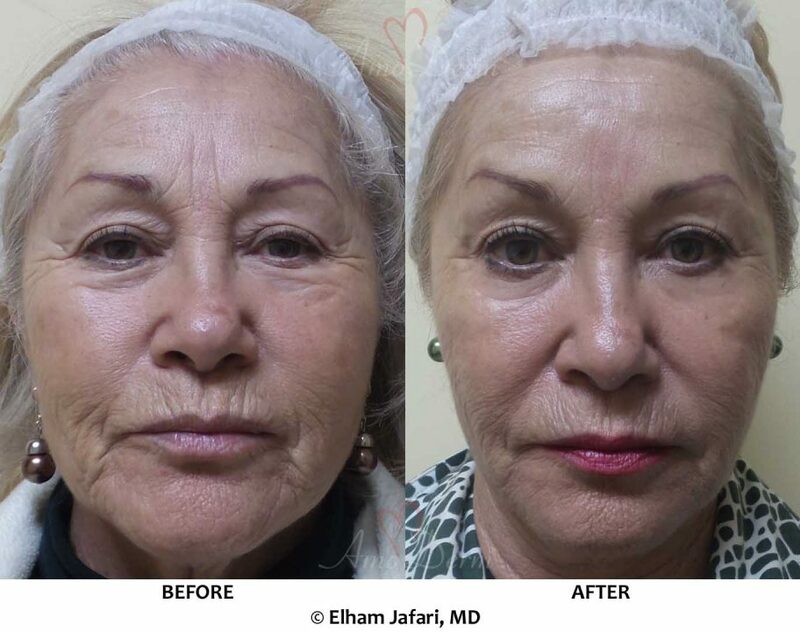 We believe that surgical facelift has great value in selected patients with sagging skin, but for a far greater number of patients, your doctor can achieve better results with a combination of fillers, Botox, PDO threads (and lasers) in a liquid facelift procedure. 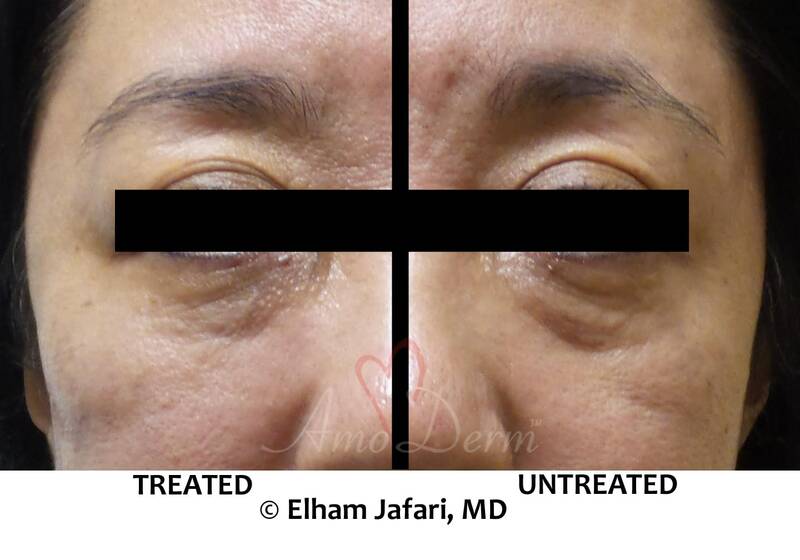 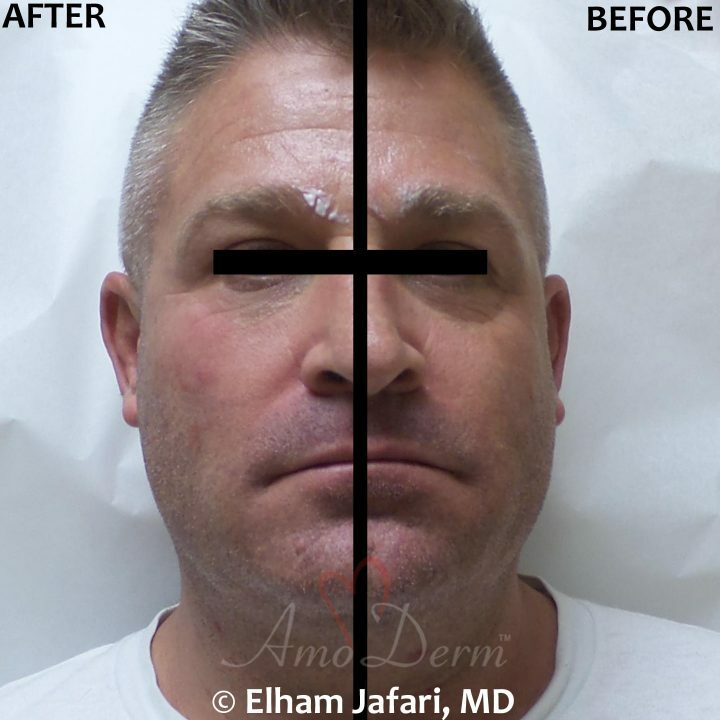 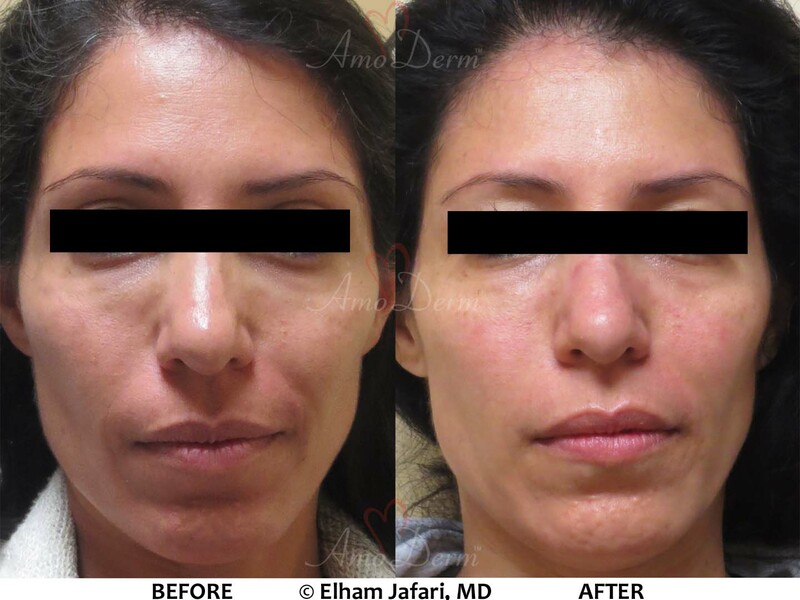 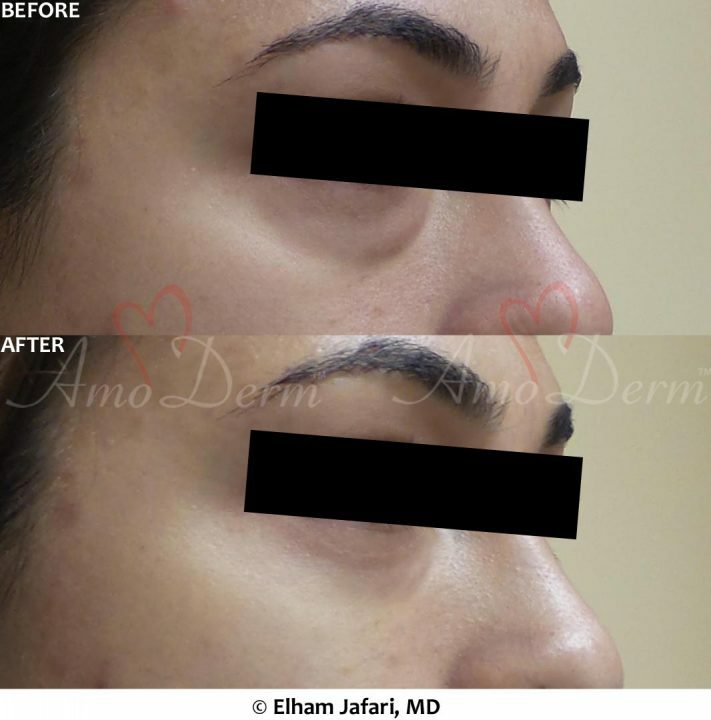 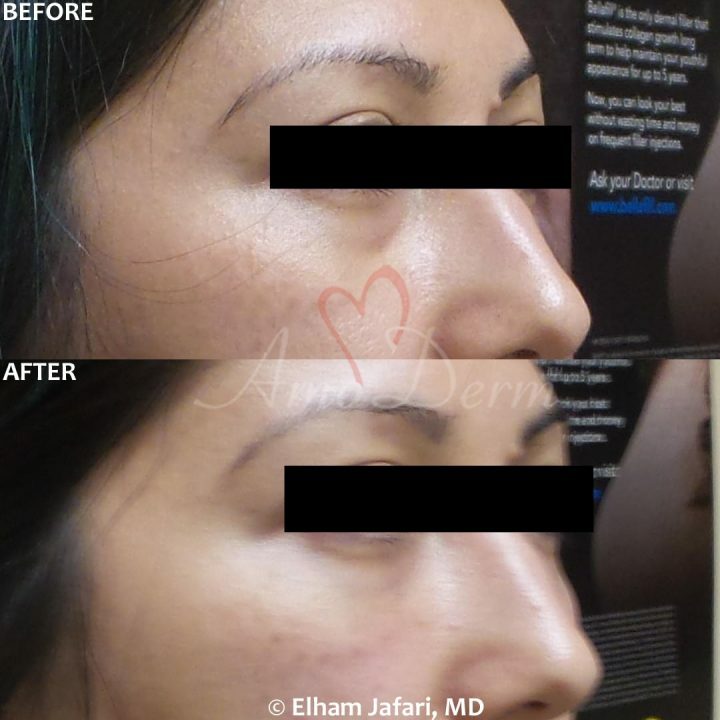 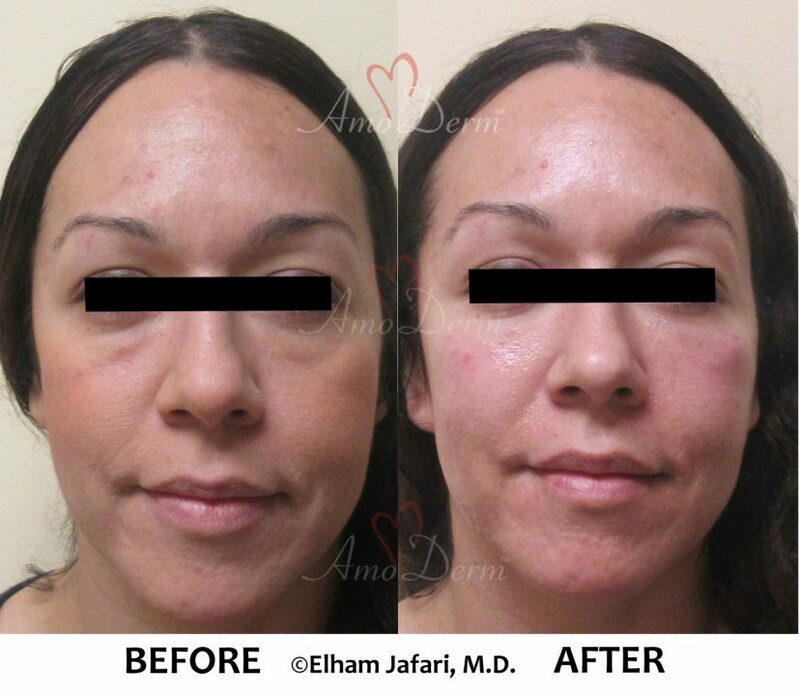 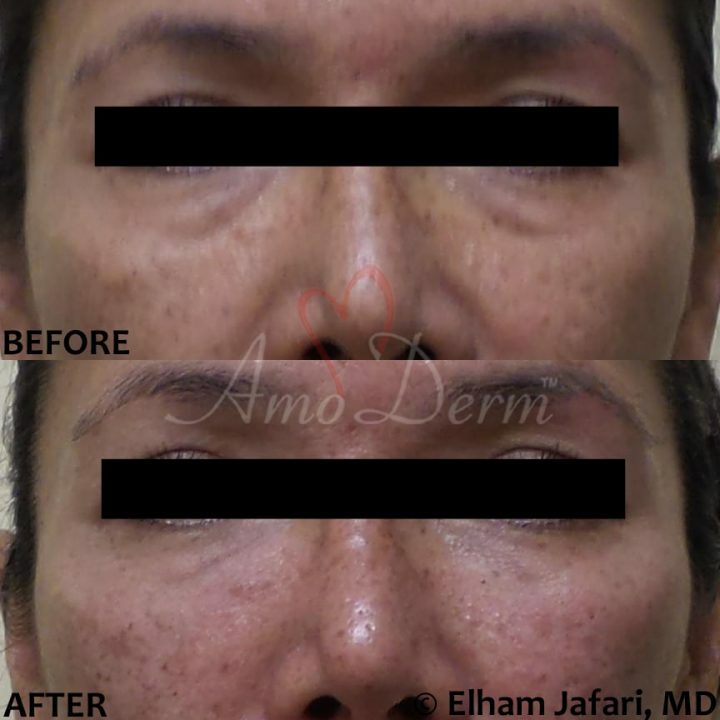 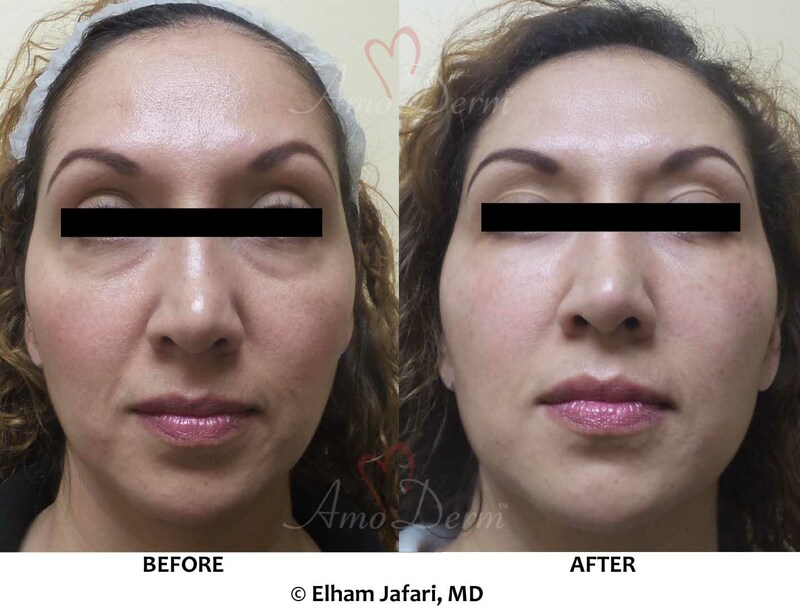 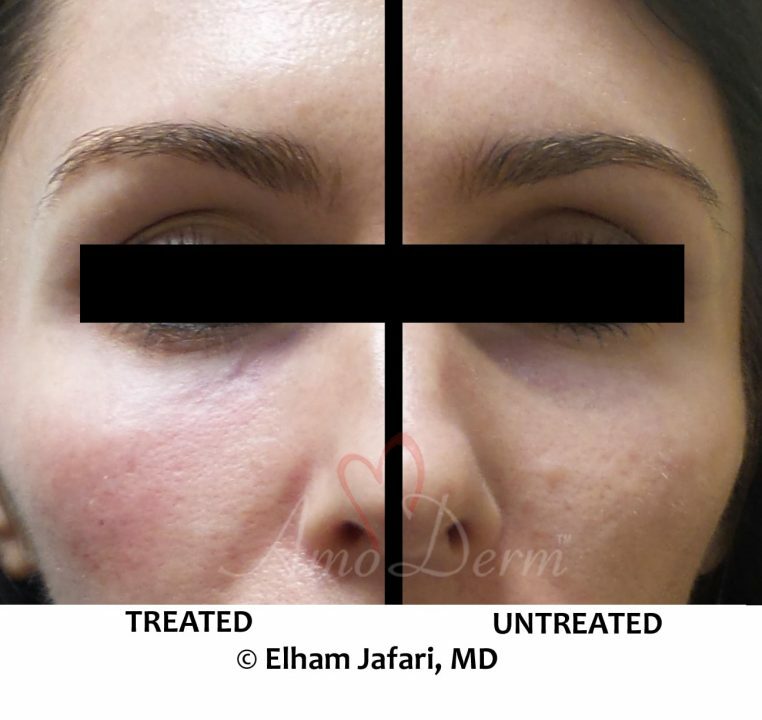 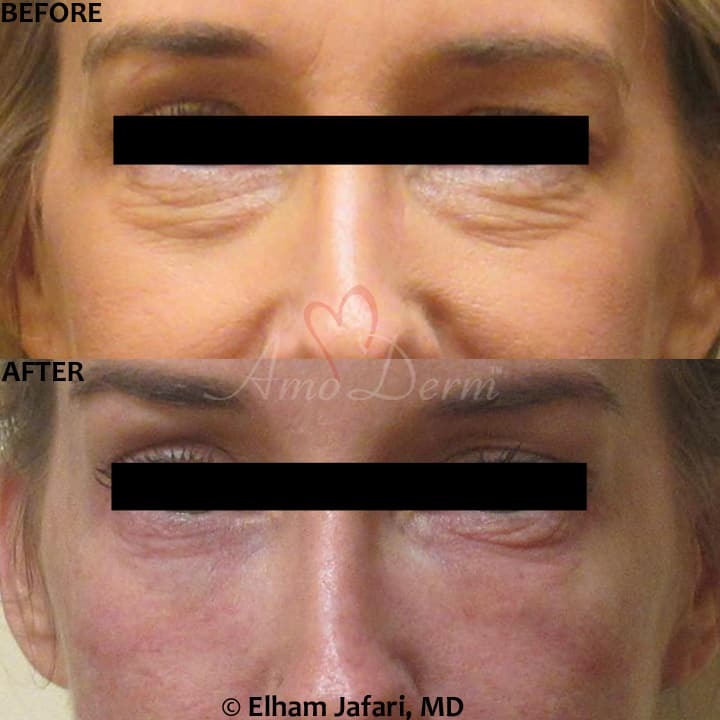 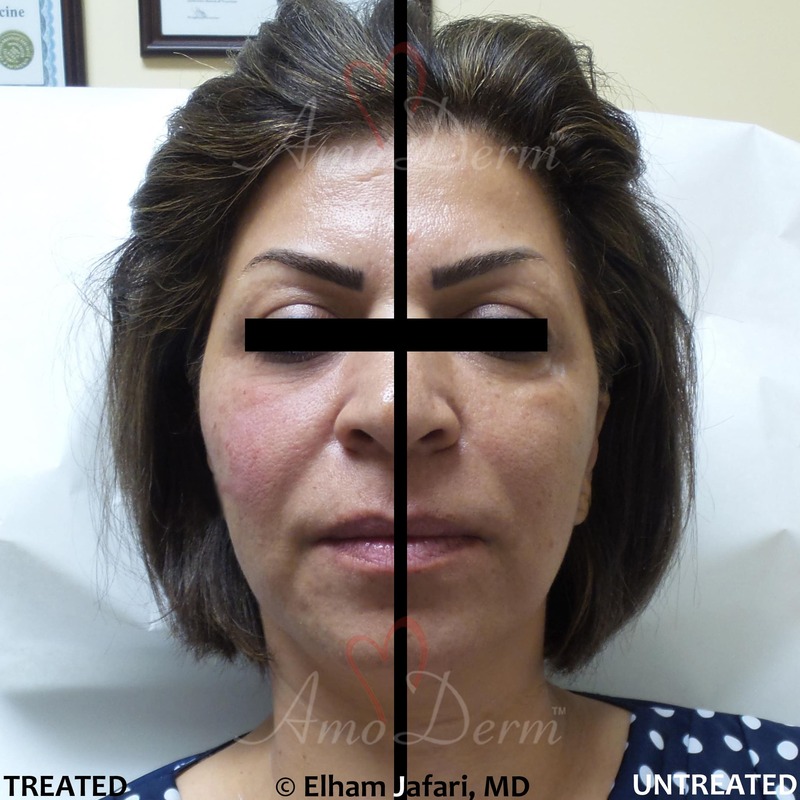 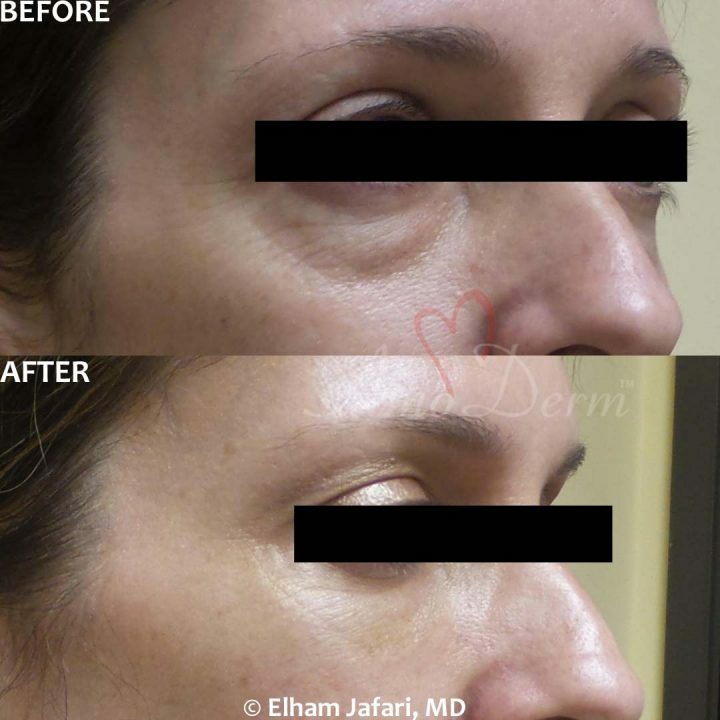 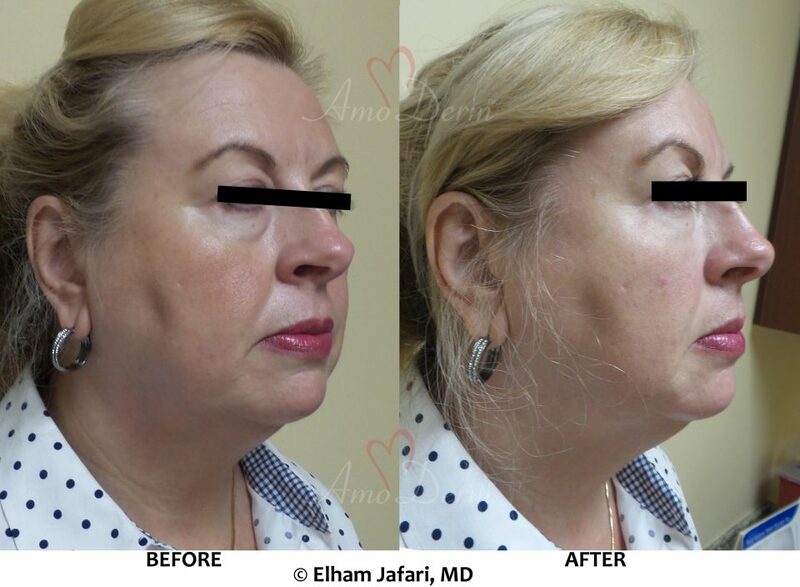 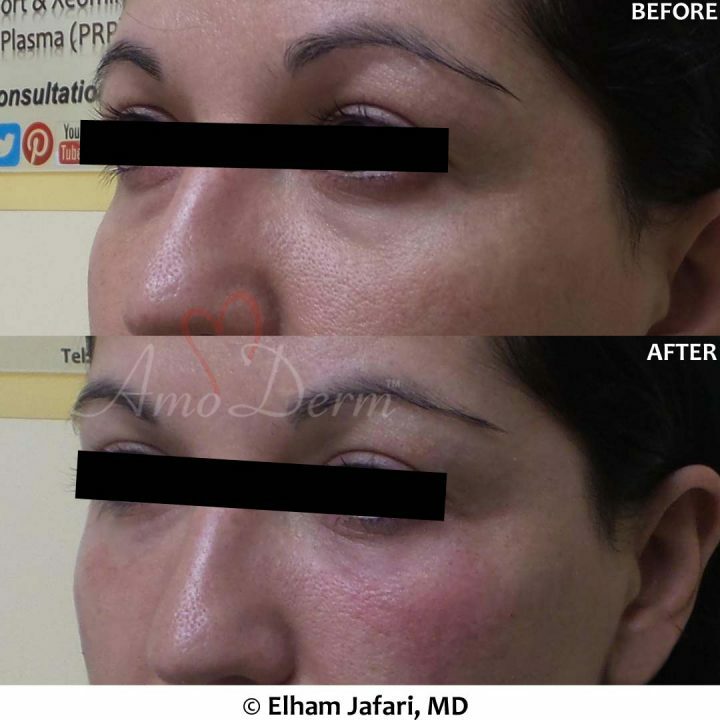 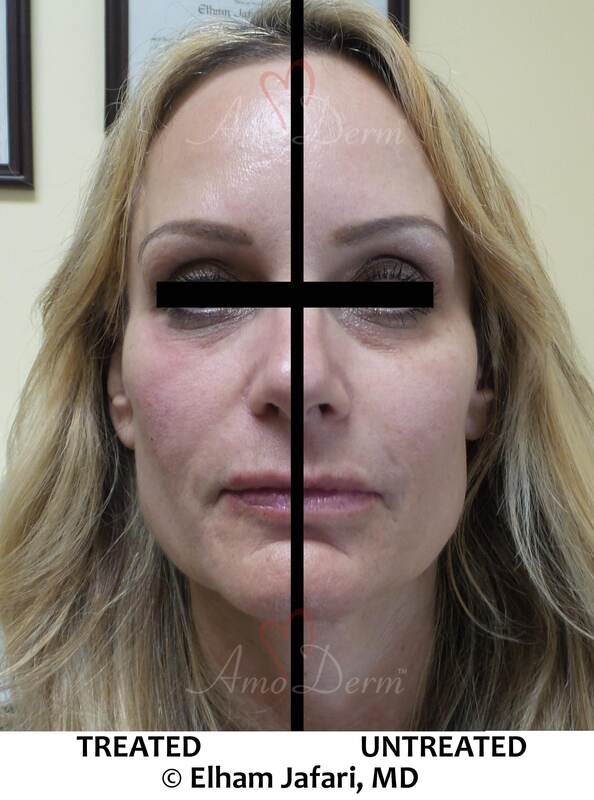 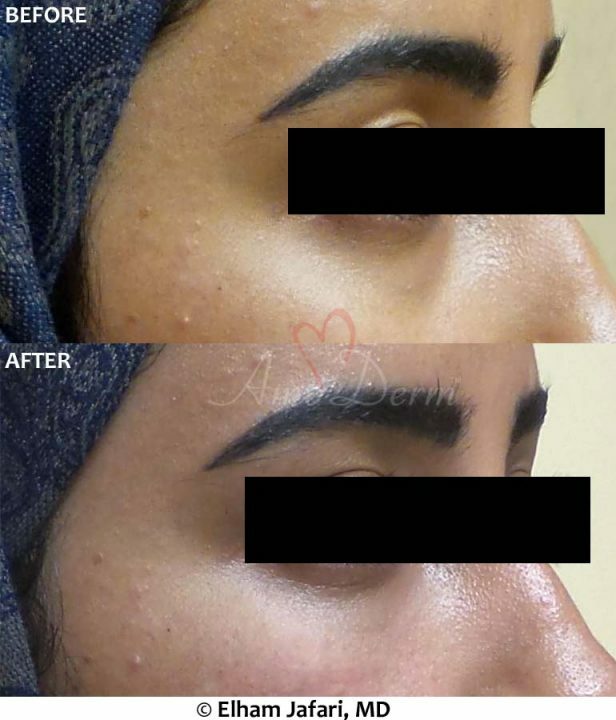 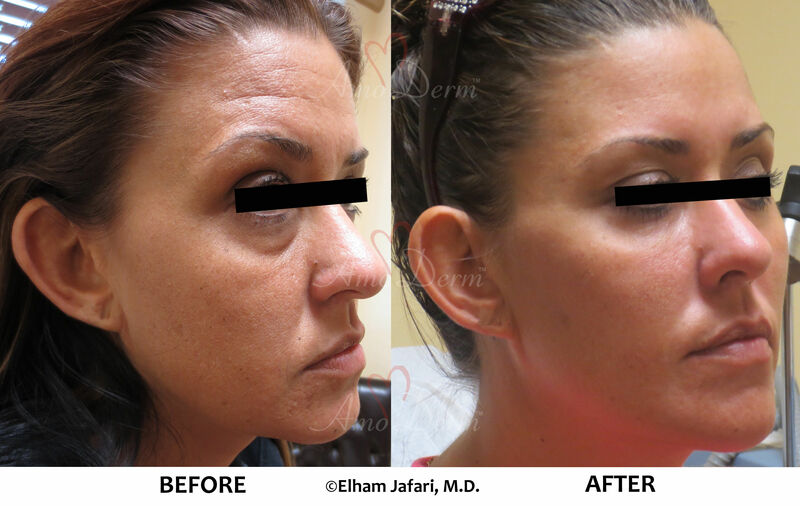 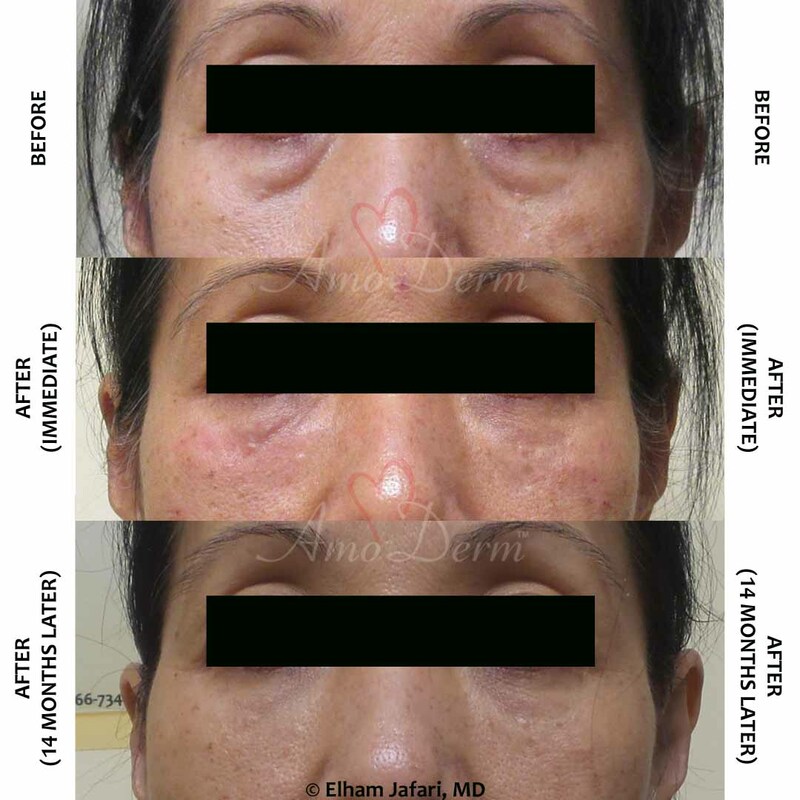 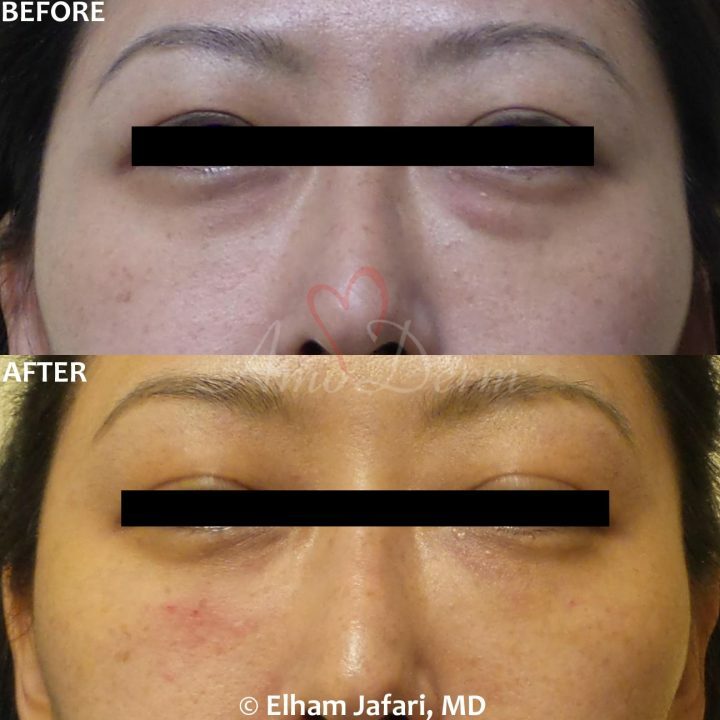 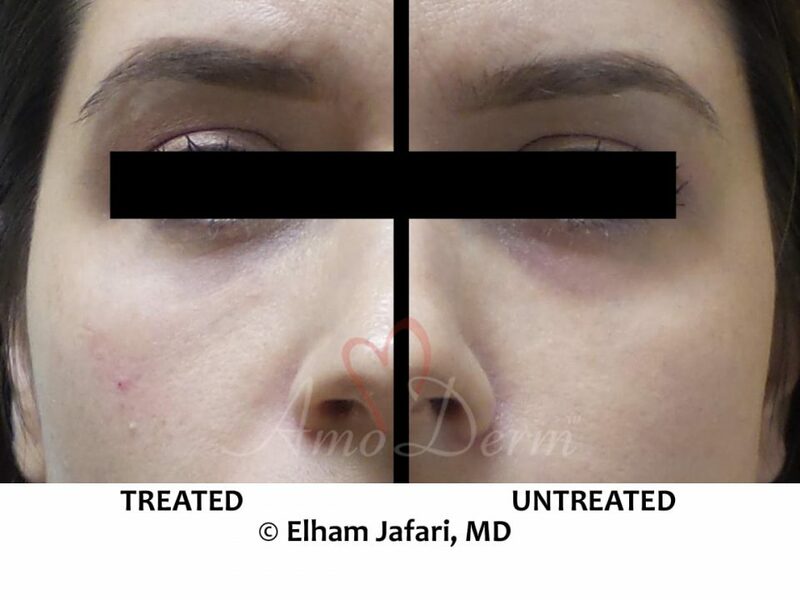 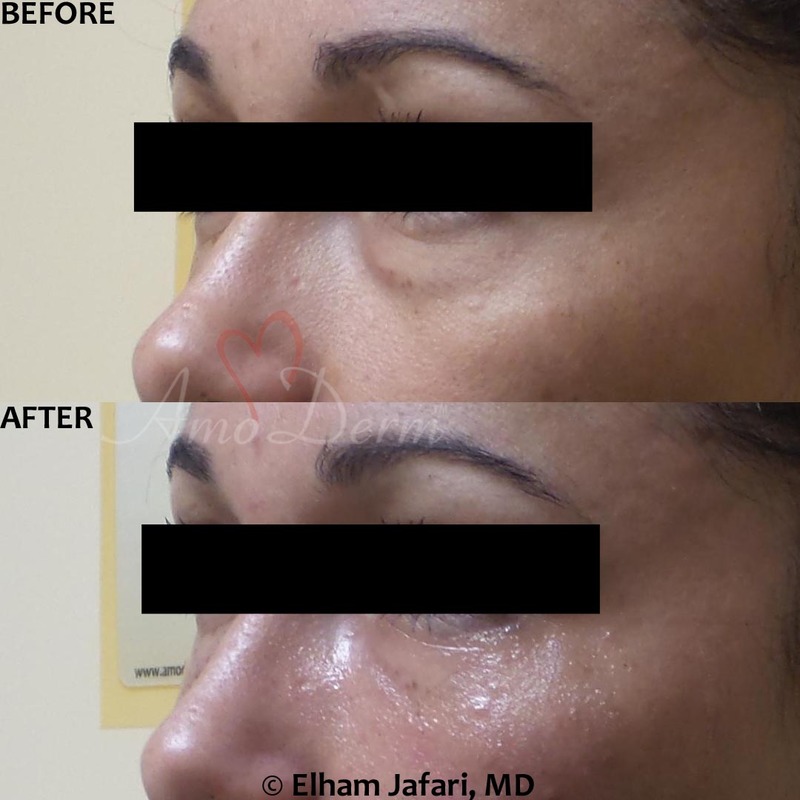 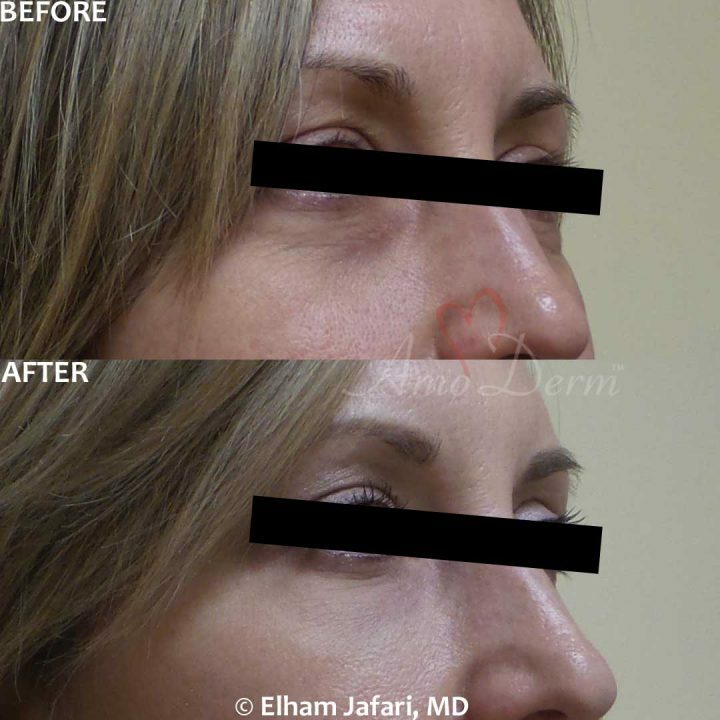 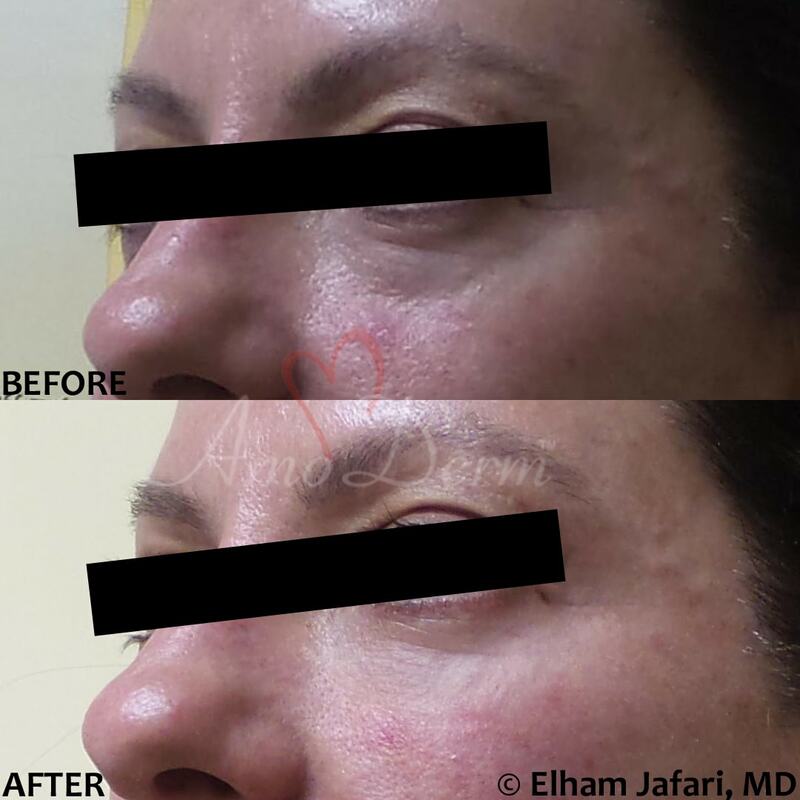 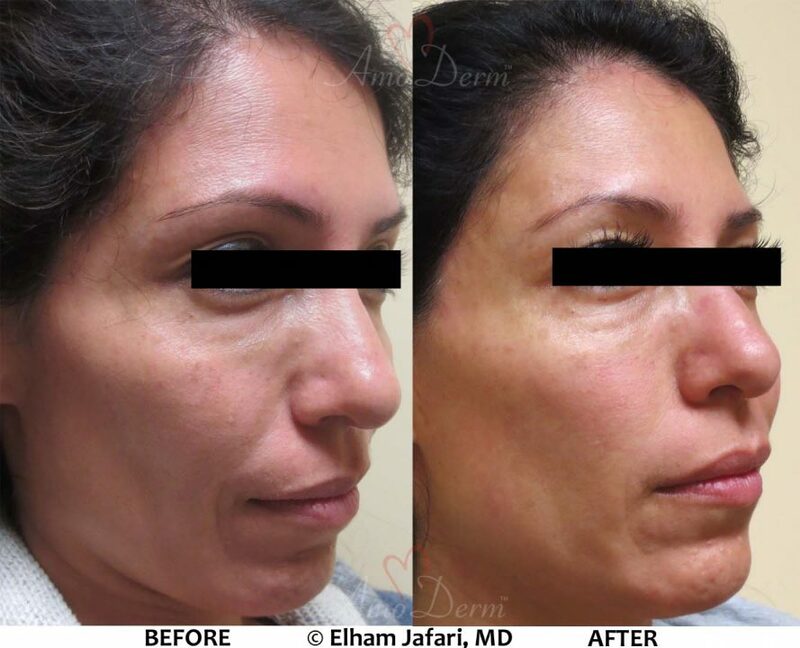 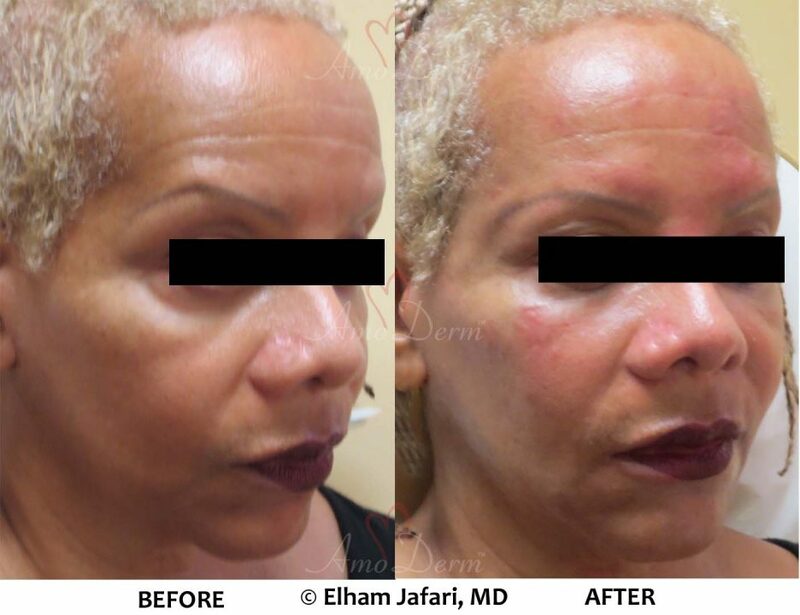 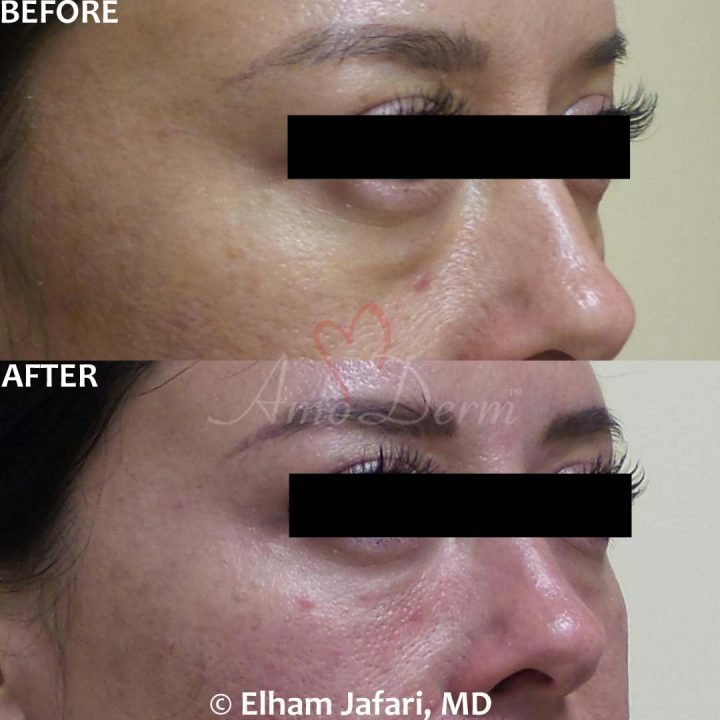 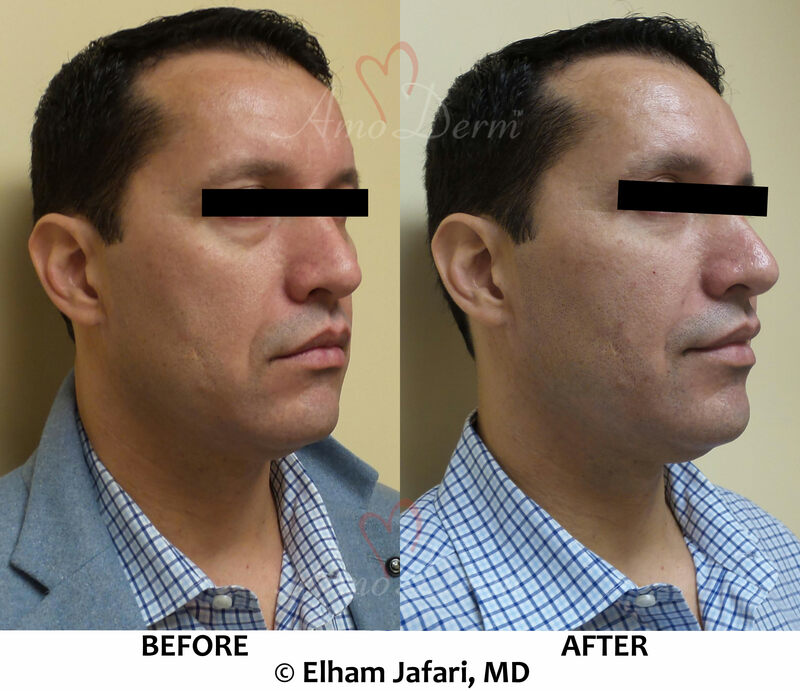 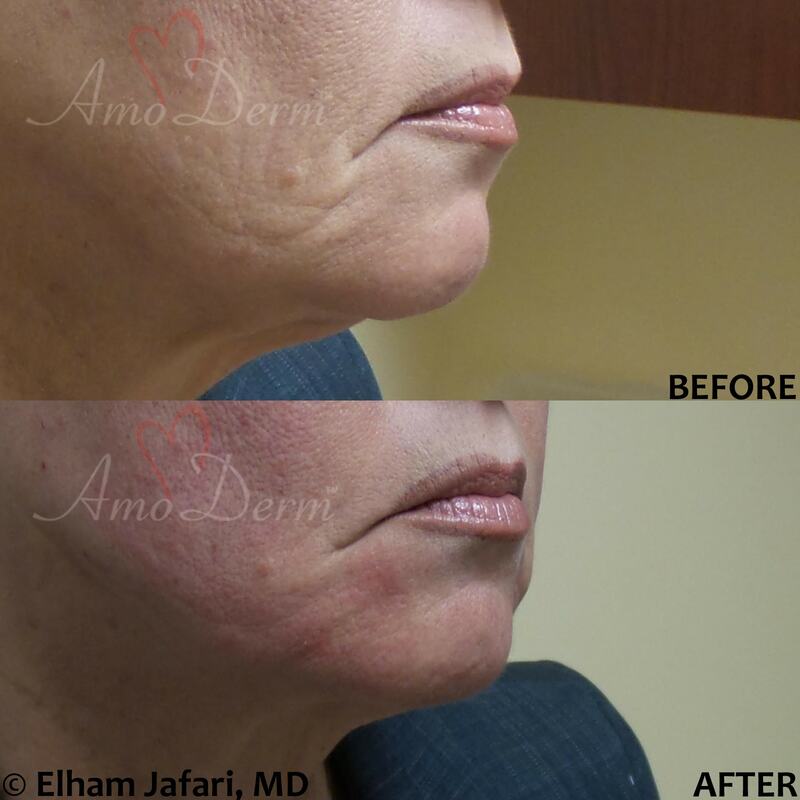 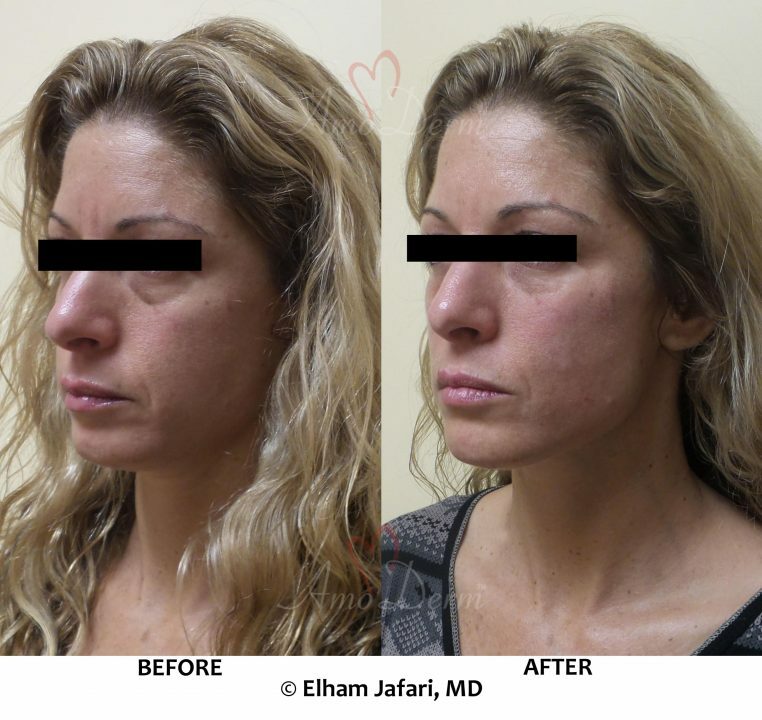 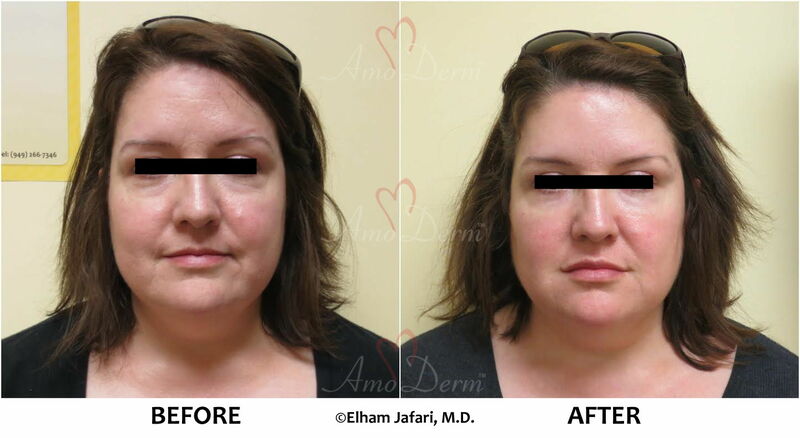 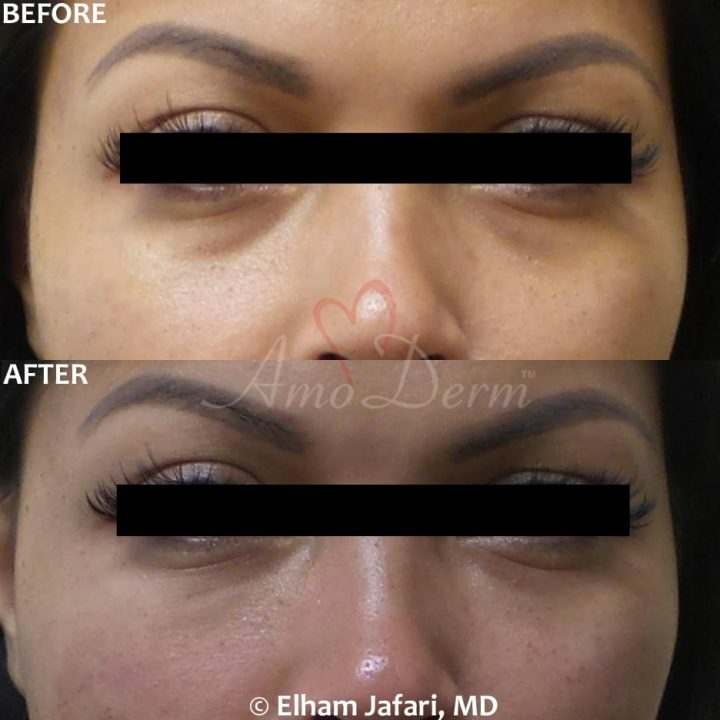 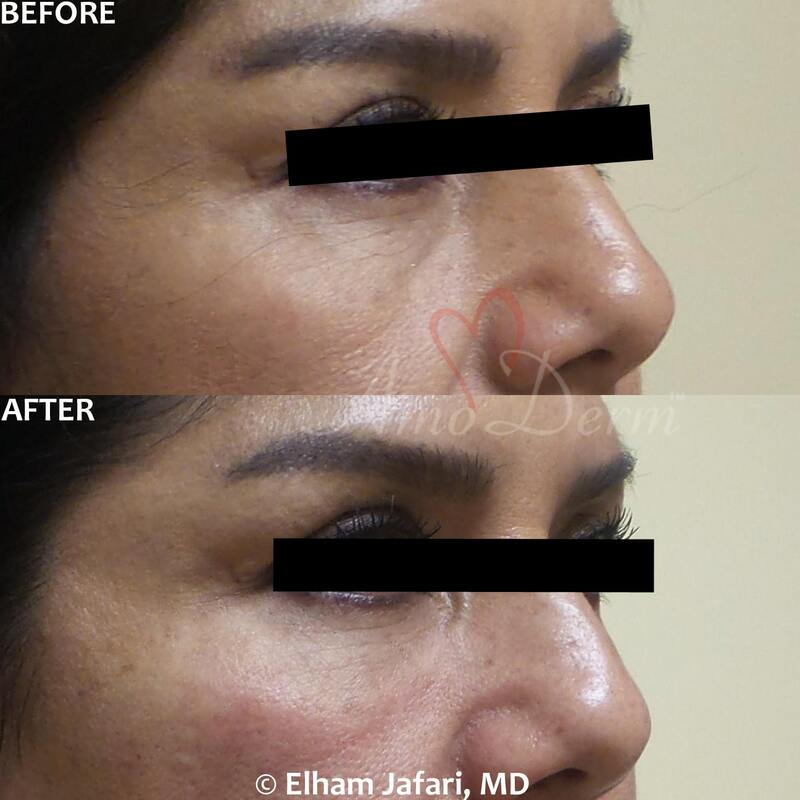 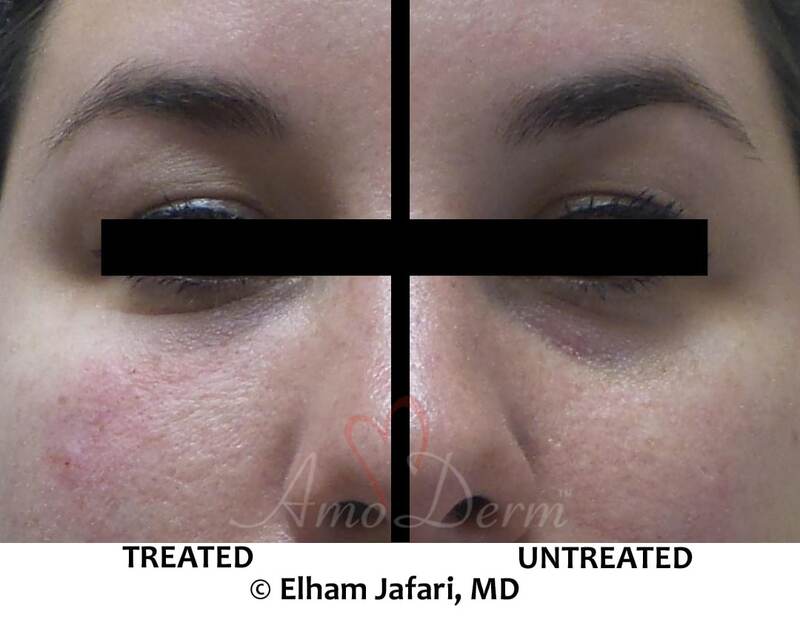 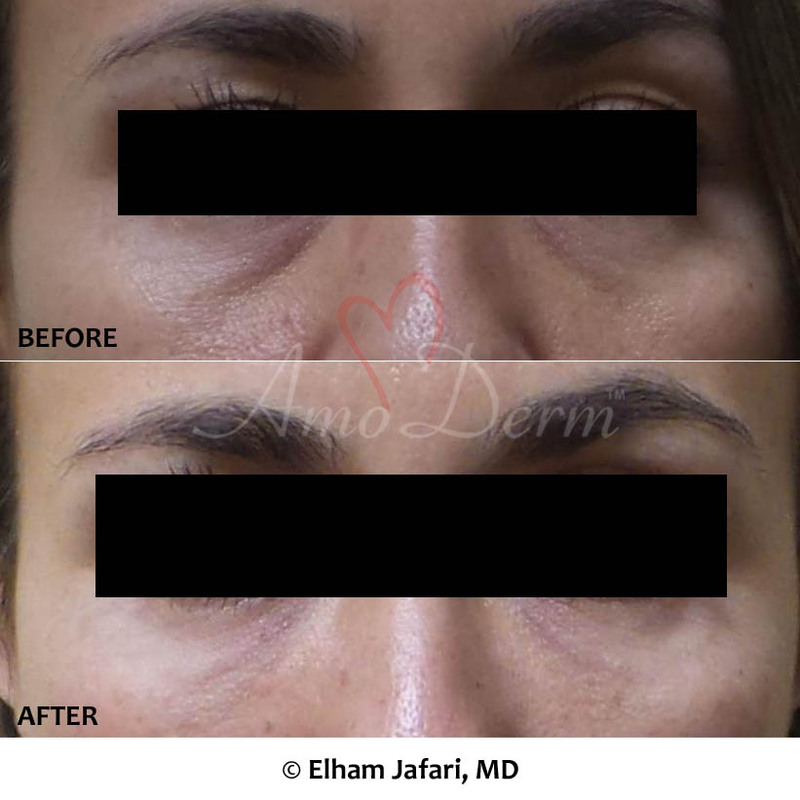 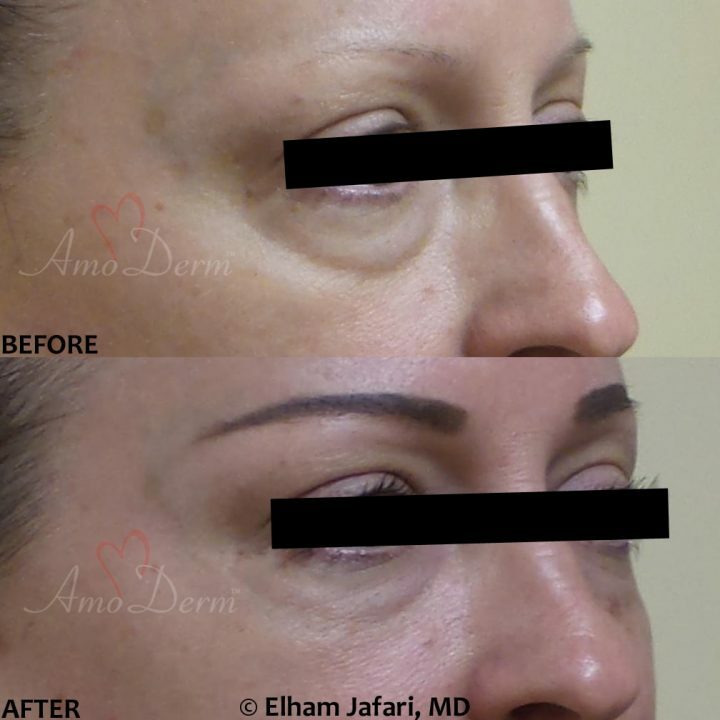 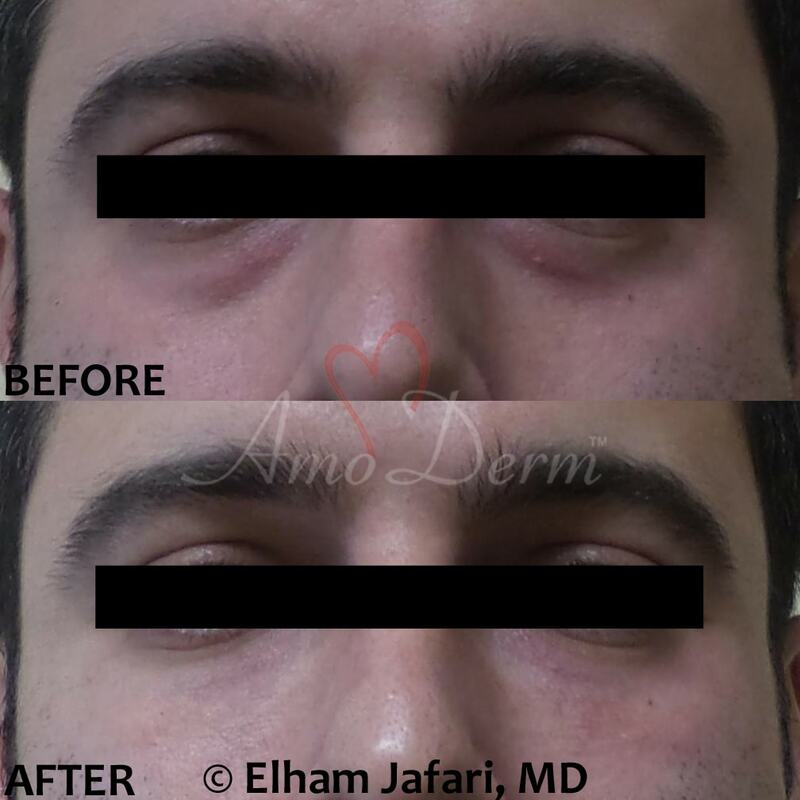 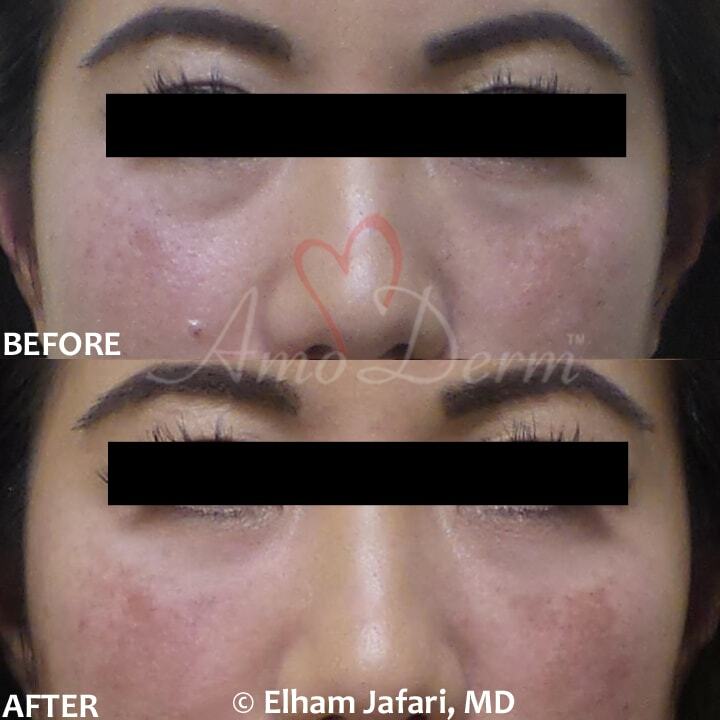 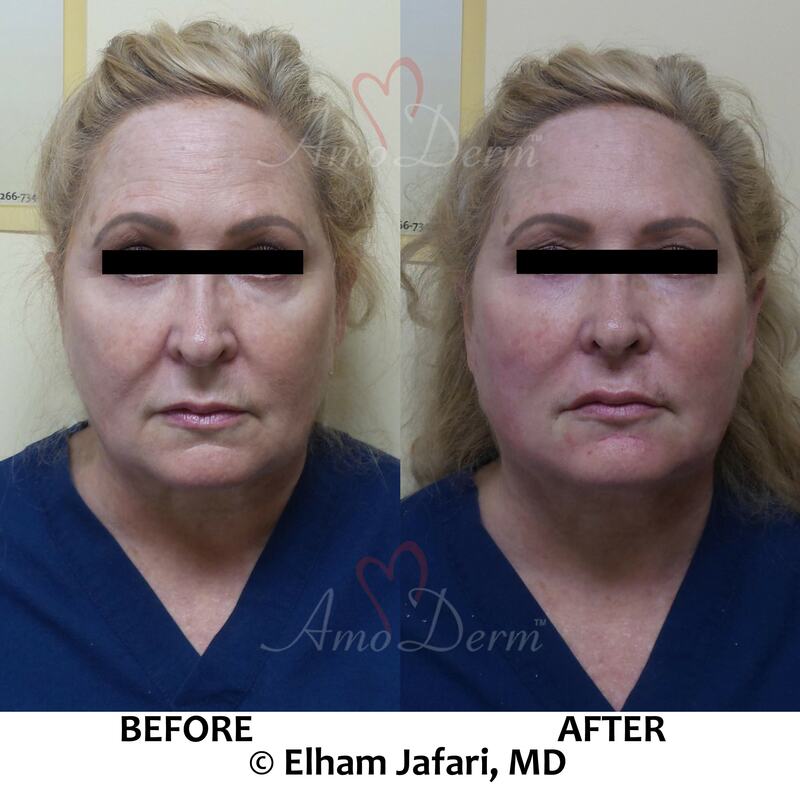 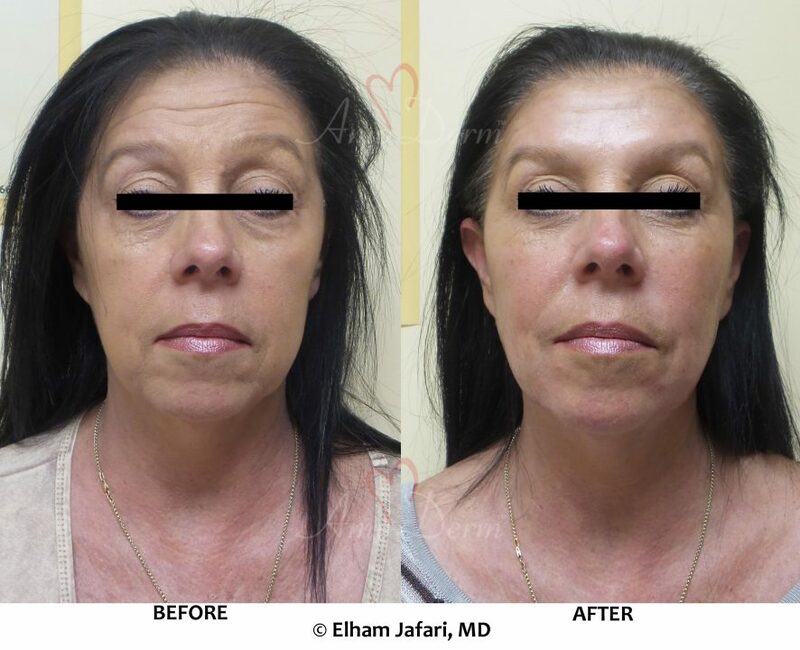 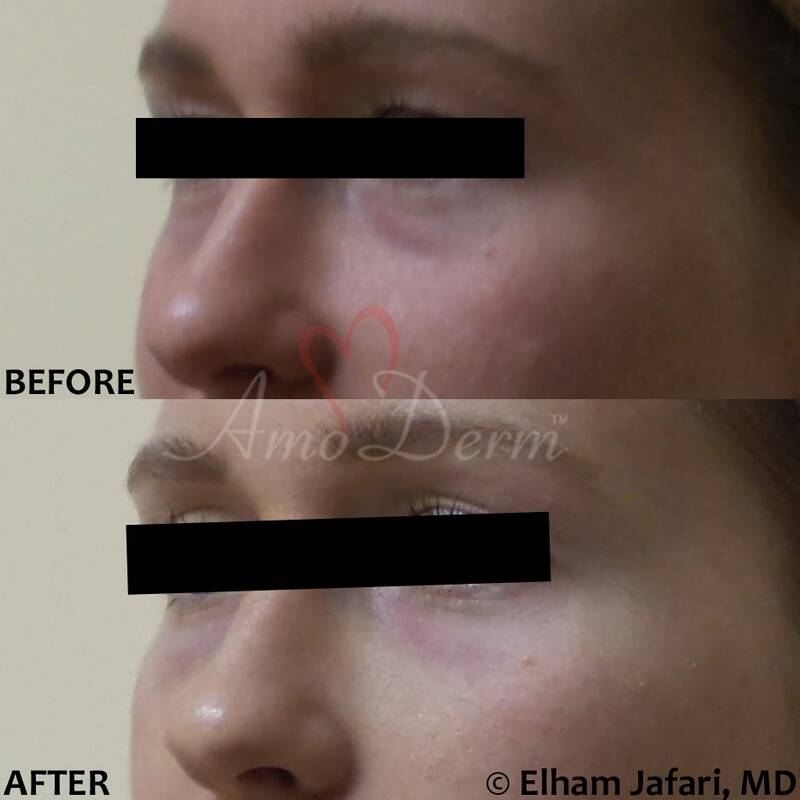 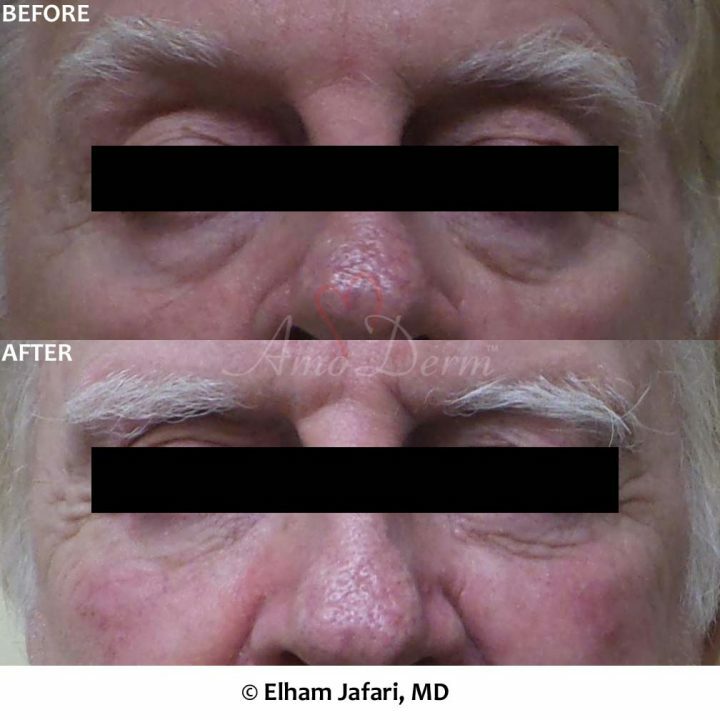 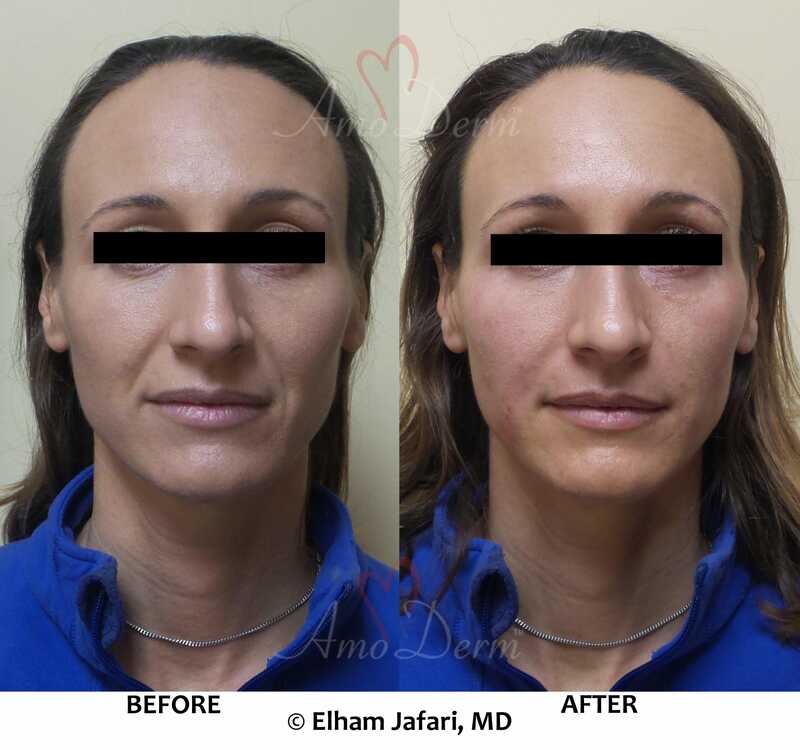 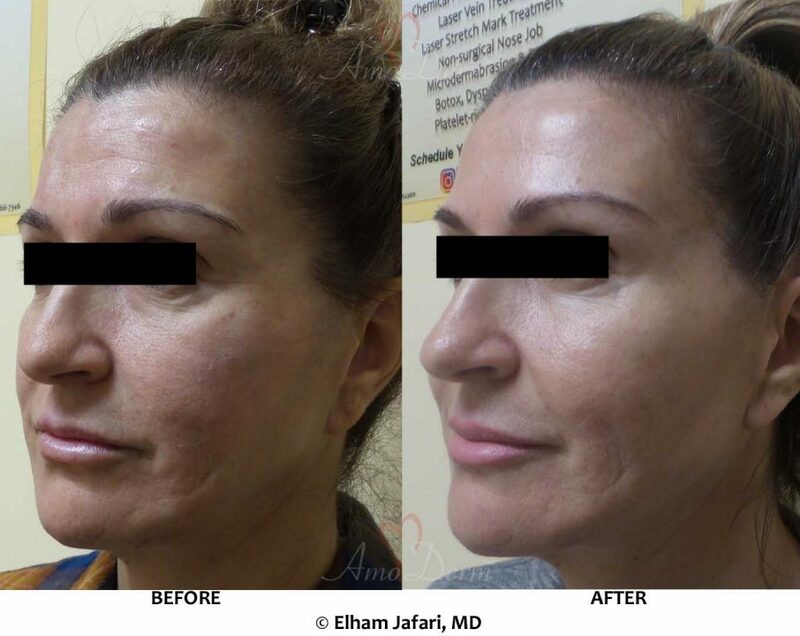 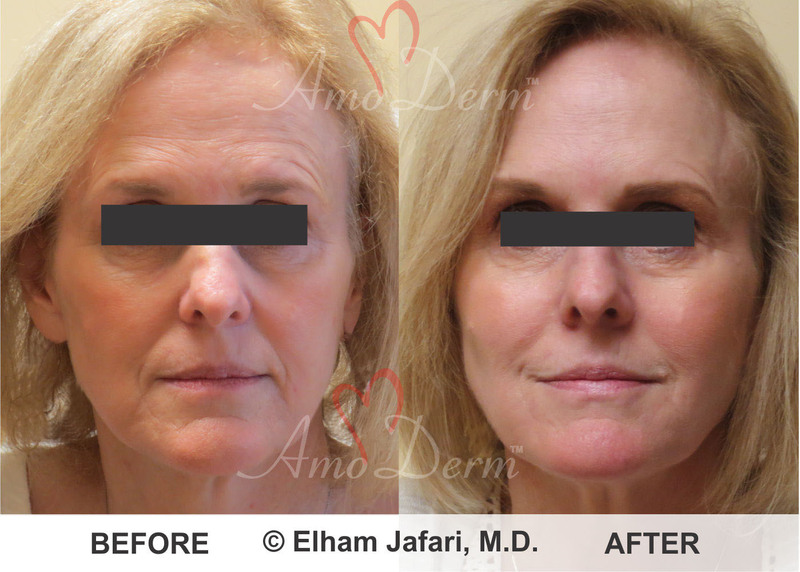 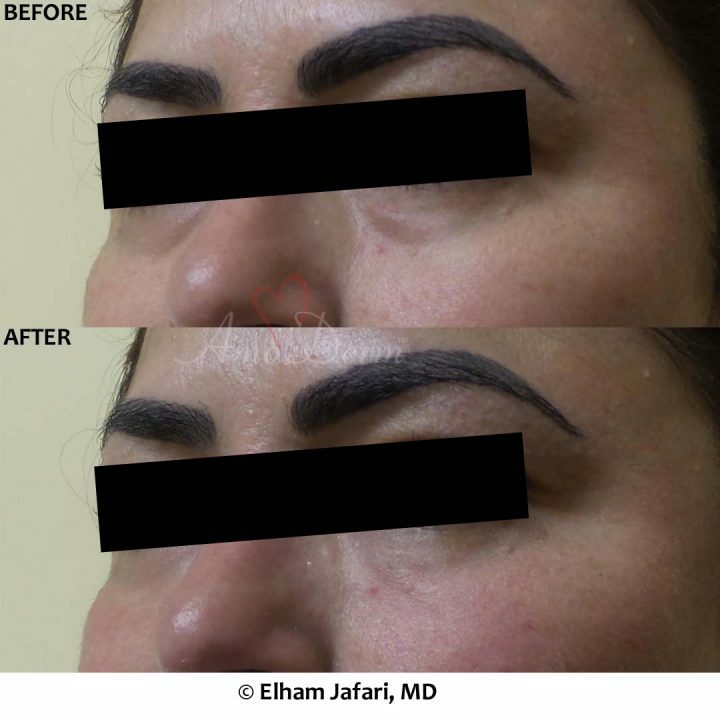 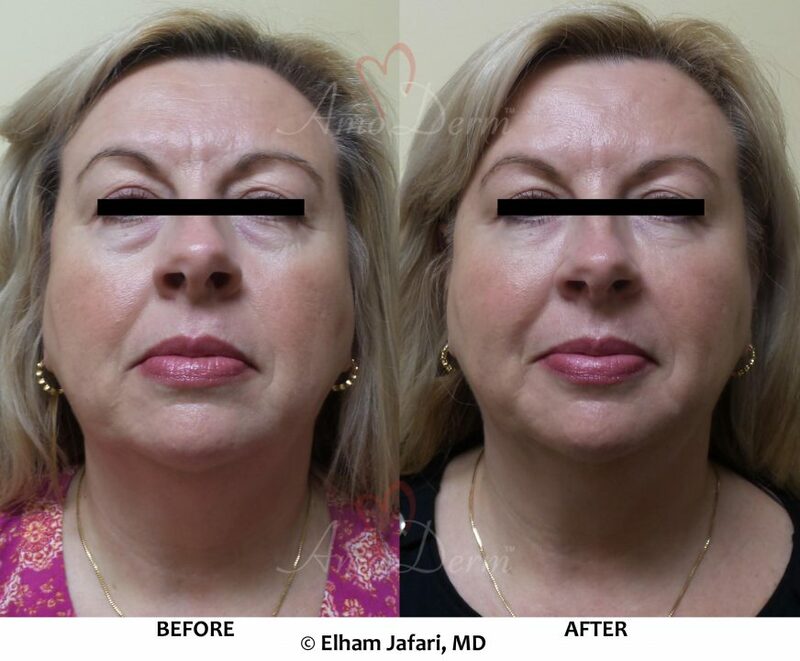 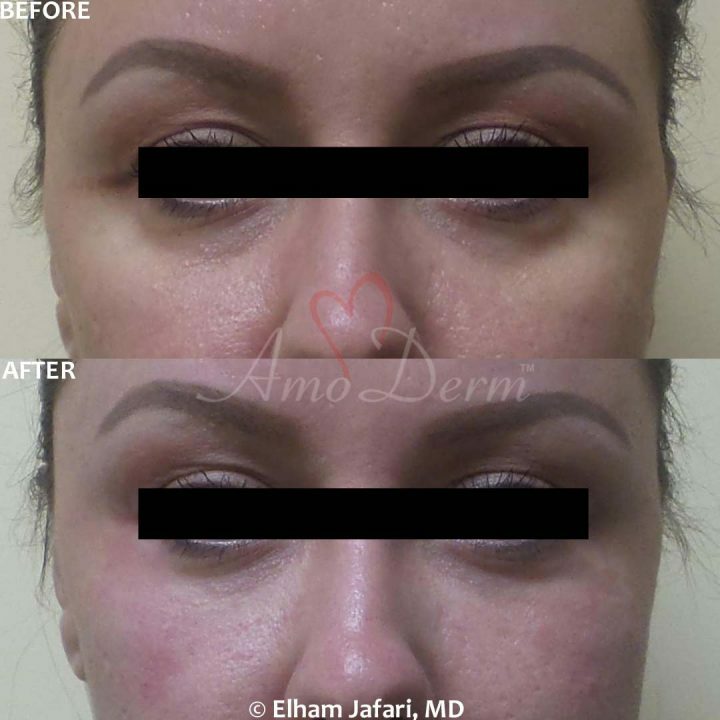 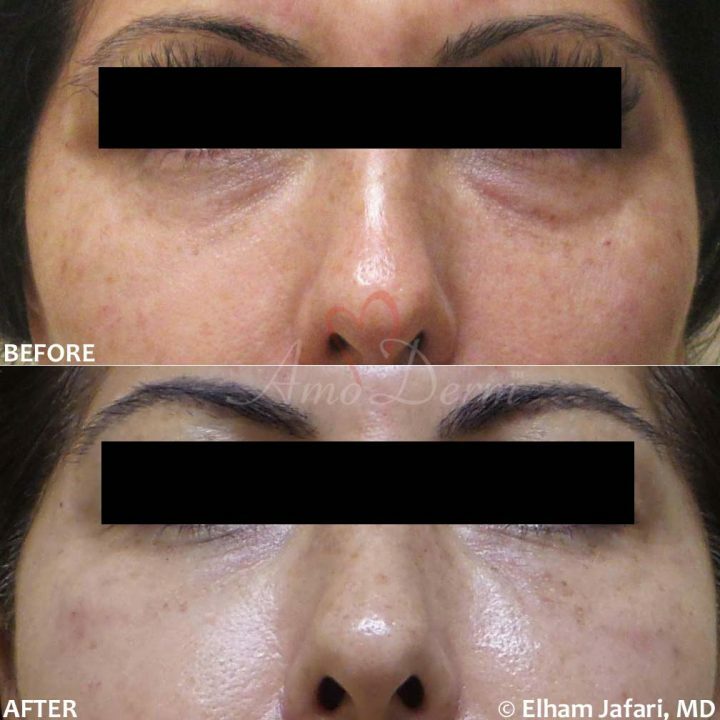 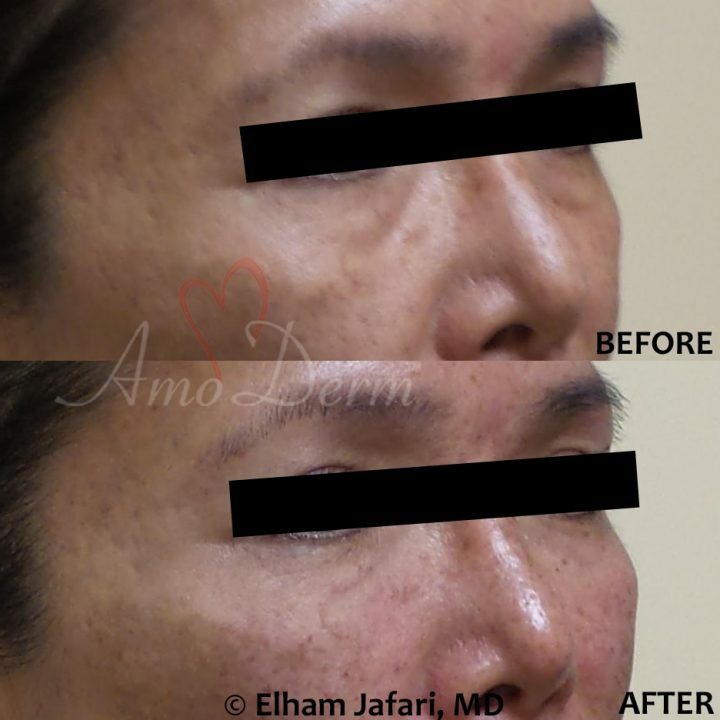 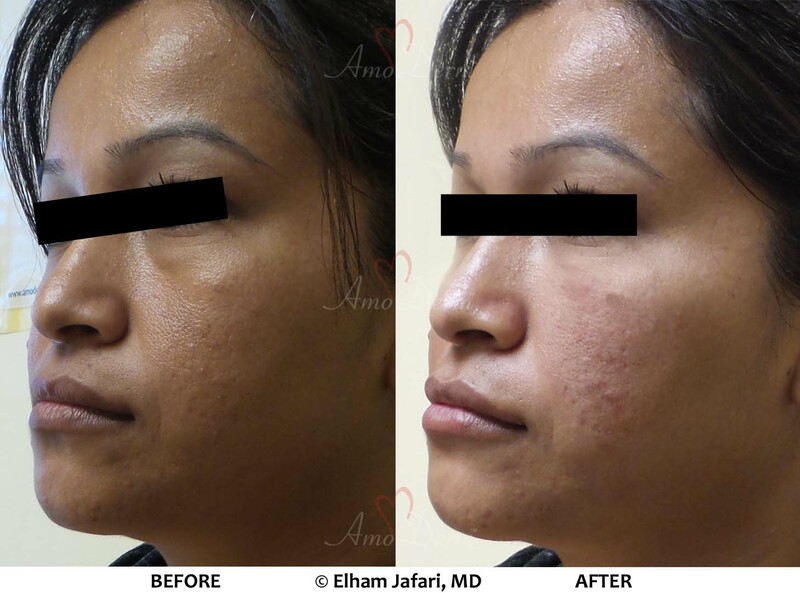 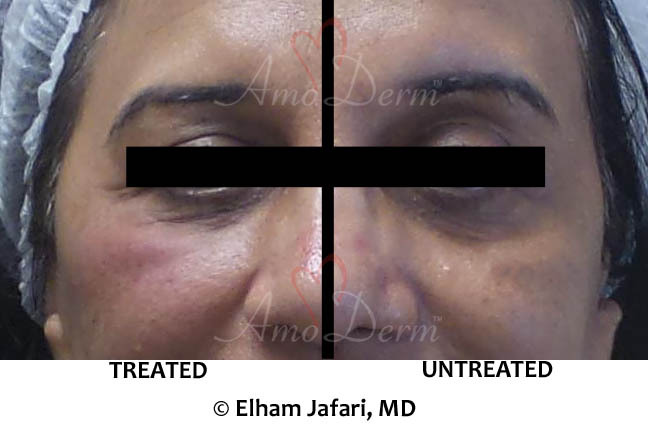 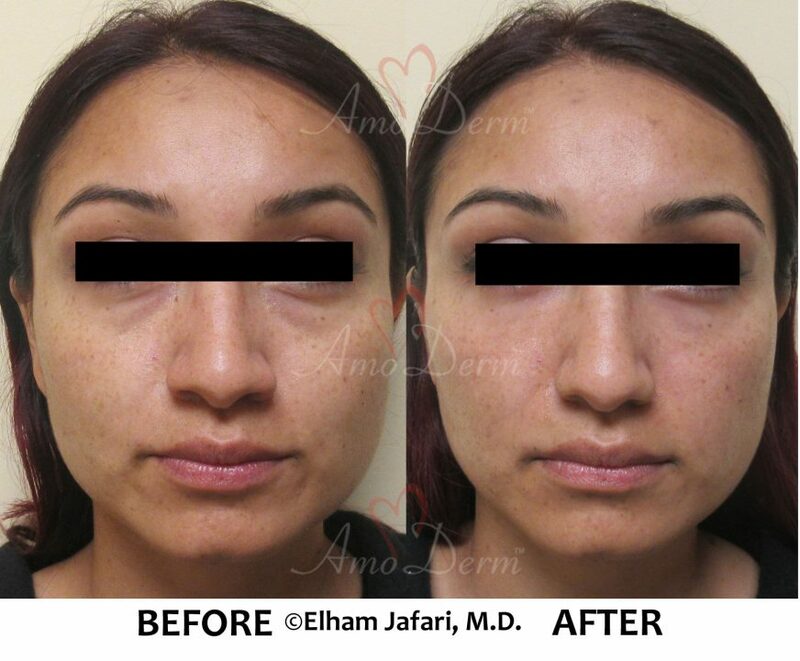 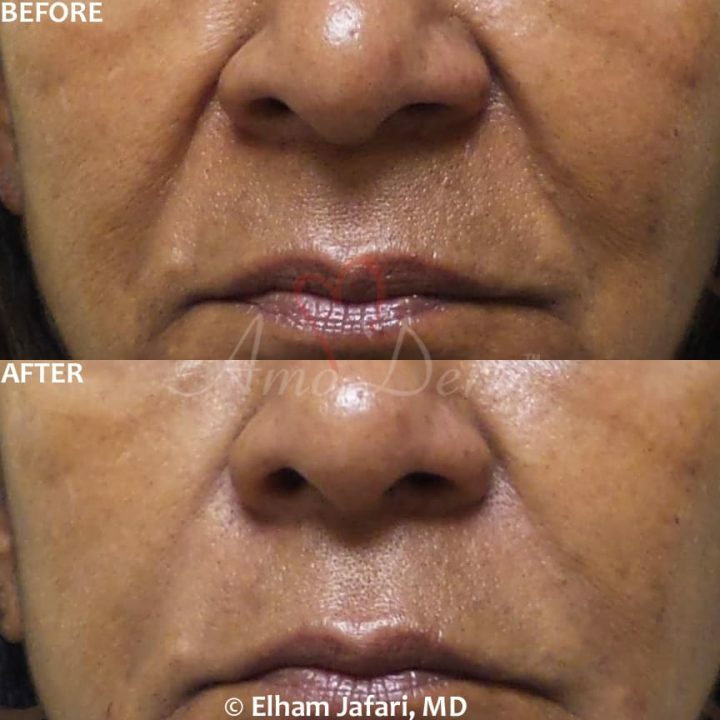 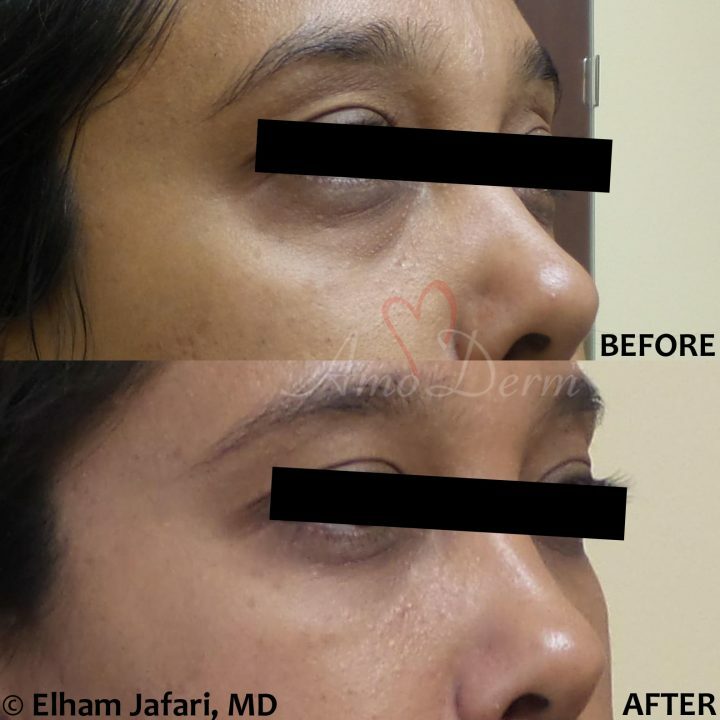 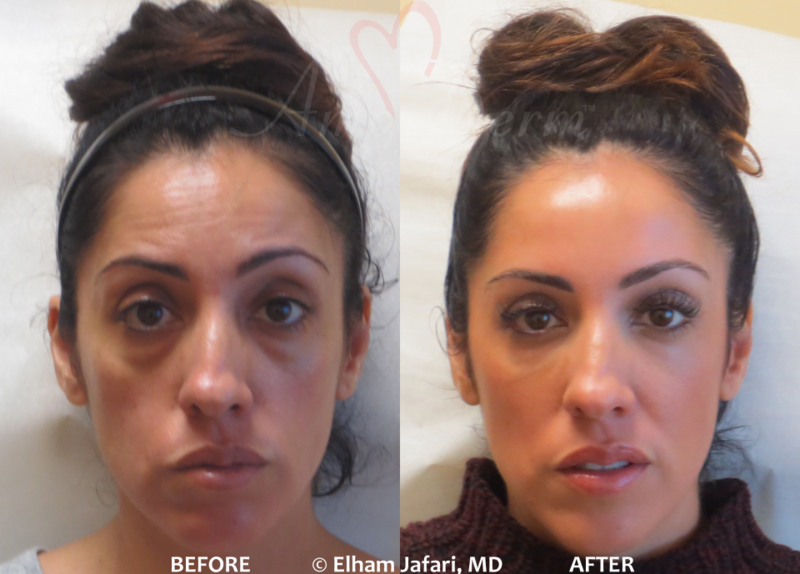 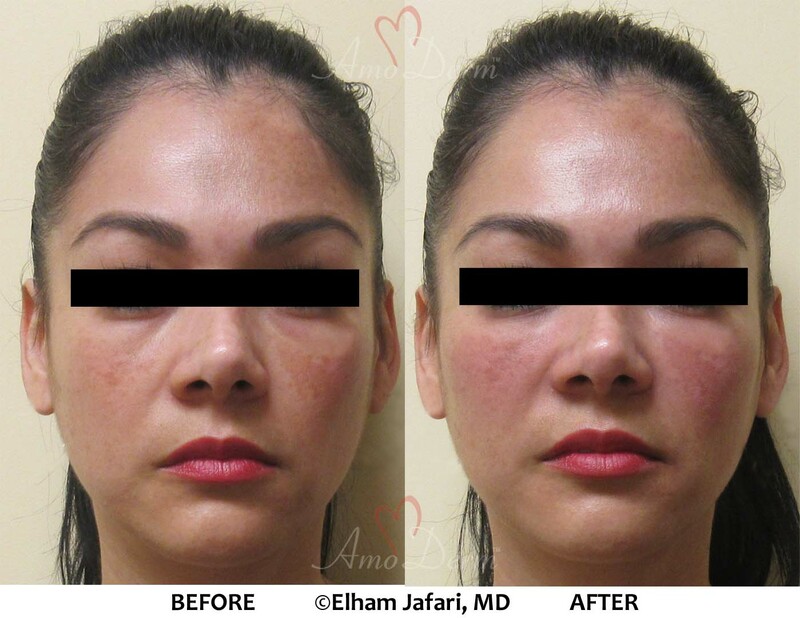 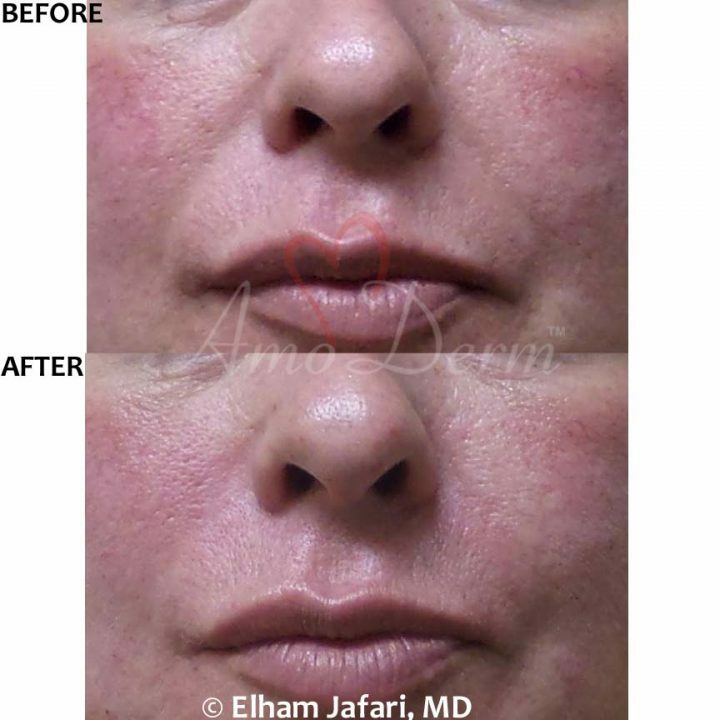 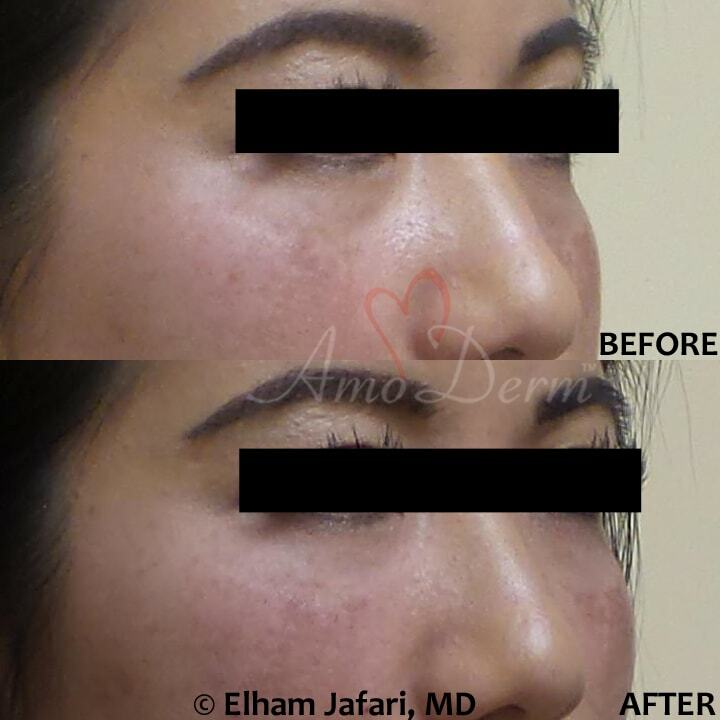 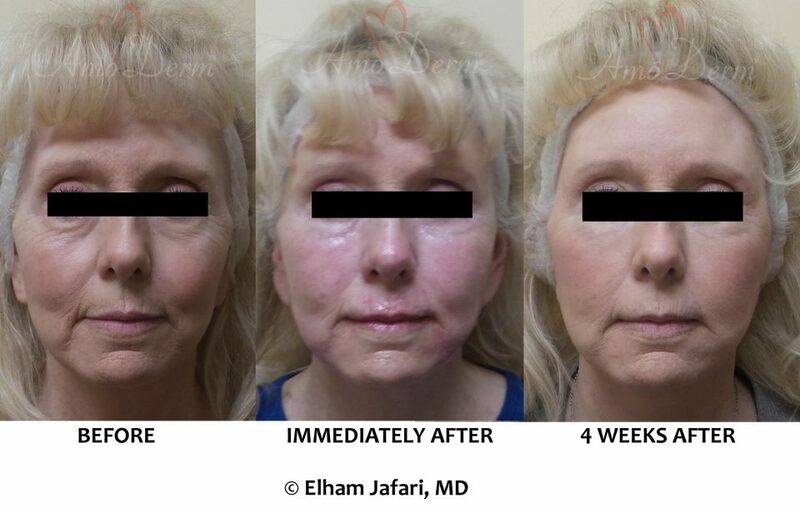 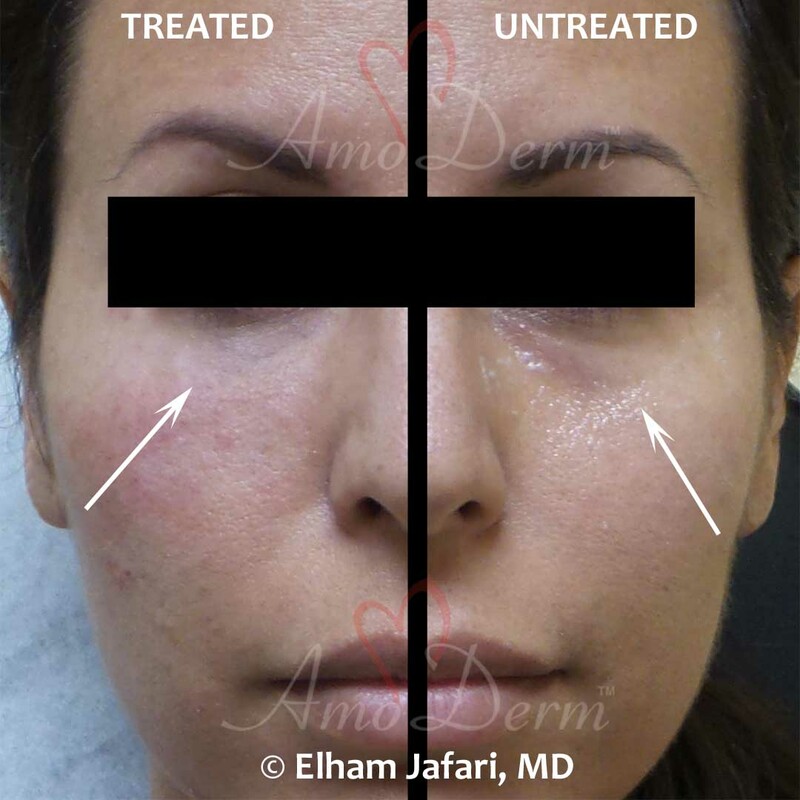 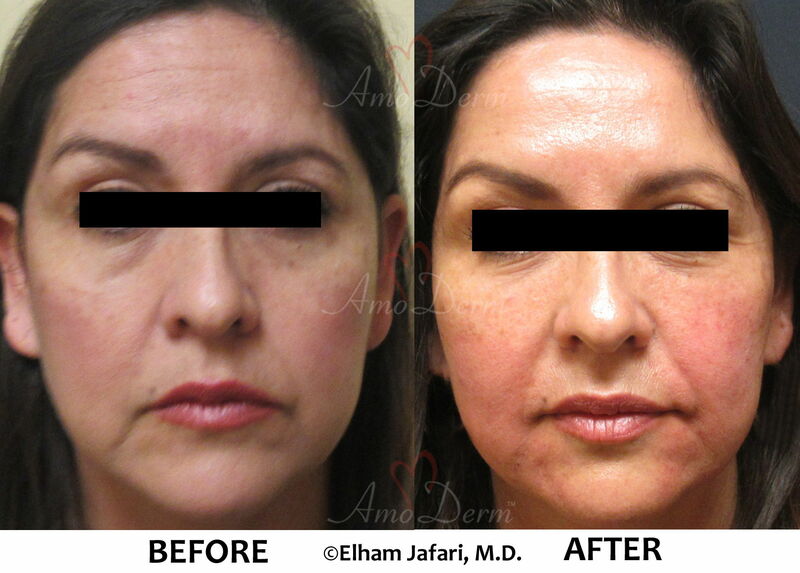 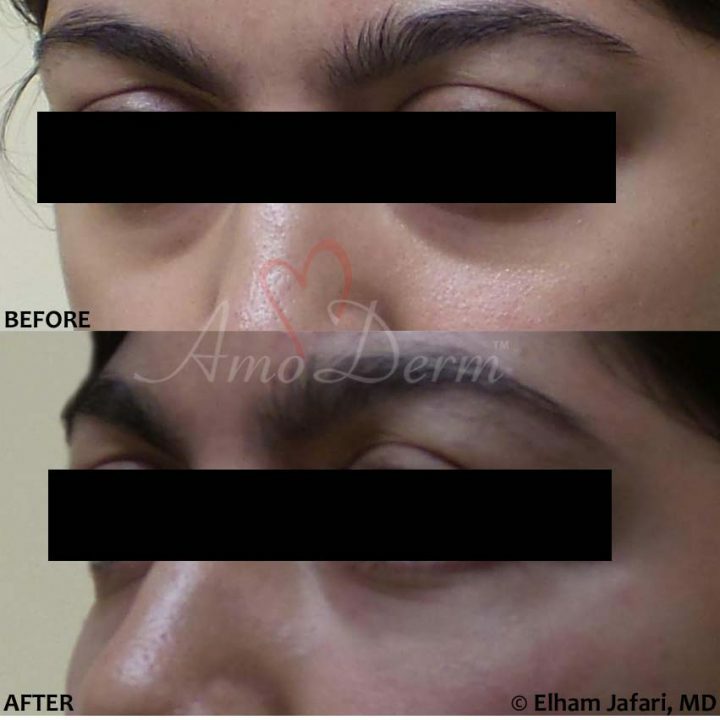 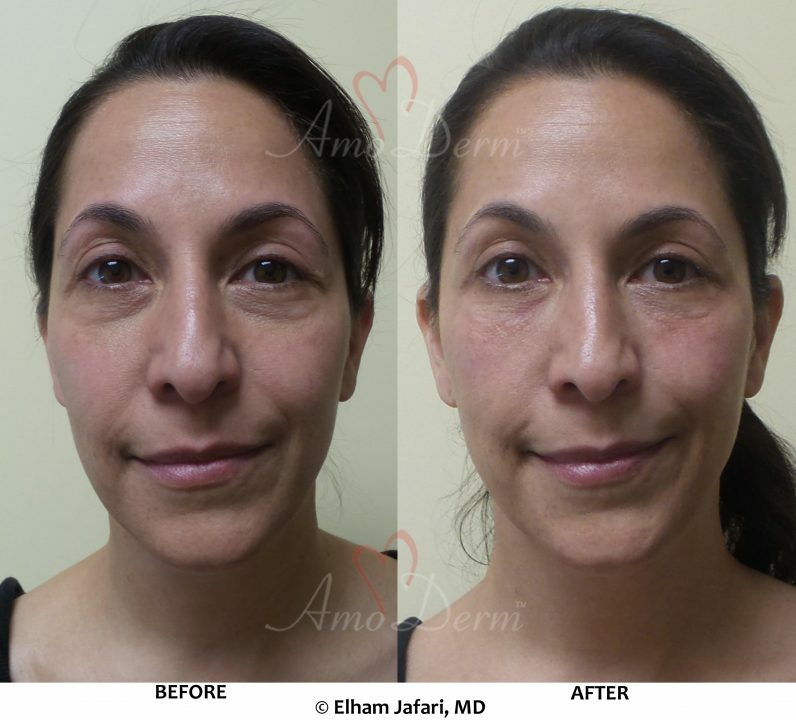 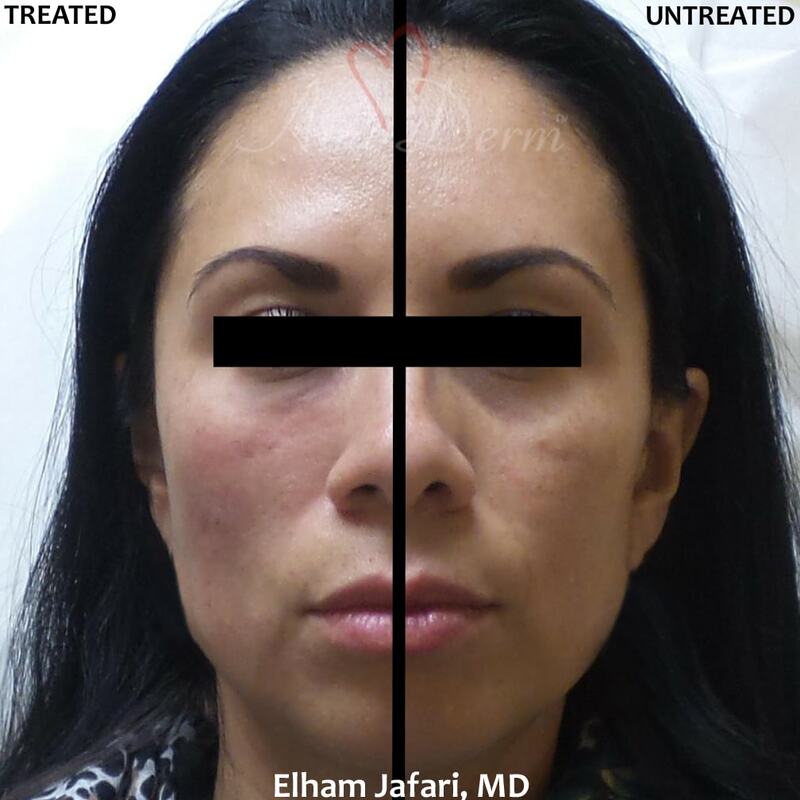 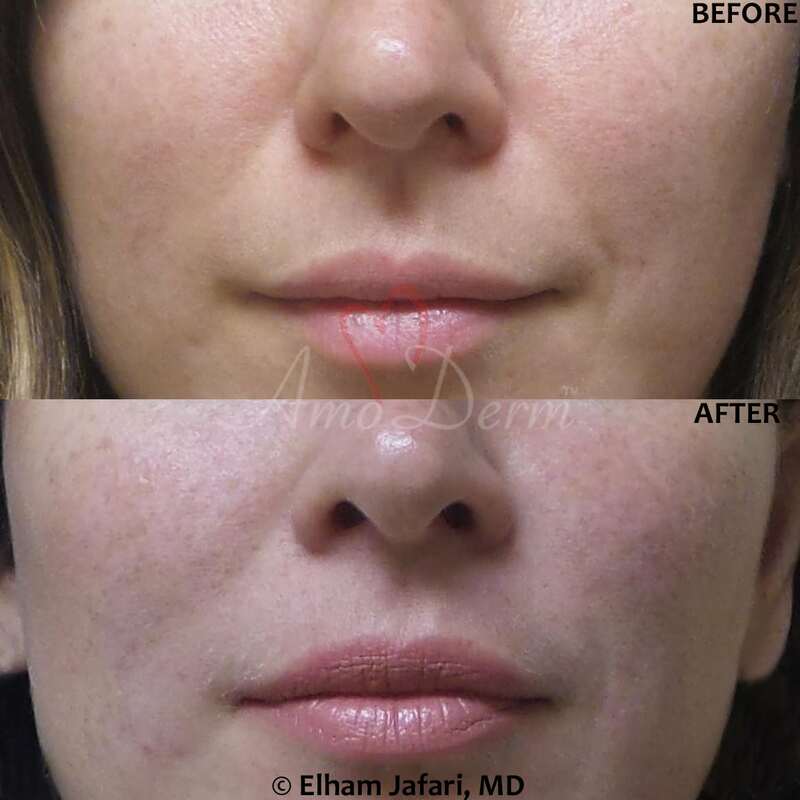 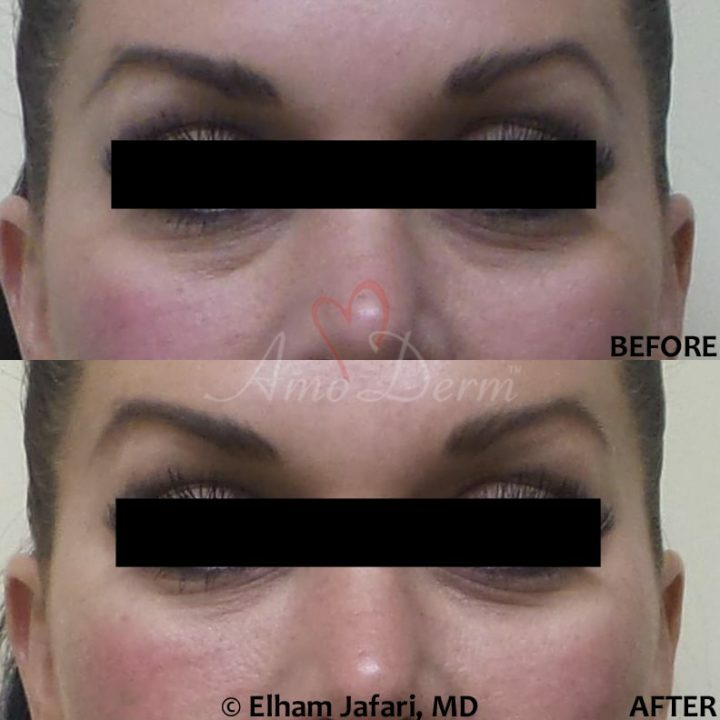 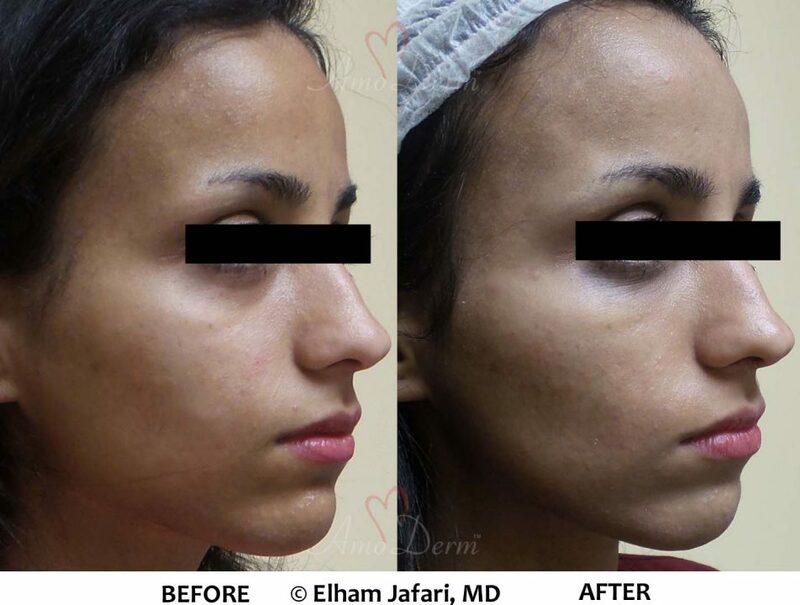 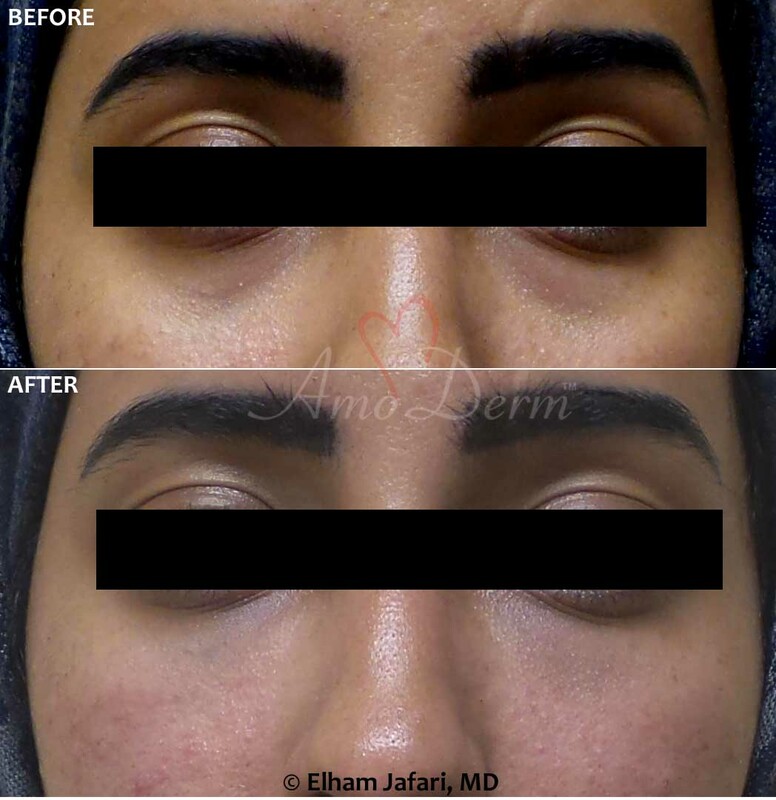 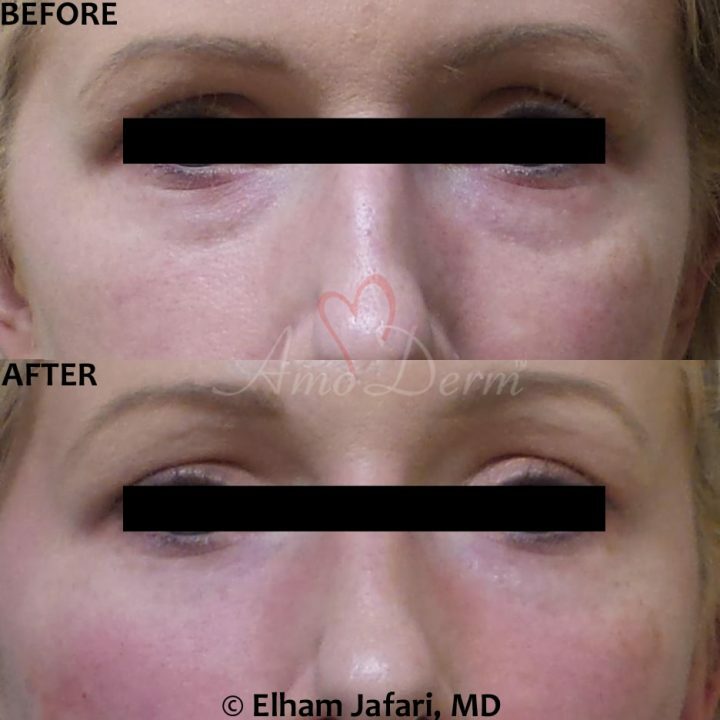 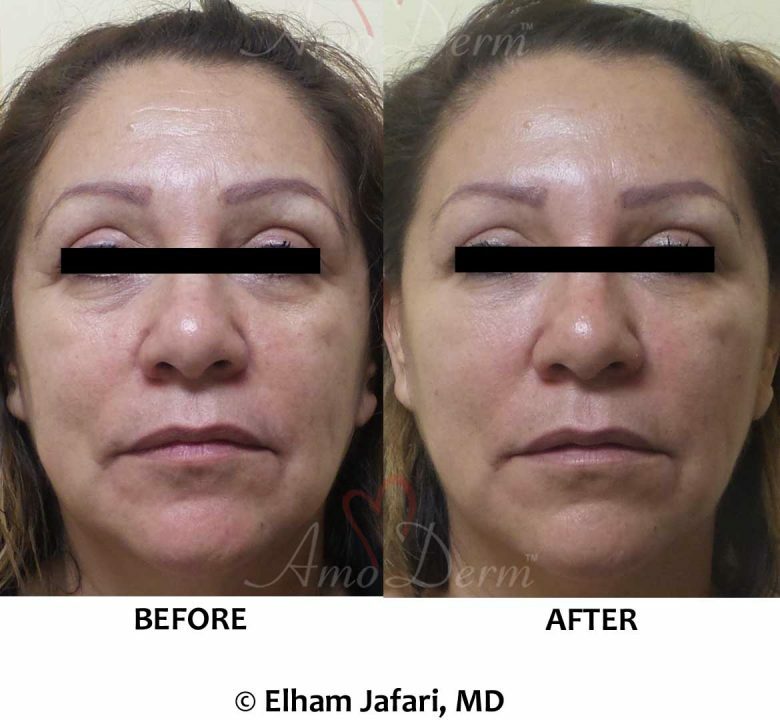 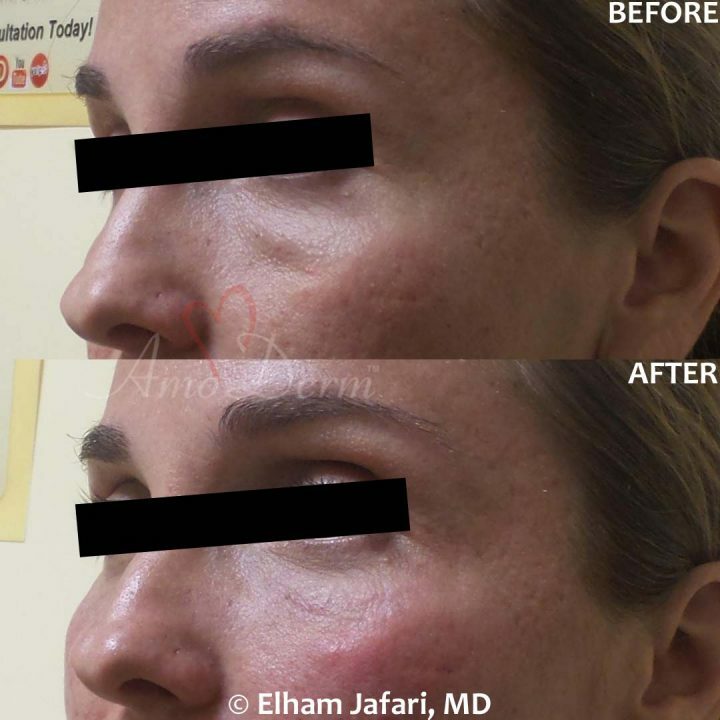 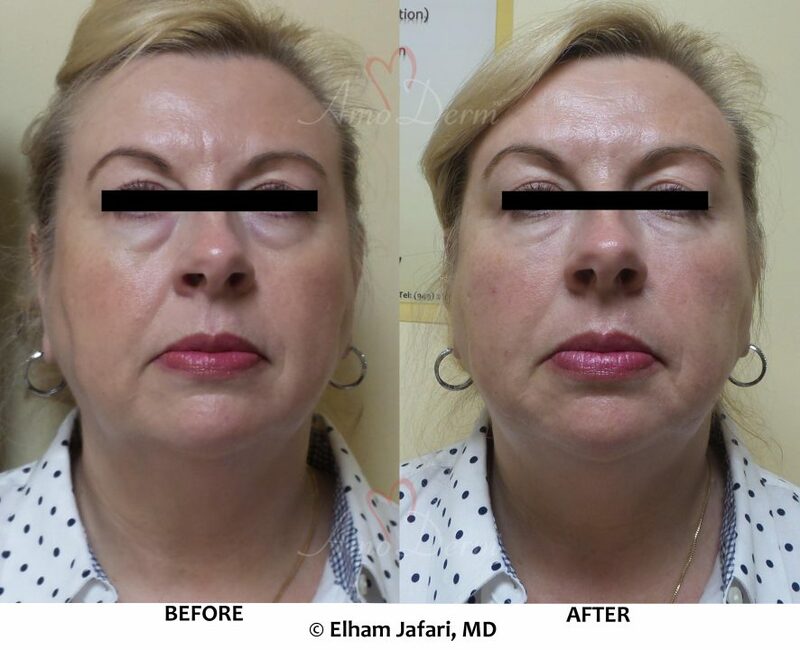 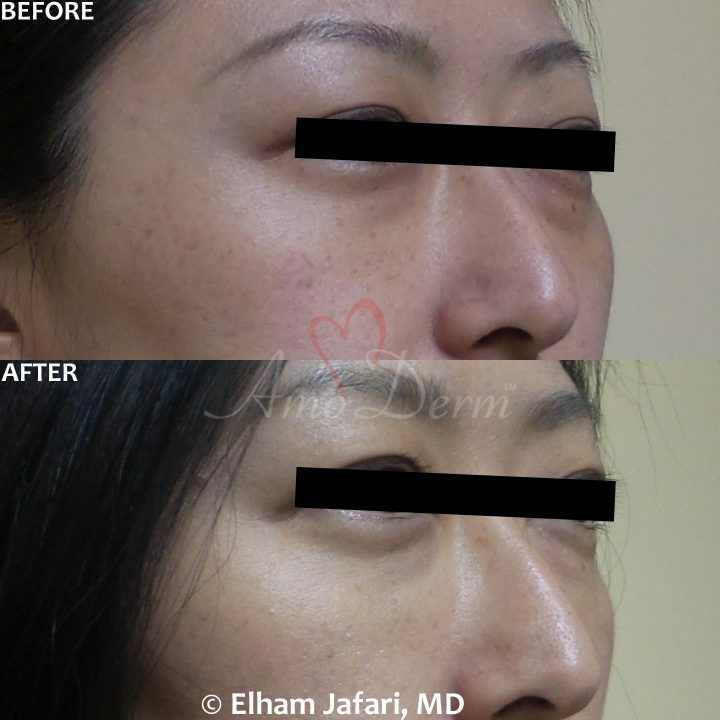 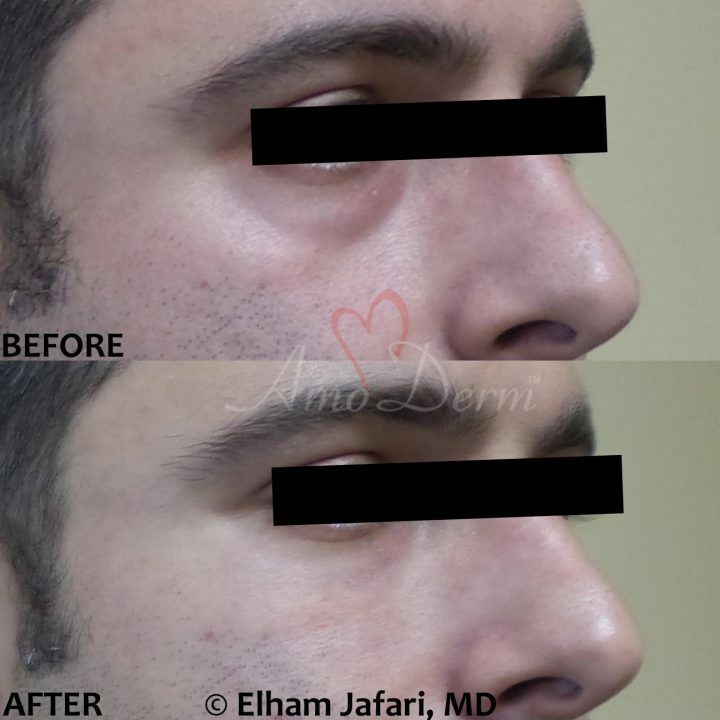 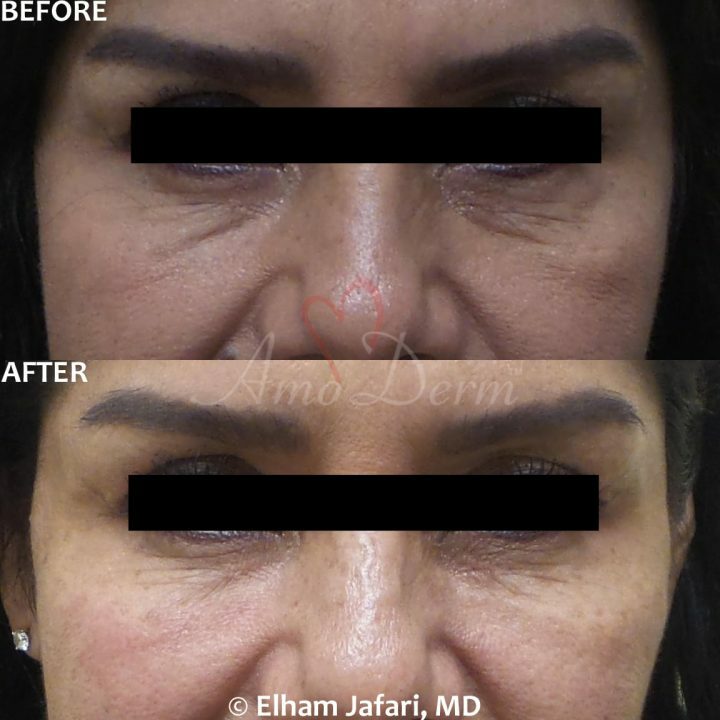 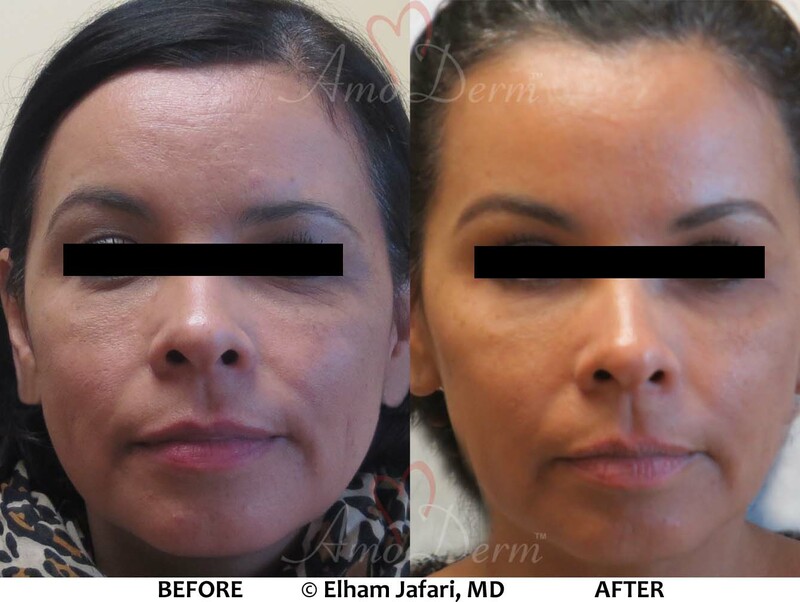 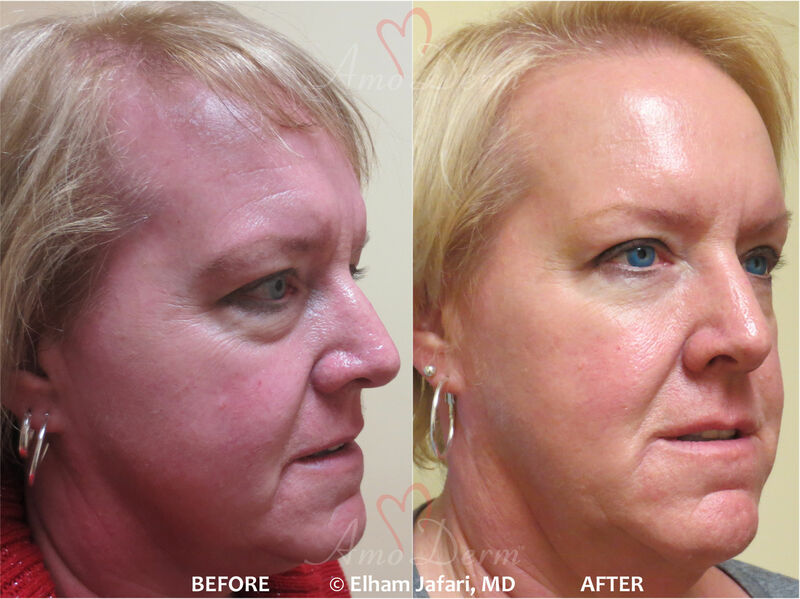 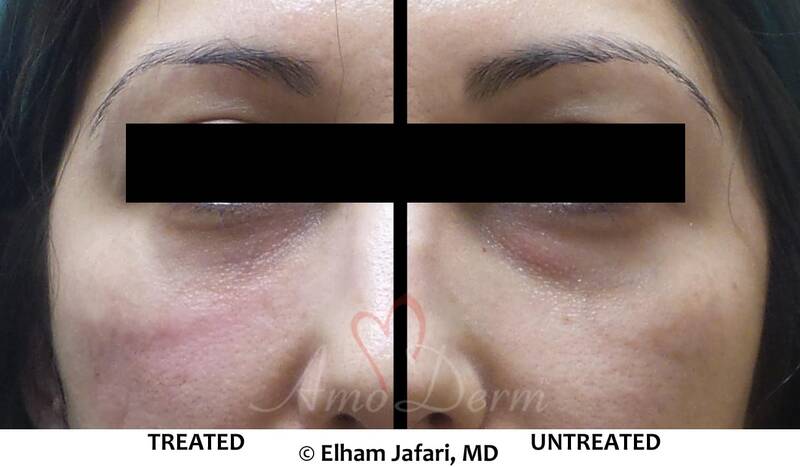 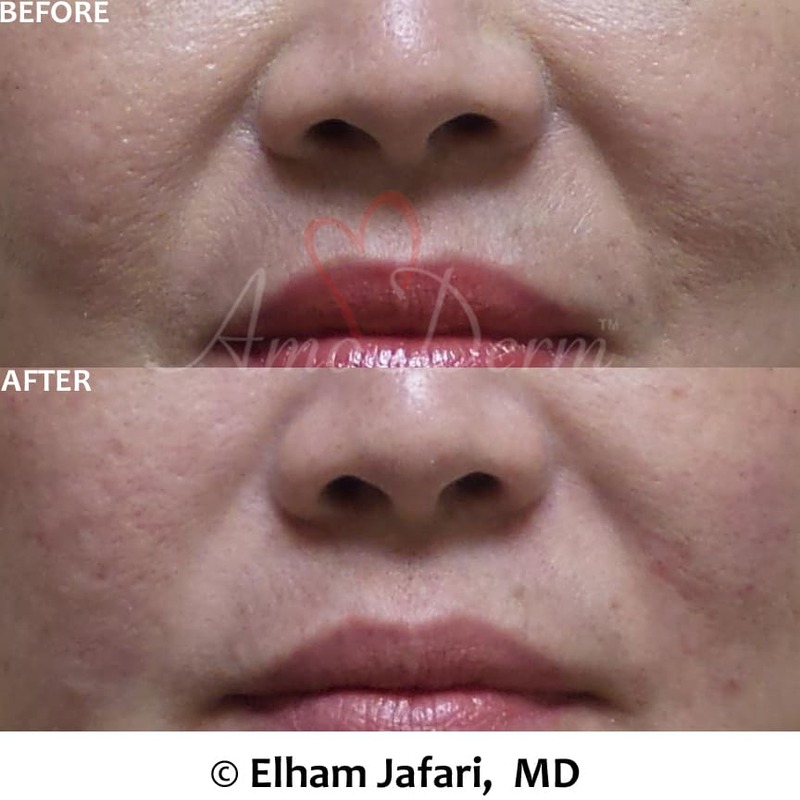 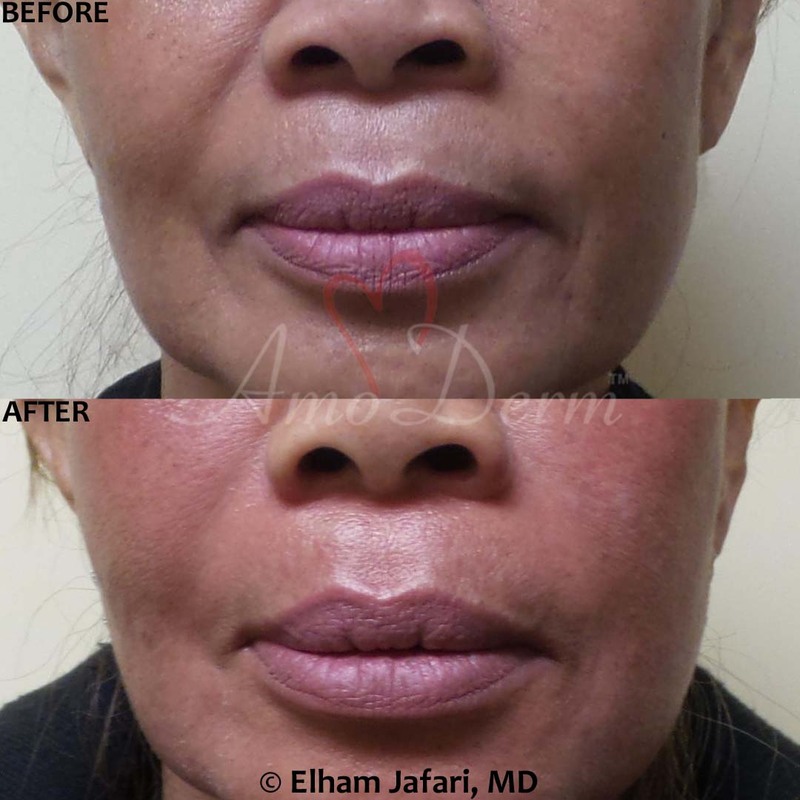 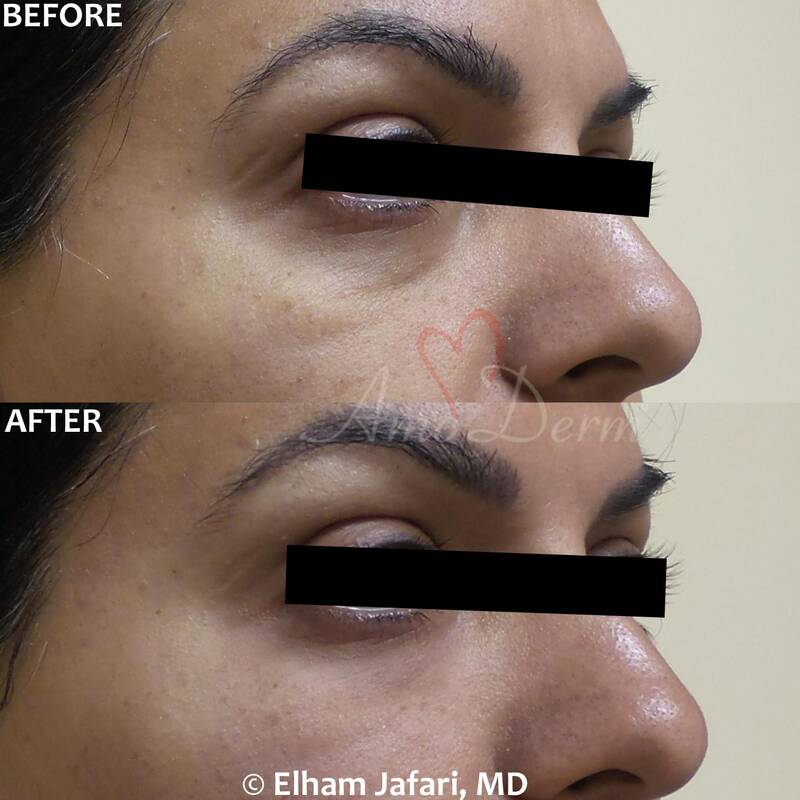 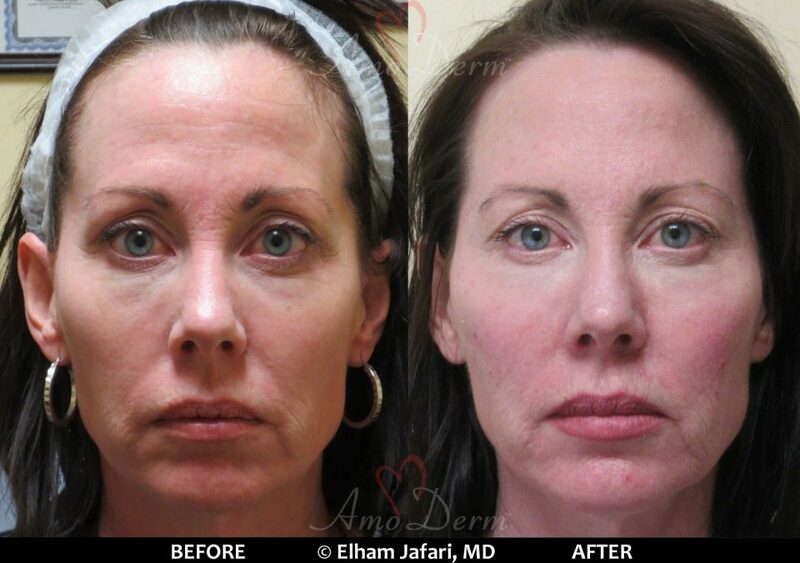 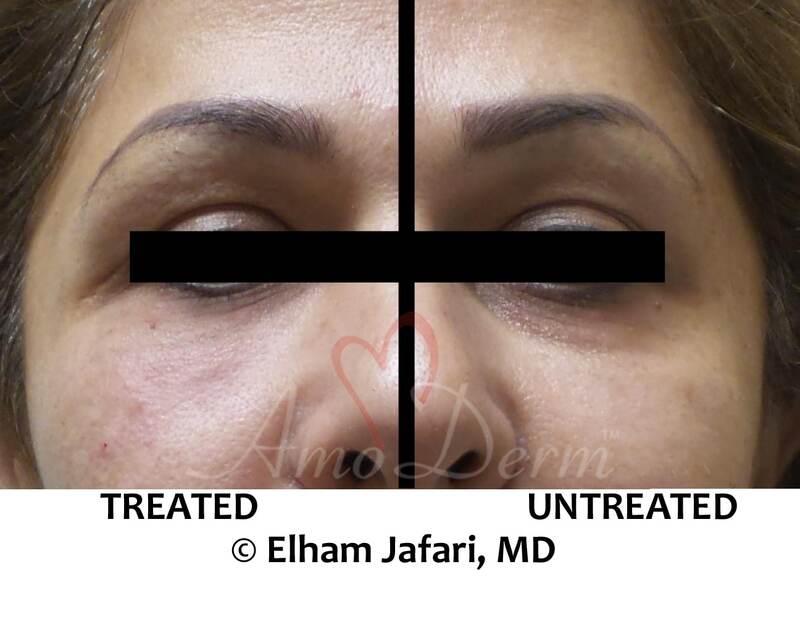 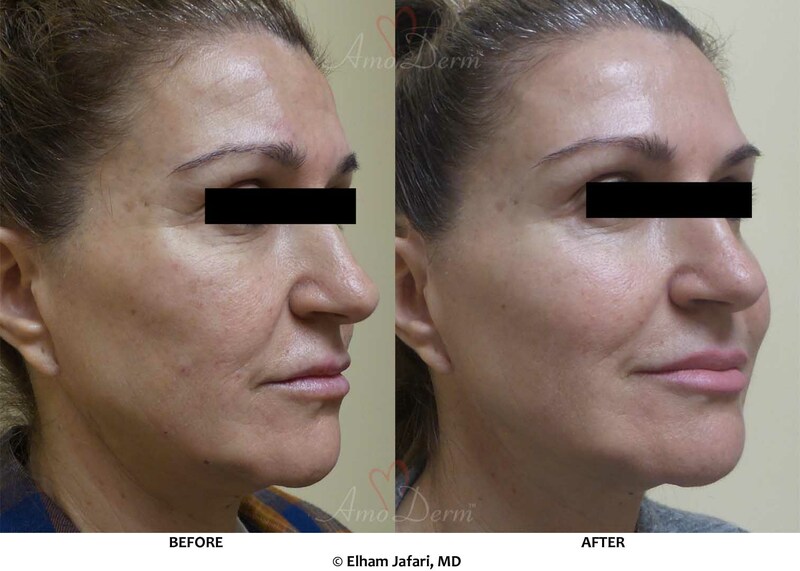 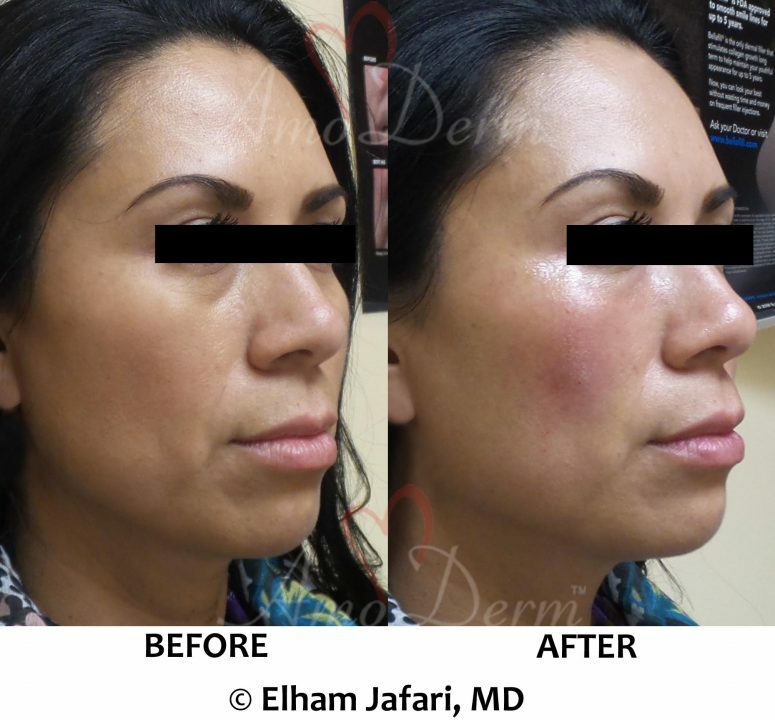 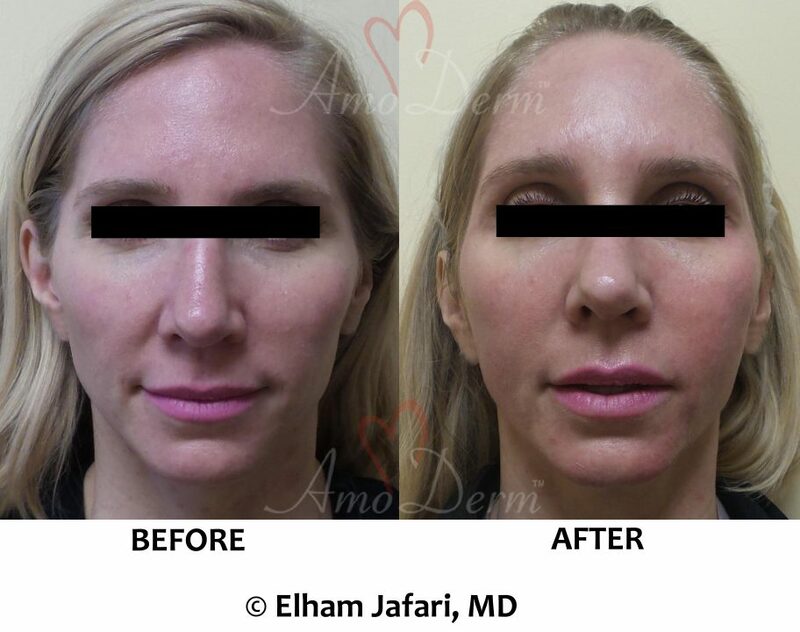 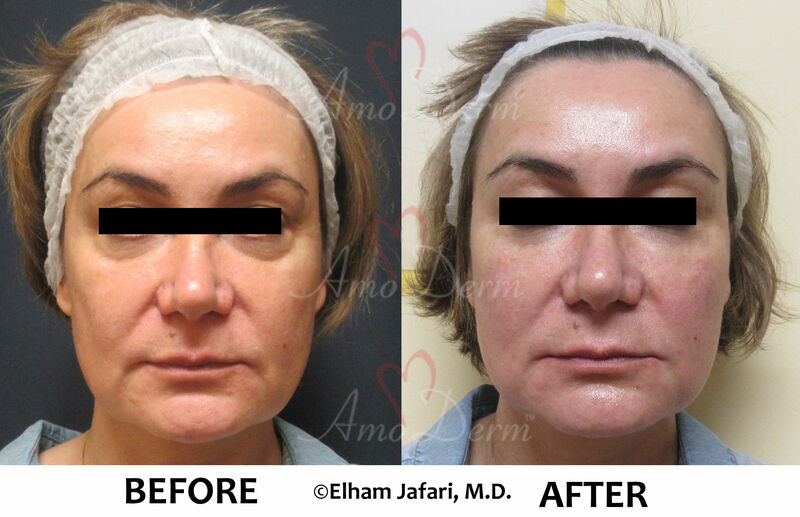 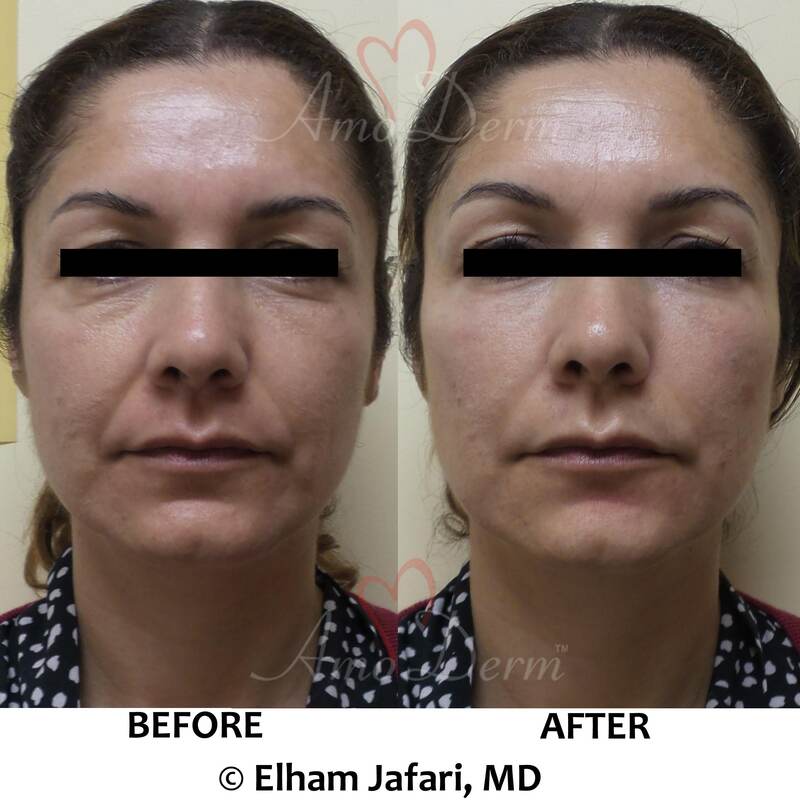 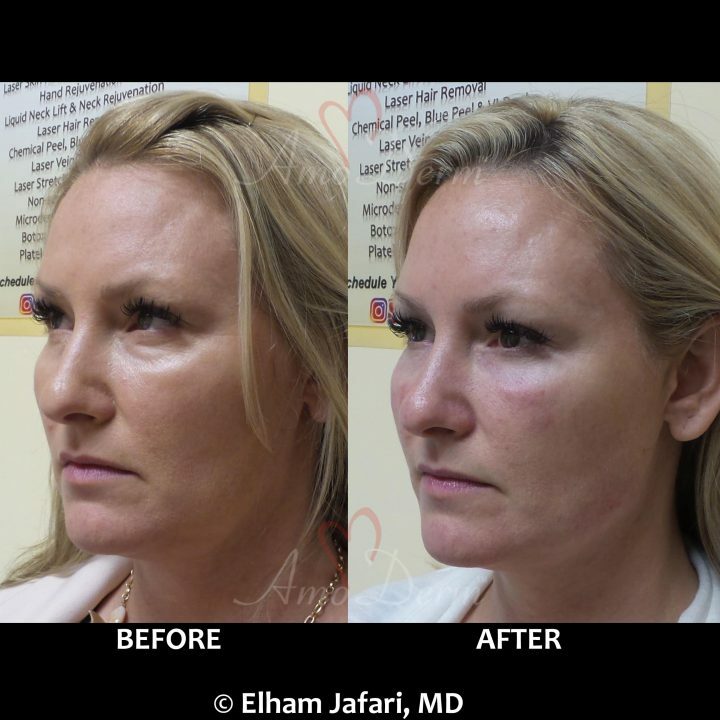 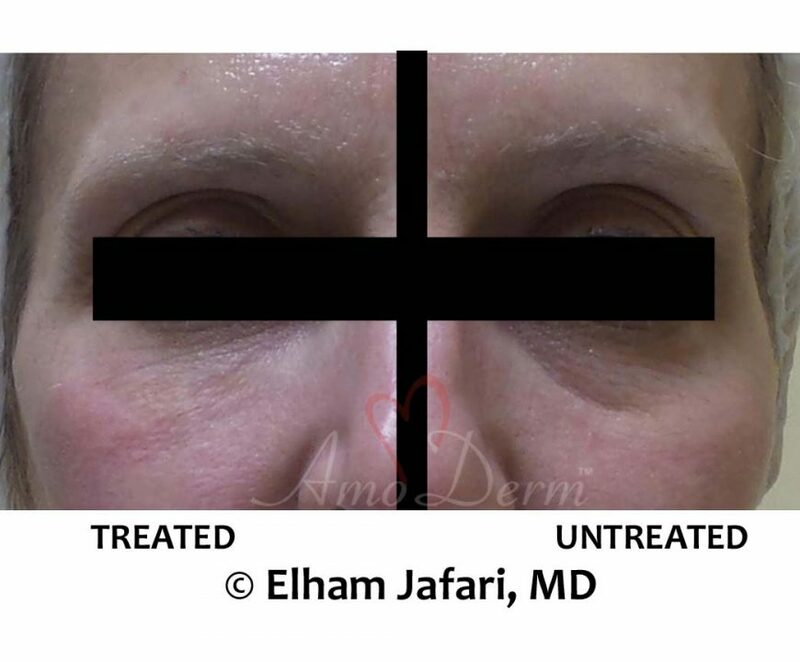 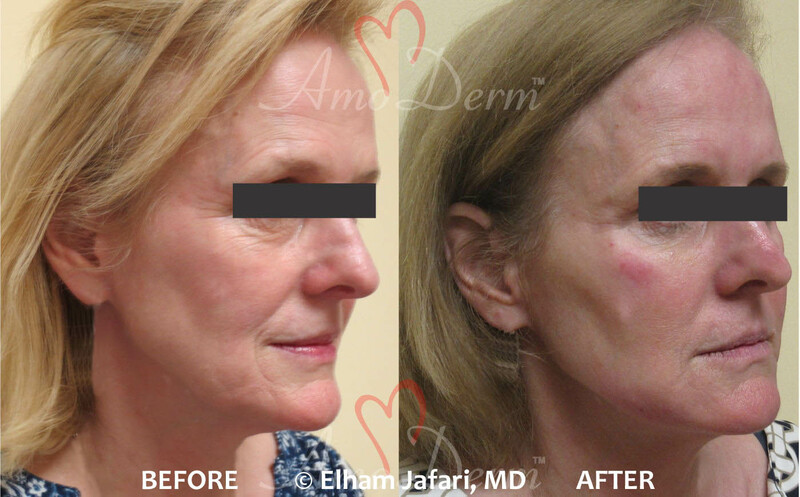 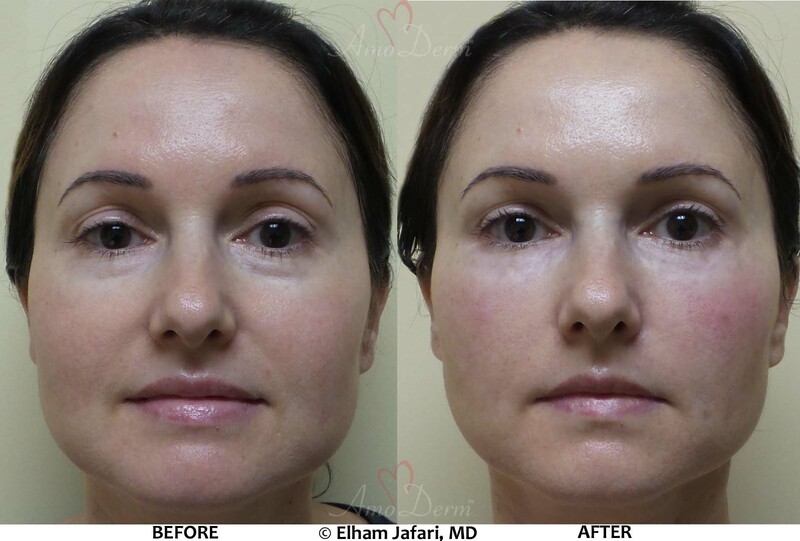 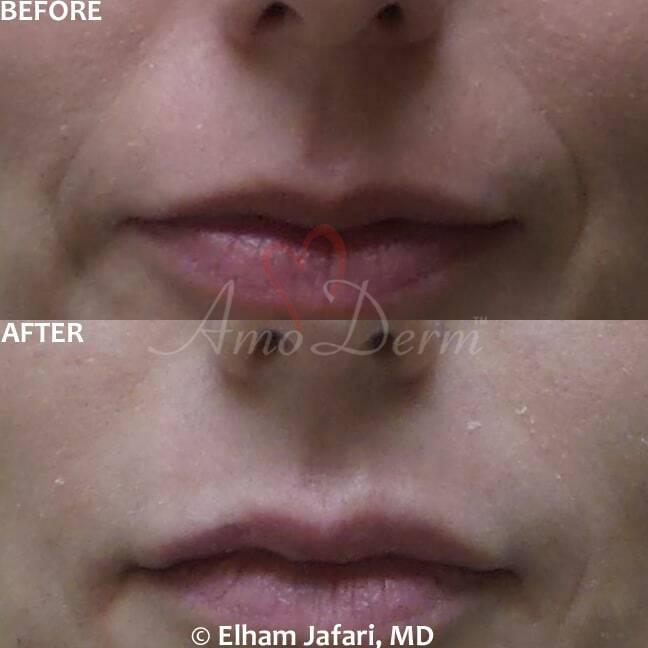 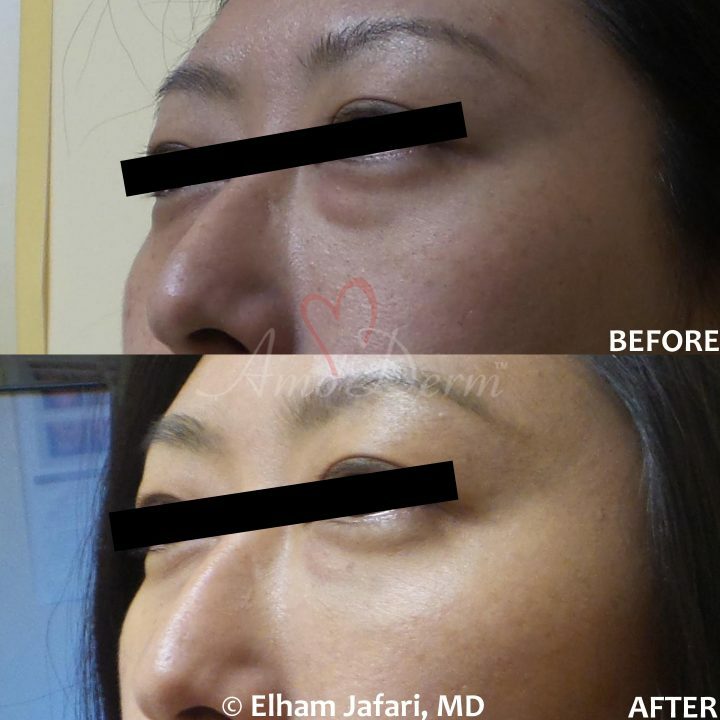 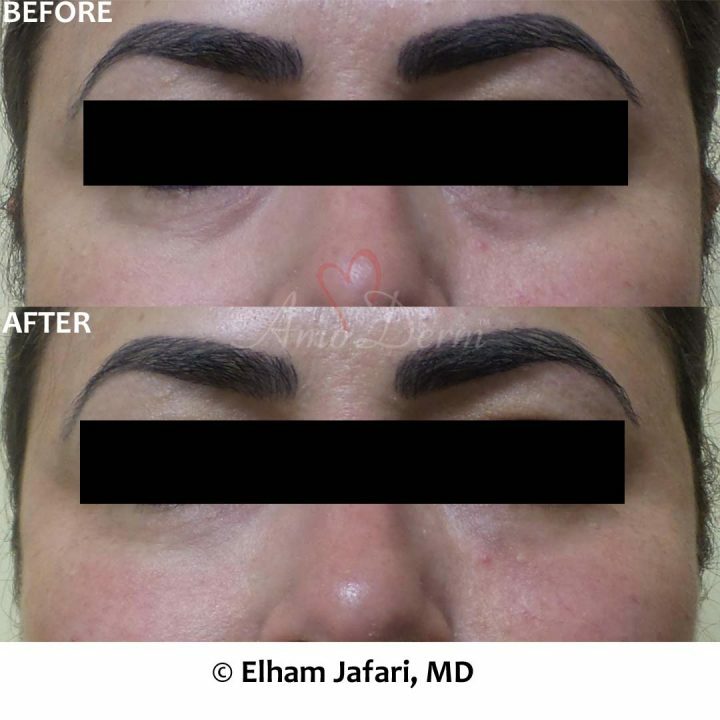 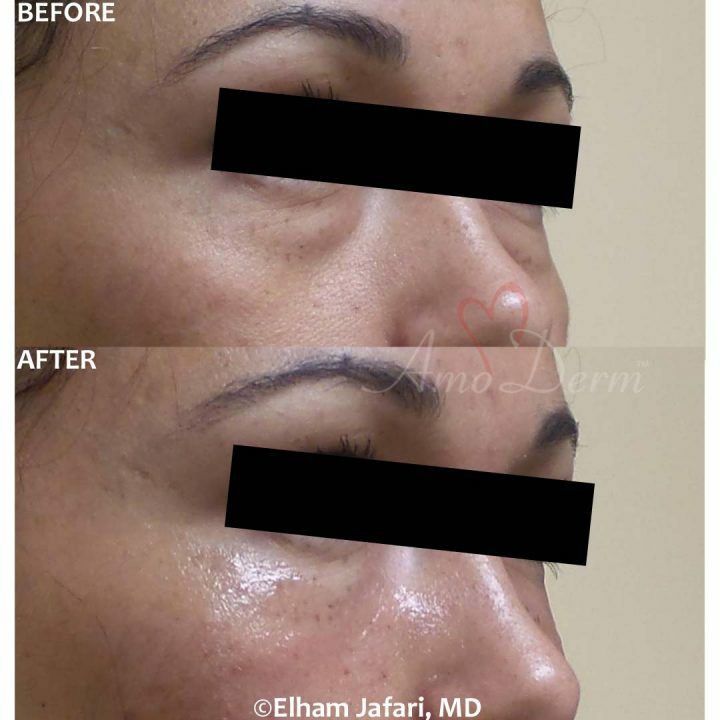 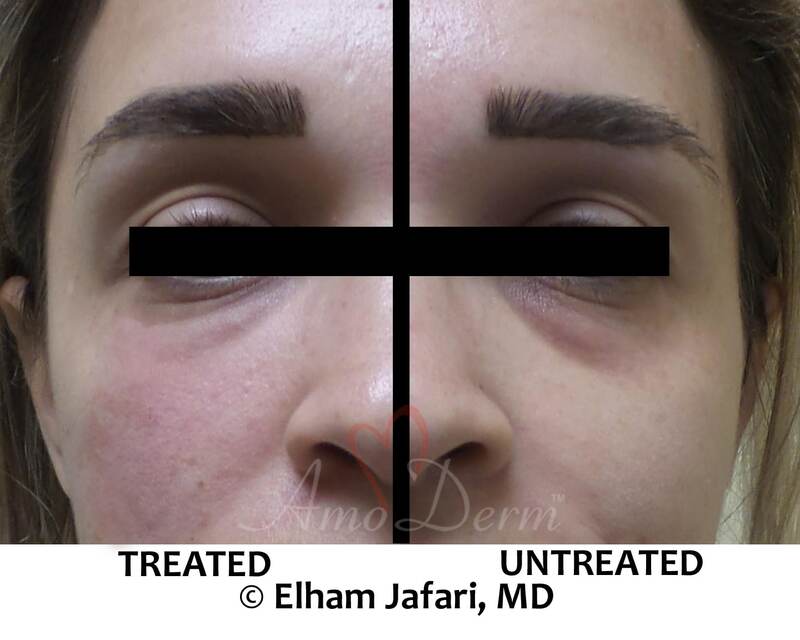 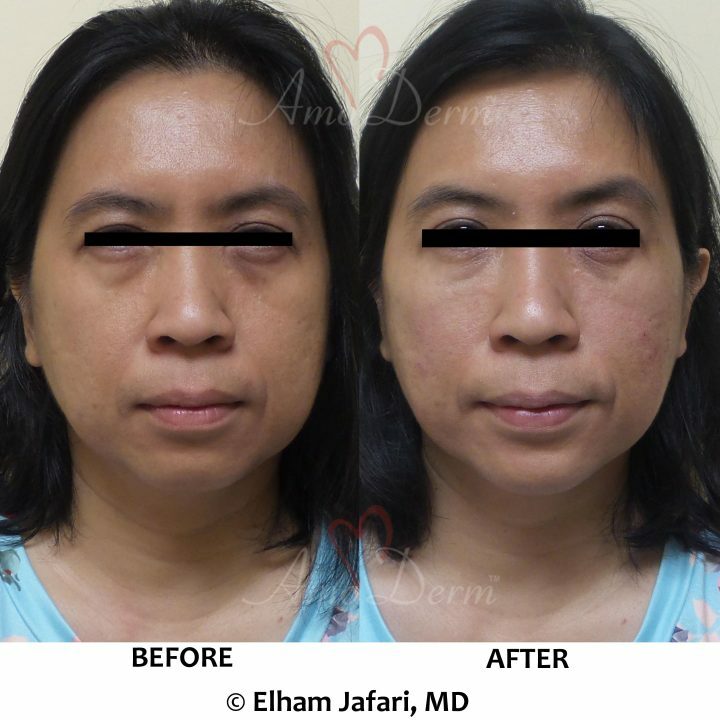 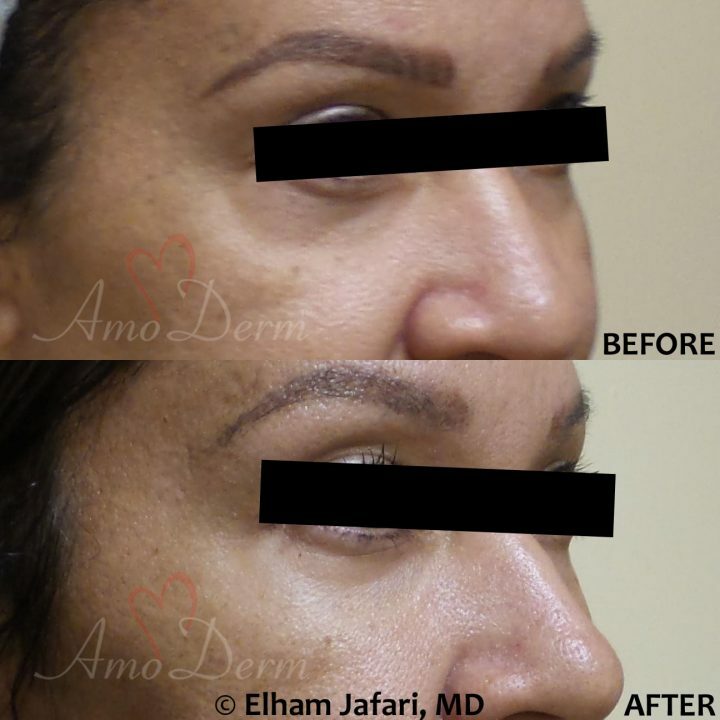 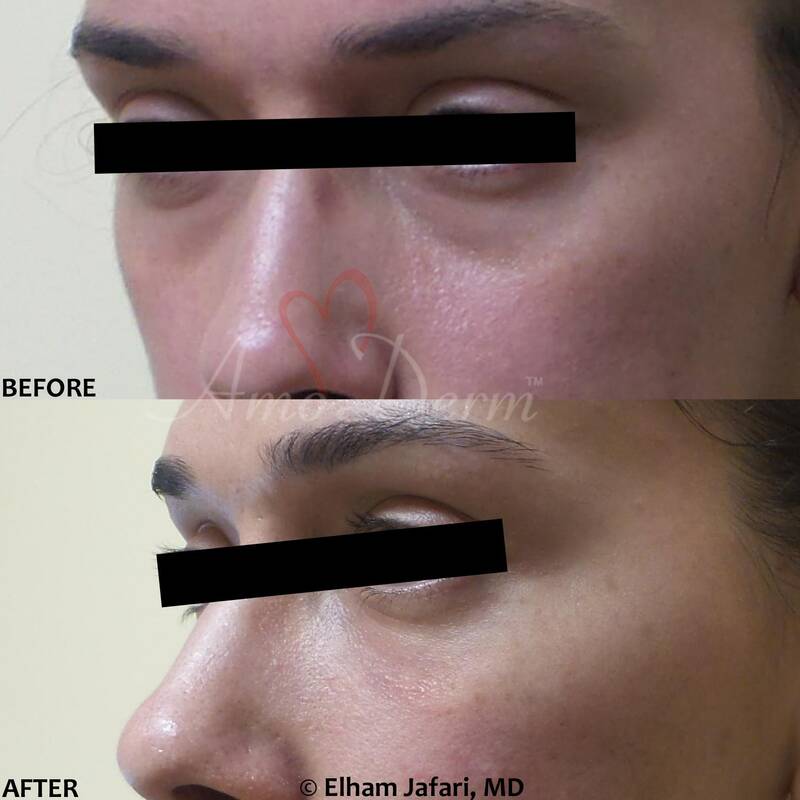 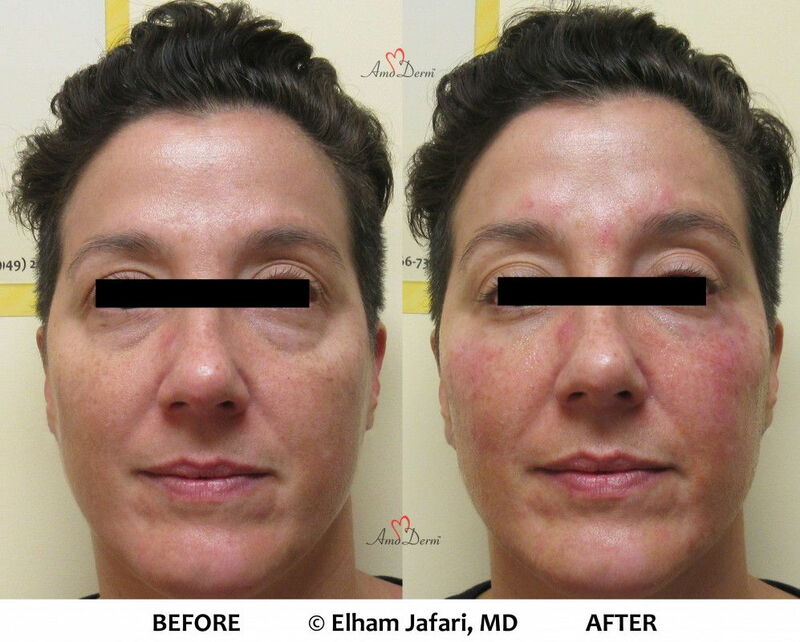 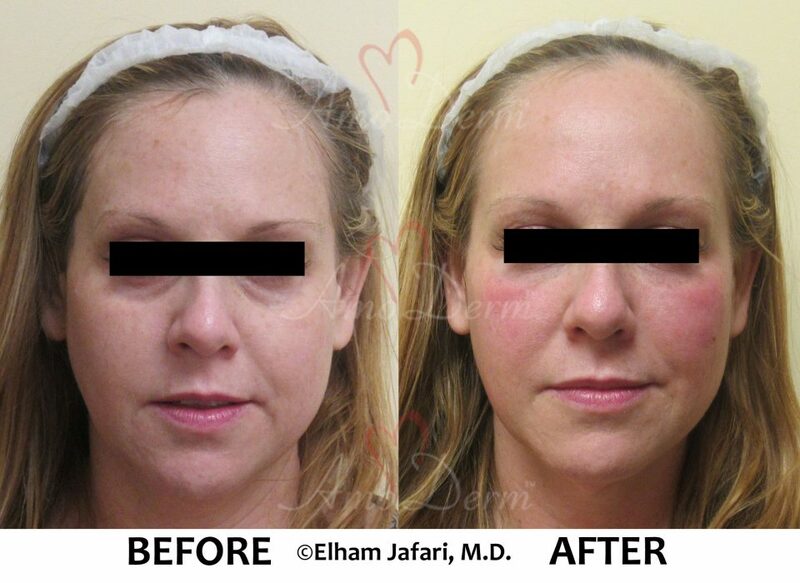 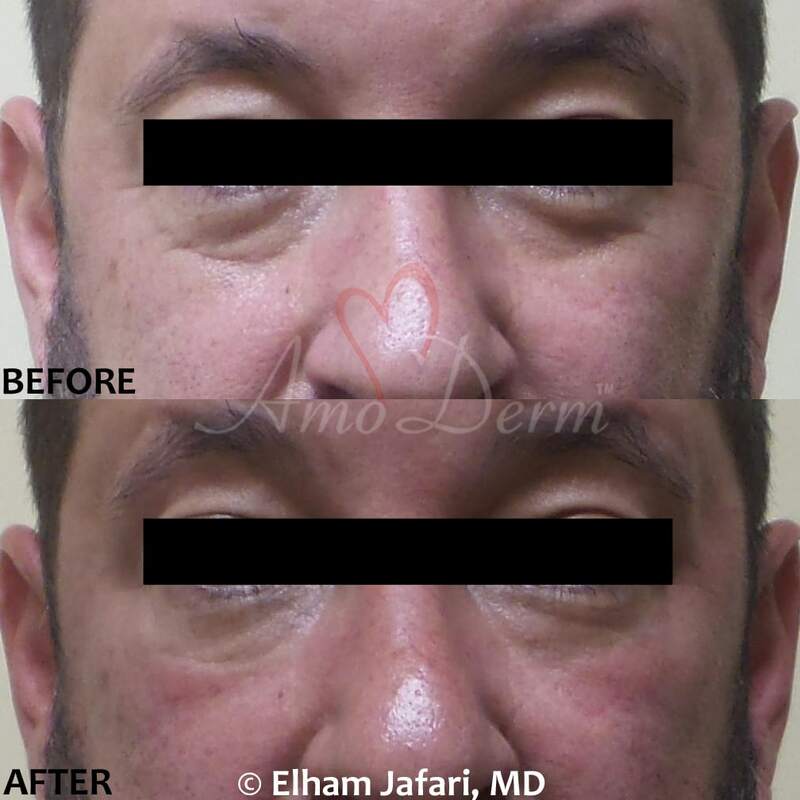 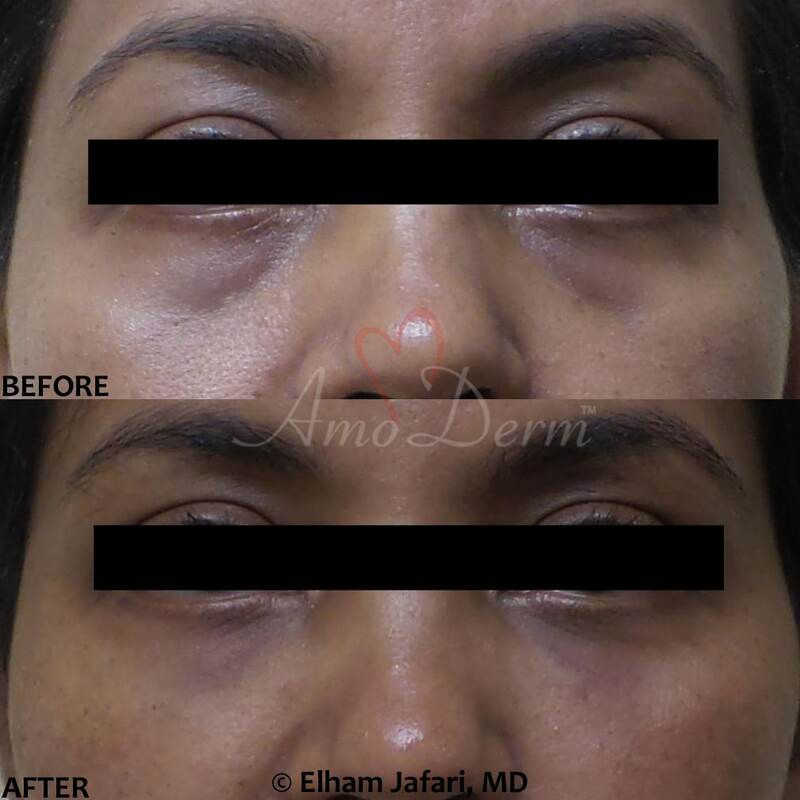 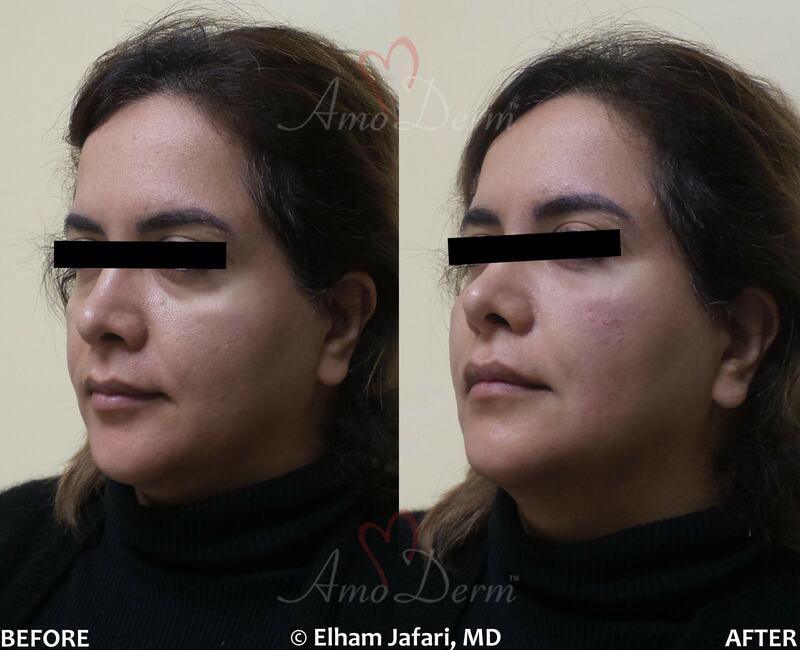 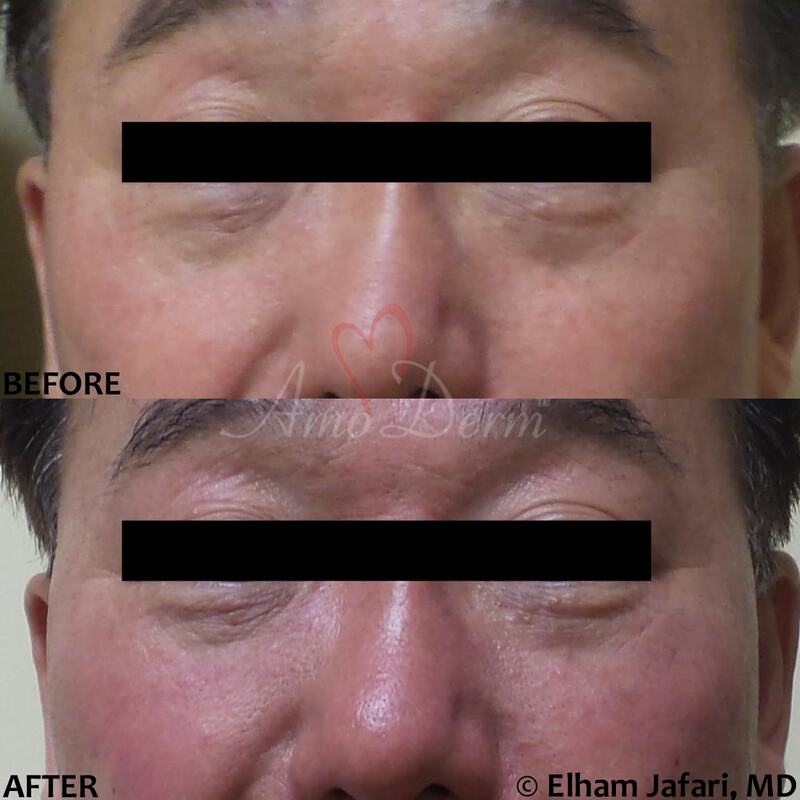 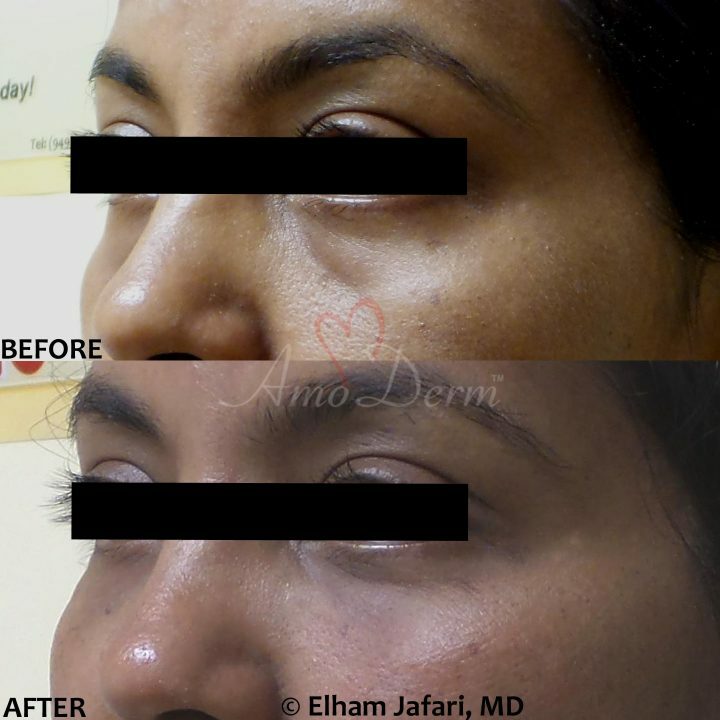 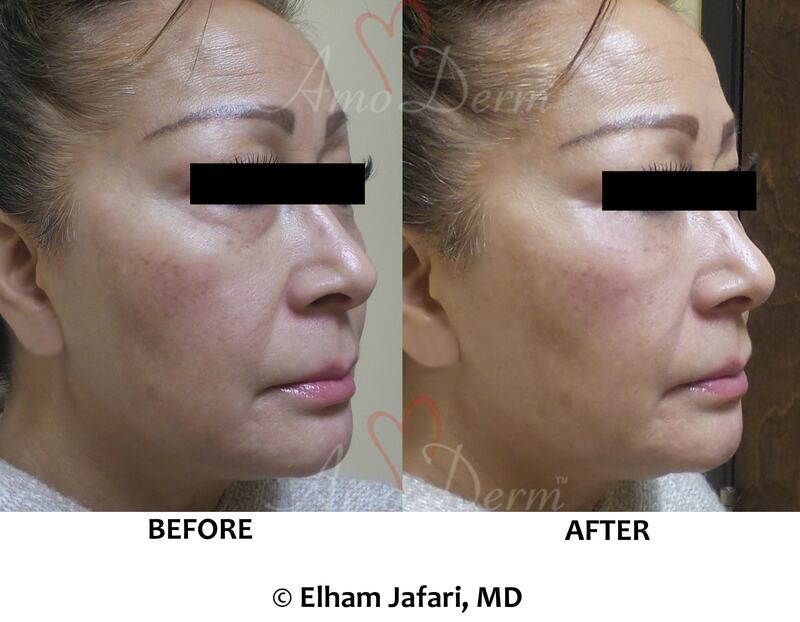 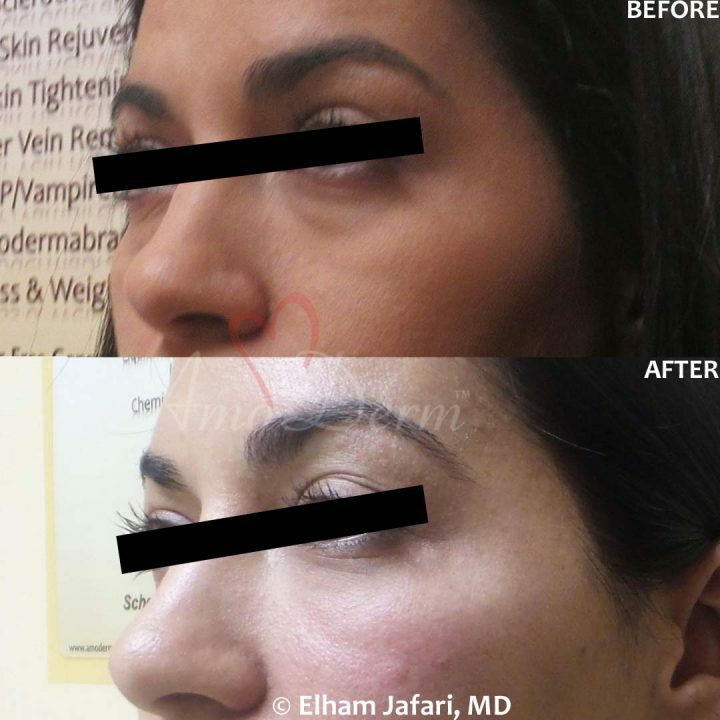 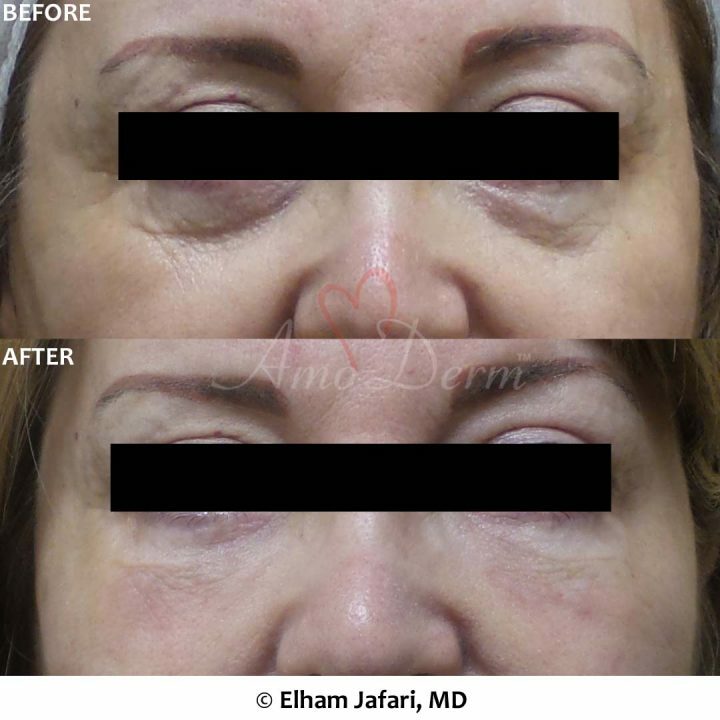 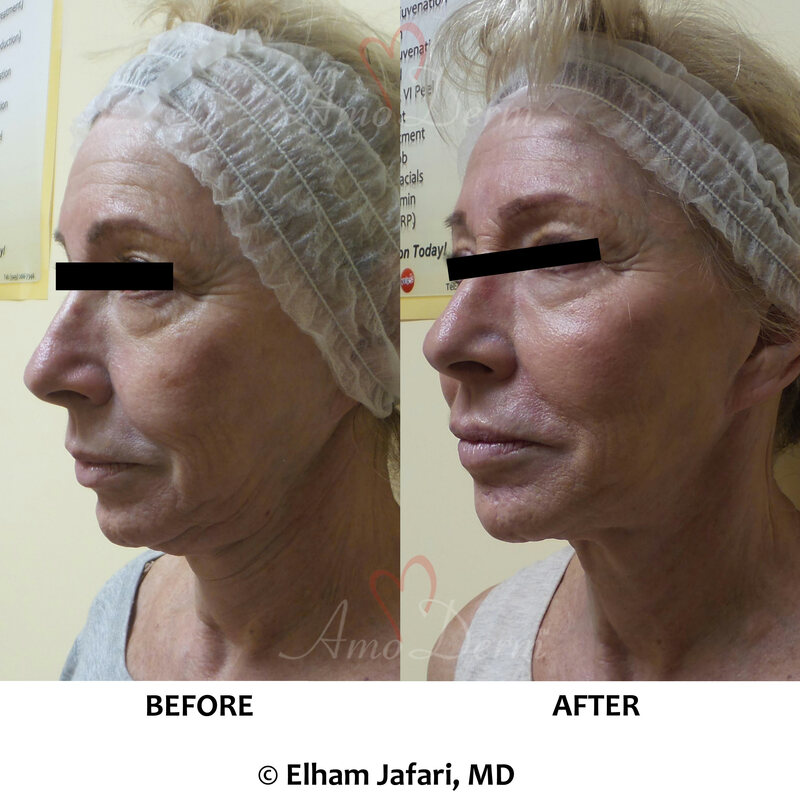 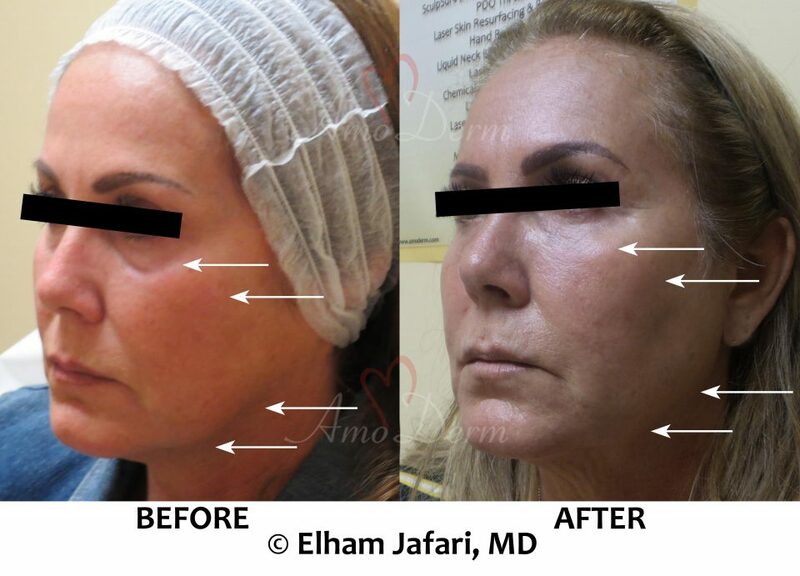 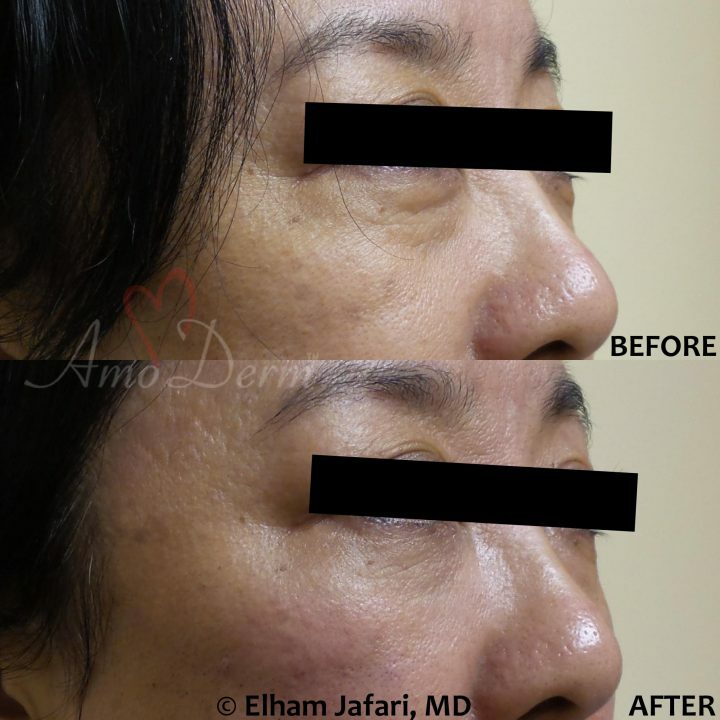 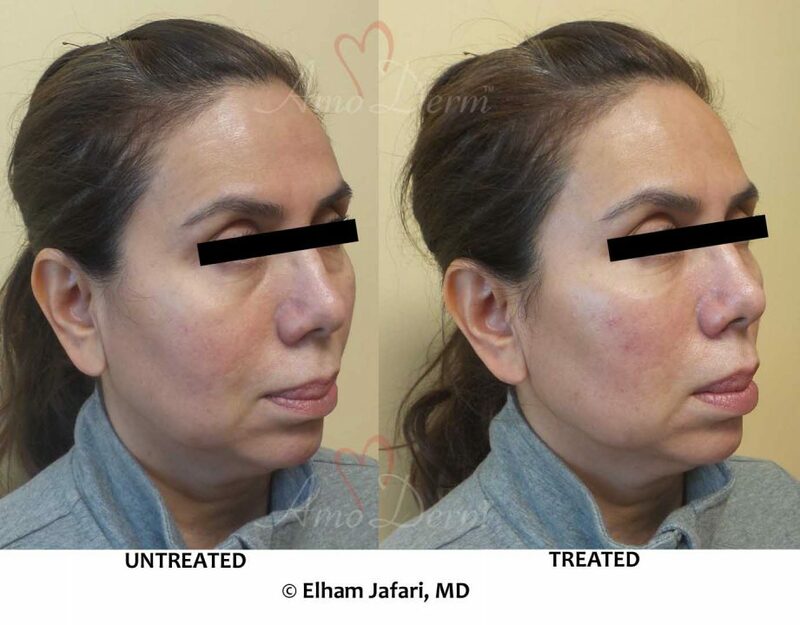 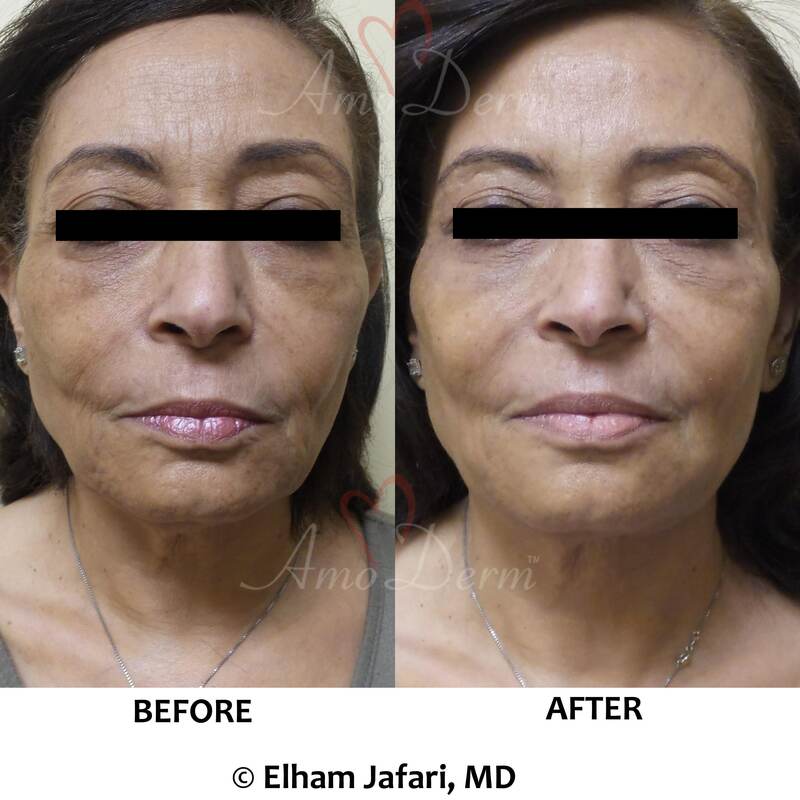 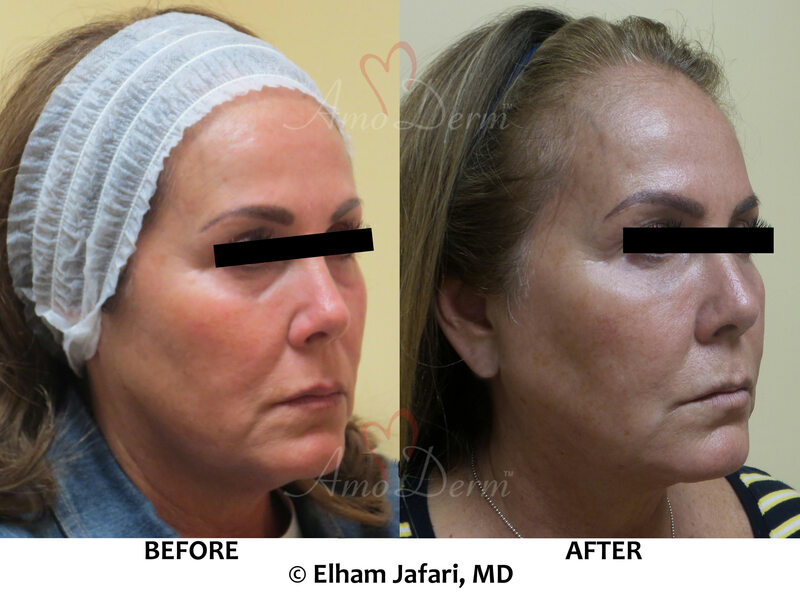 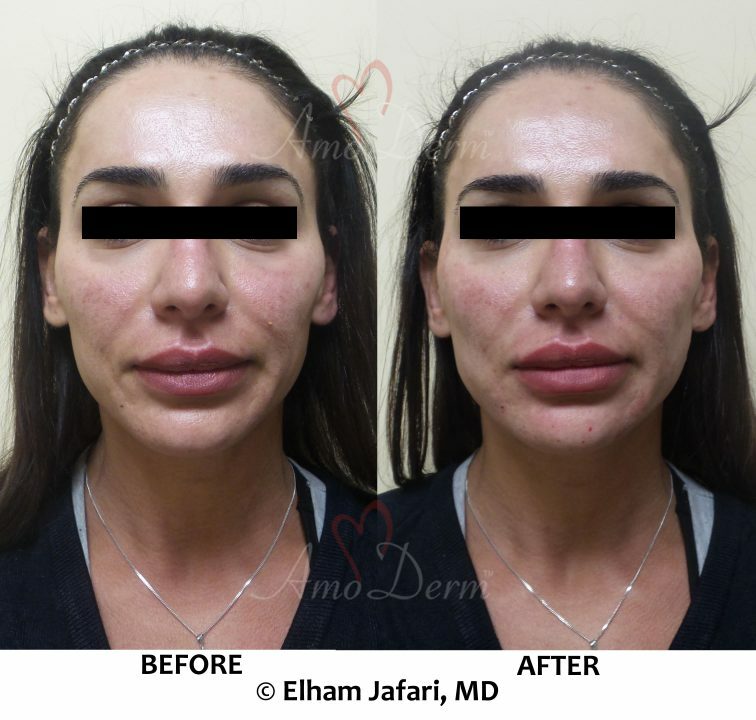 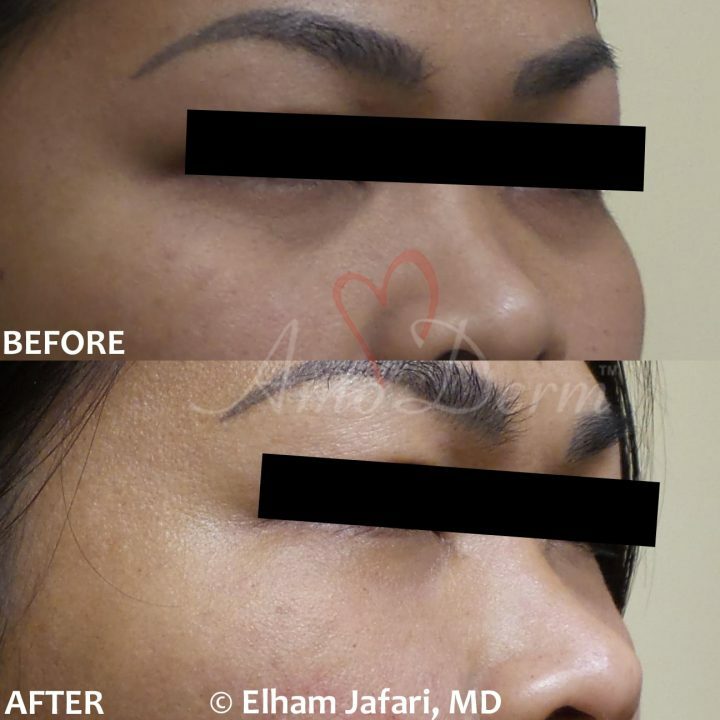 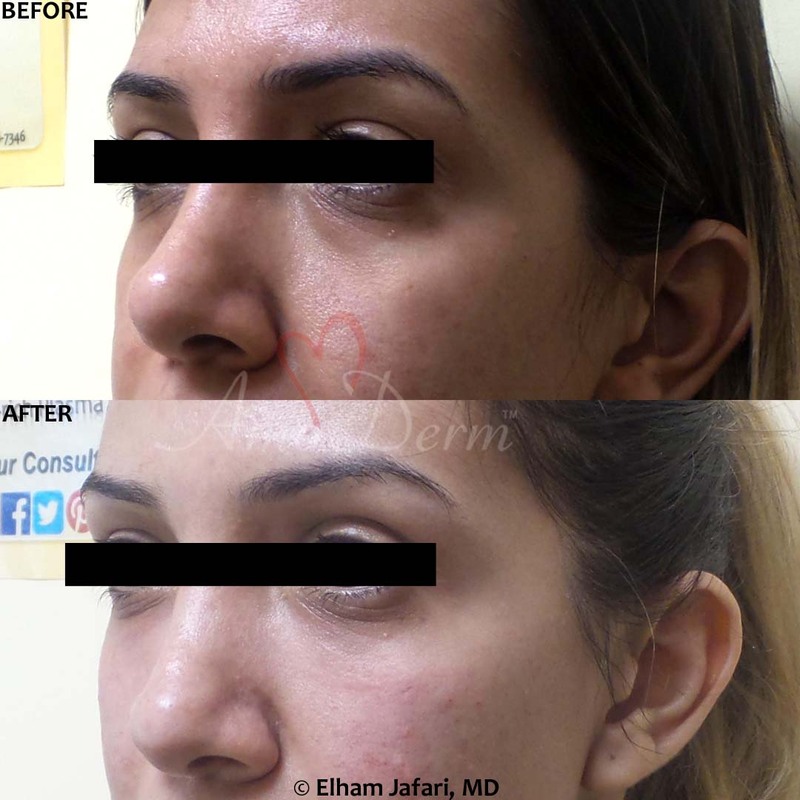 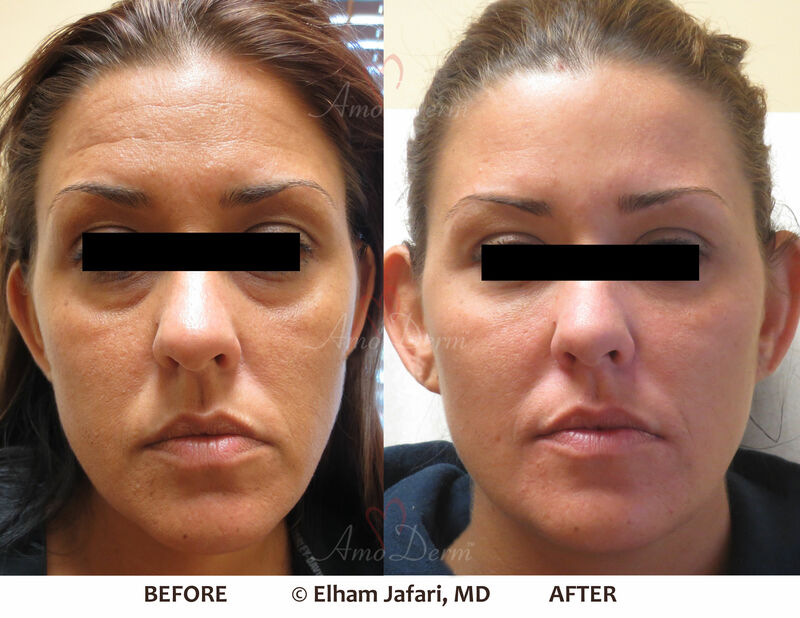 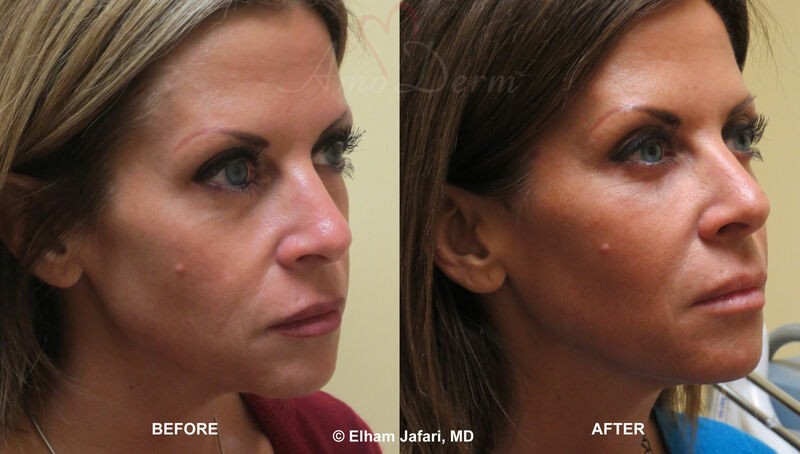 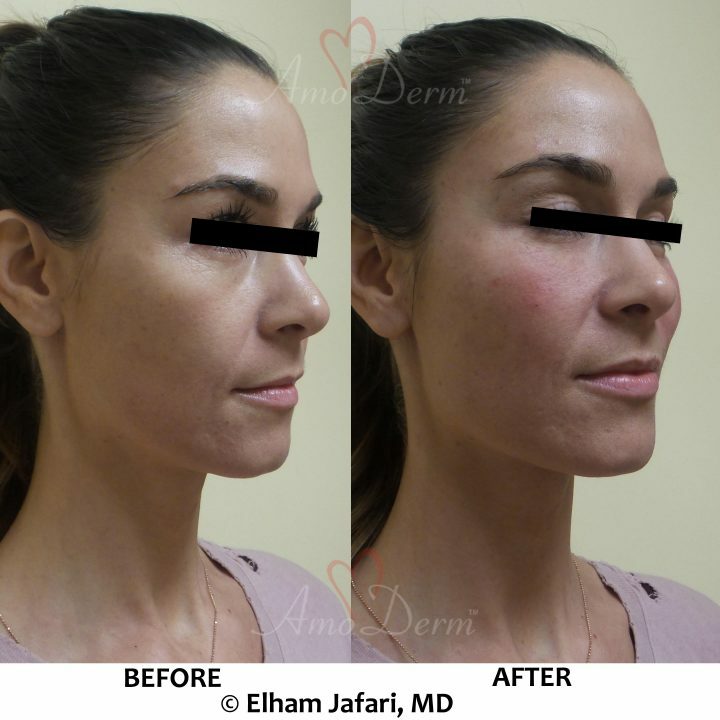 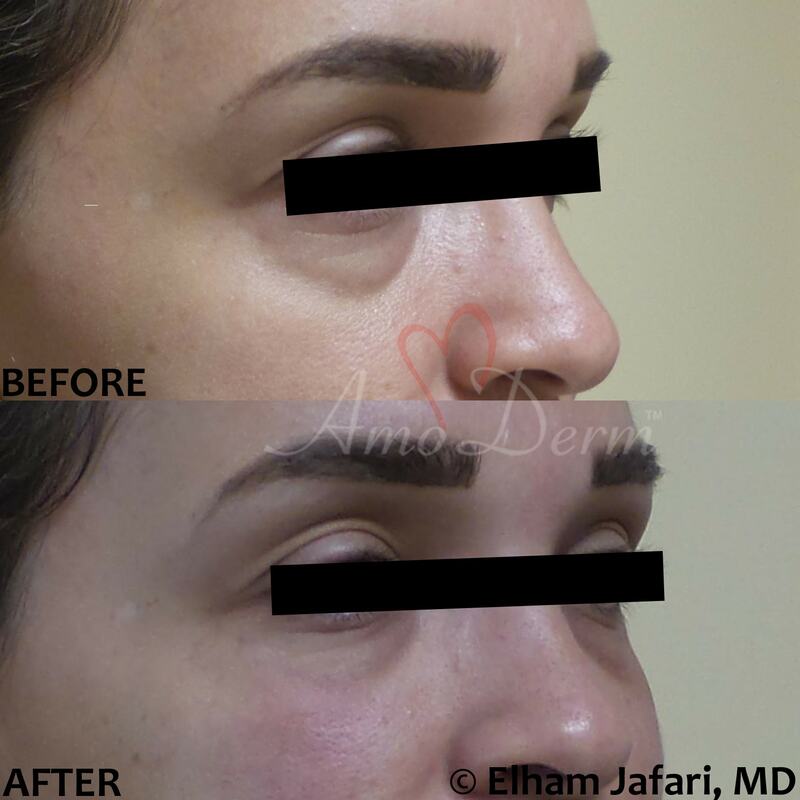 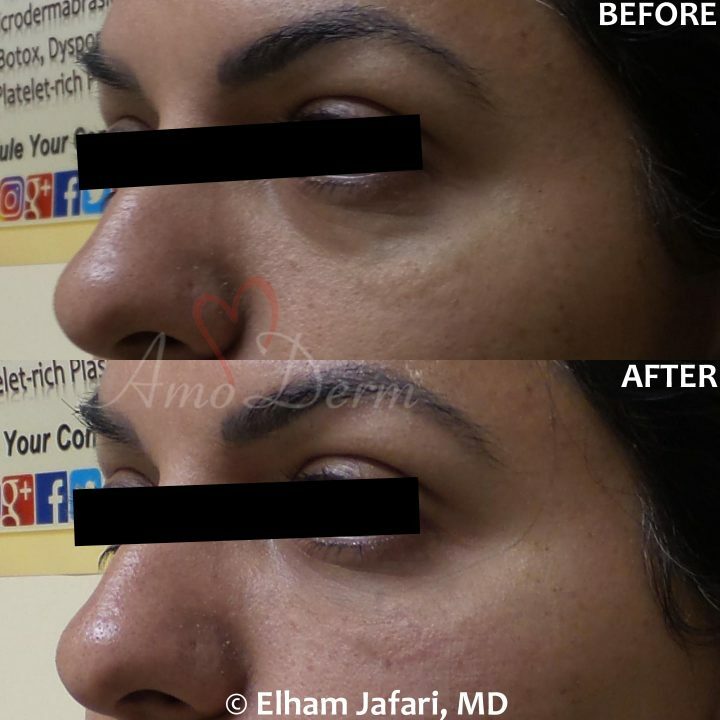 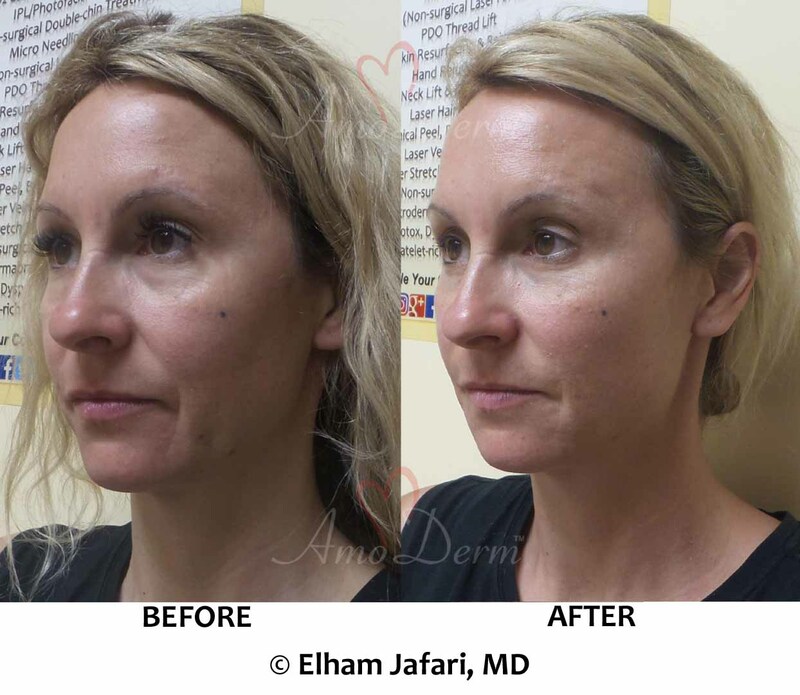 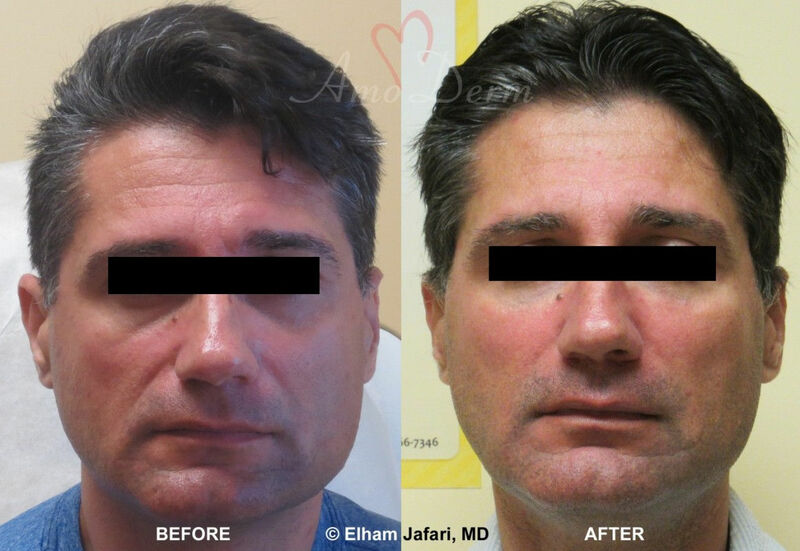 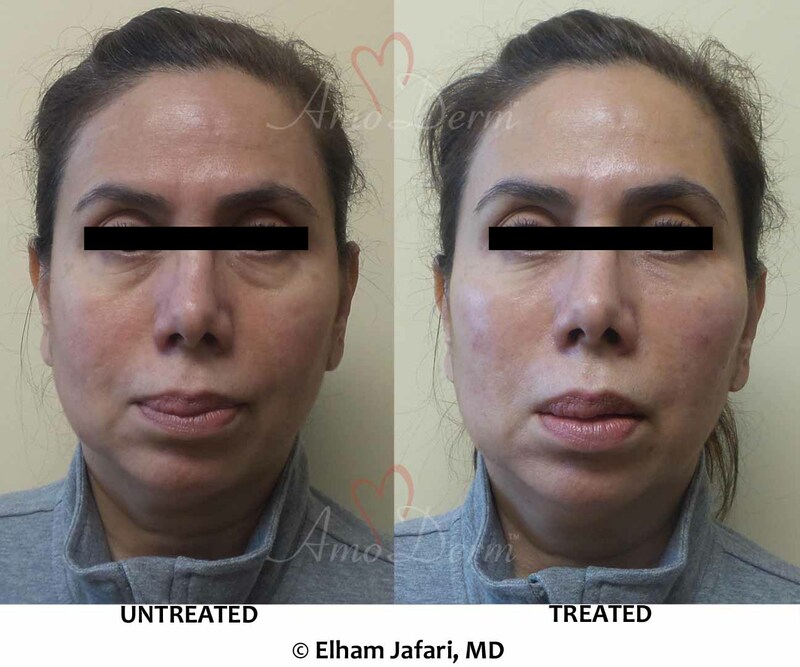 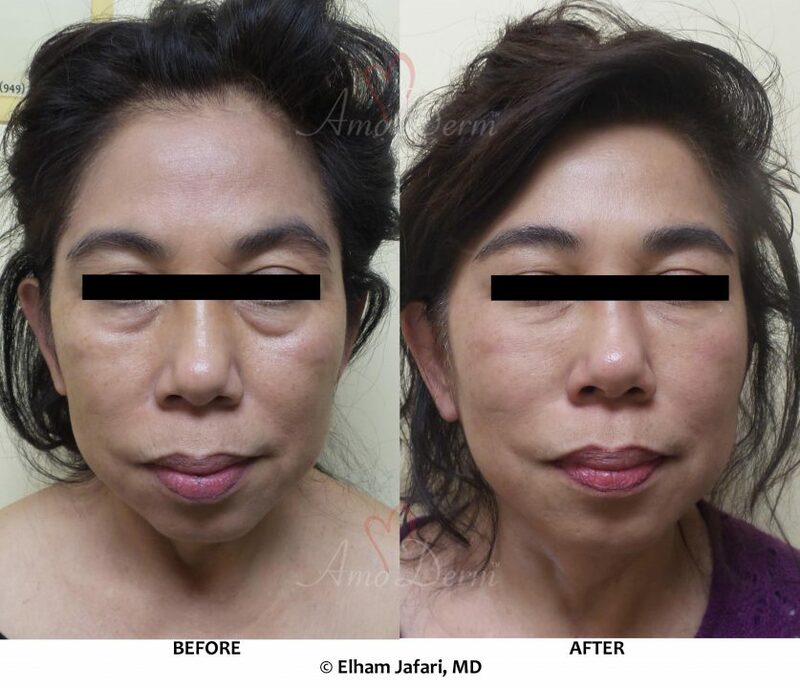 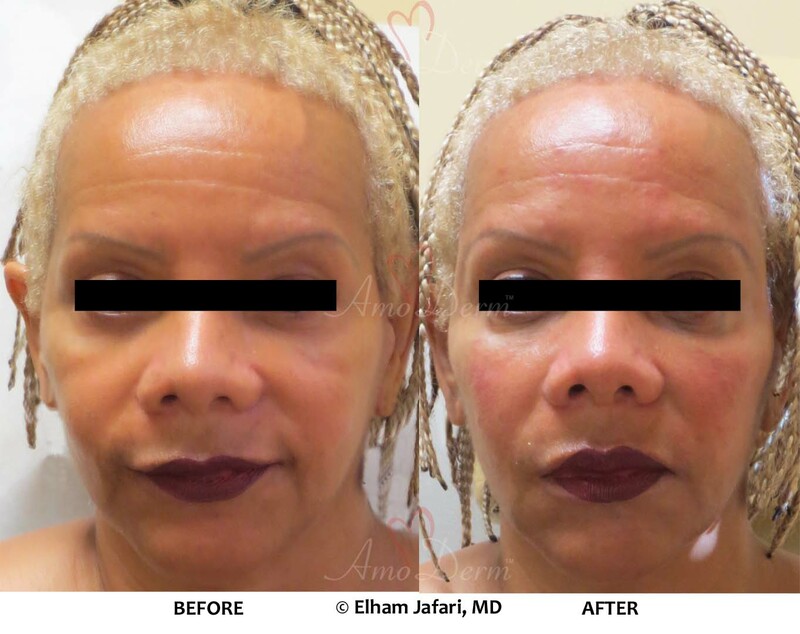 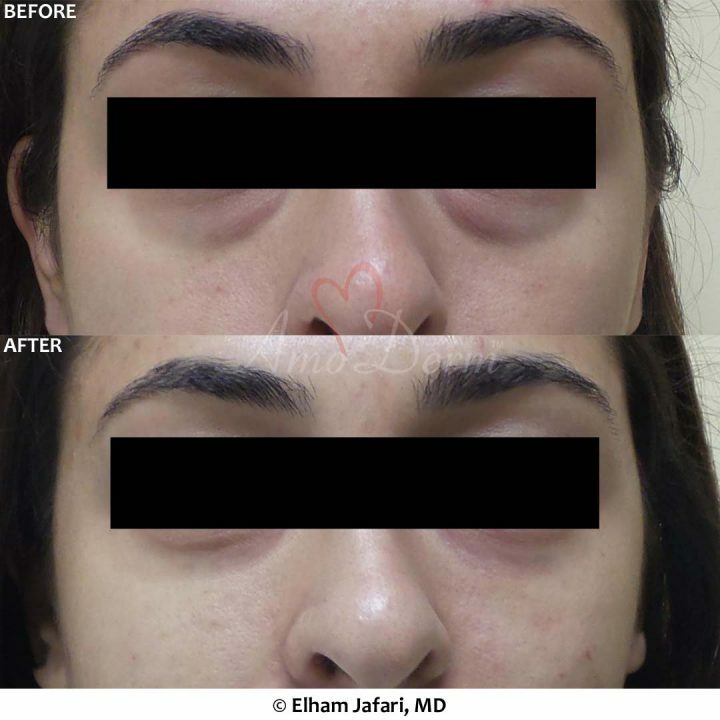 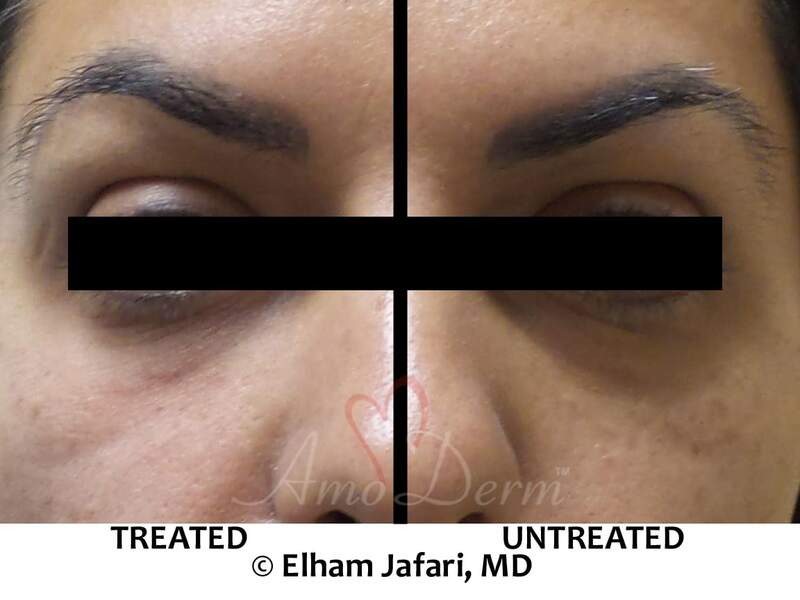 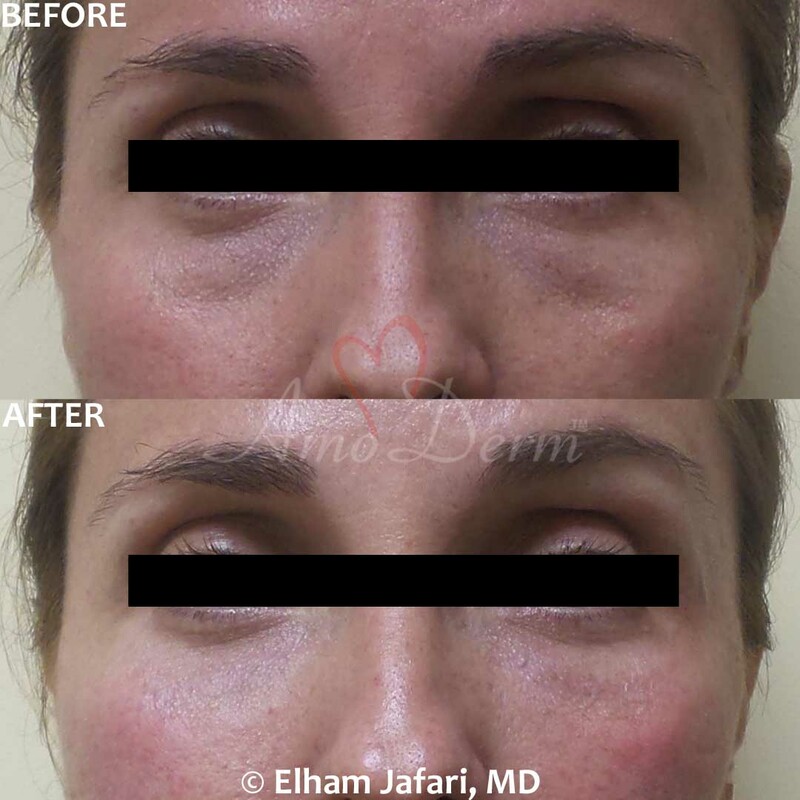 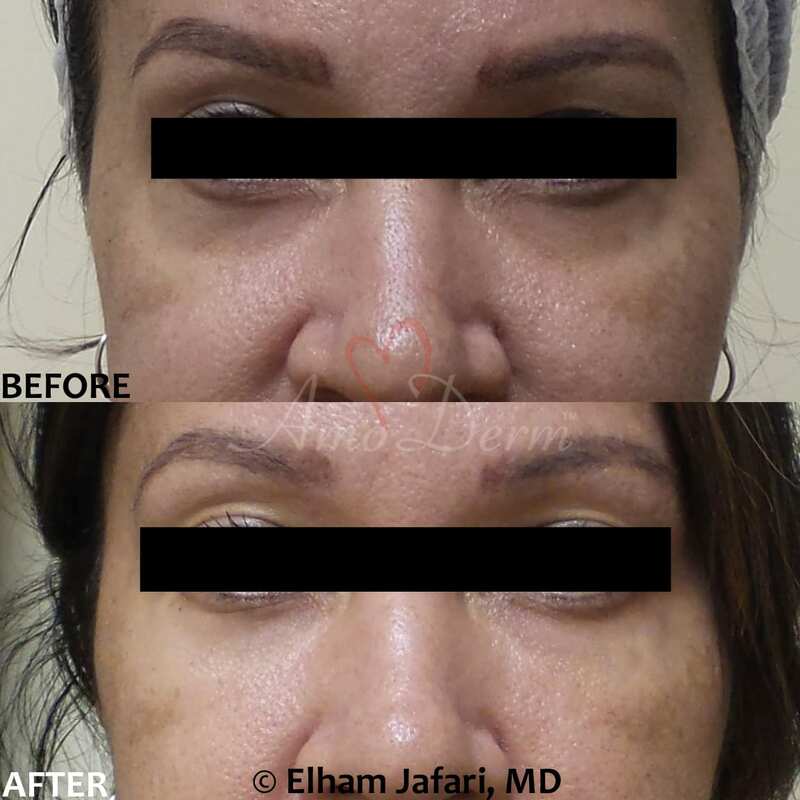 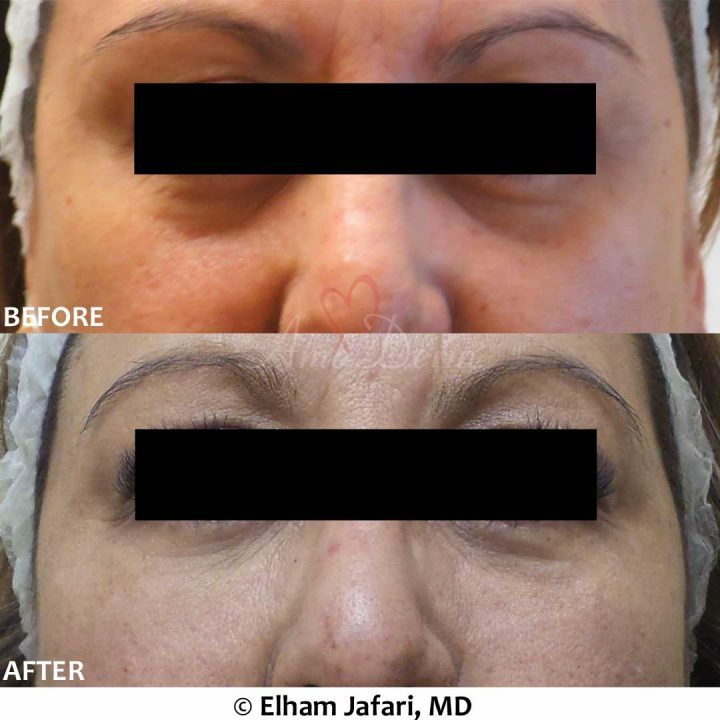 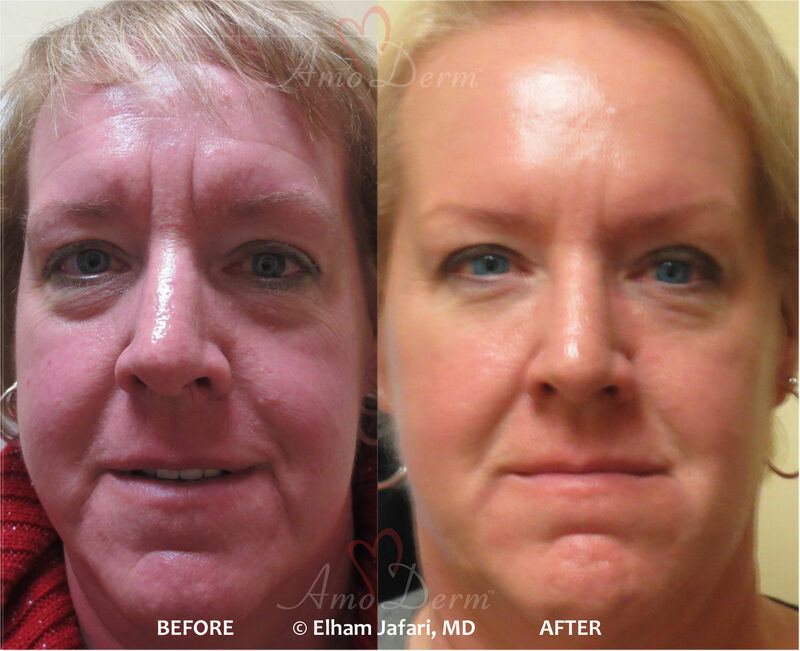 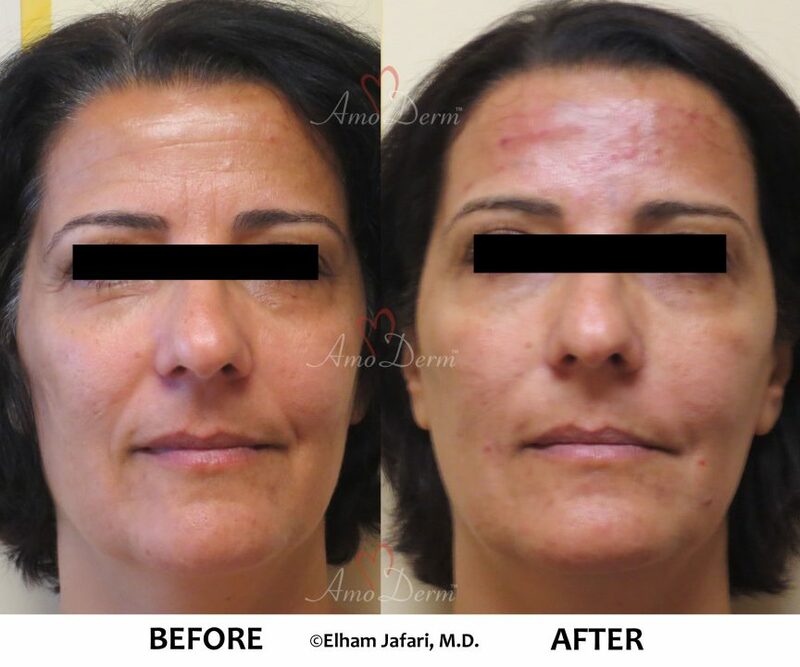 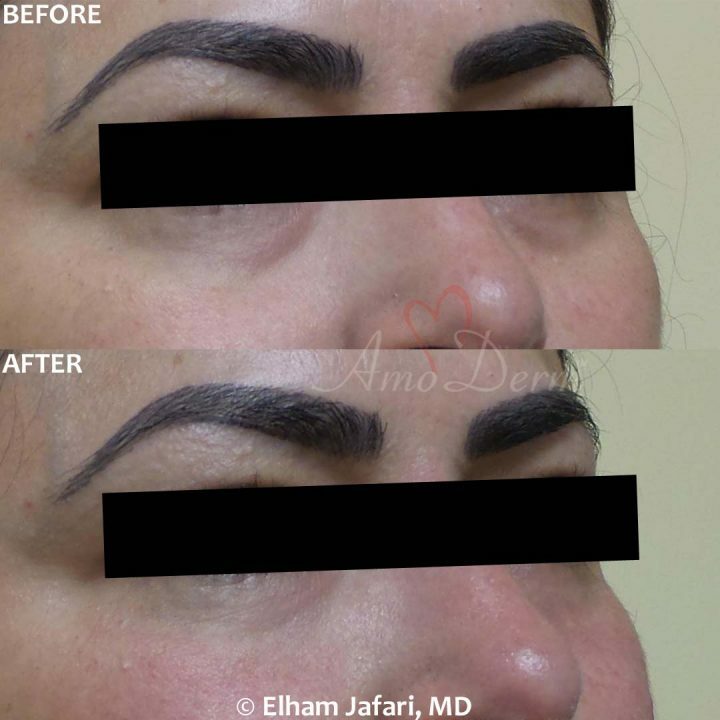 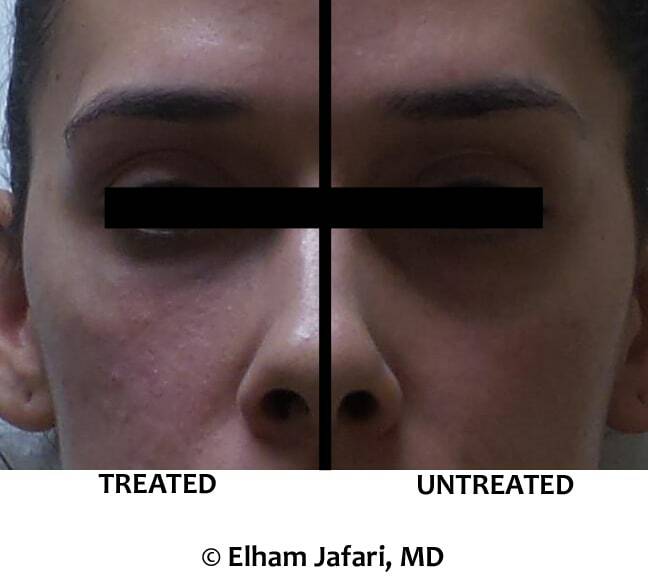 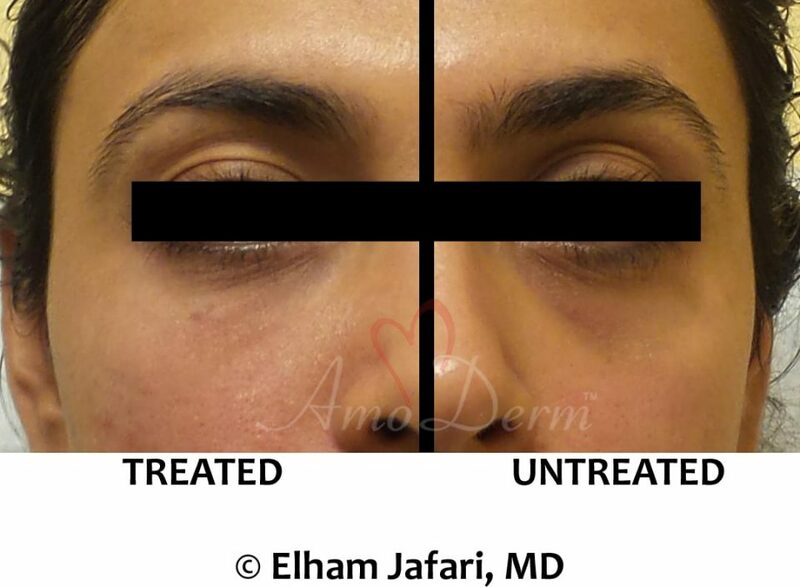 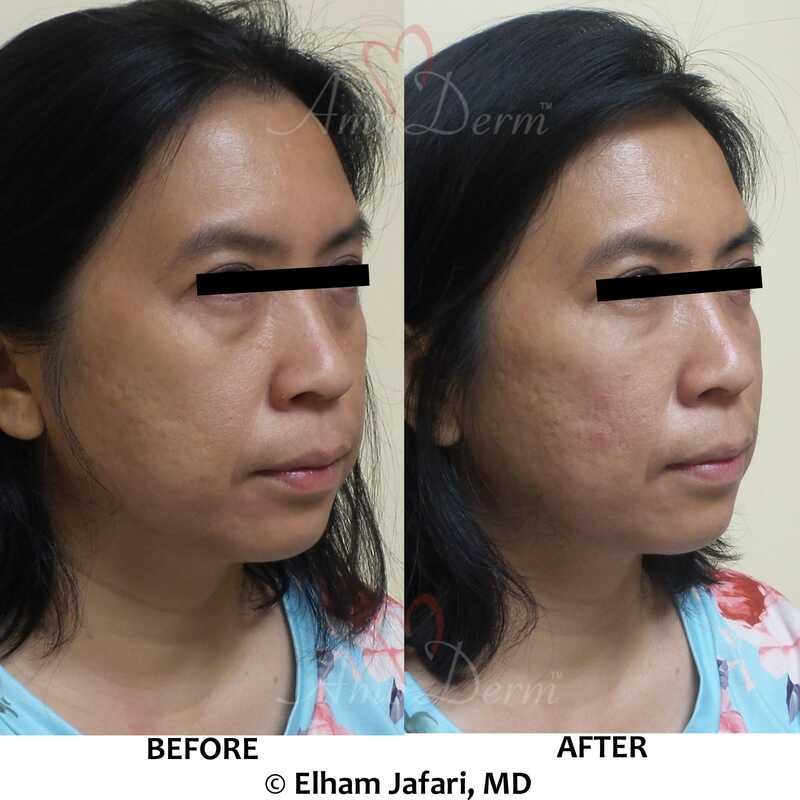 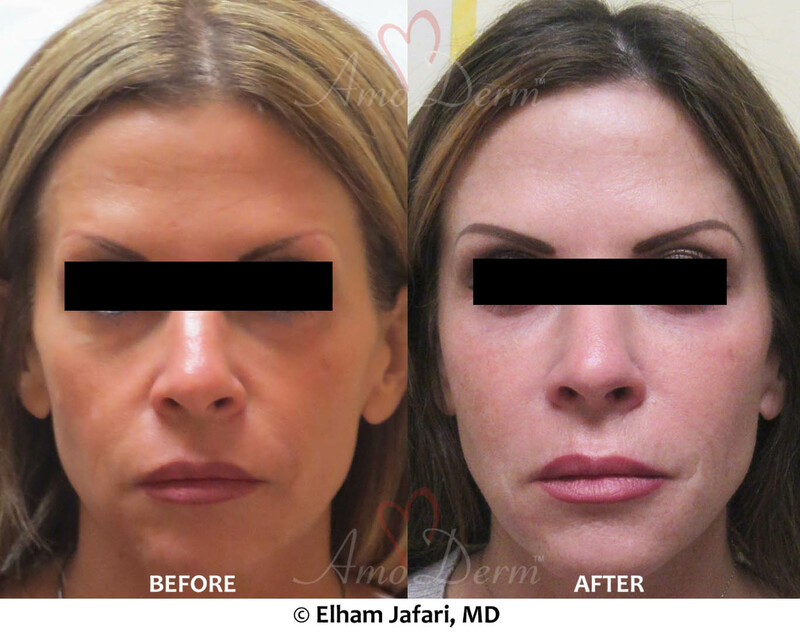 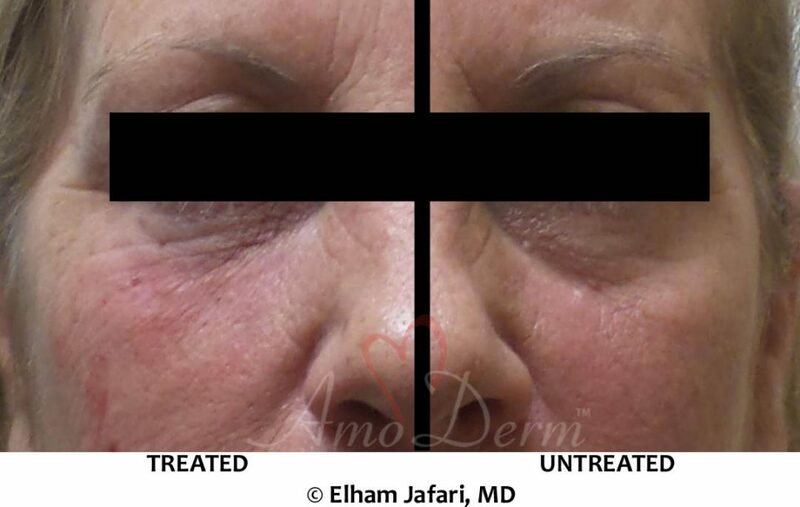 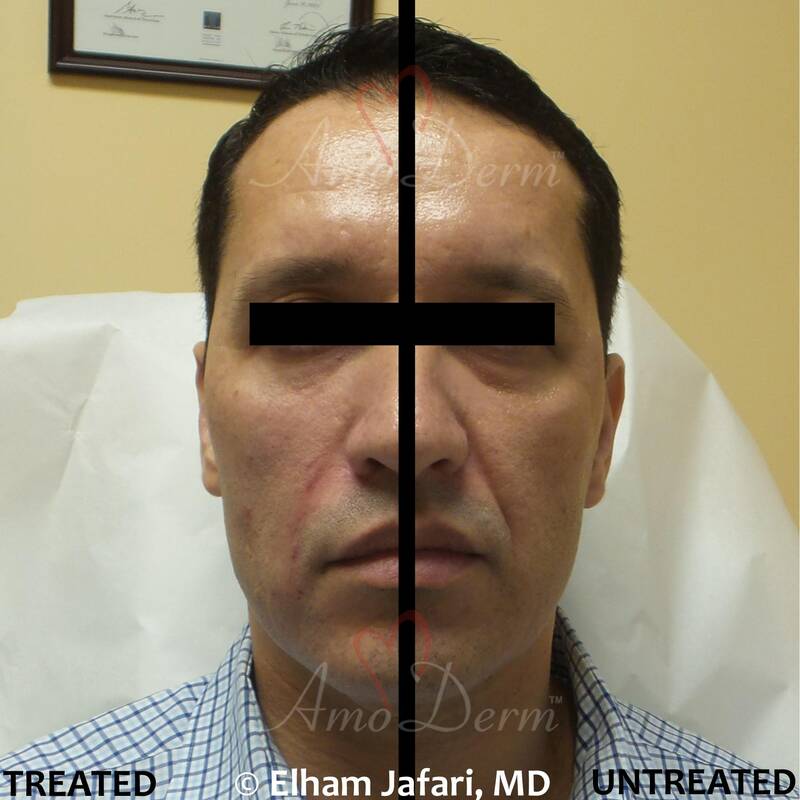 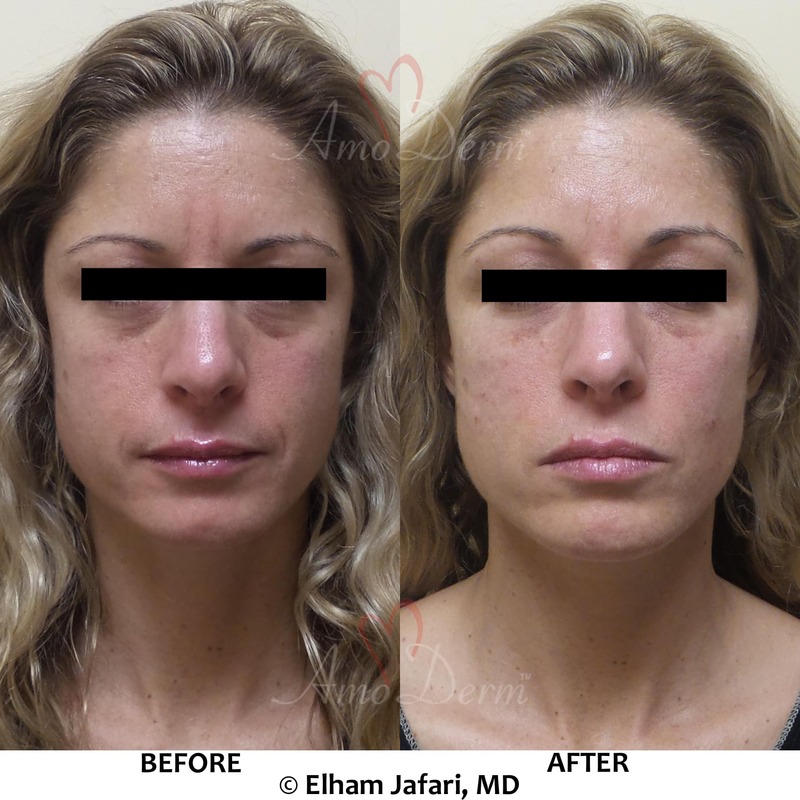 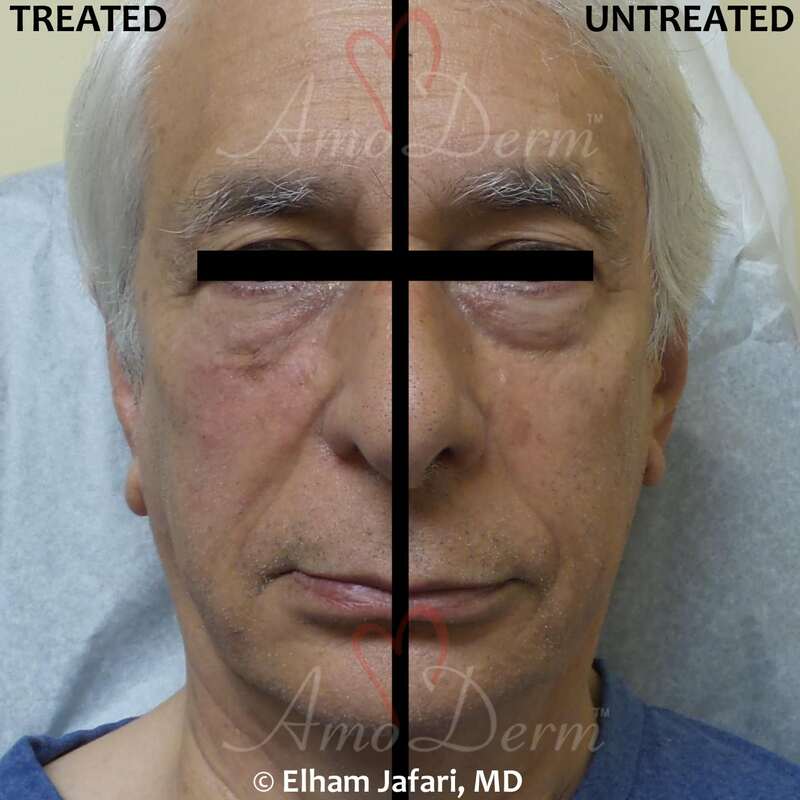 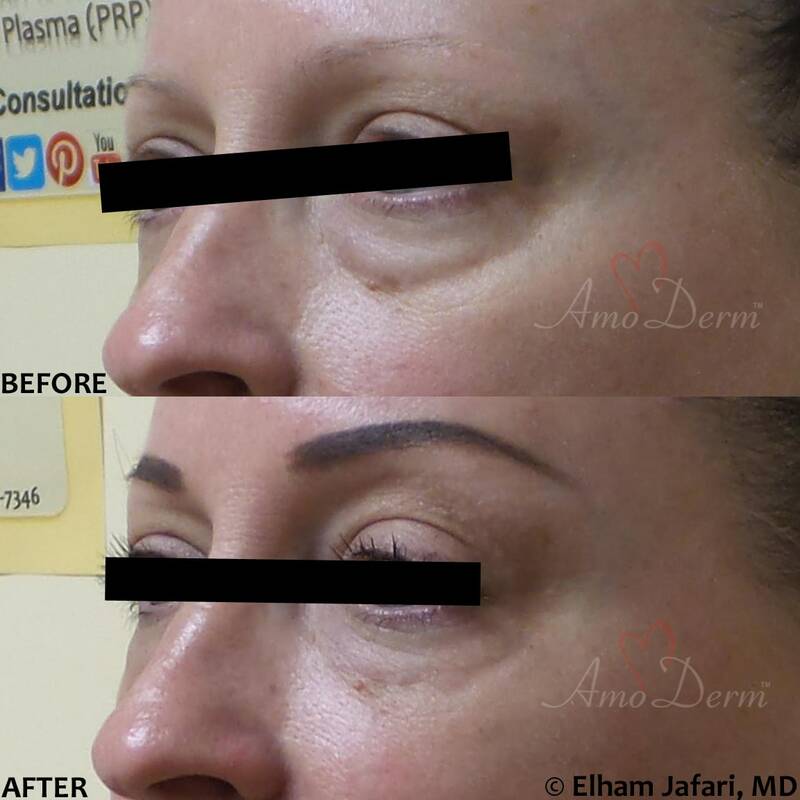 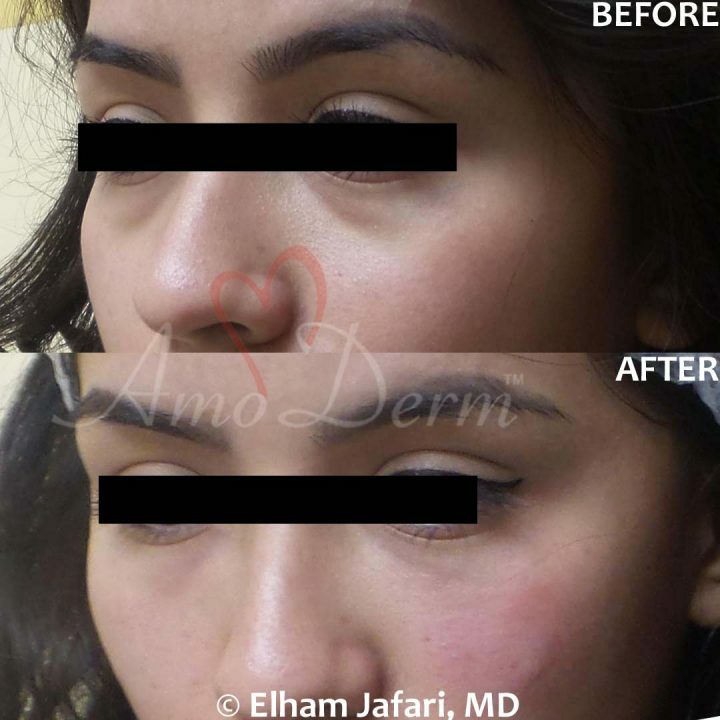 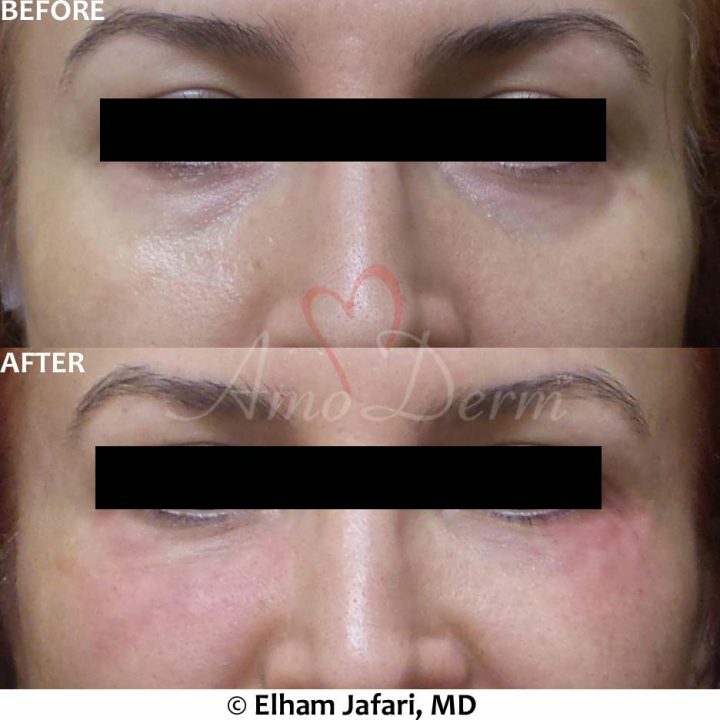 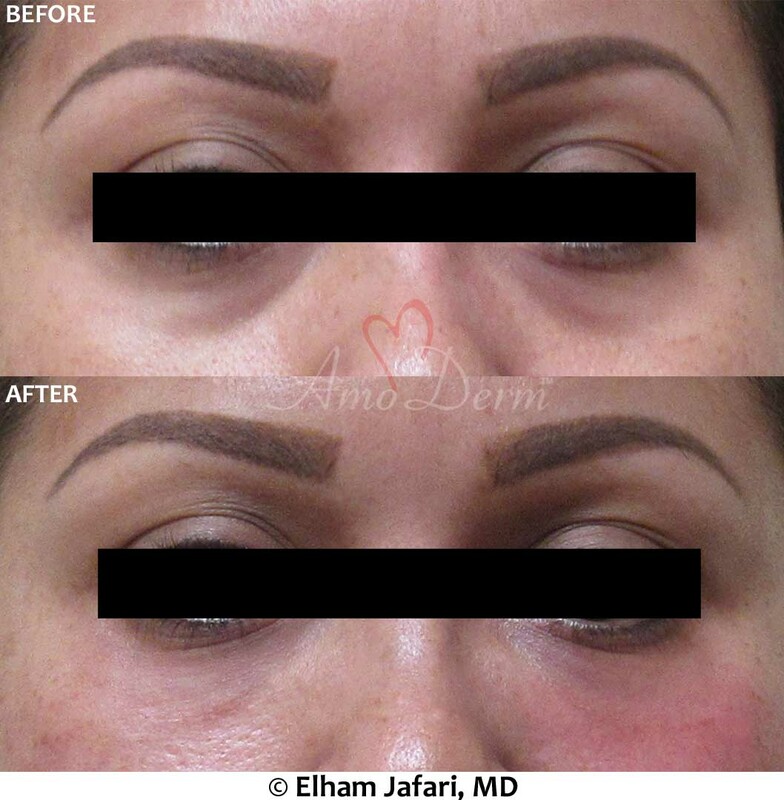 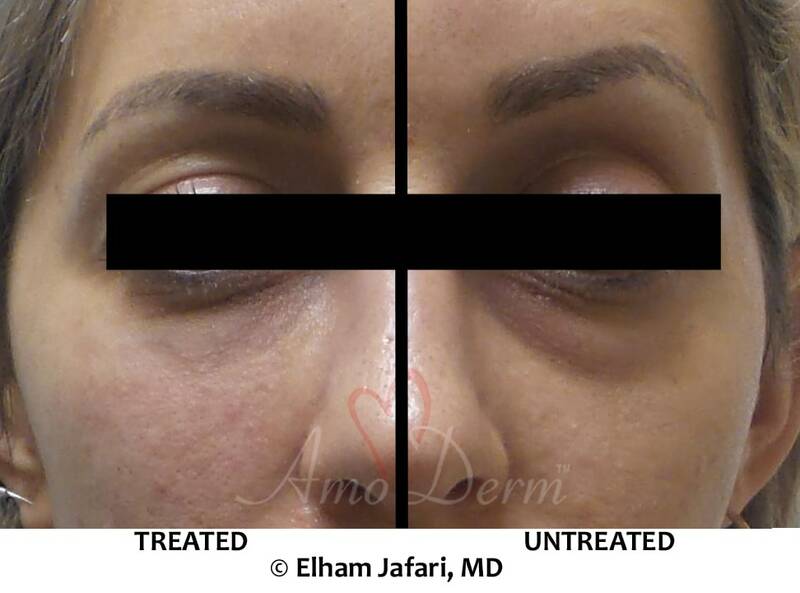 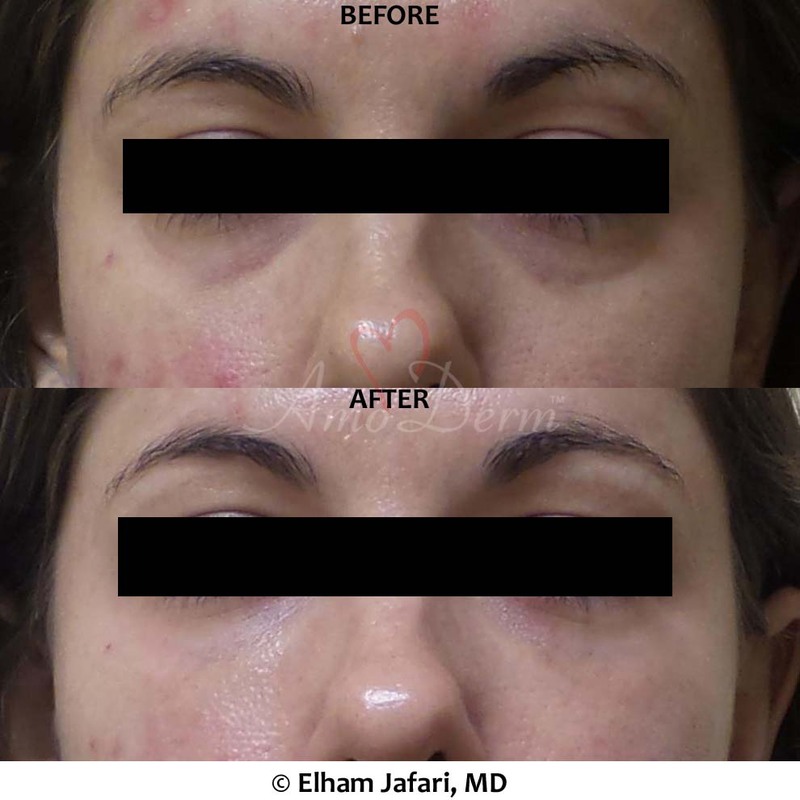 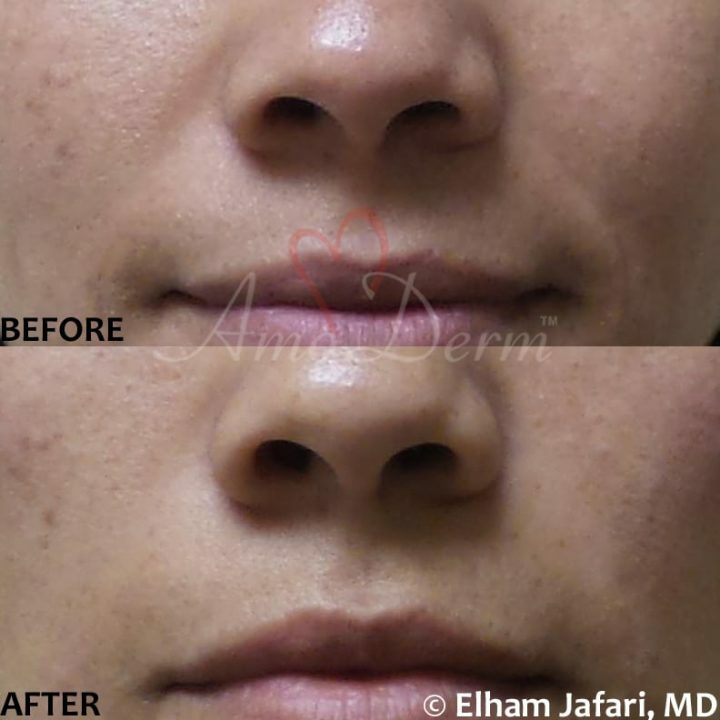 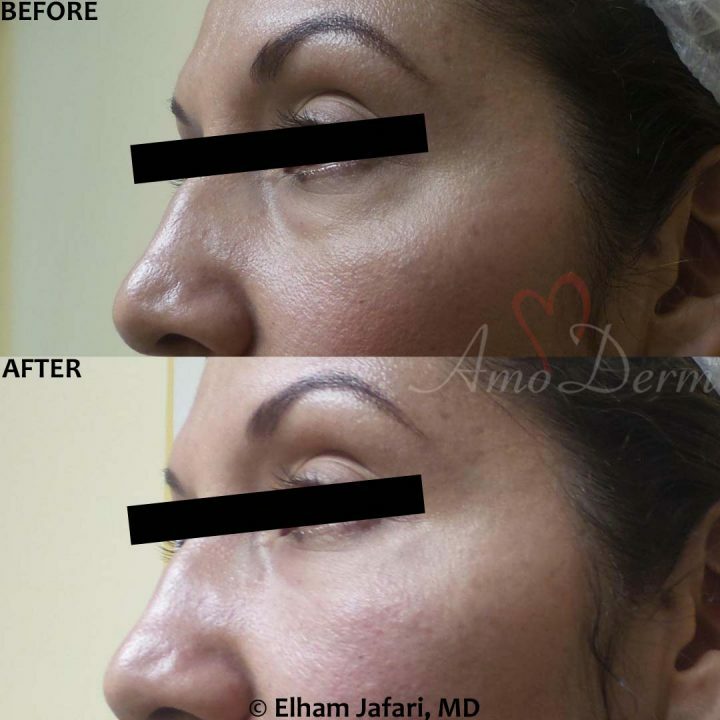 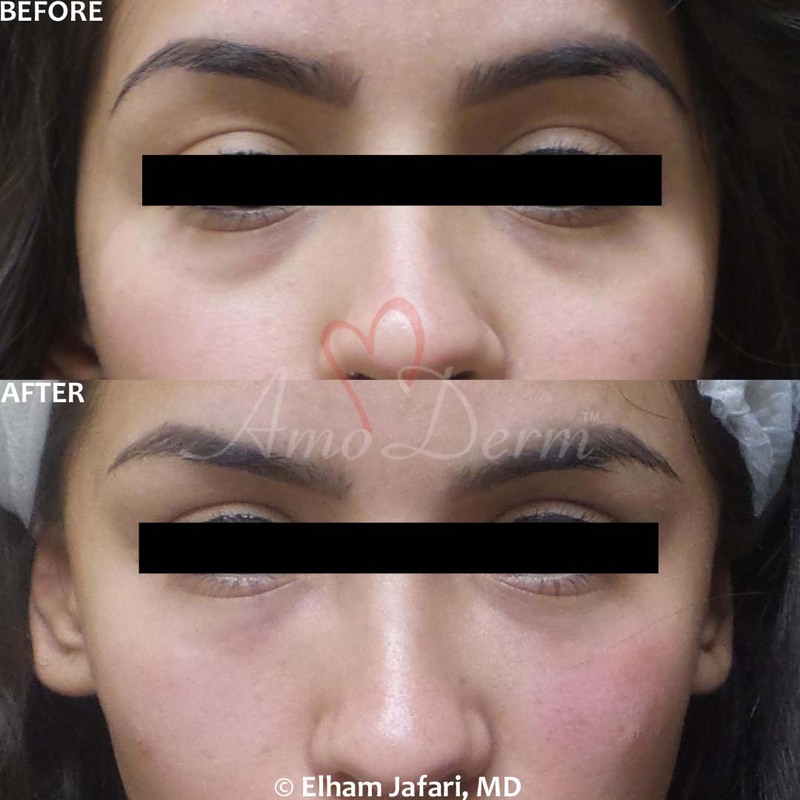 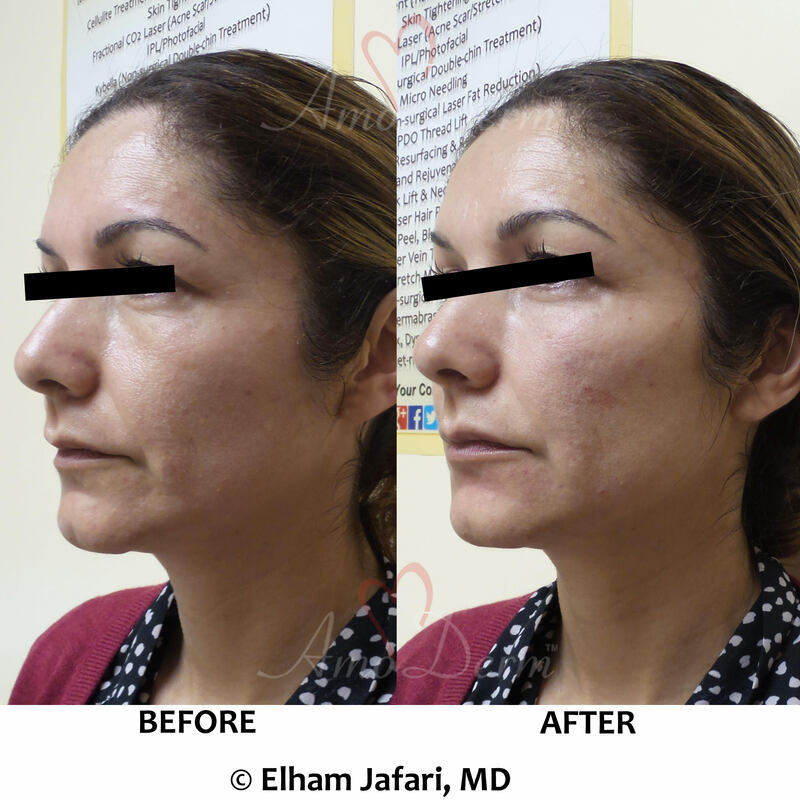 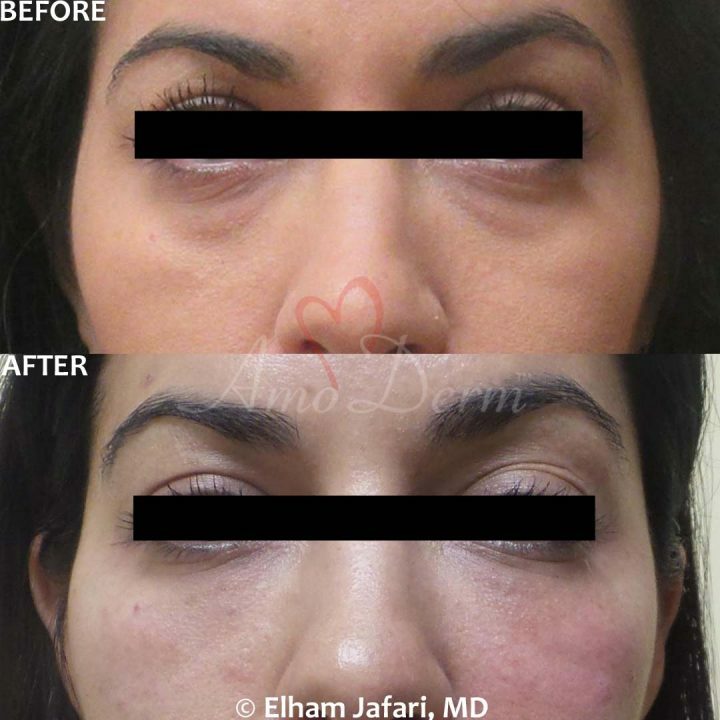 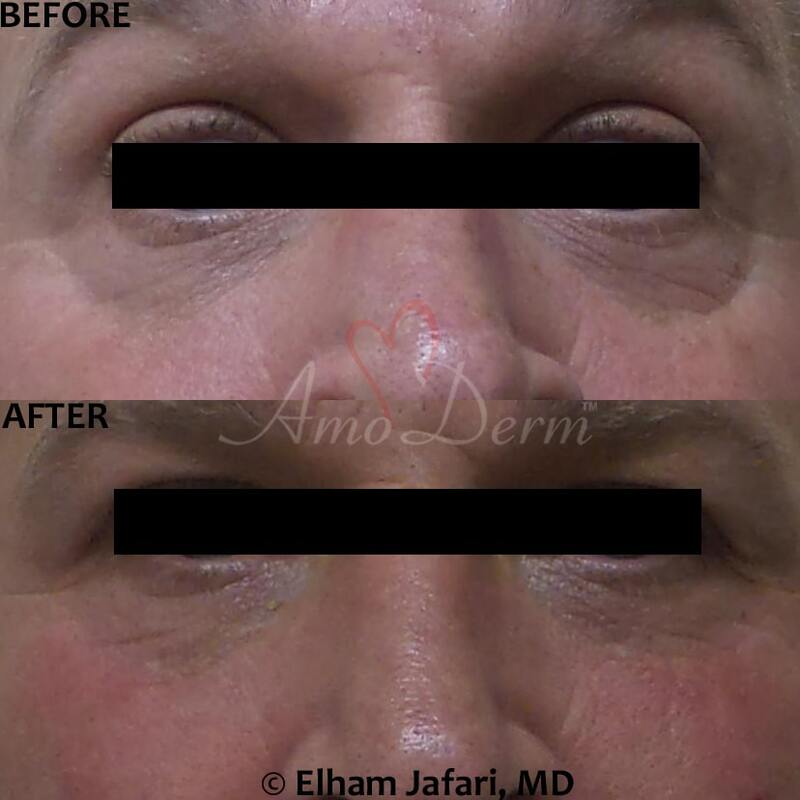 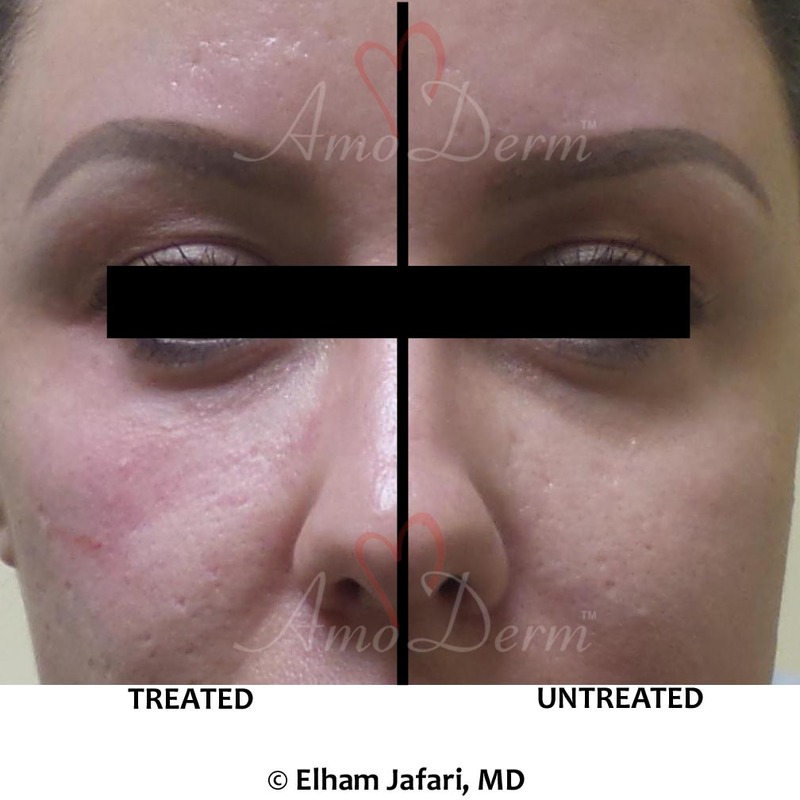 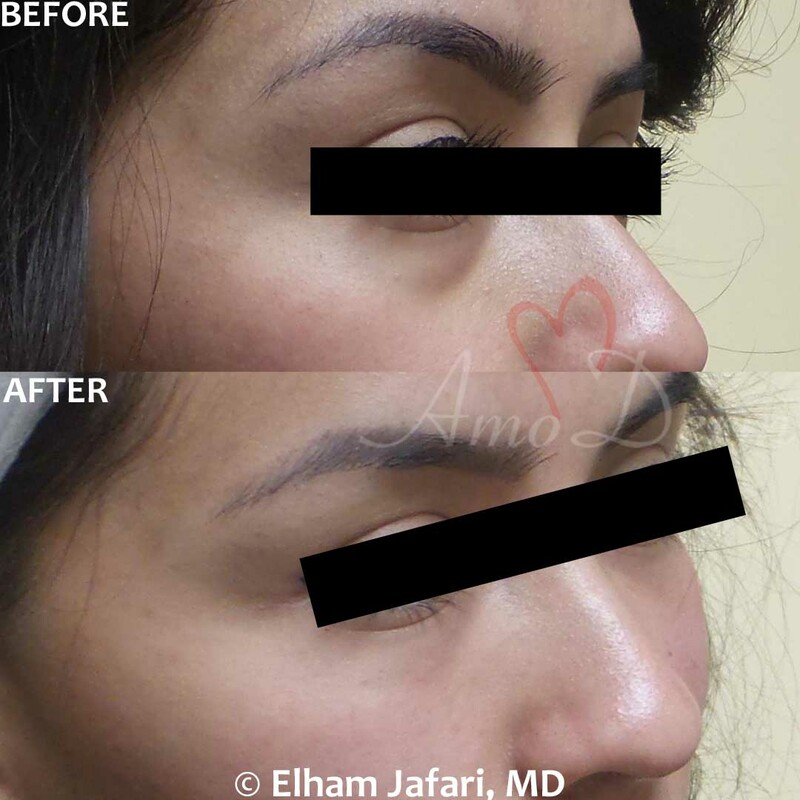 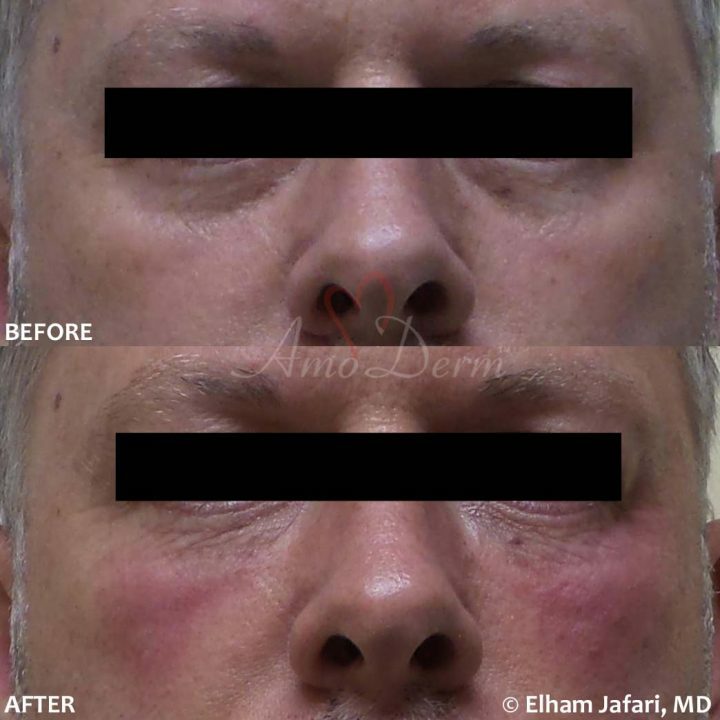 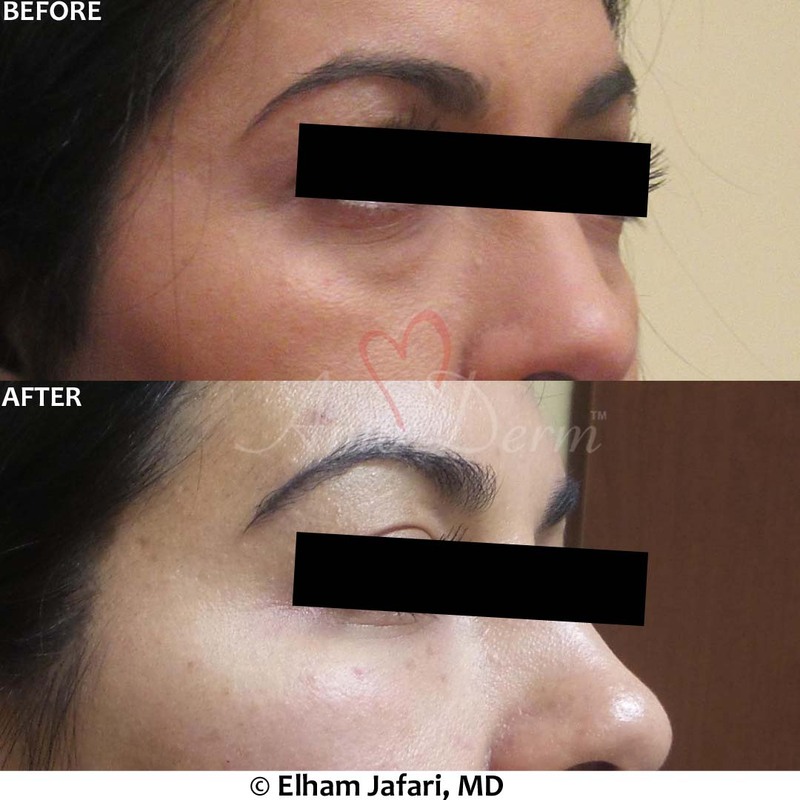 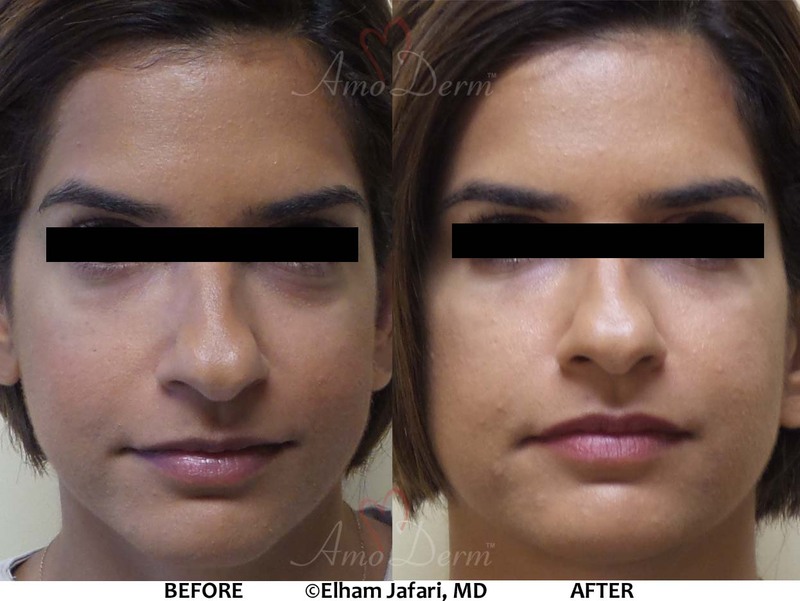 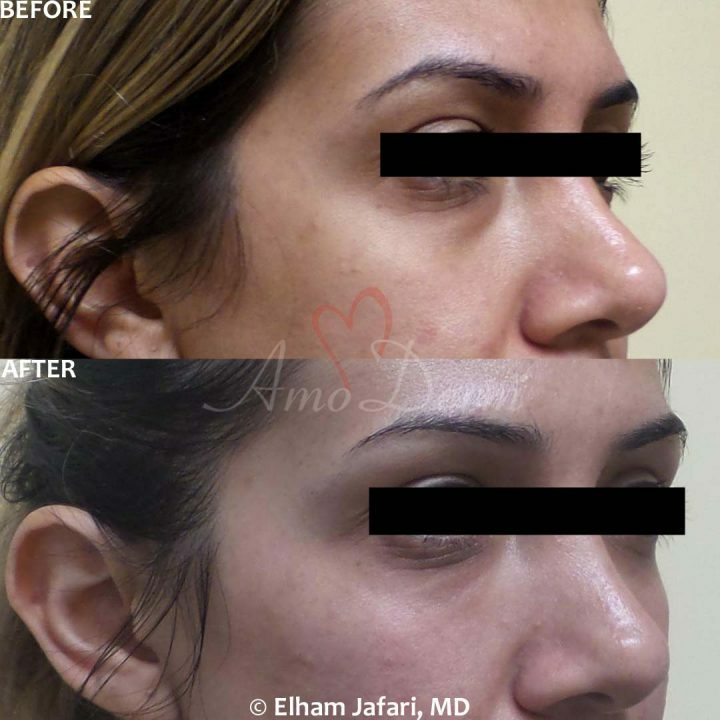 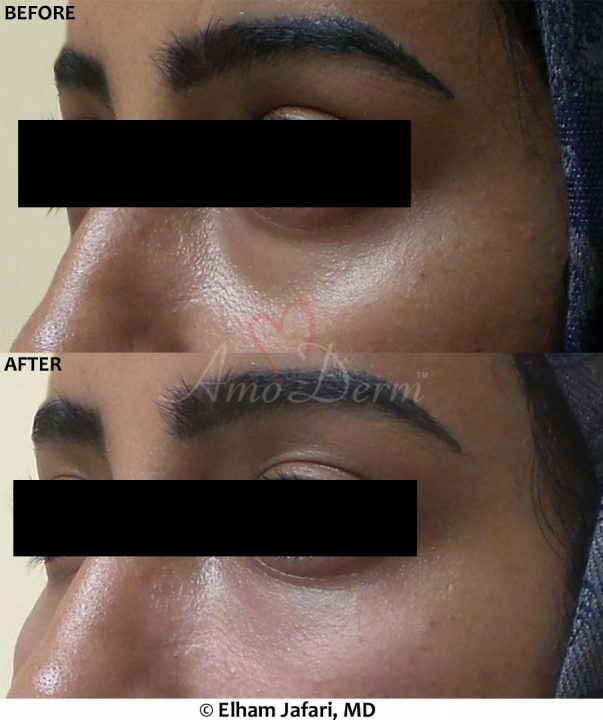 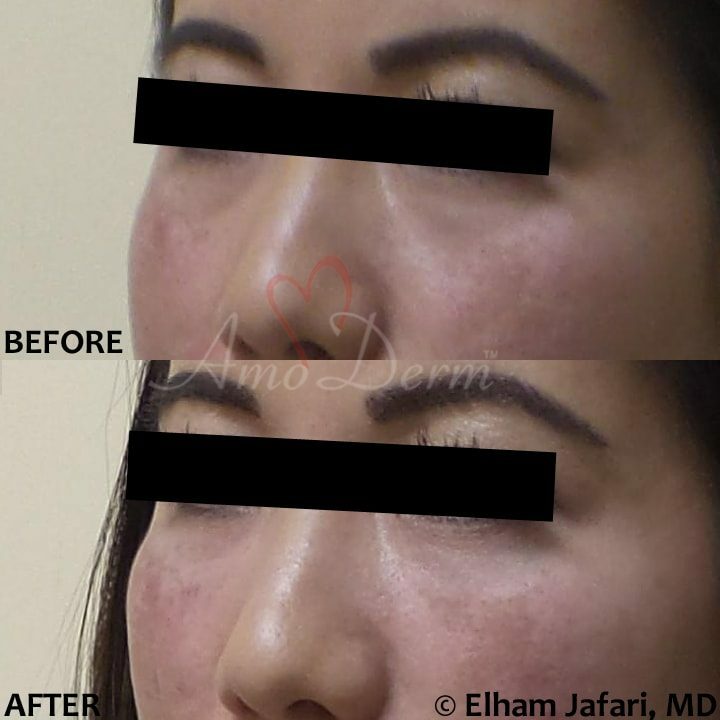 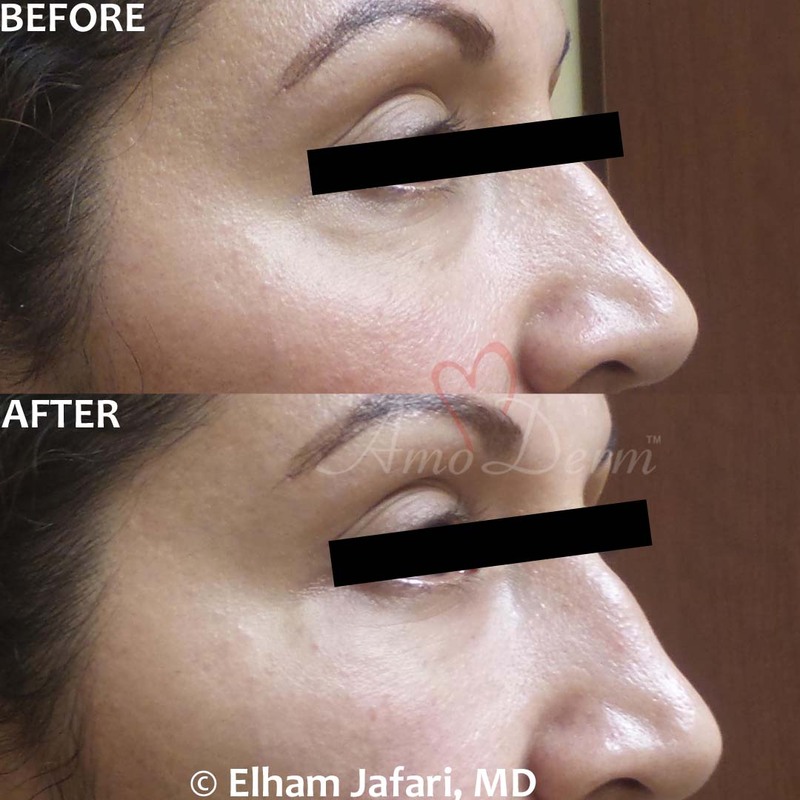 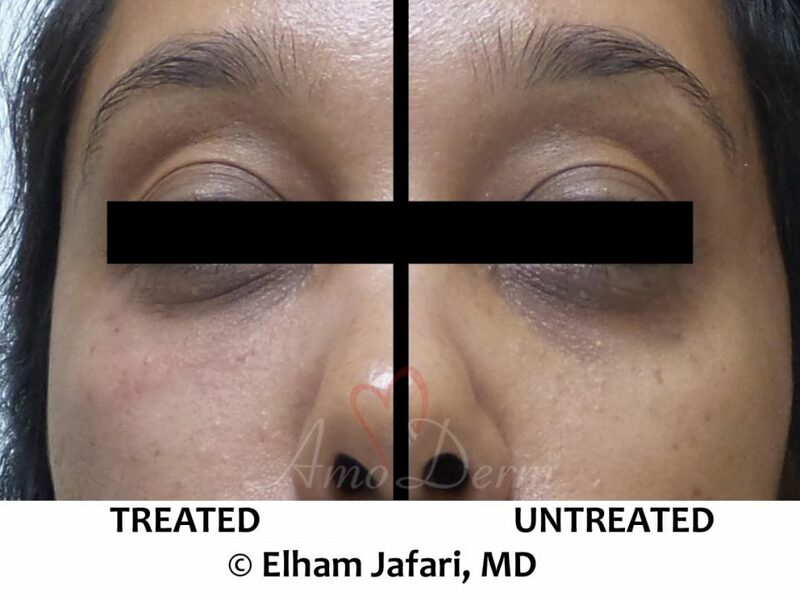 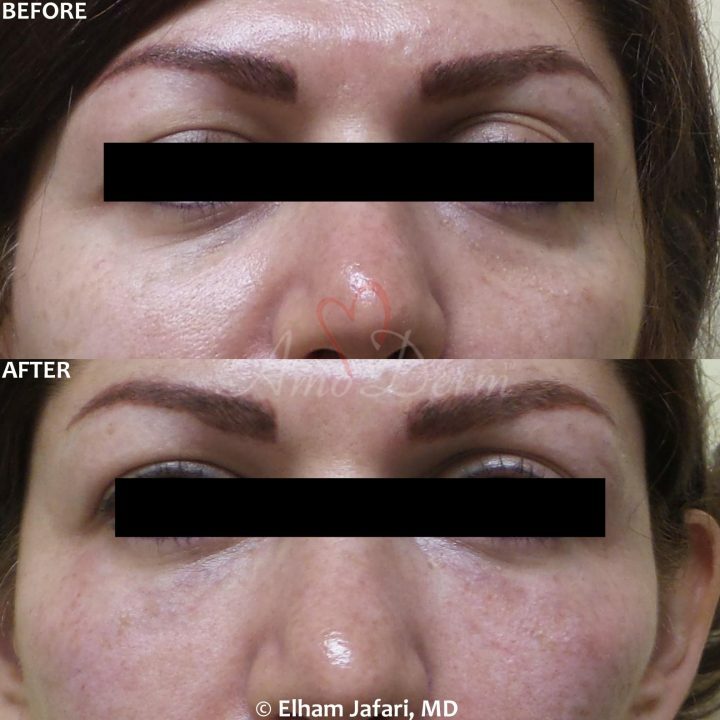 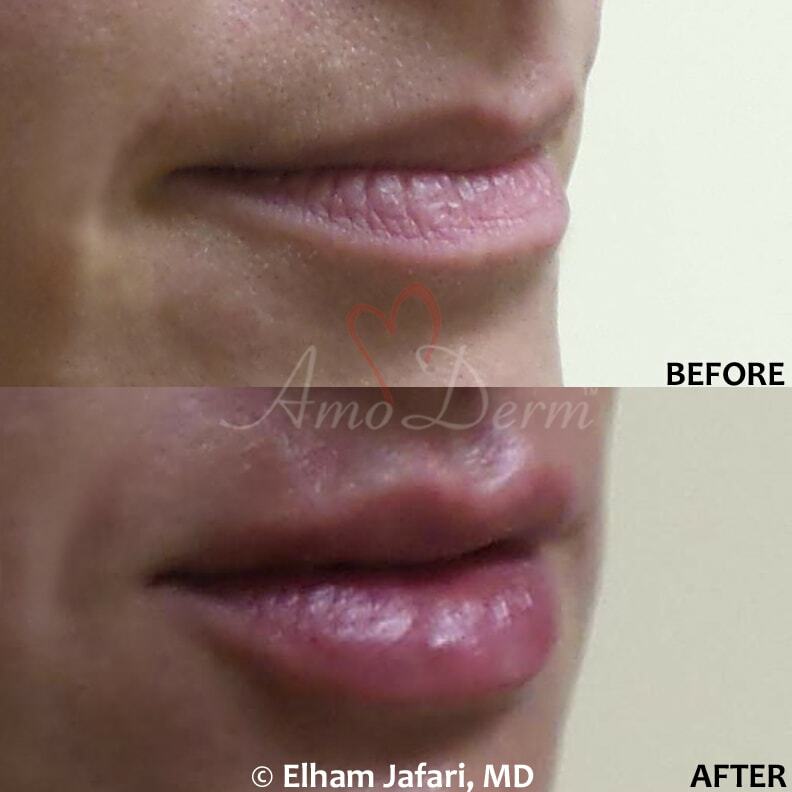 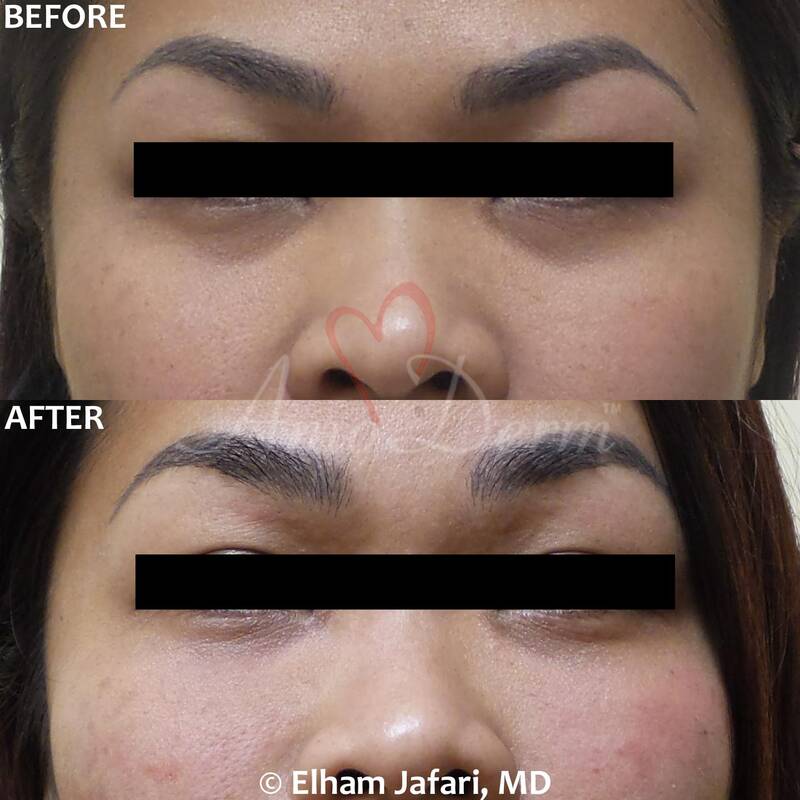 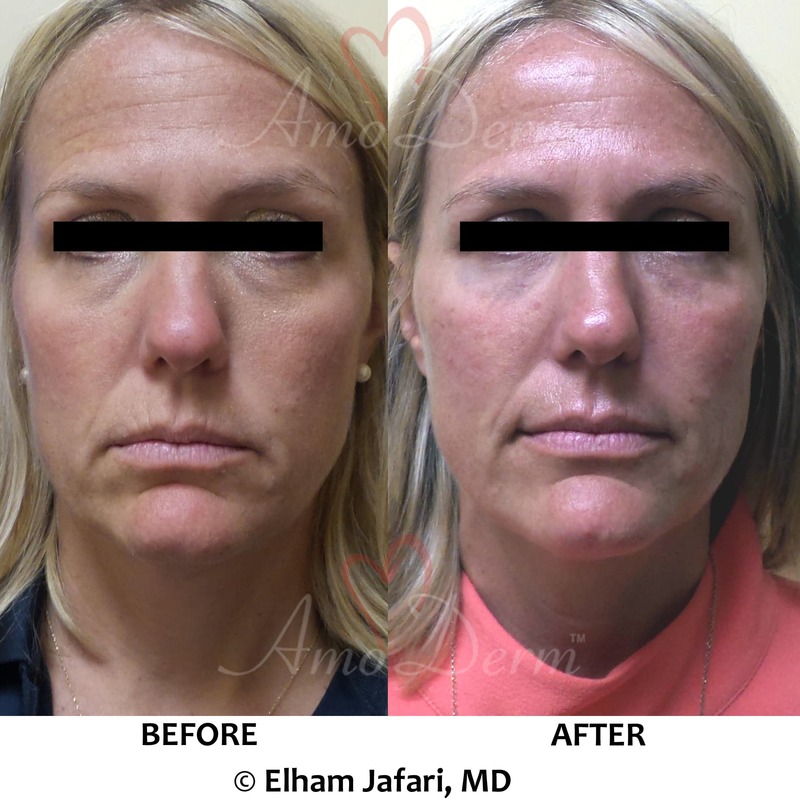 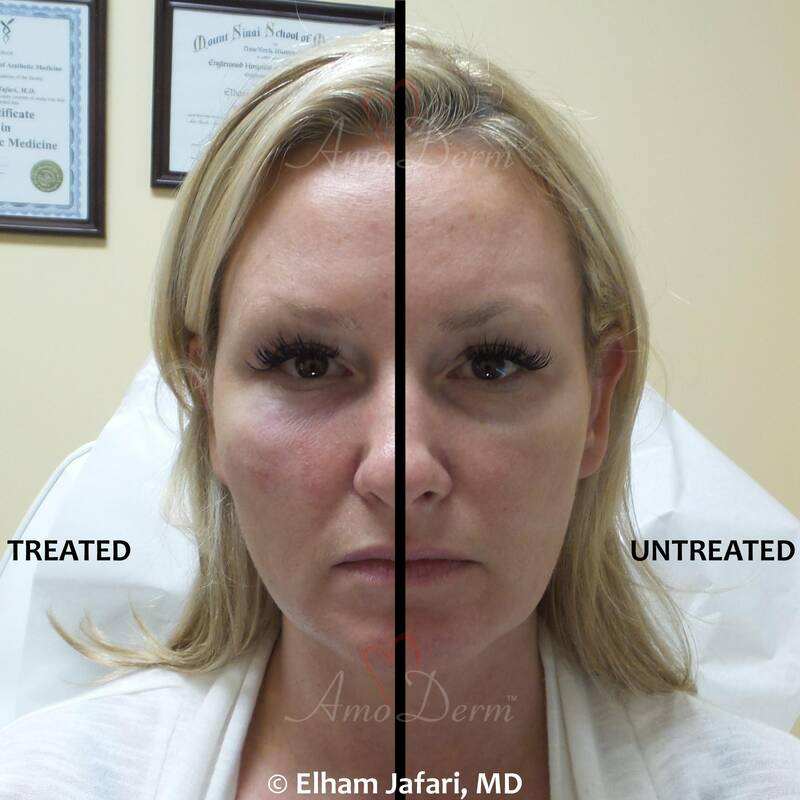 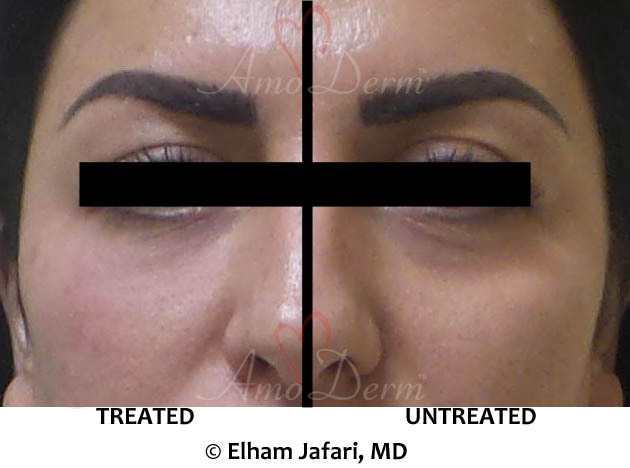 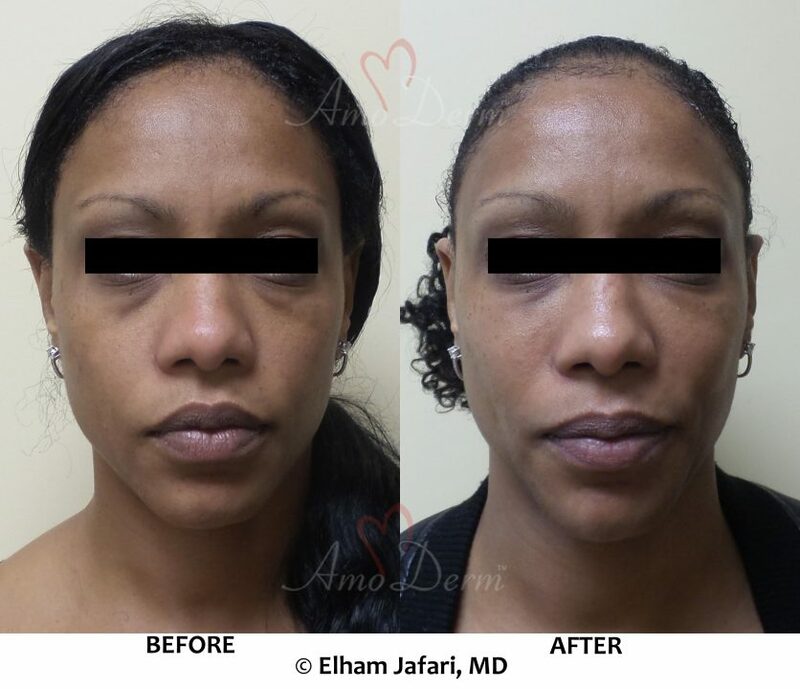 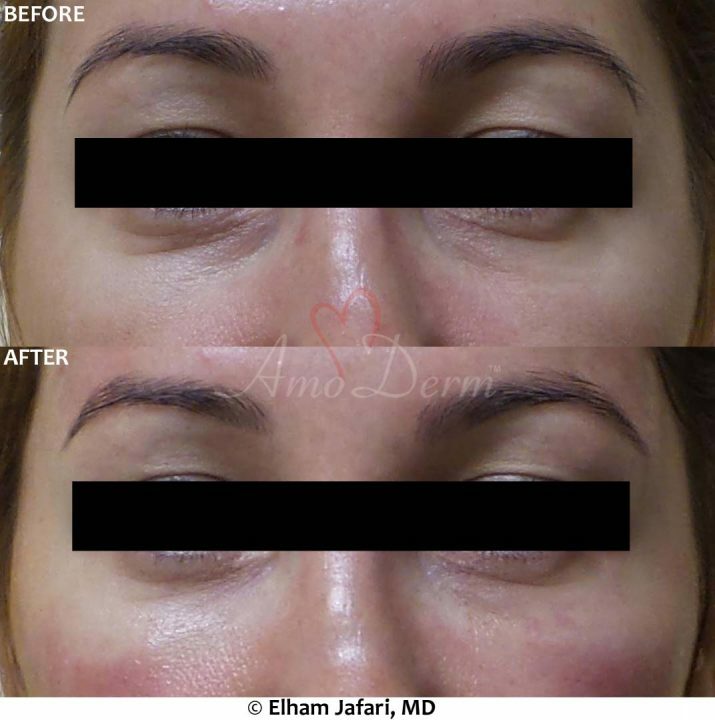 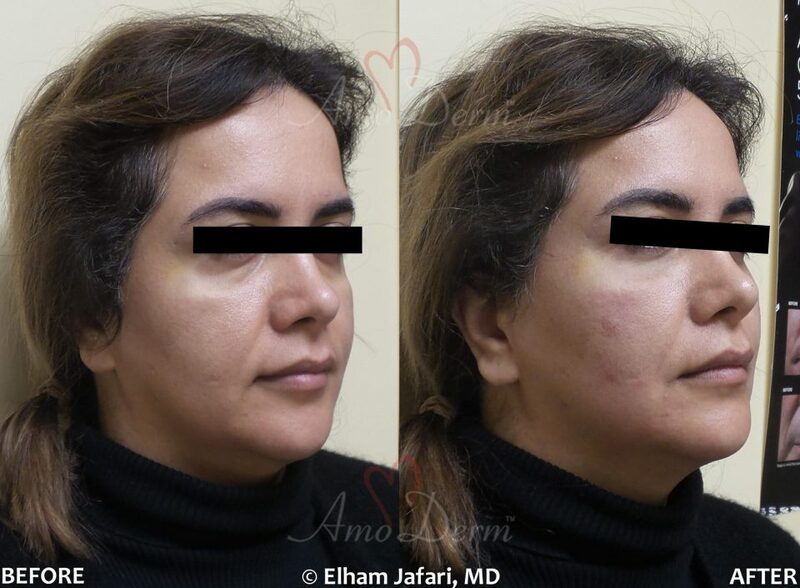 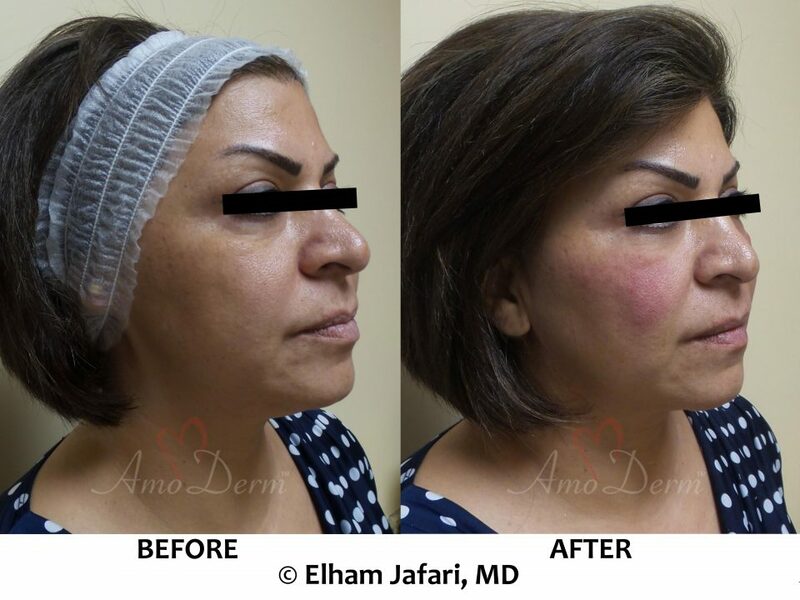 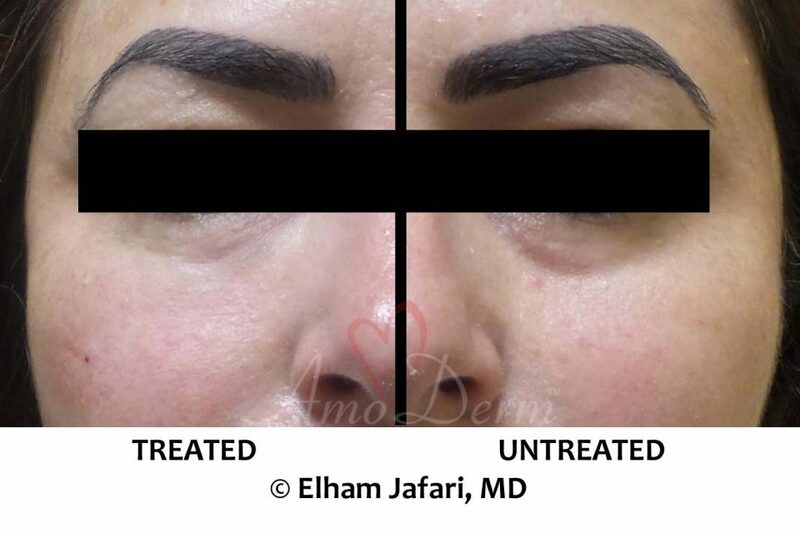 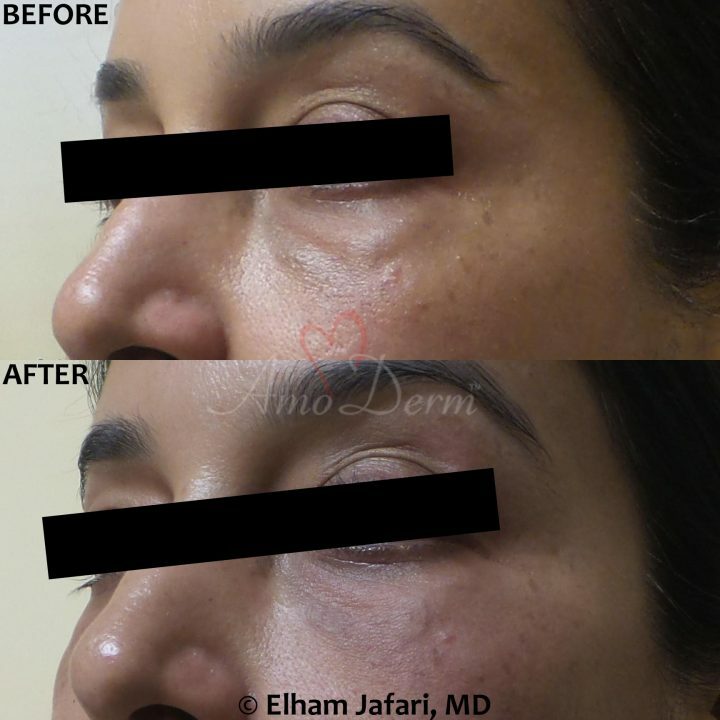 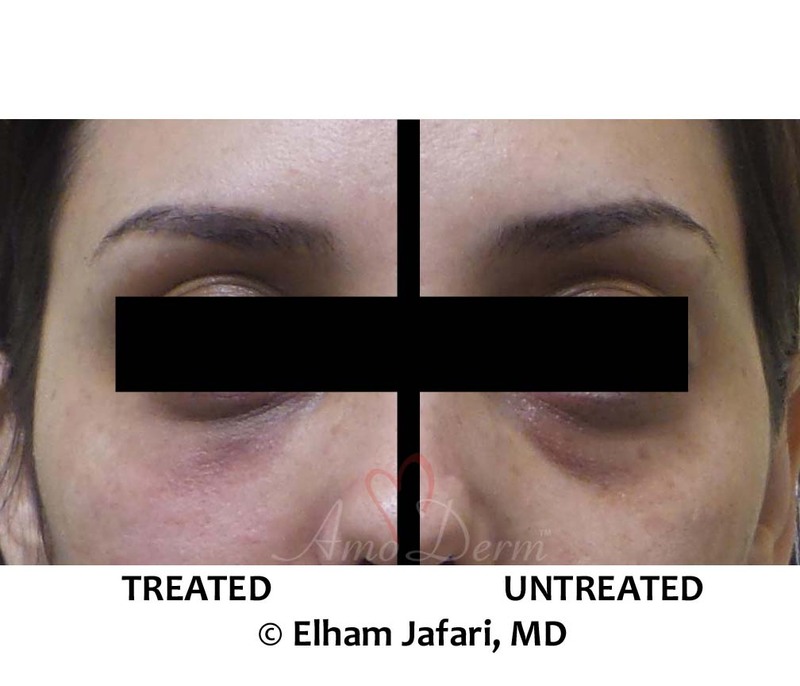 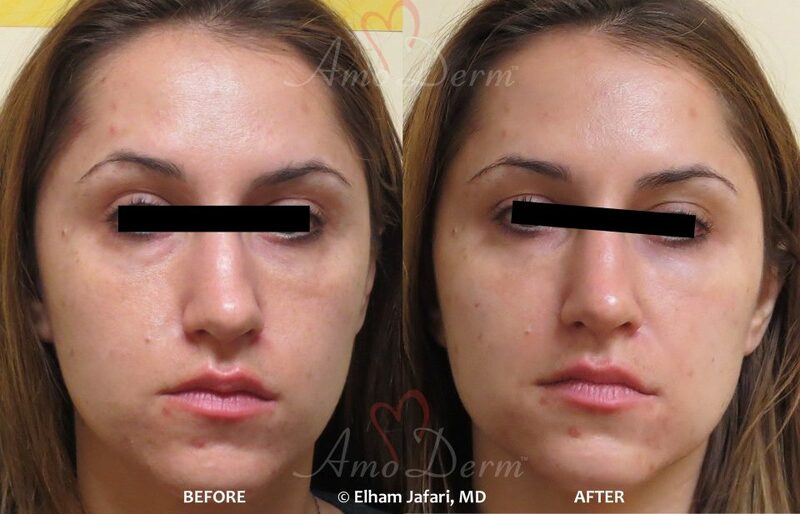 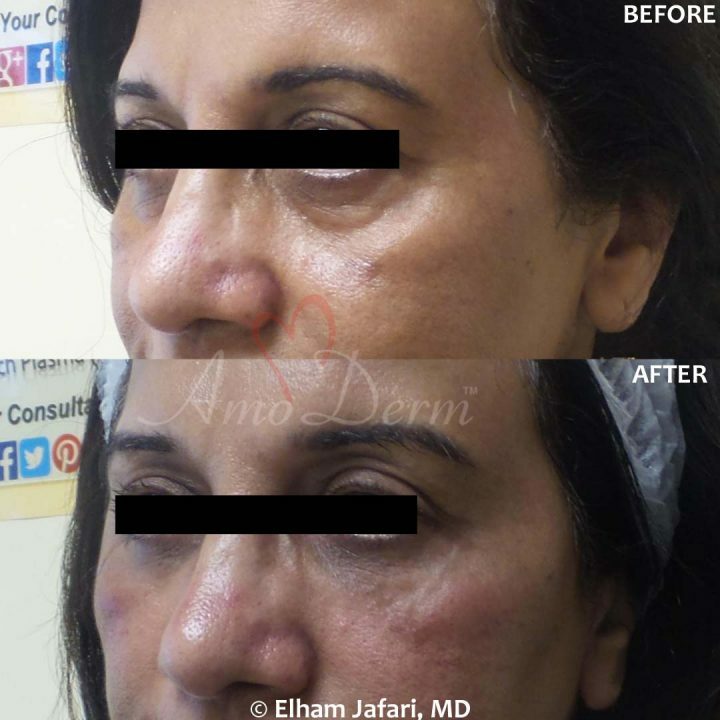 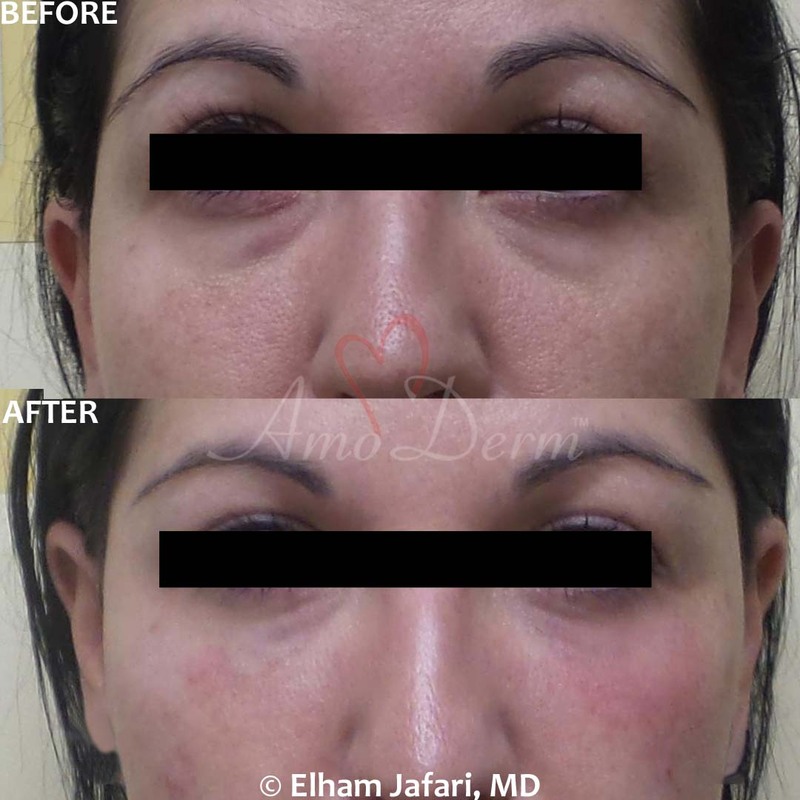 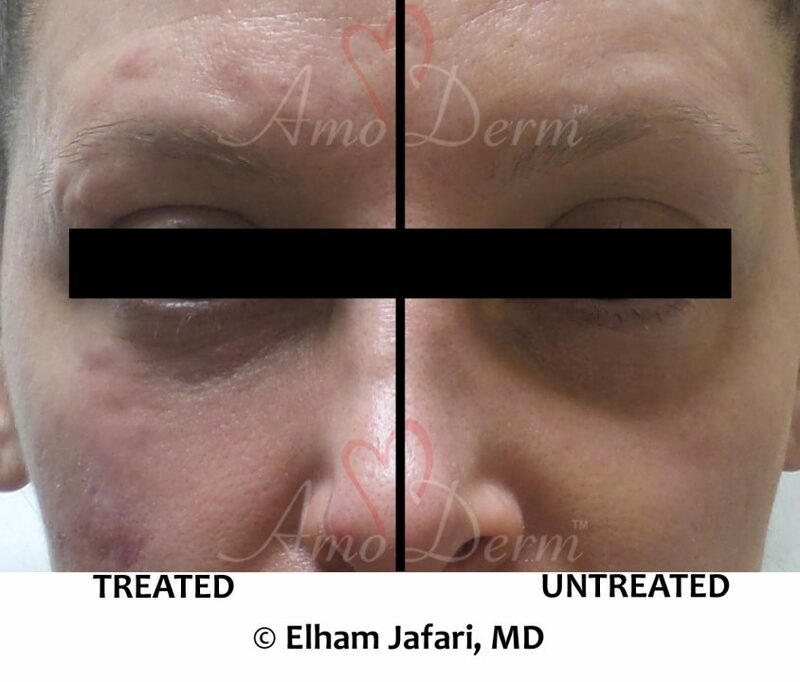 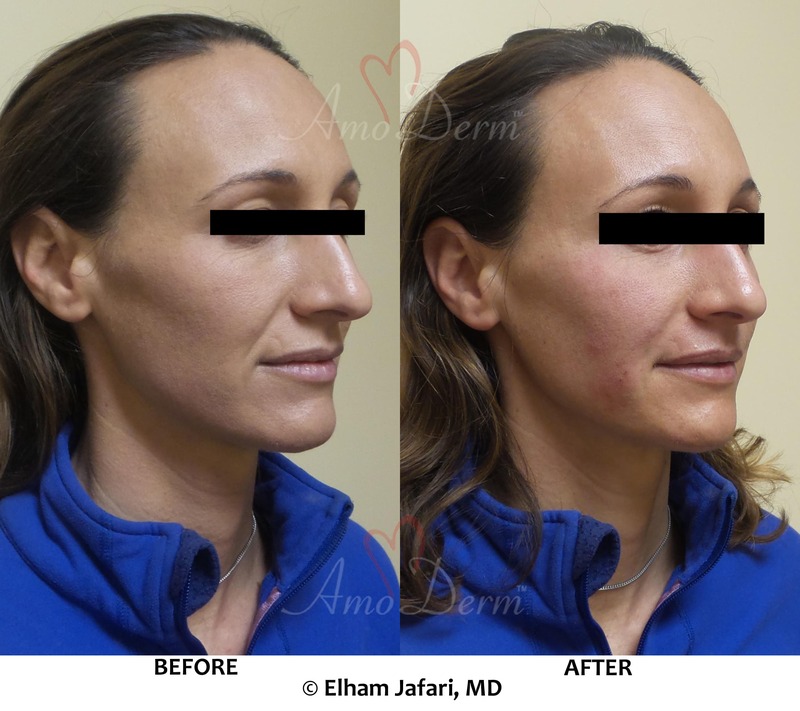 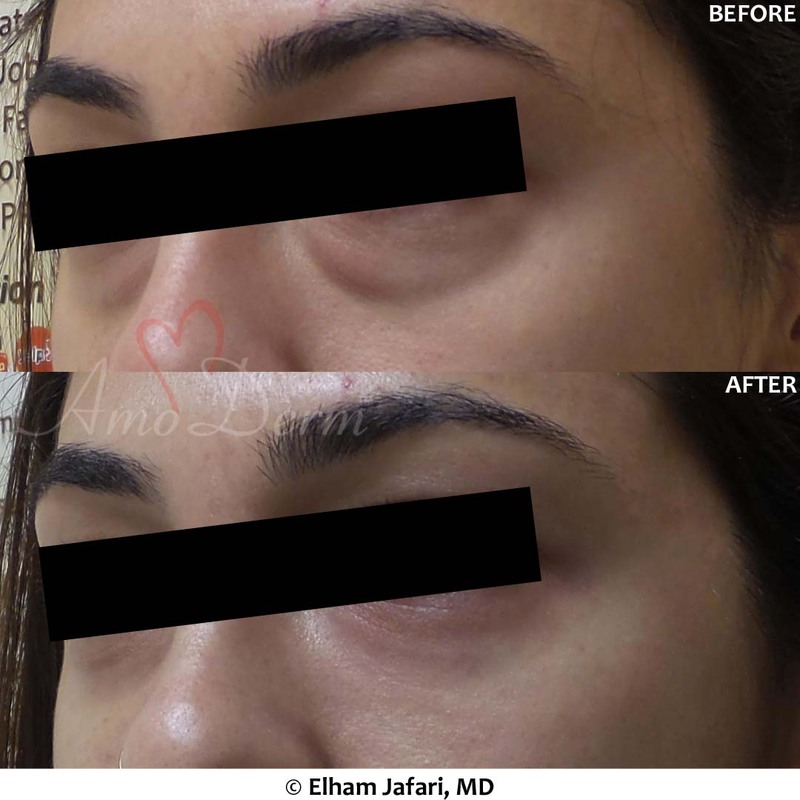 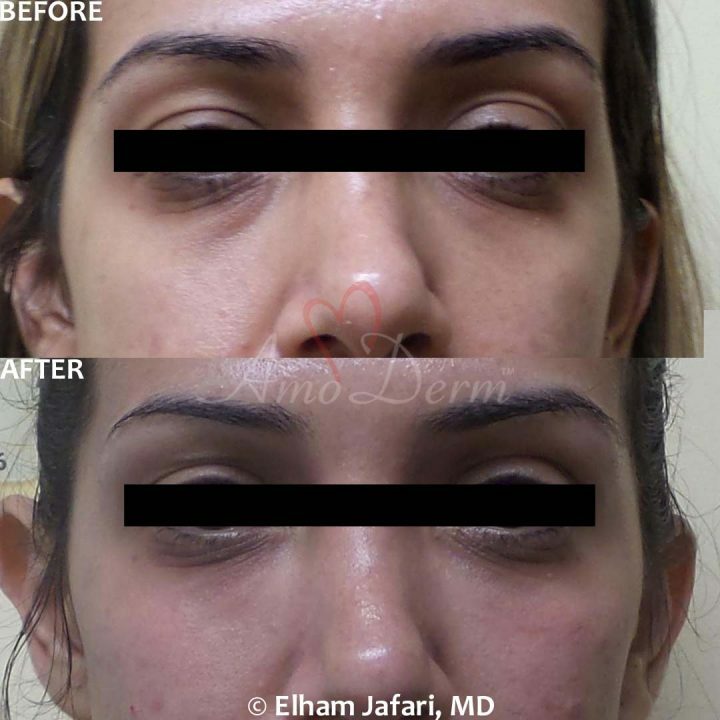 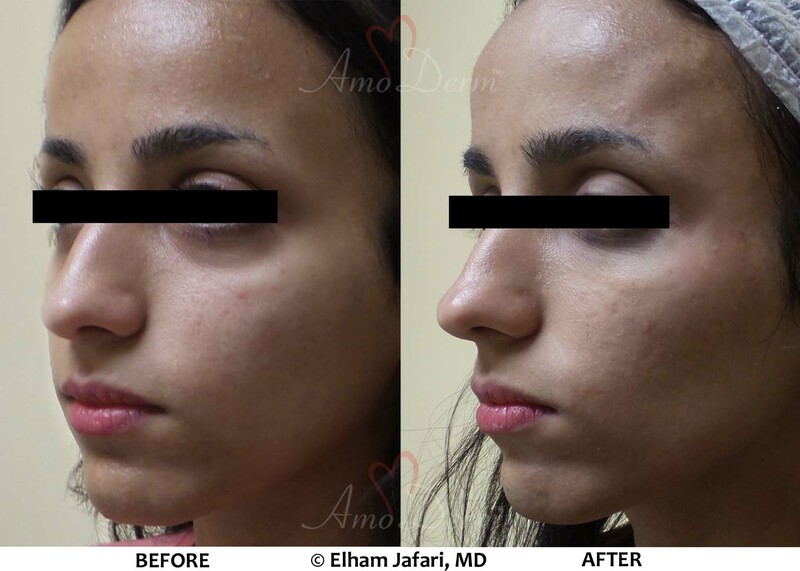 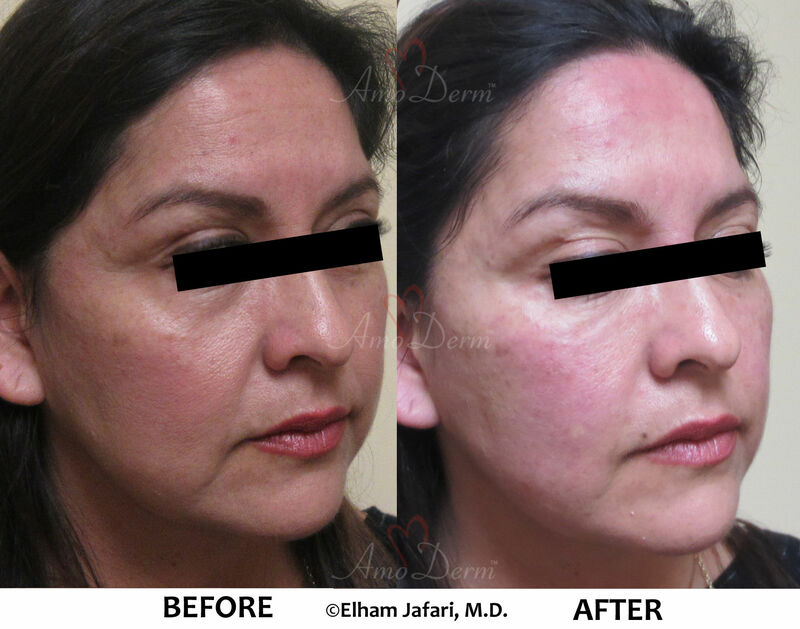 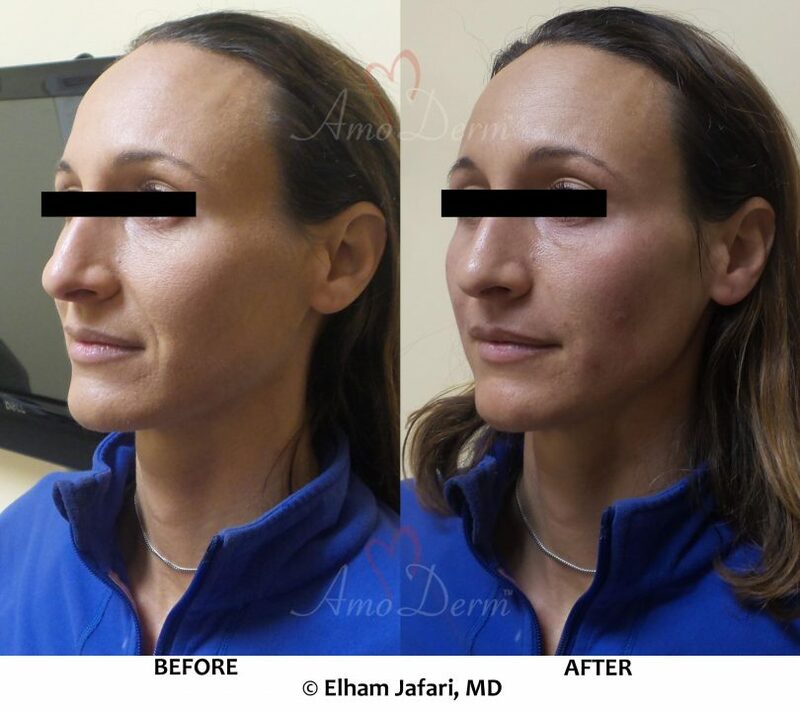 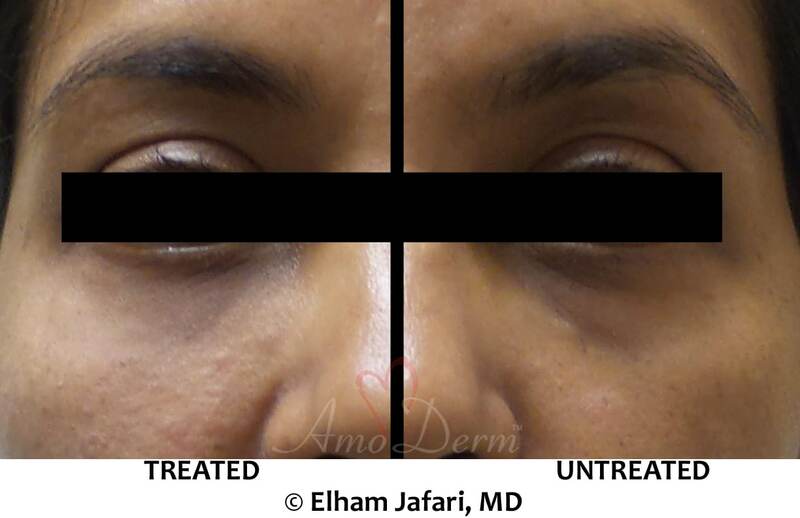 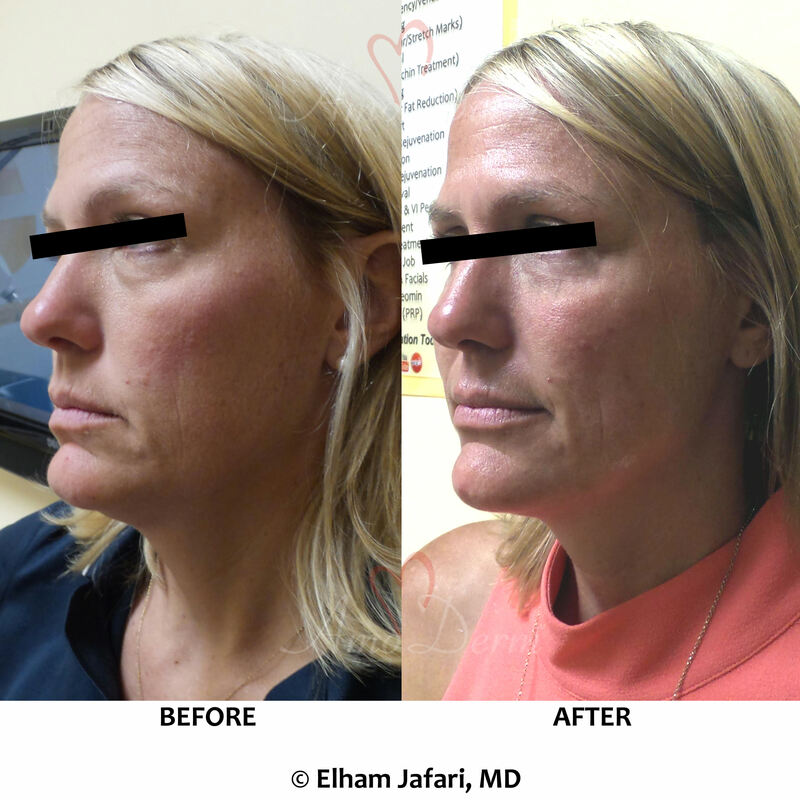 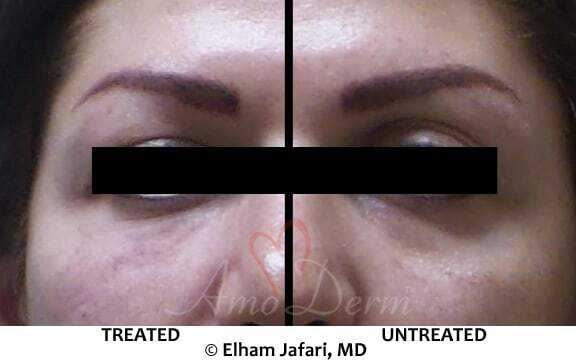 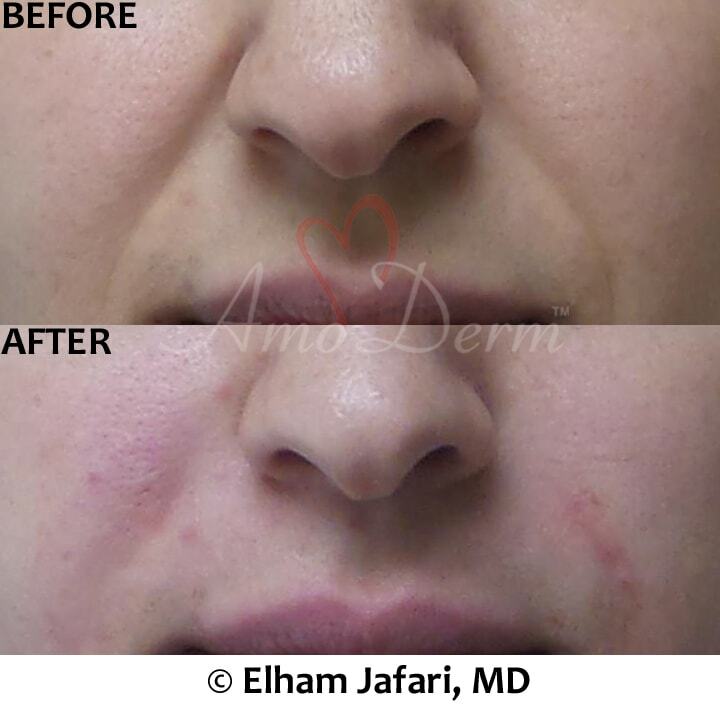 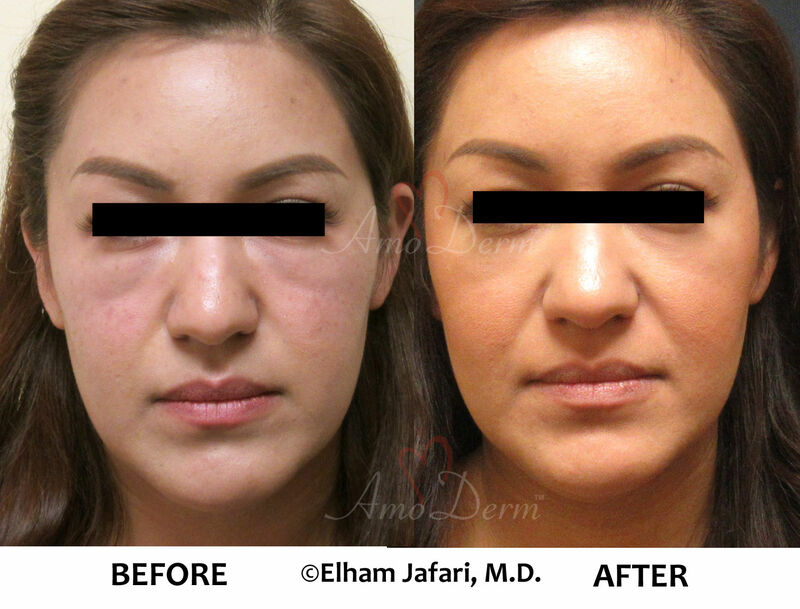 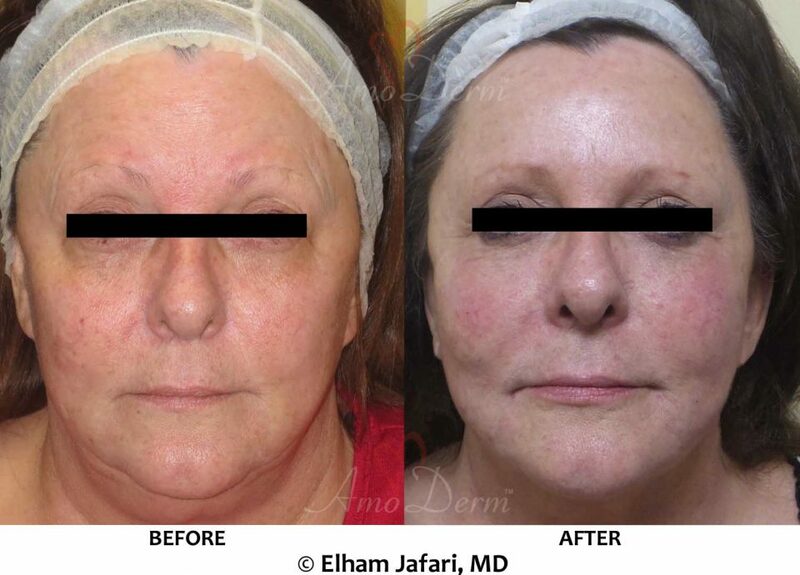 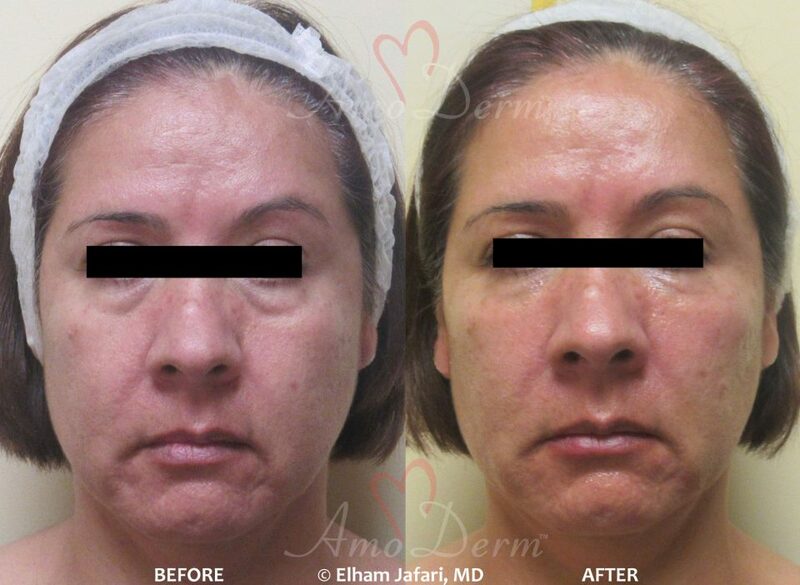 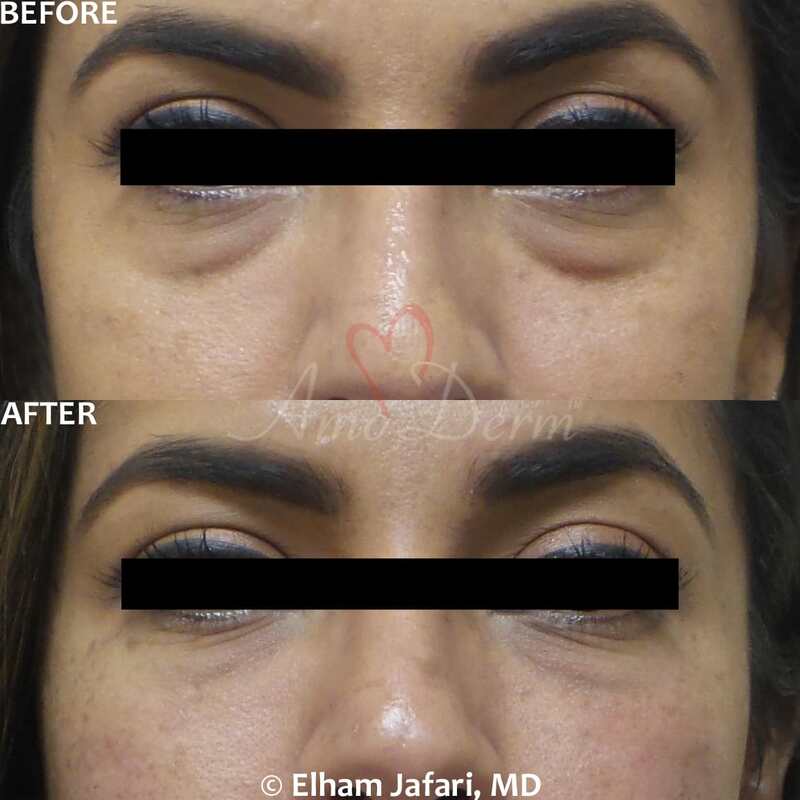 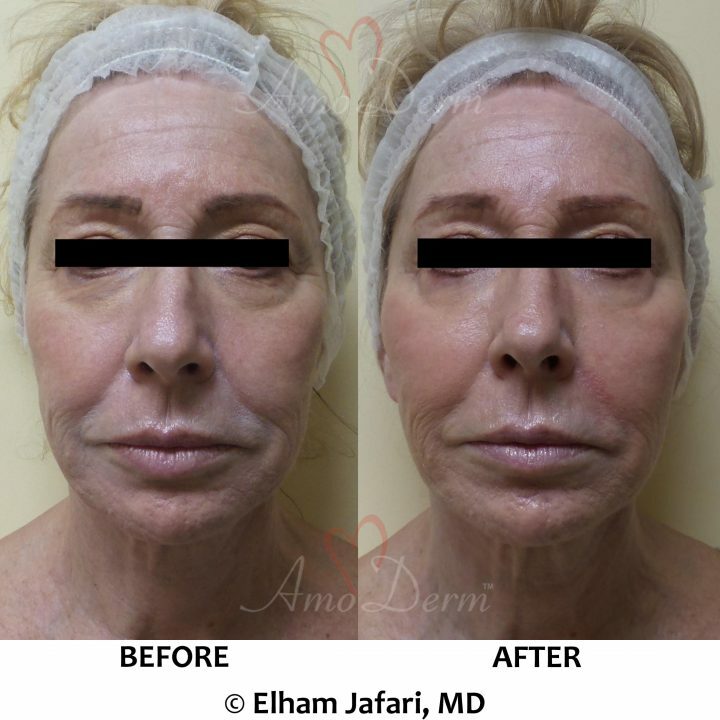 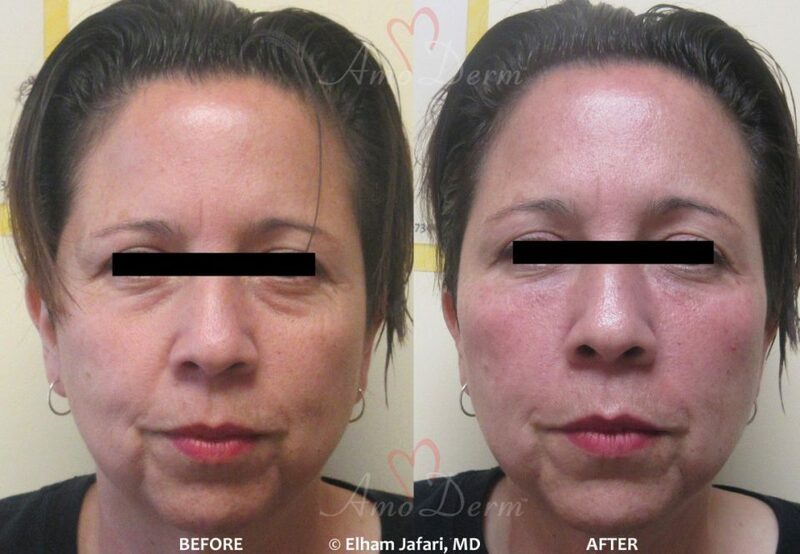 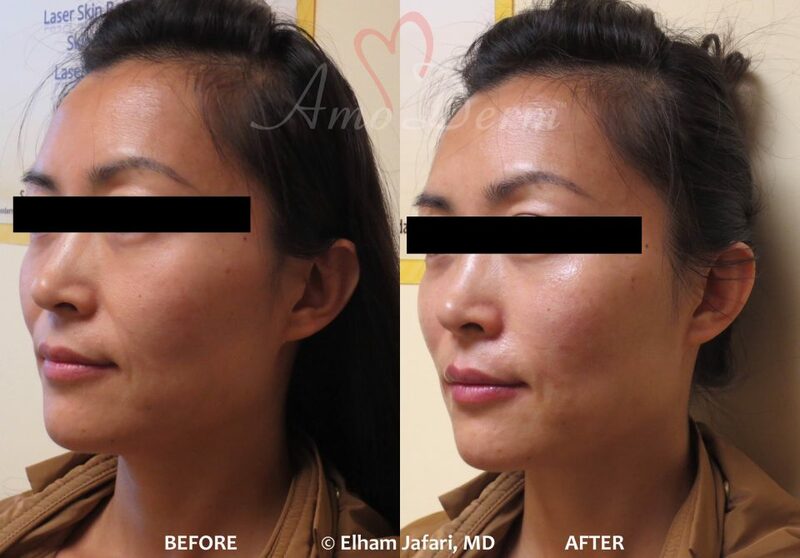 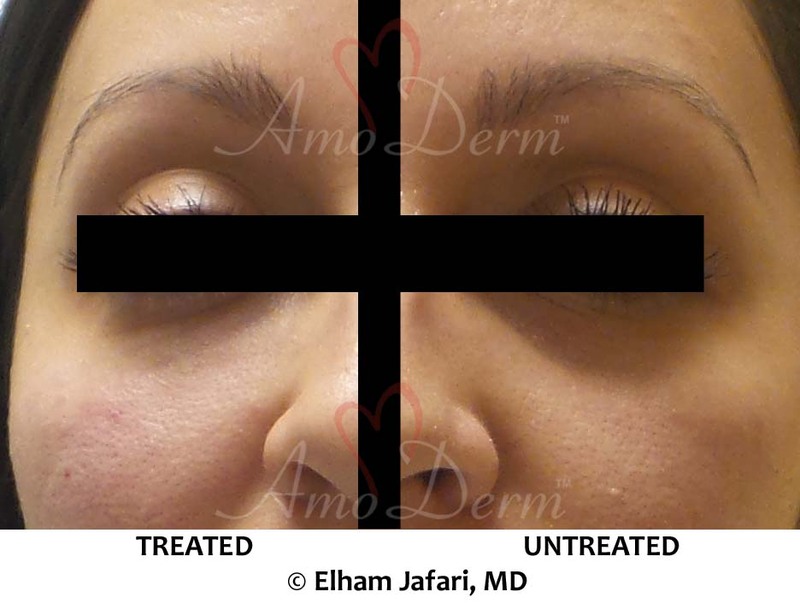 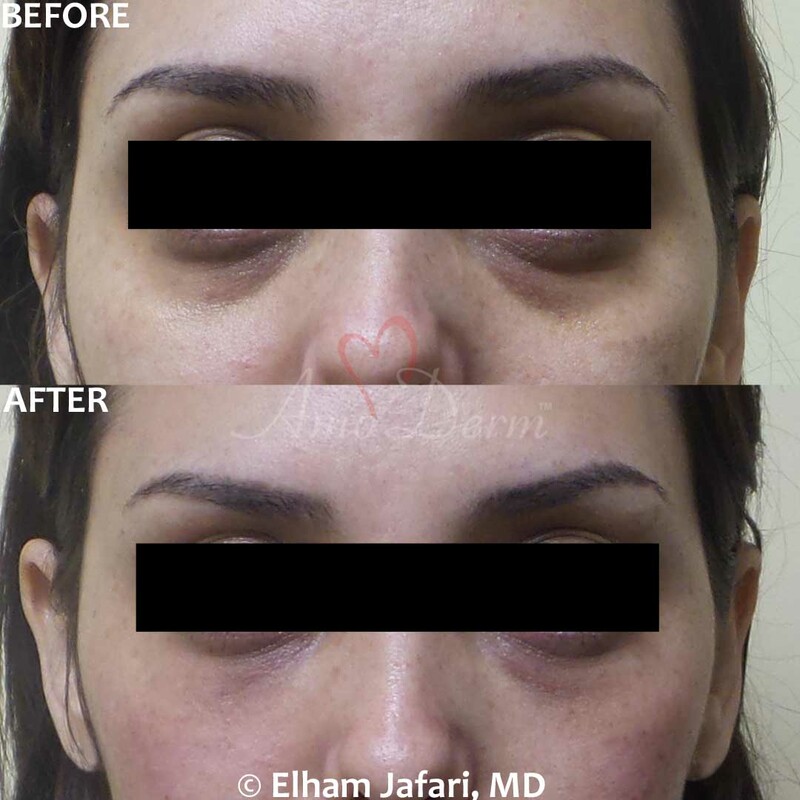 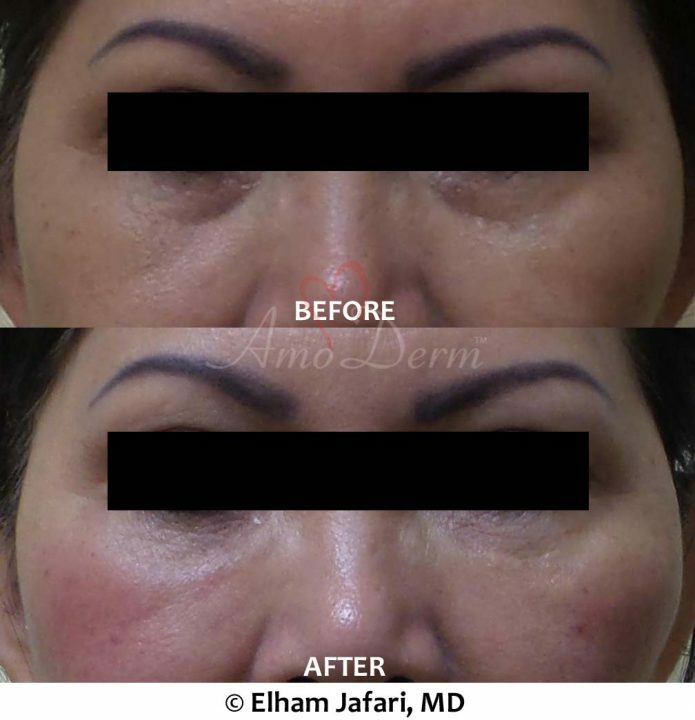 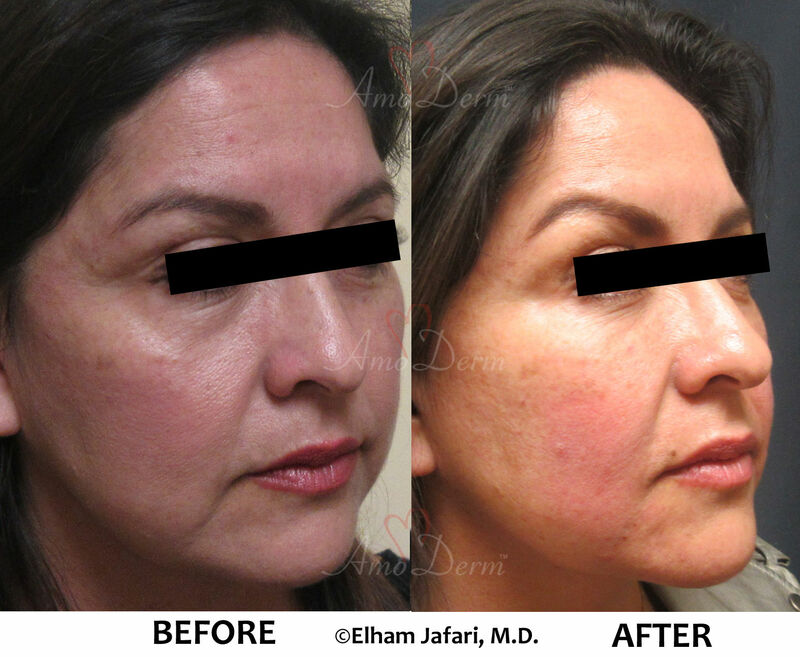 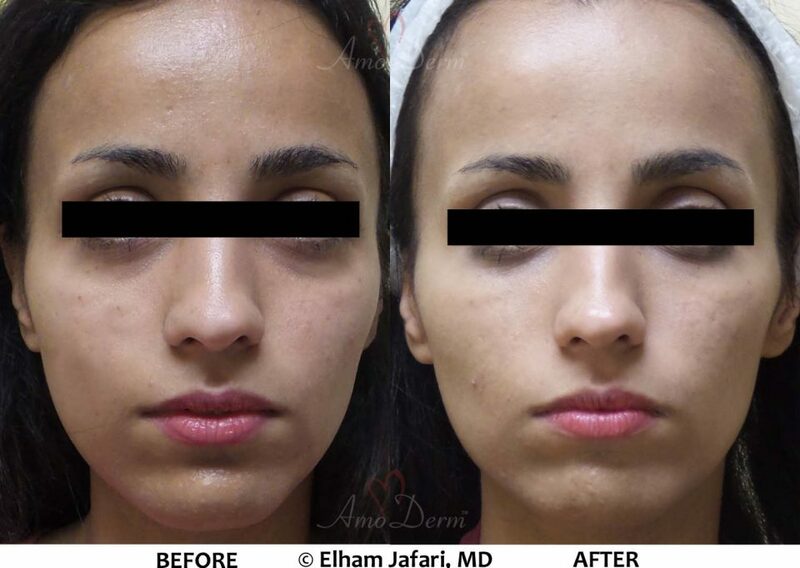 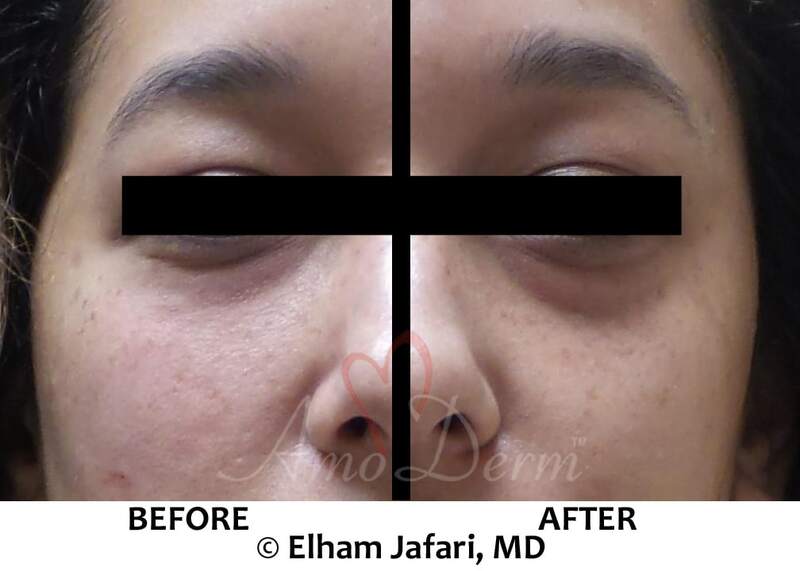 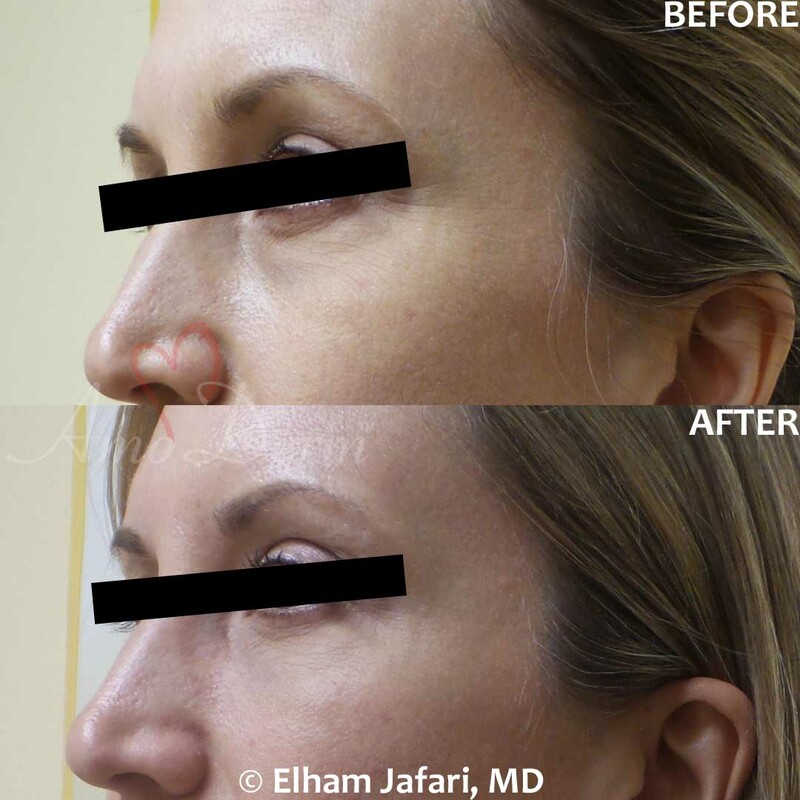 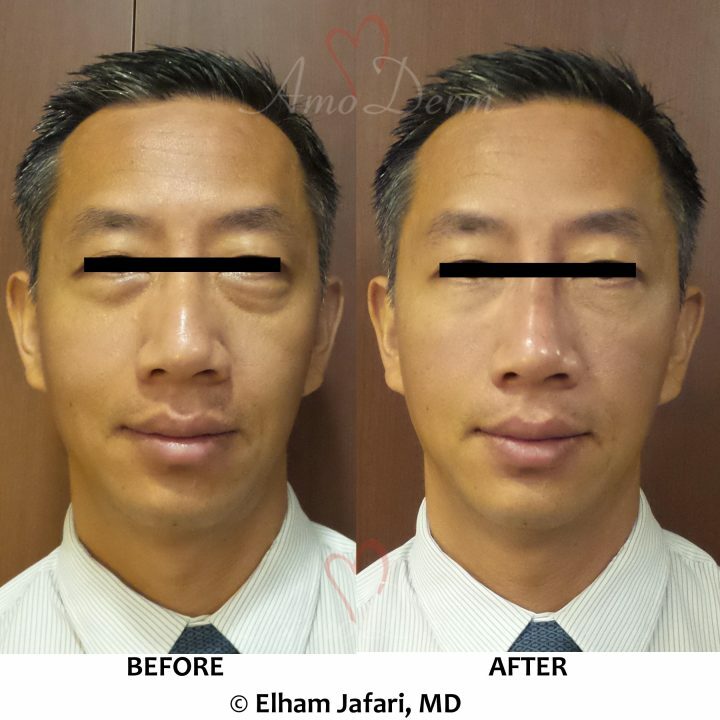 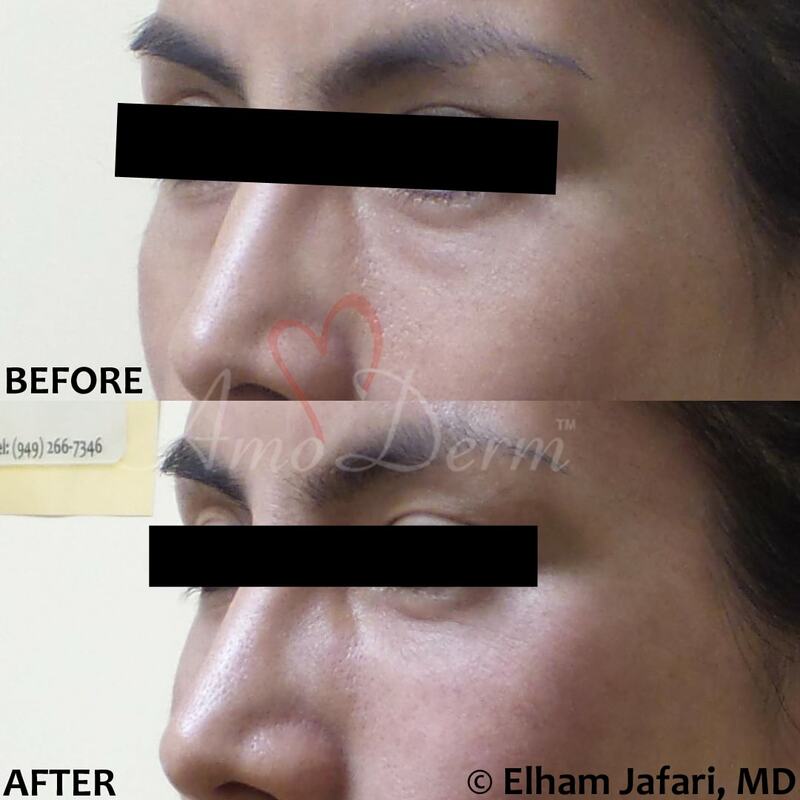 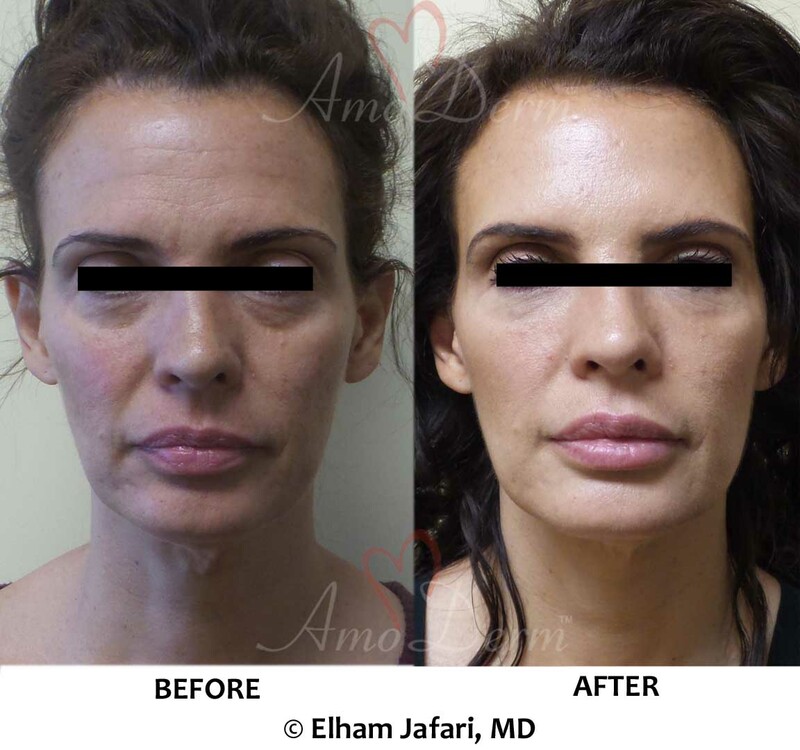 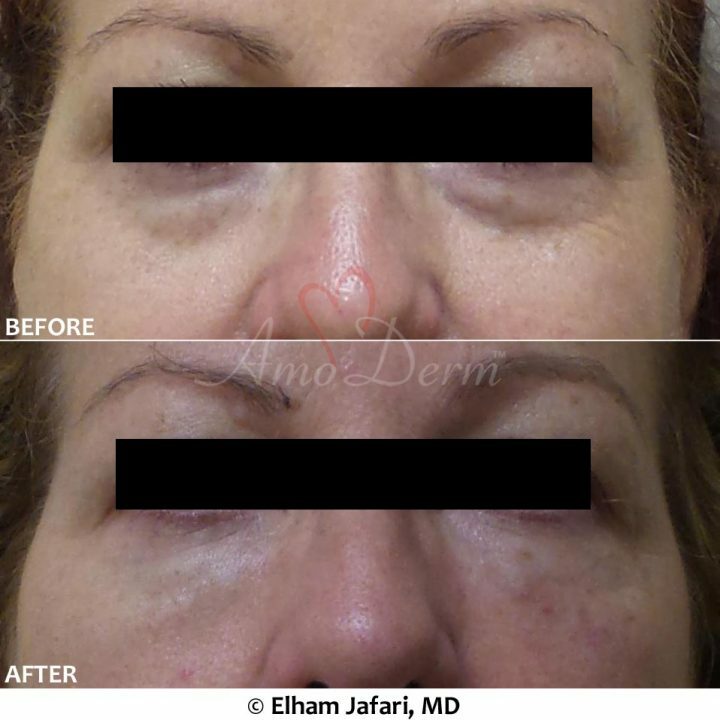 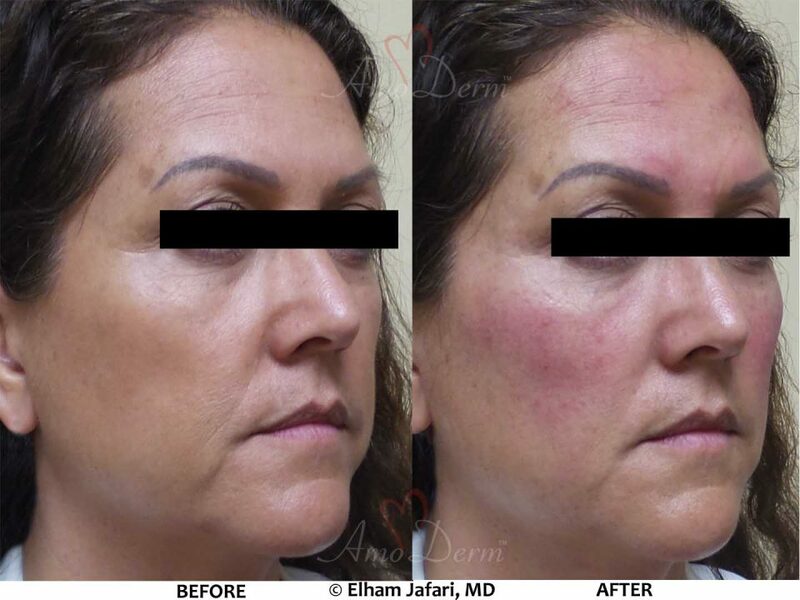 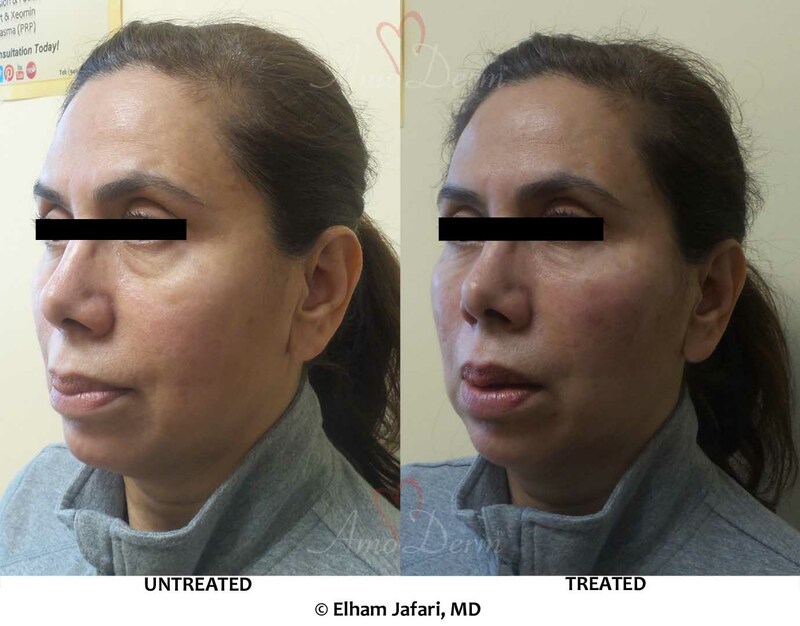 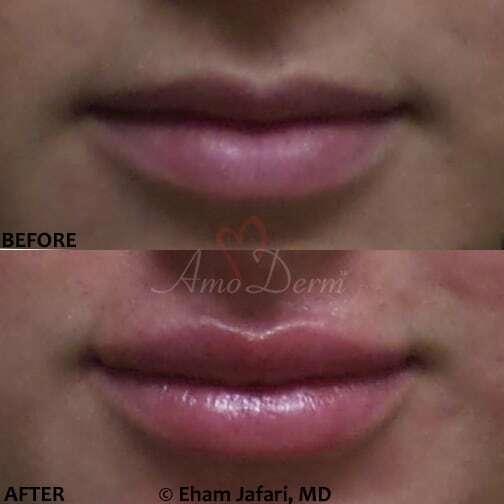 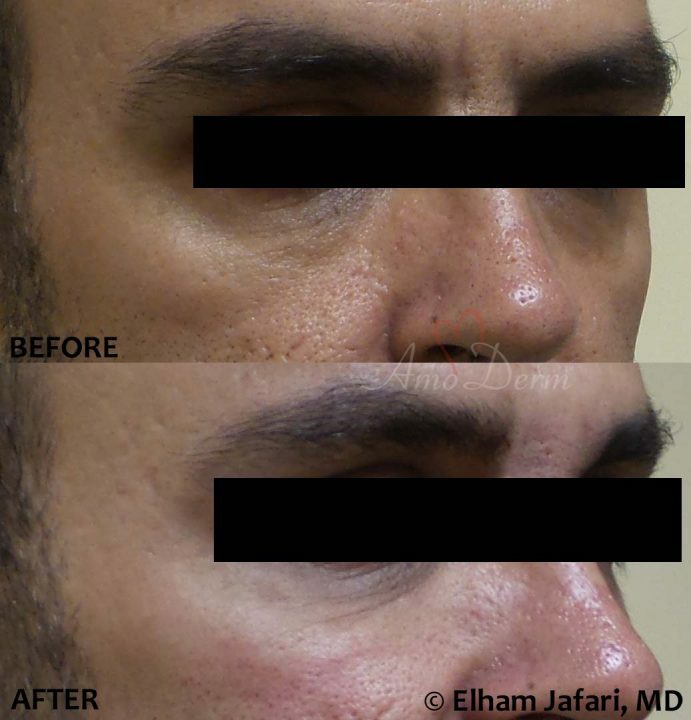 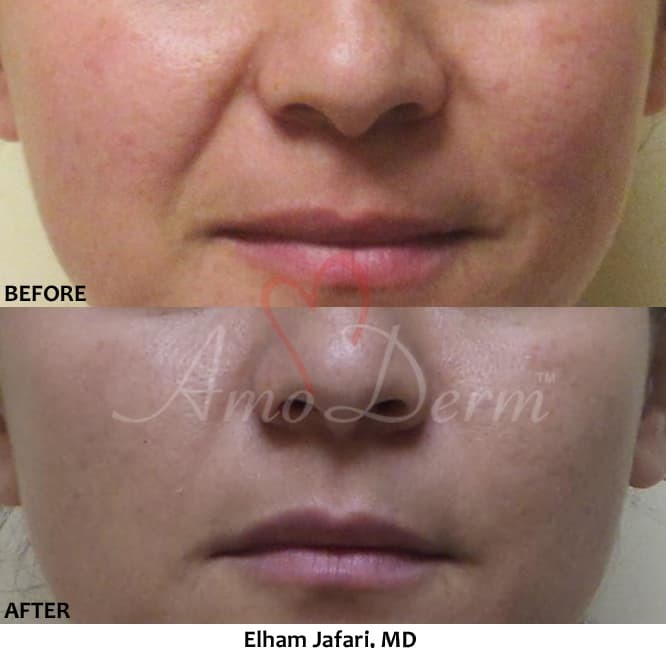 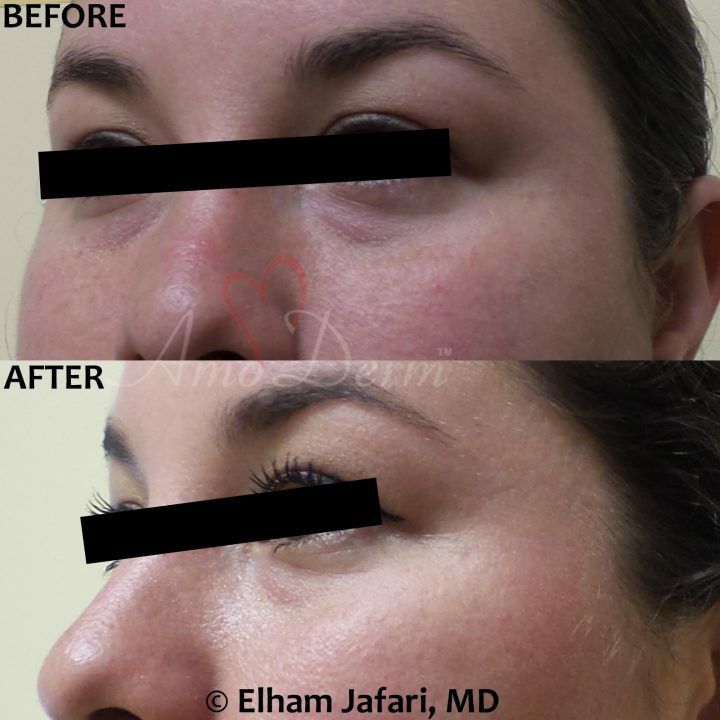 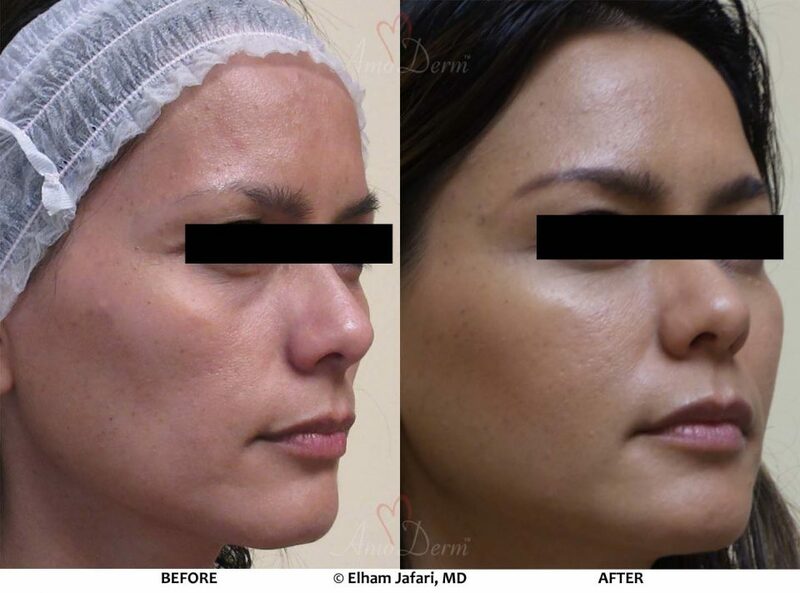 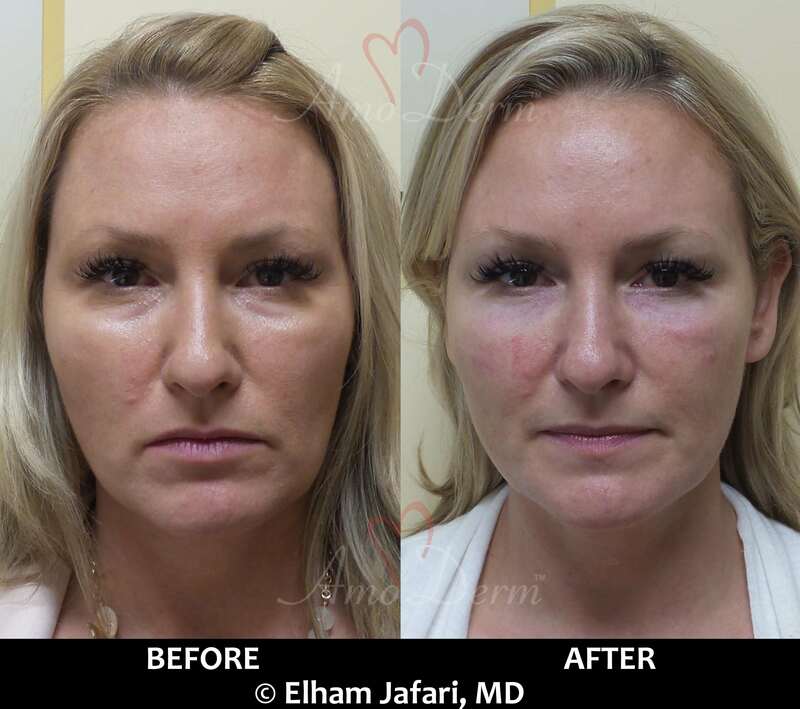 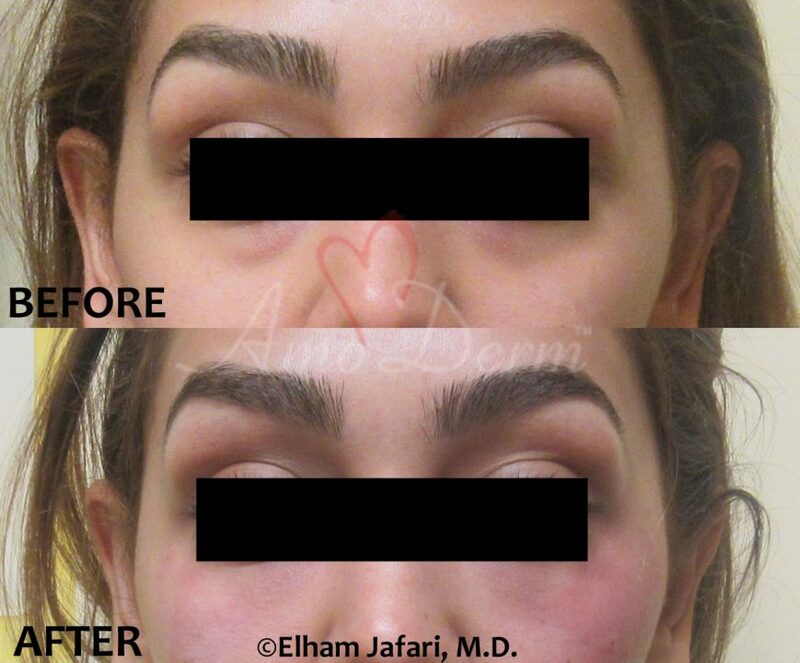 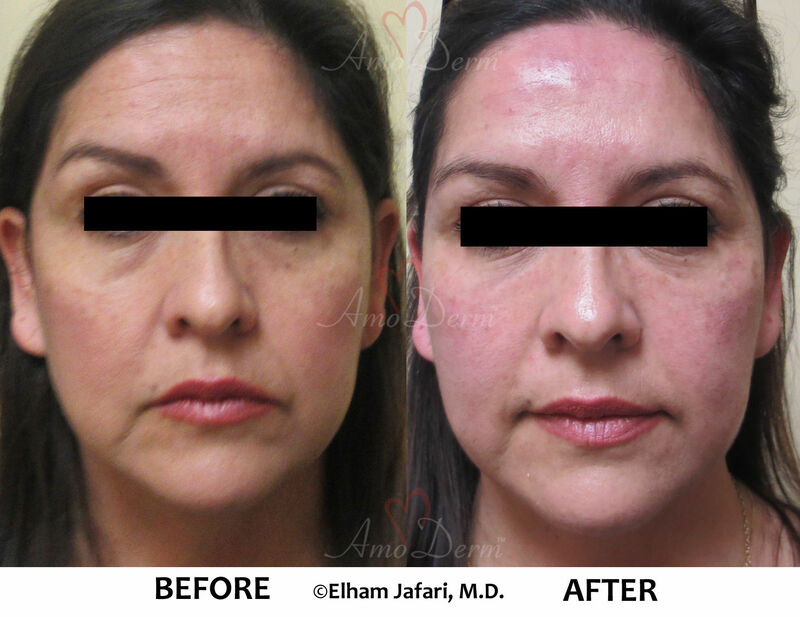 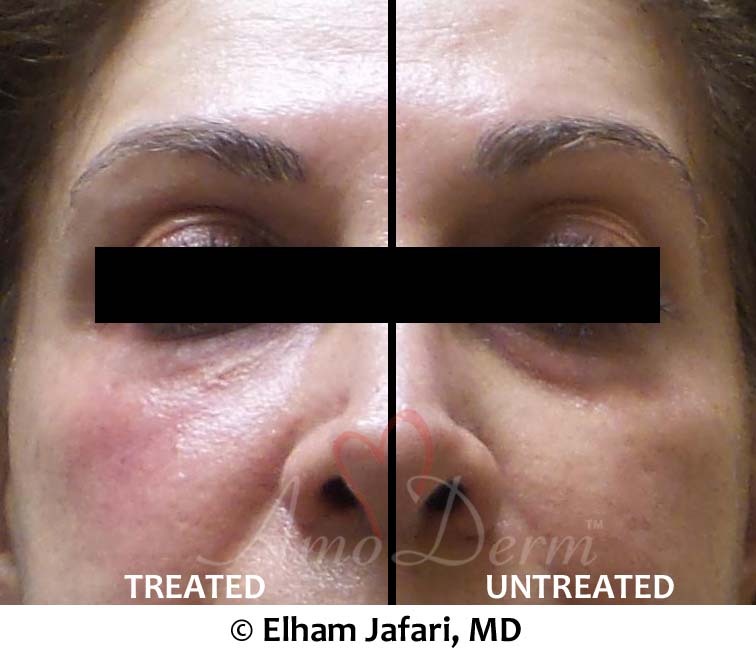 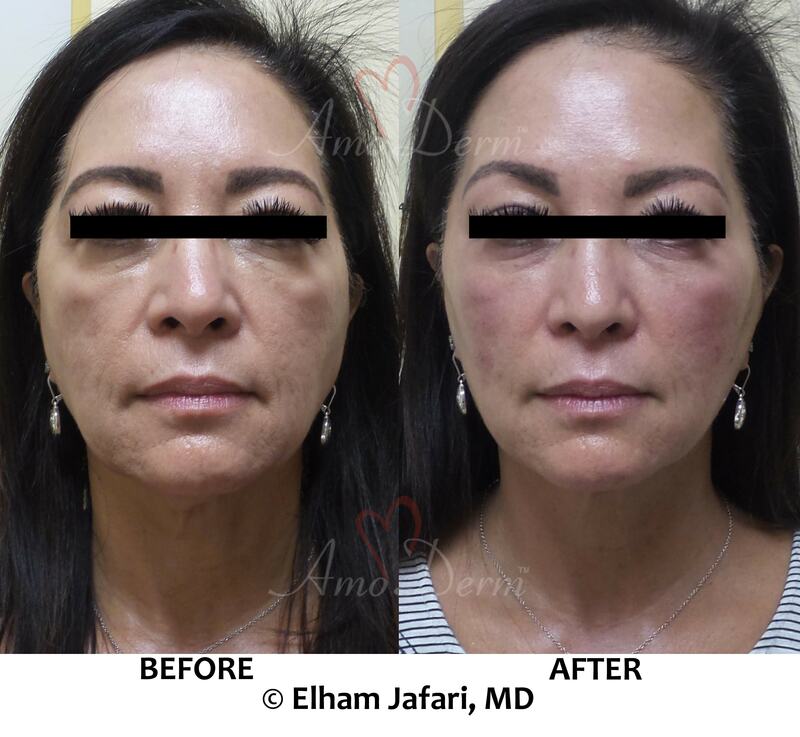 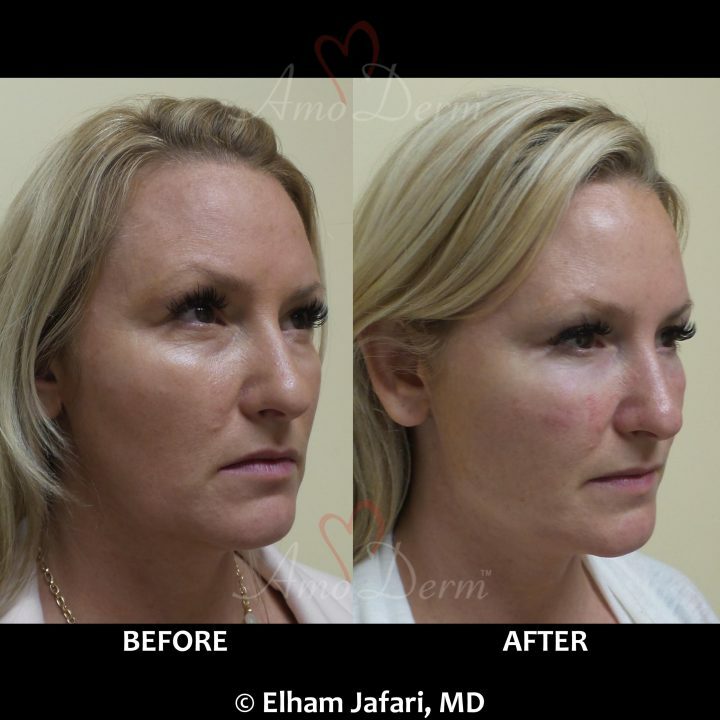 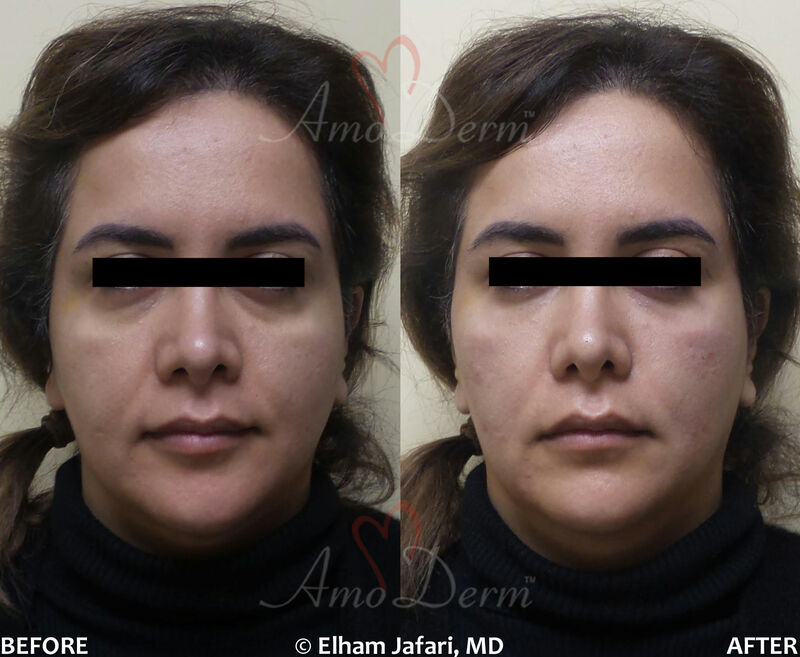 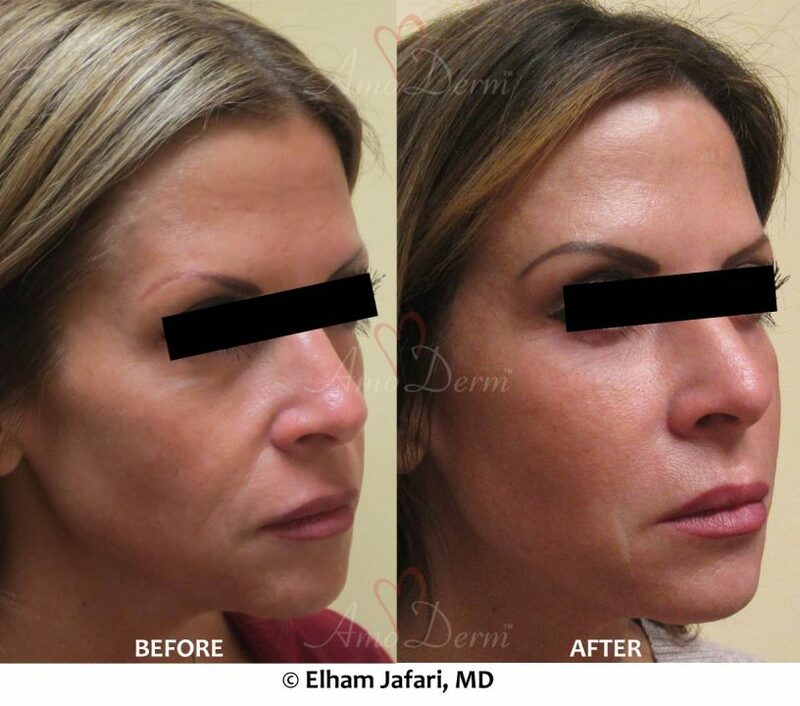 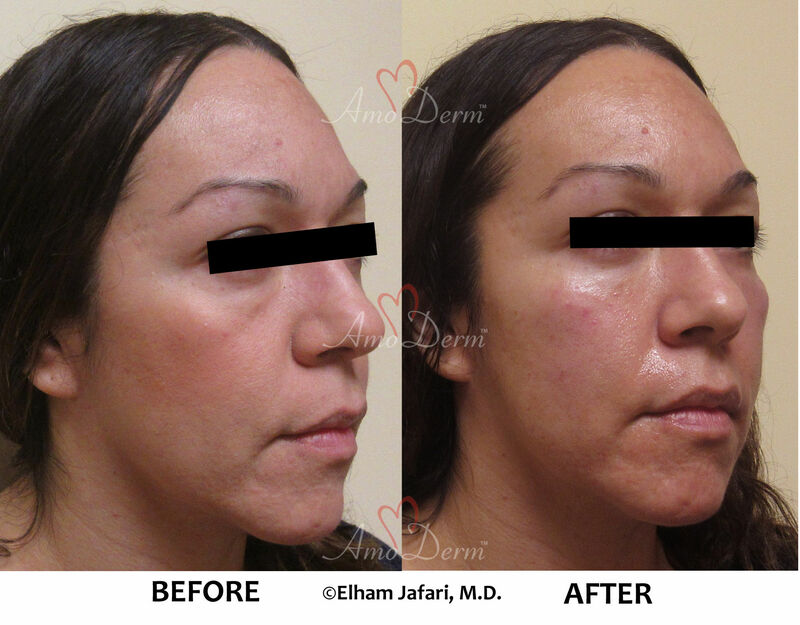 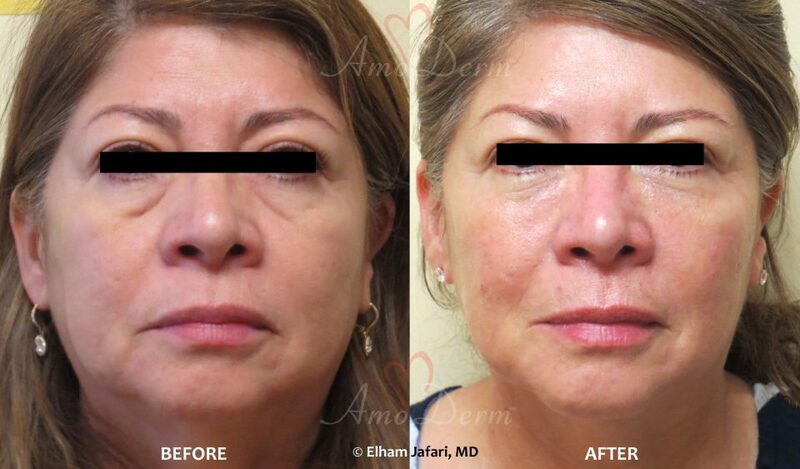 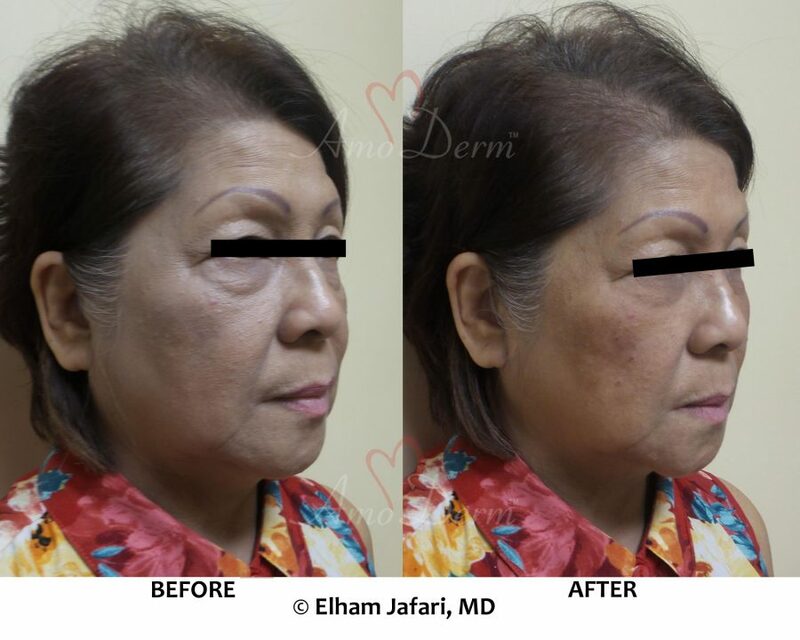 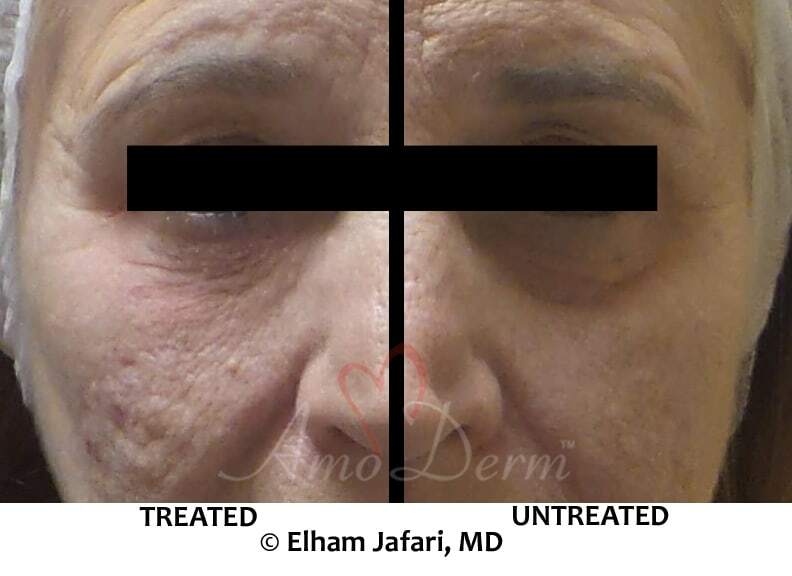 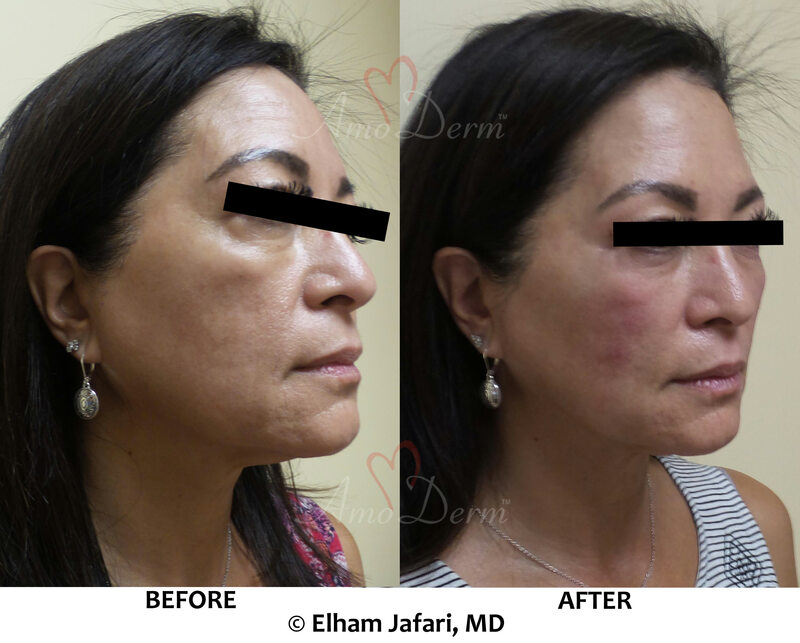 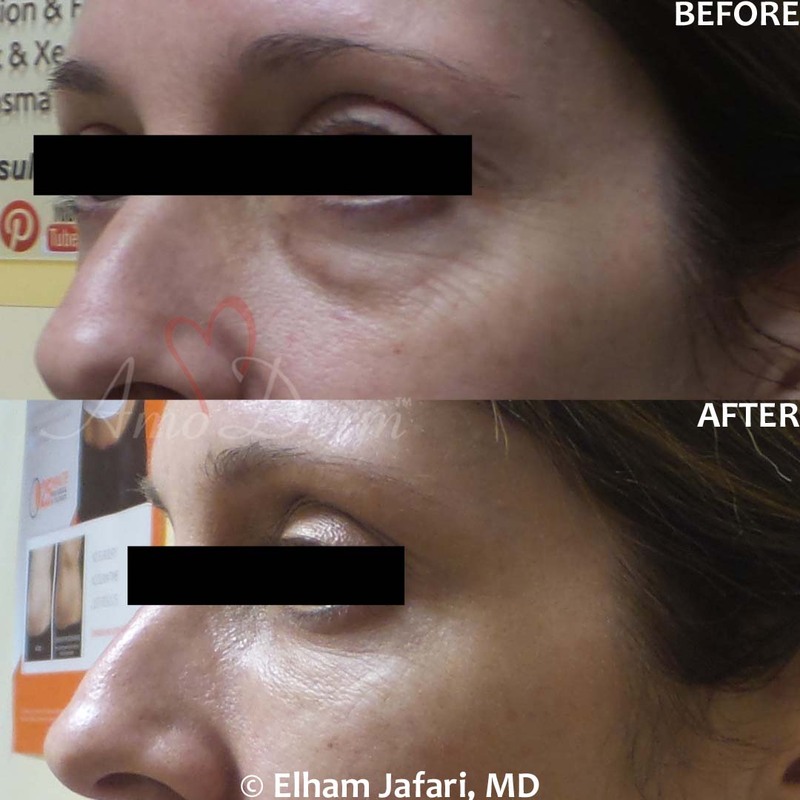 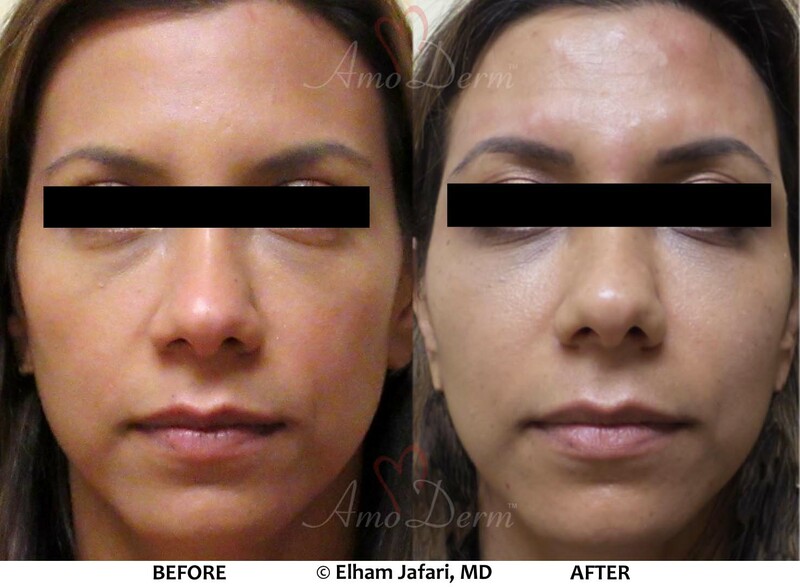 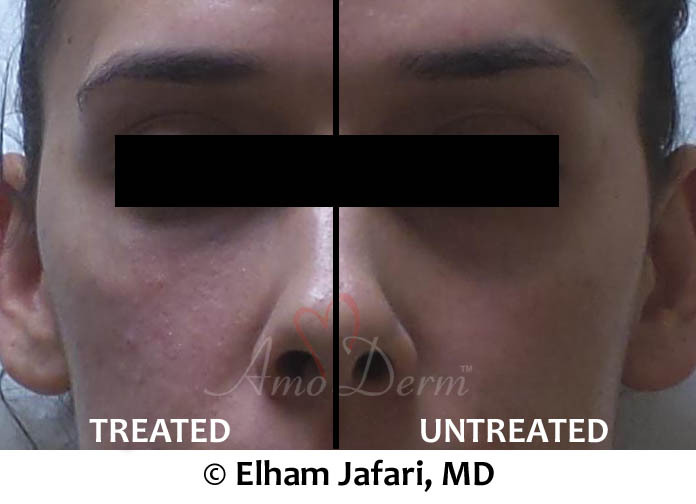 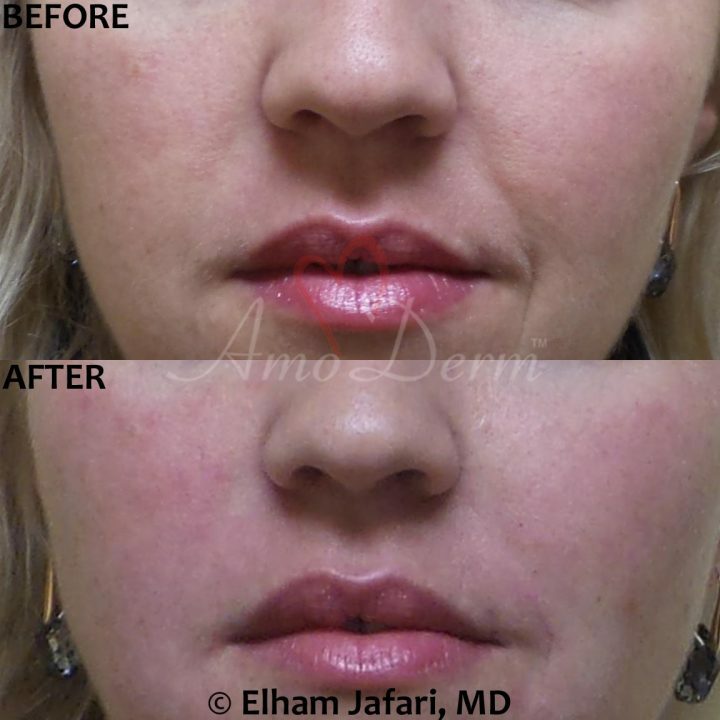 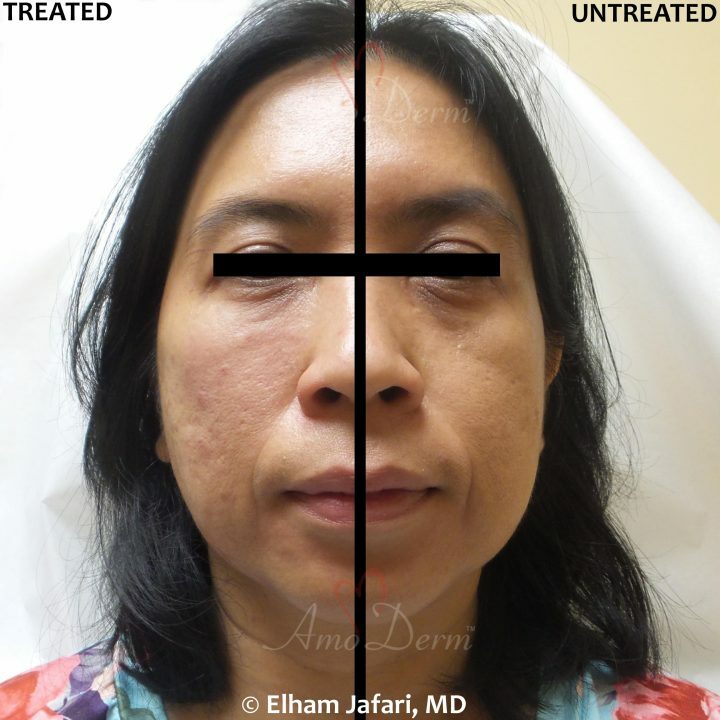 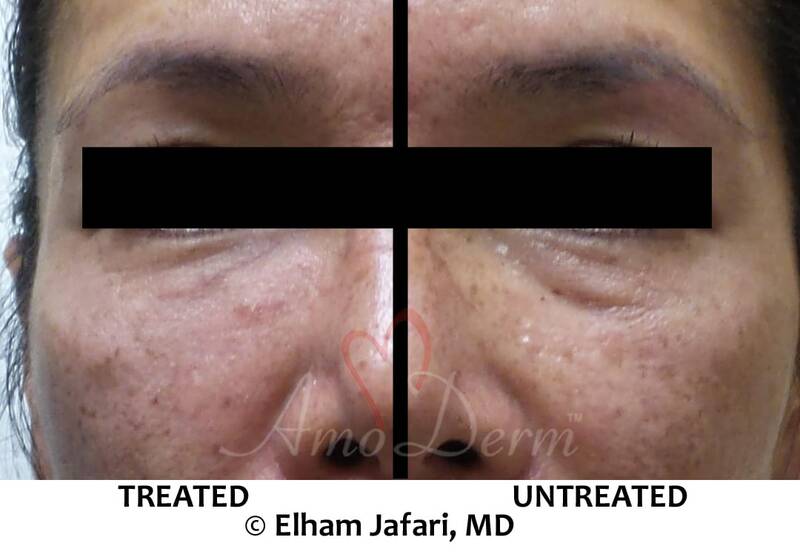 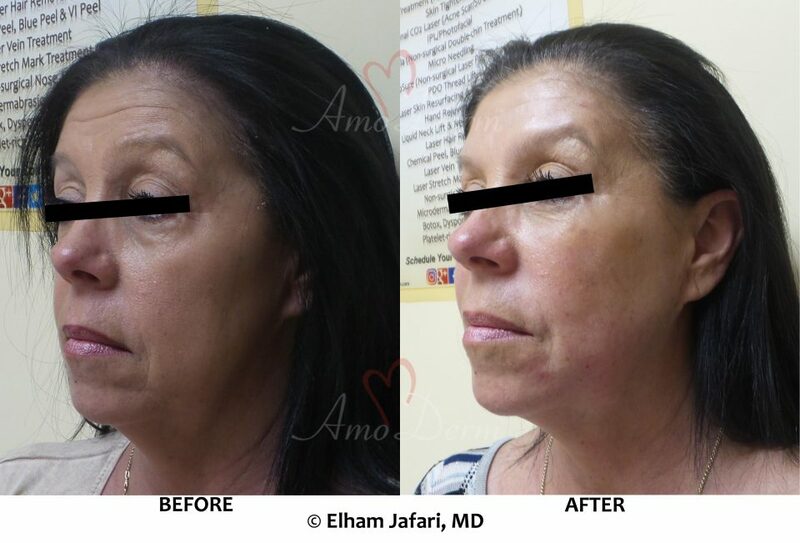 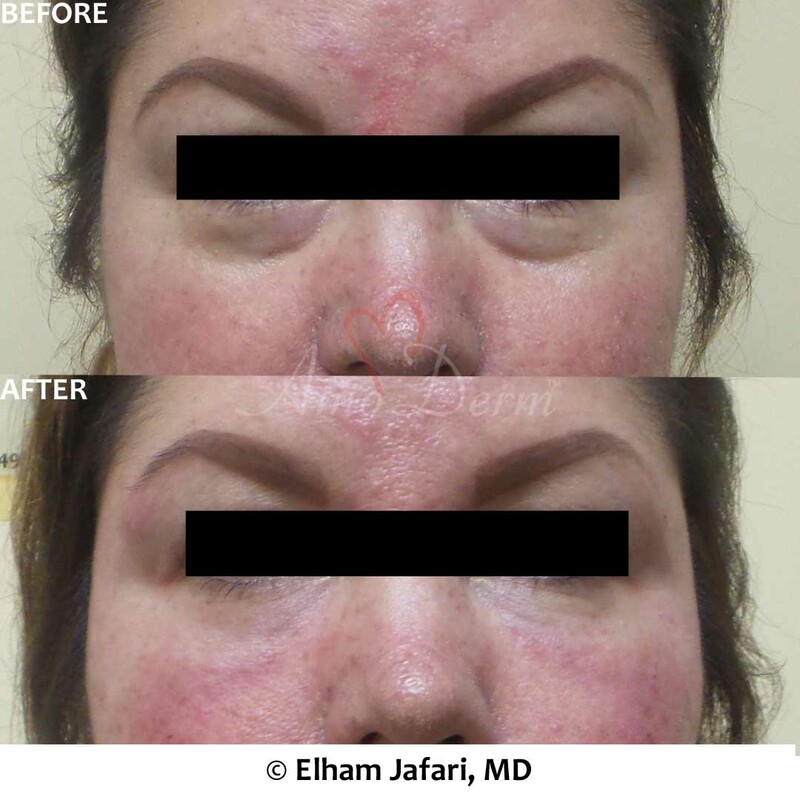 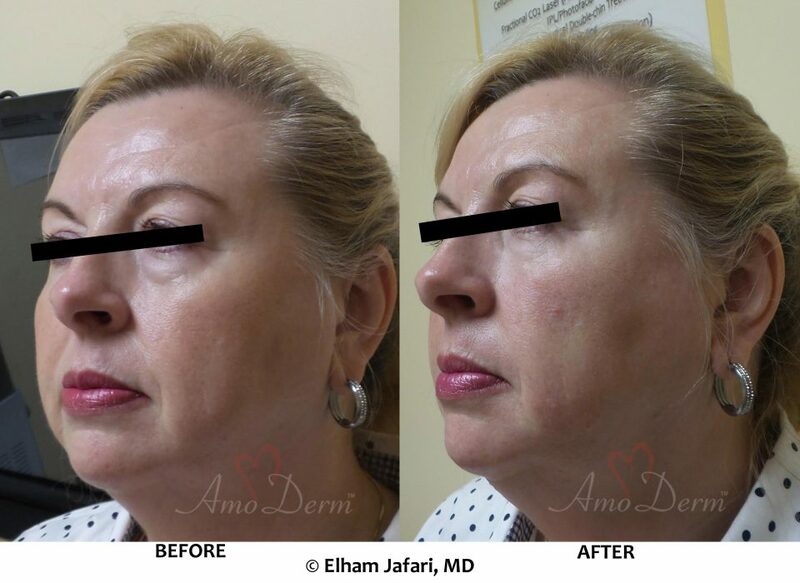 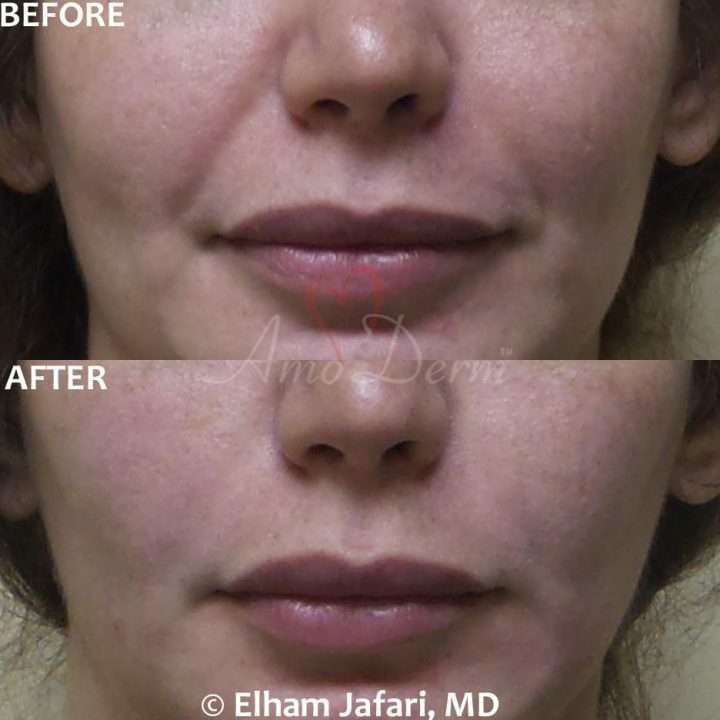 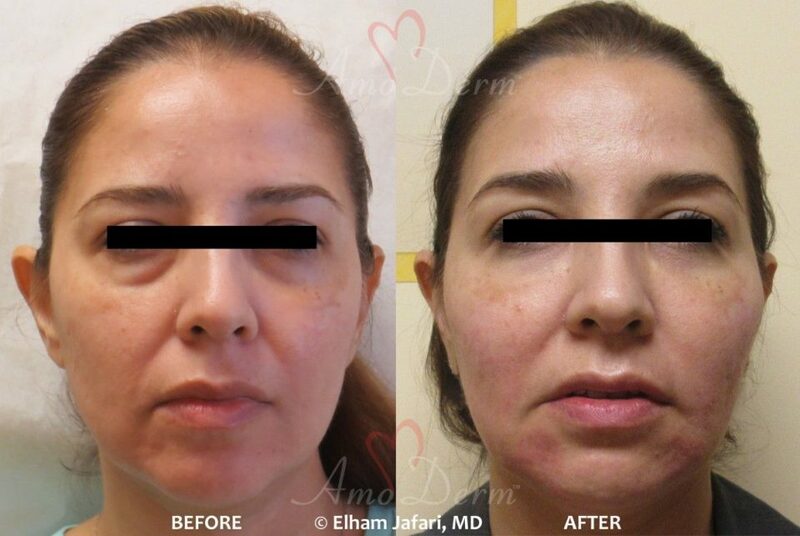 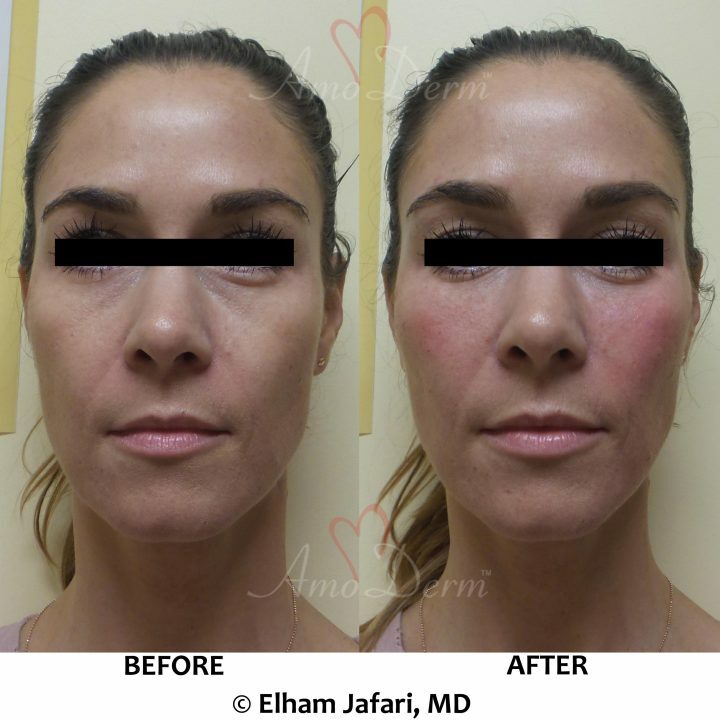 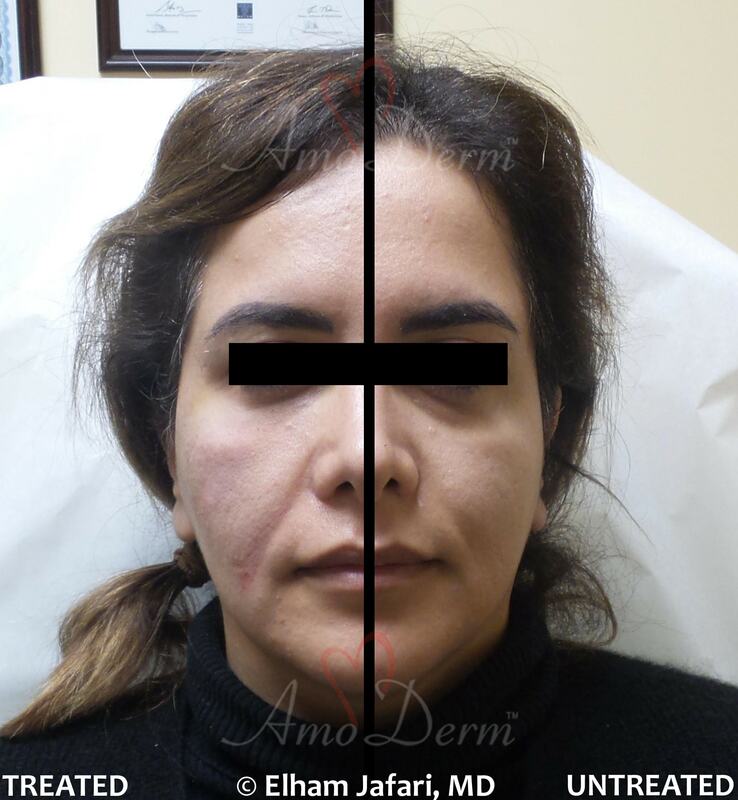 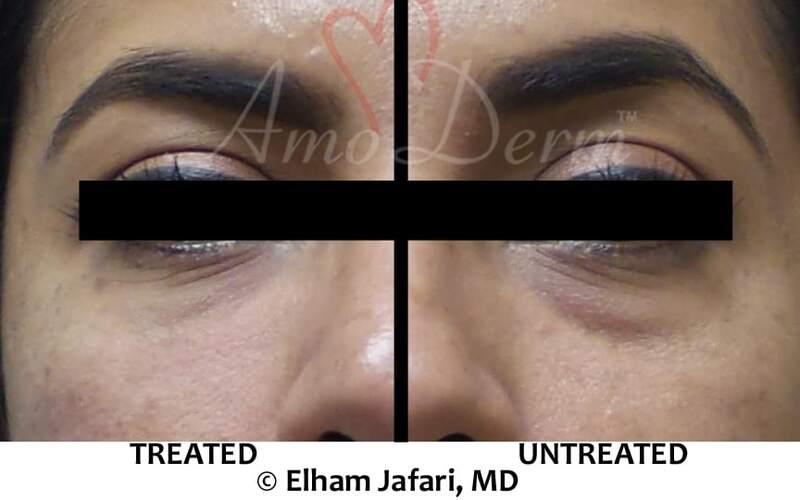 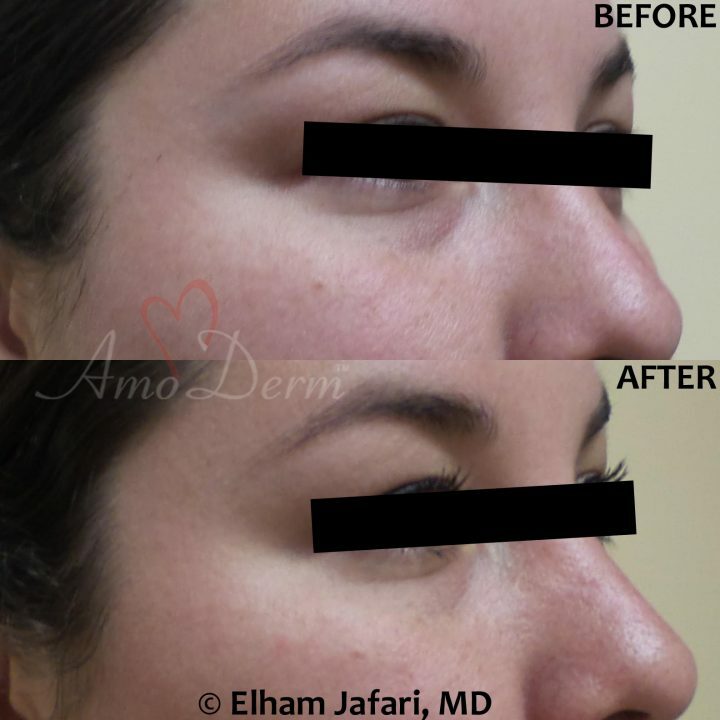 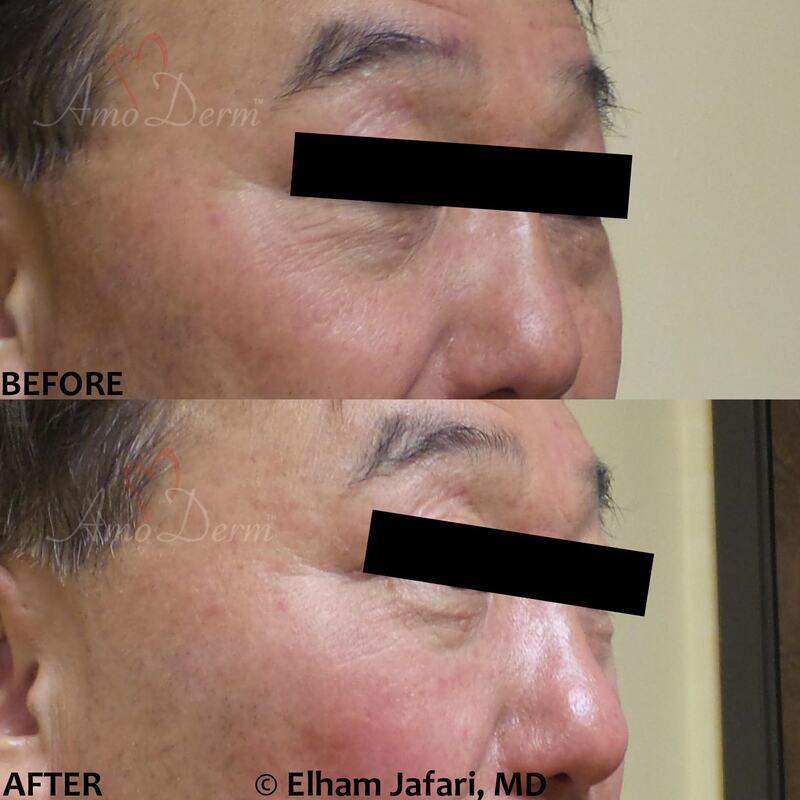 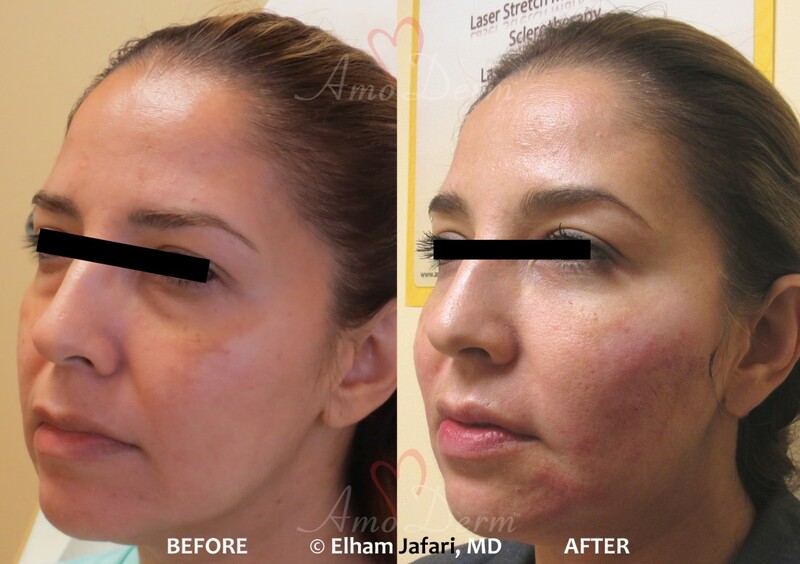 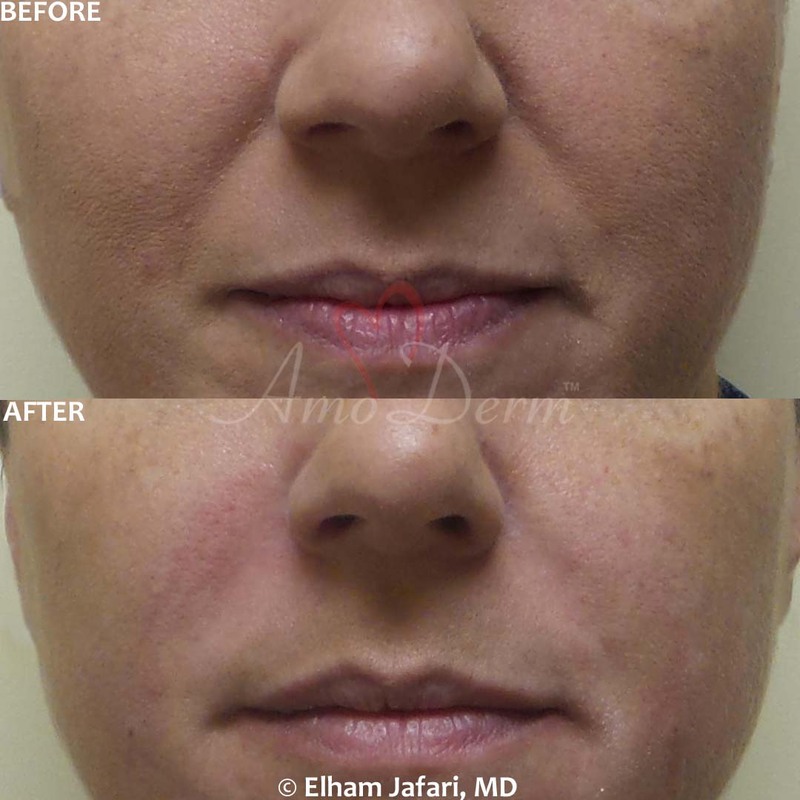 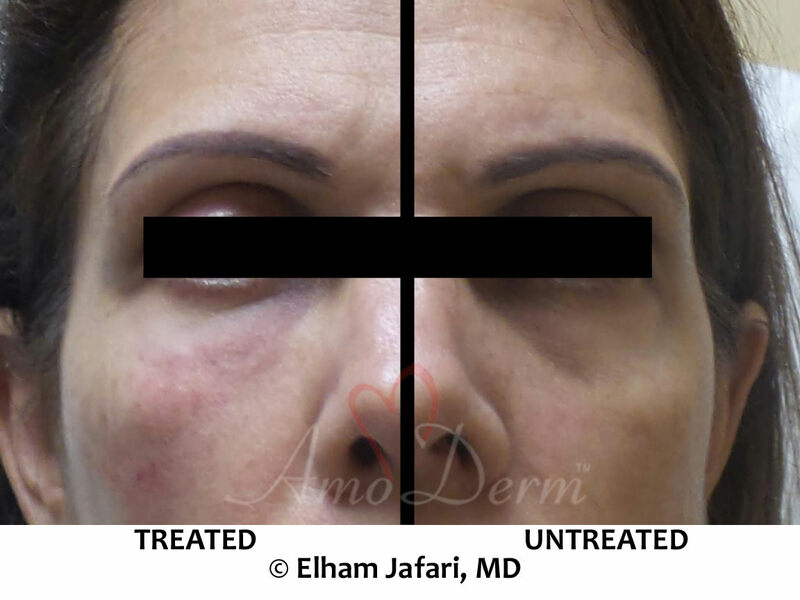 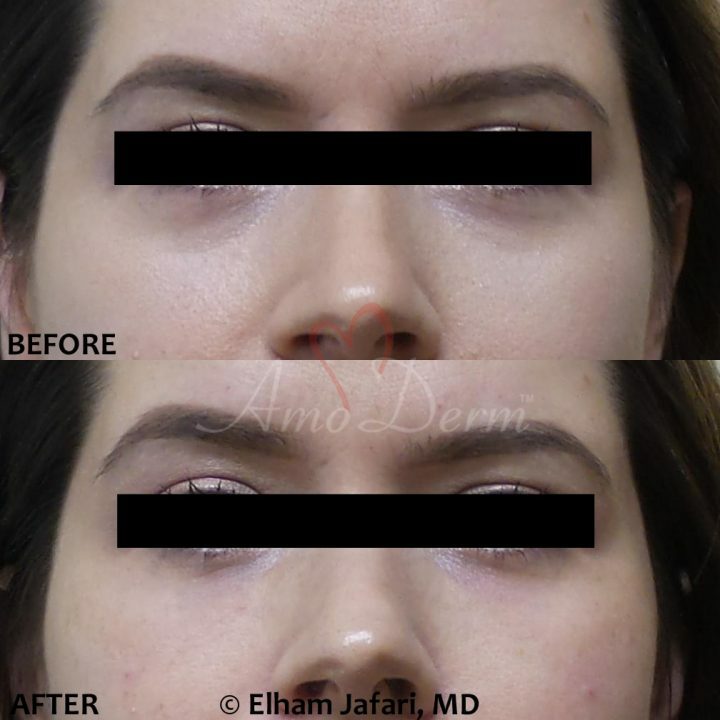 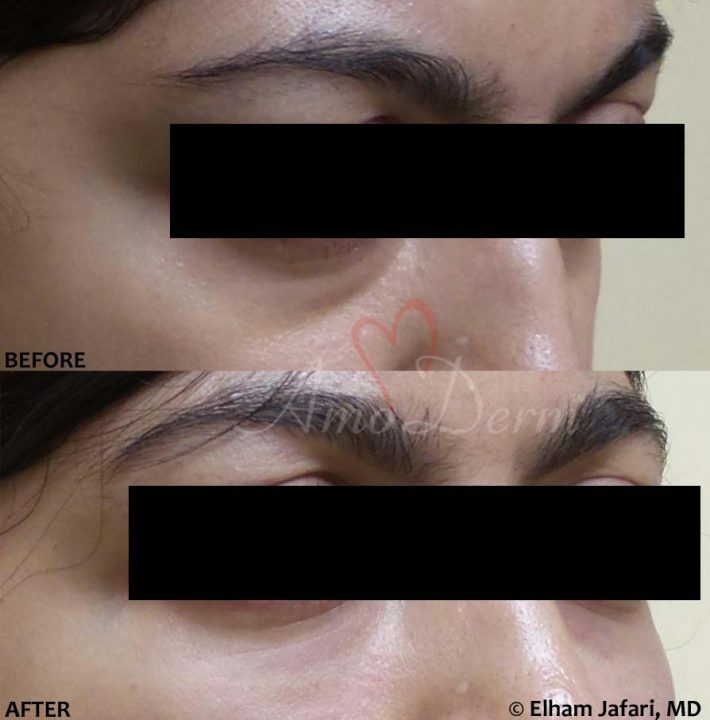 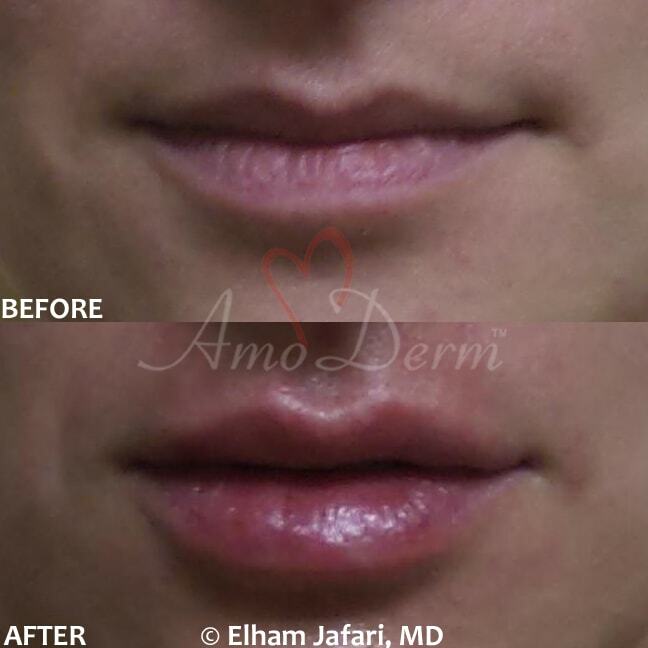 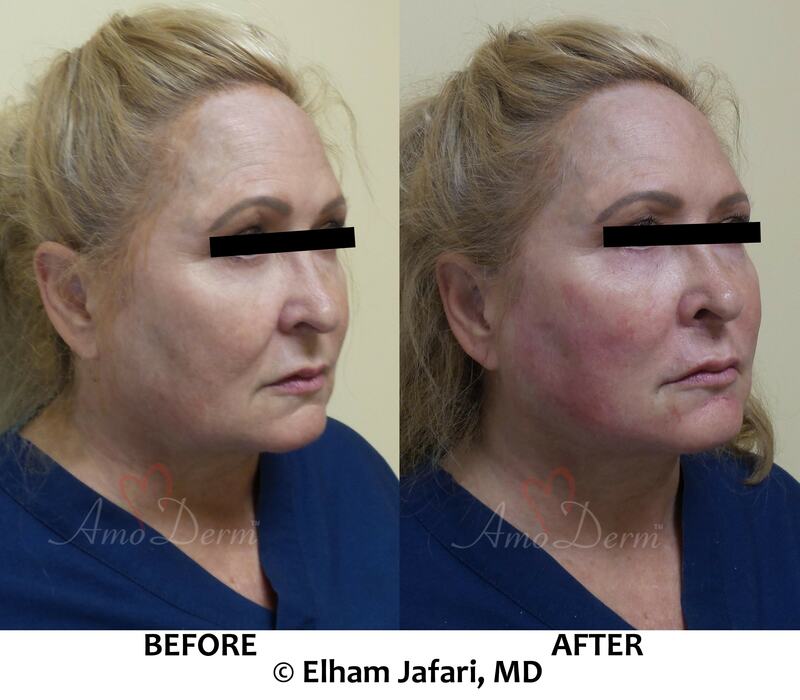 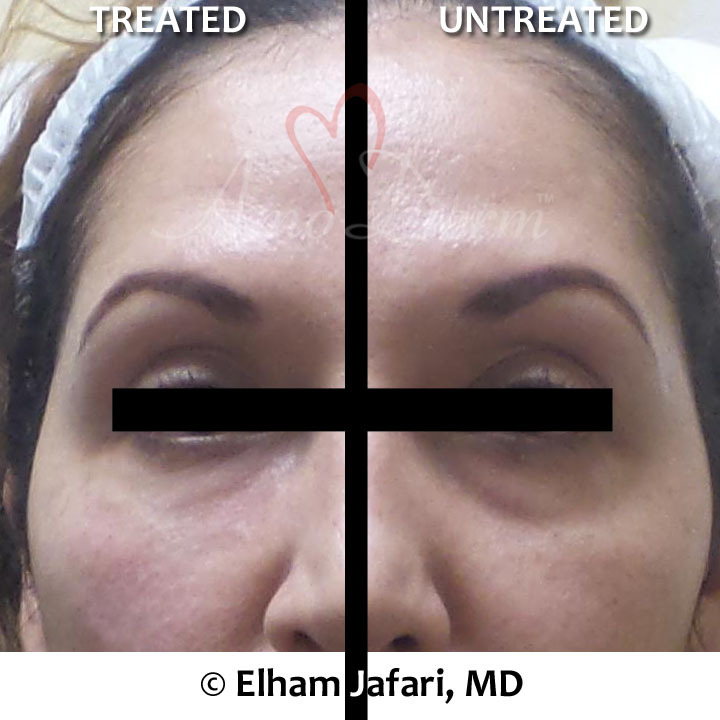 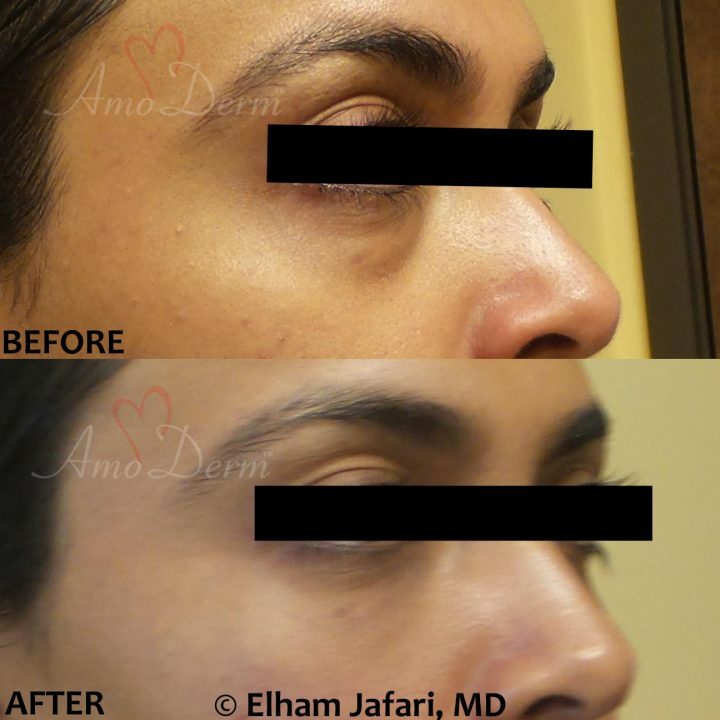 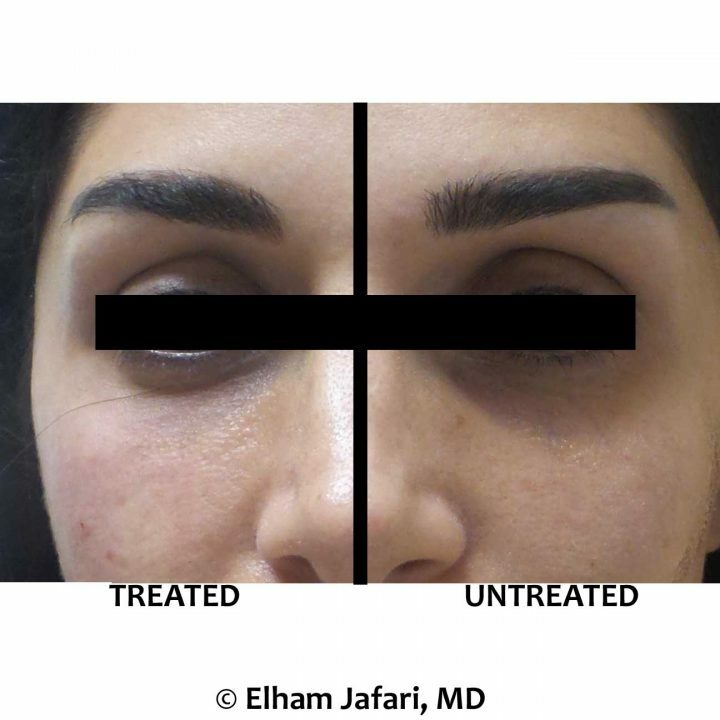 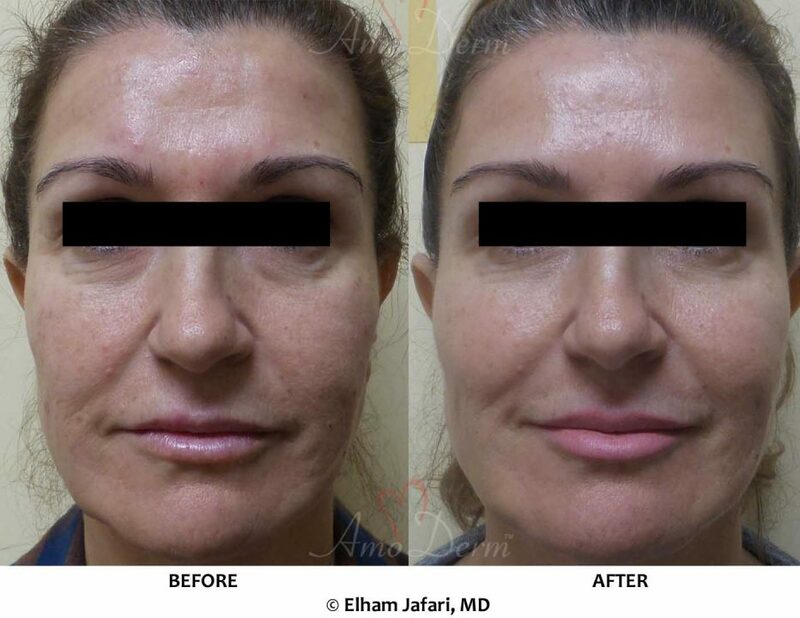 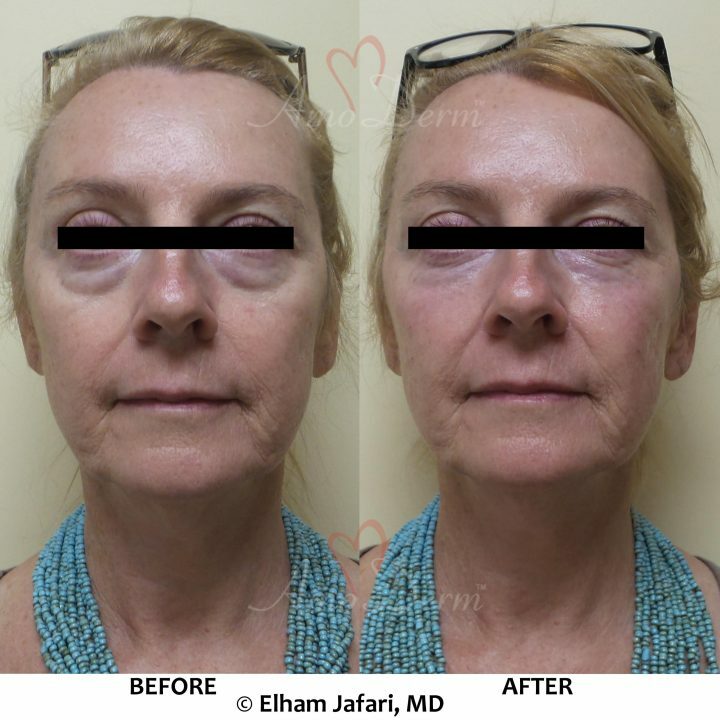 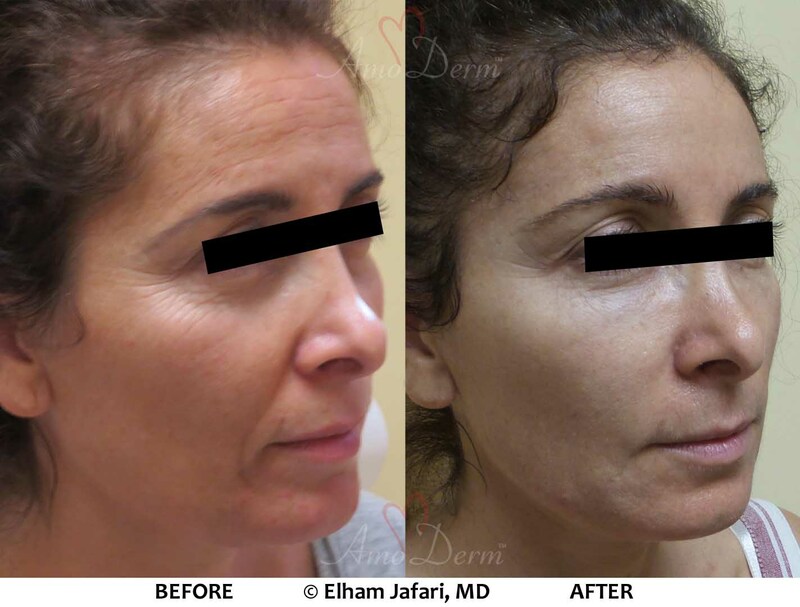 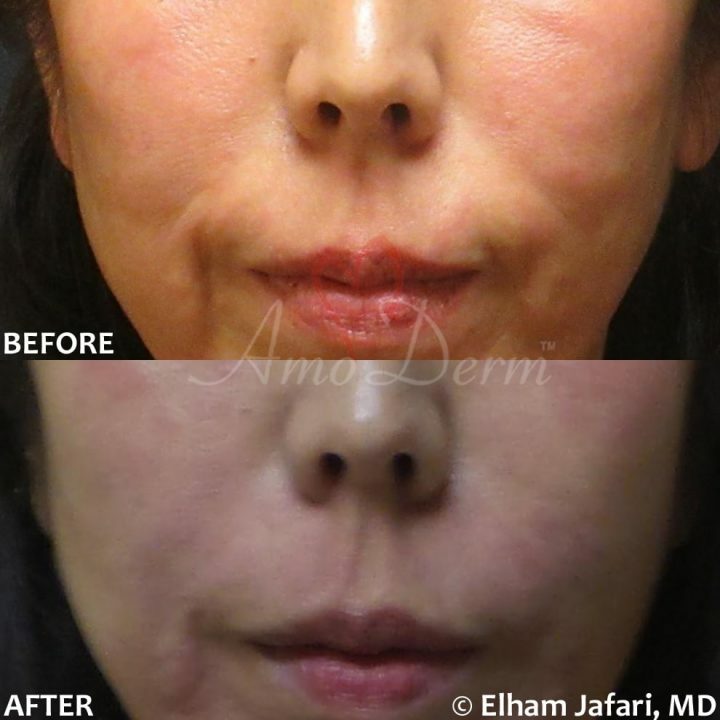 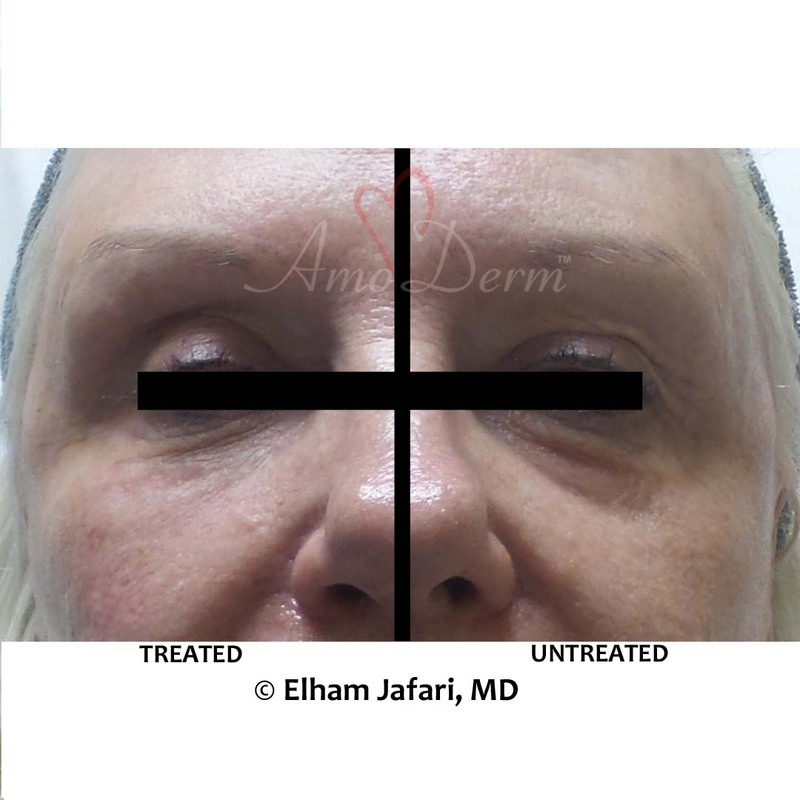 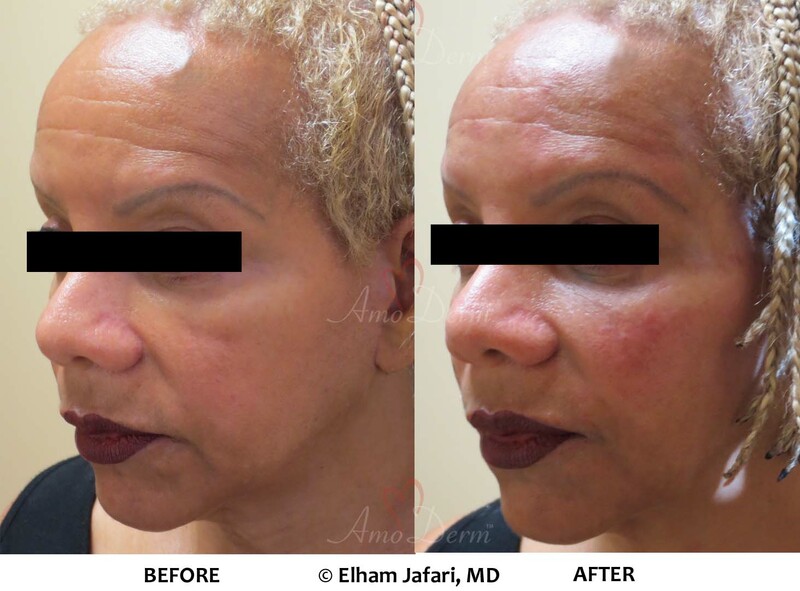 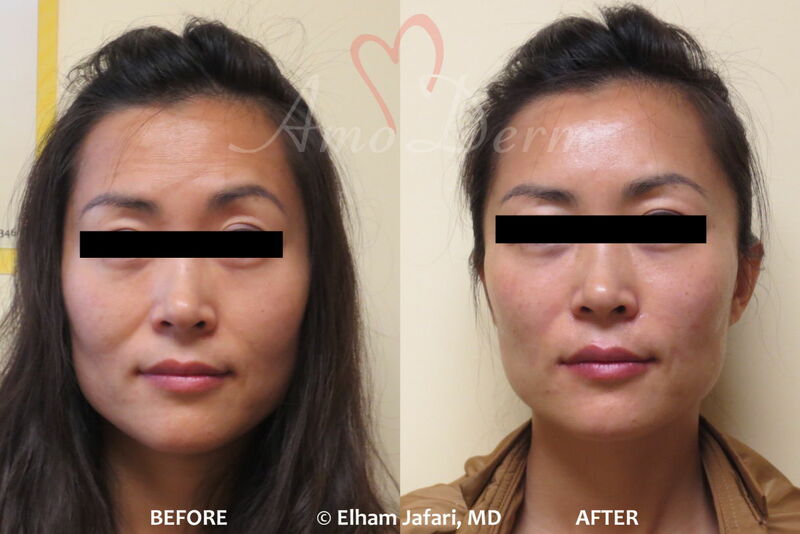 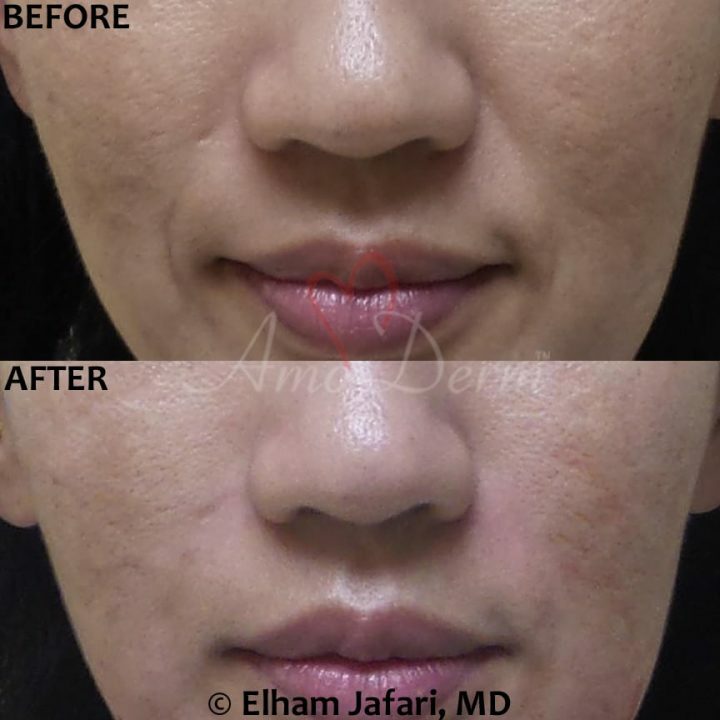 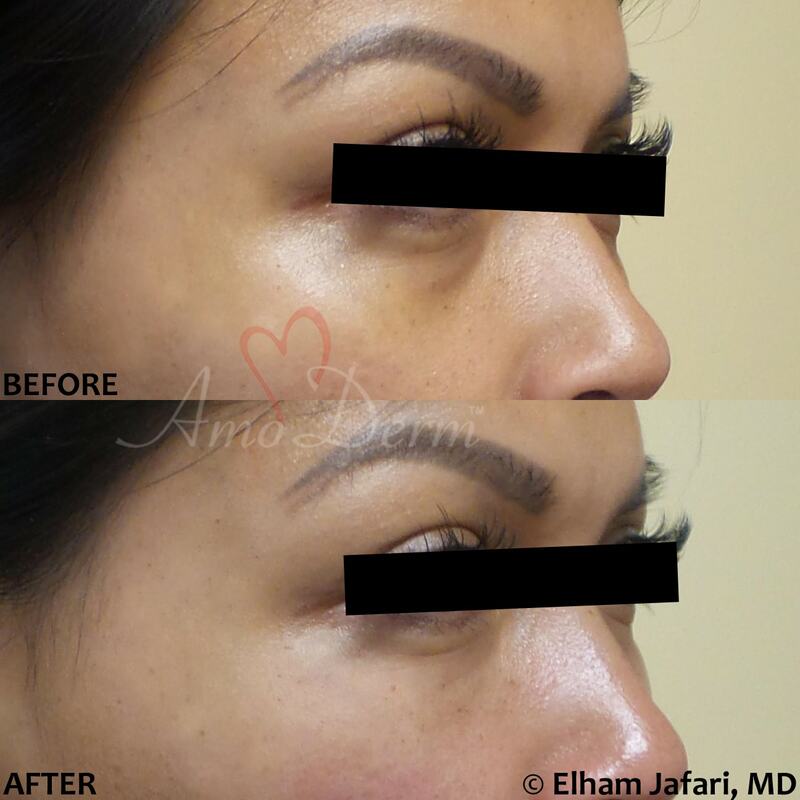 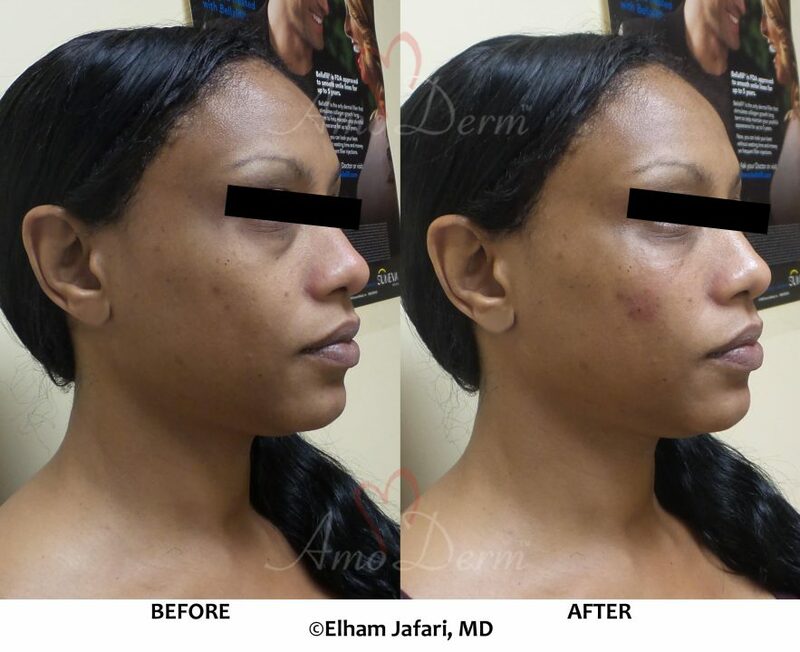 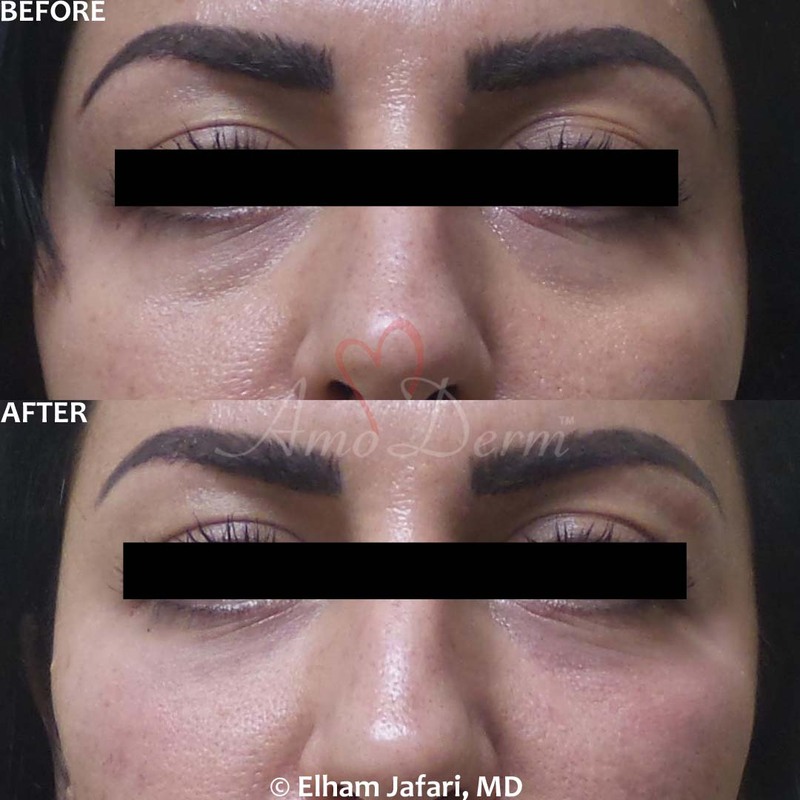 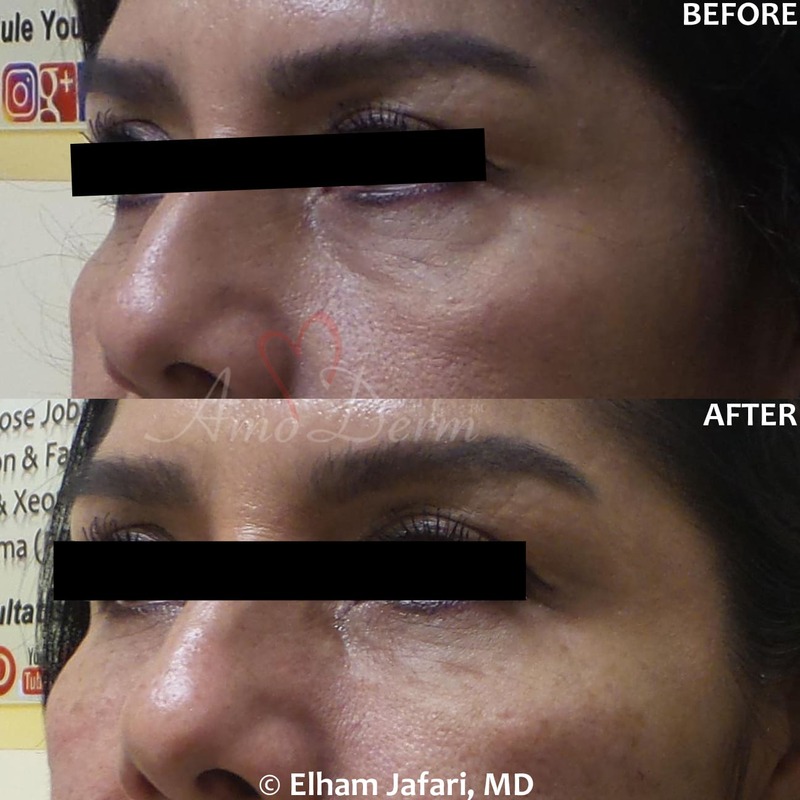 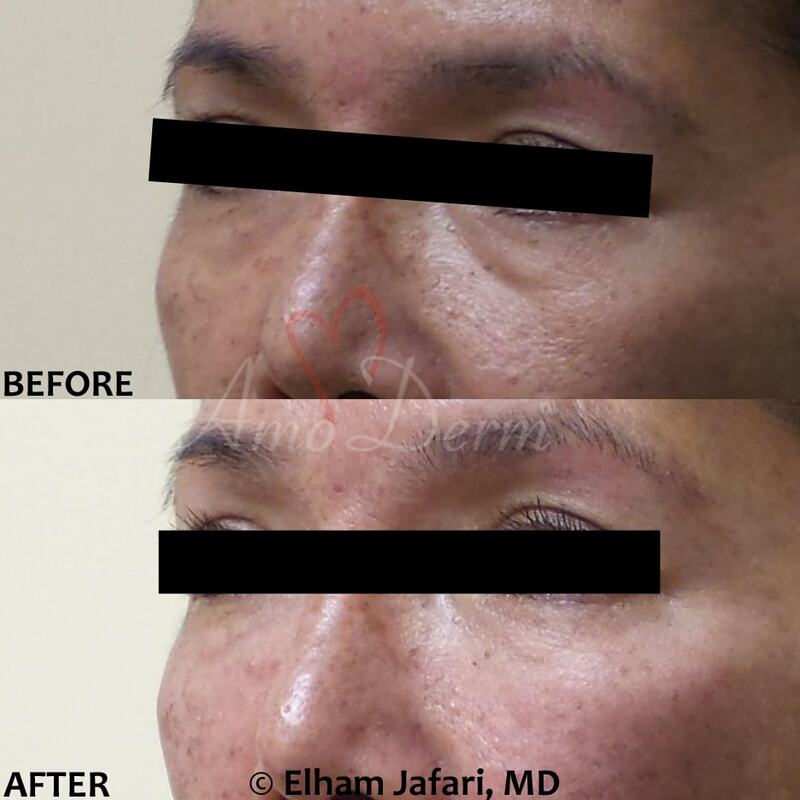 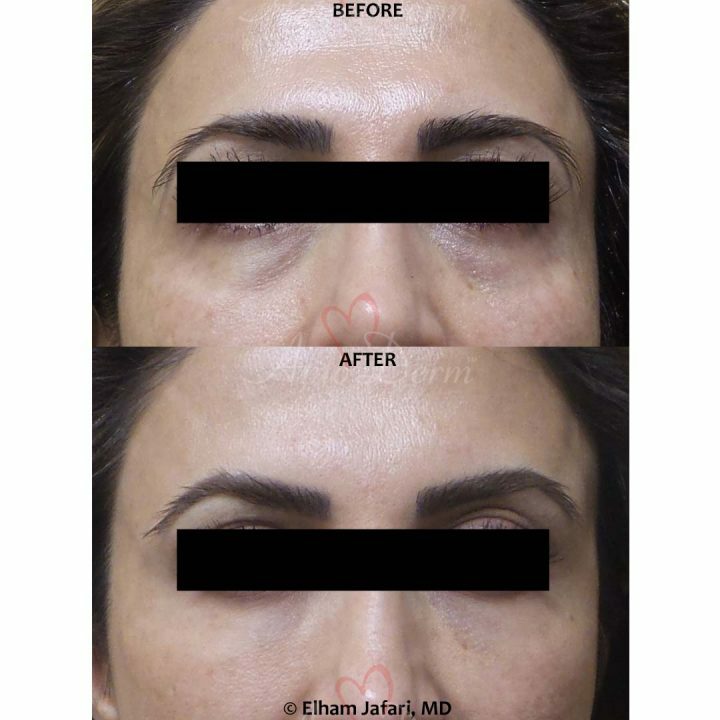 Dr. Jafari at Amoderm is the leading provider of dermal fillers, Botox, Dysport and other cutting-edge non-surgical rejuvenation and anti-aging treatments including liquid facelift in Orange County. 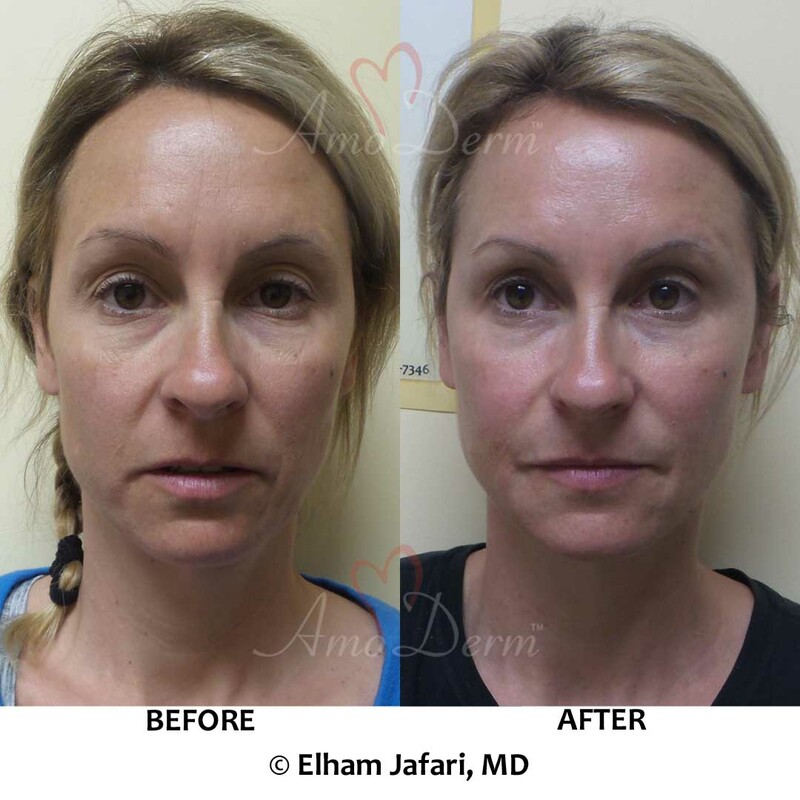 Contact our office today to schedule your consultation and explore your options to achieve natural-looking whole-face and body rejuvenation.